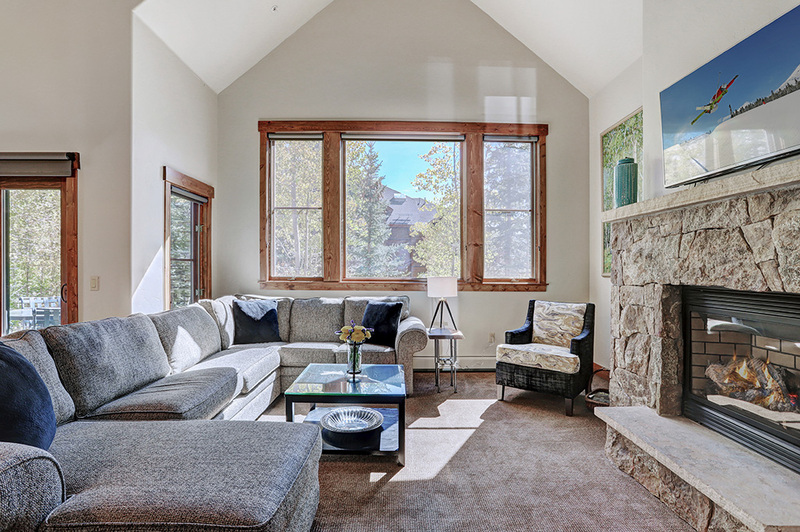 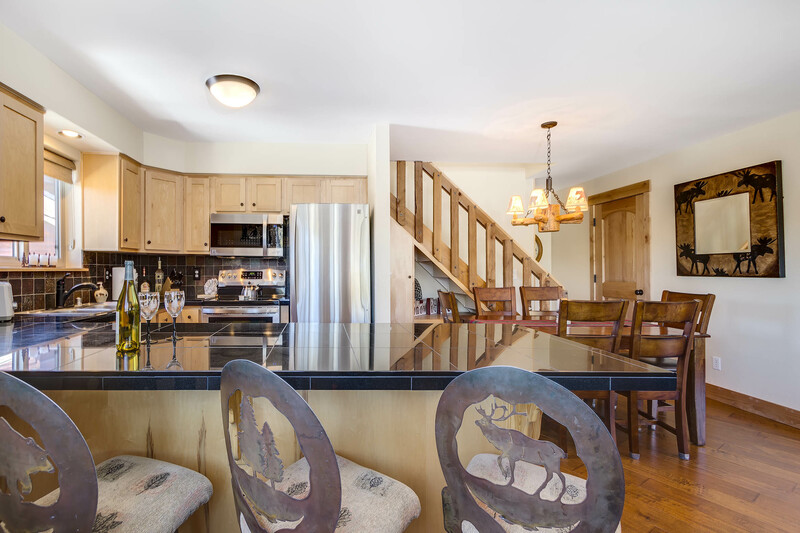 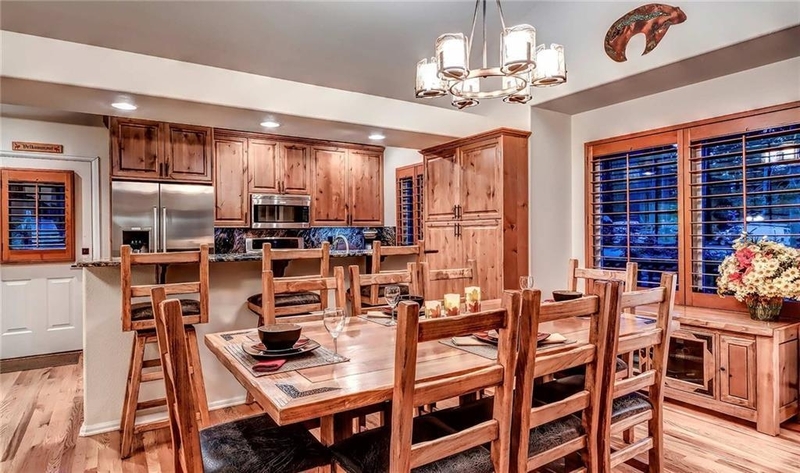 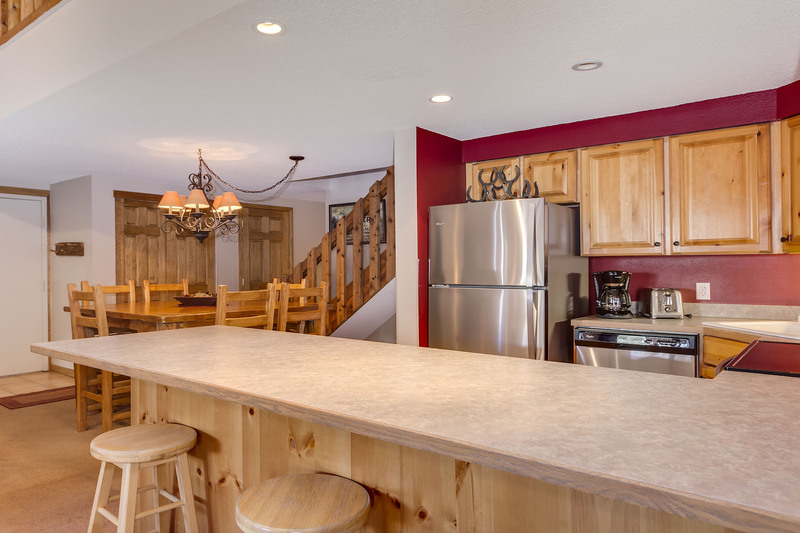 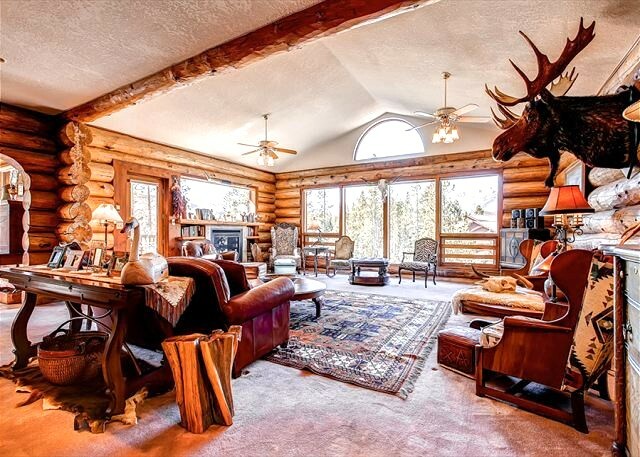 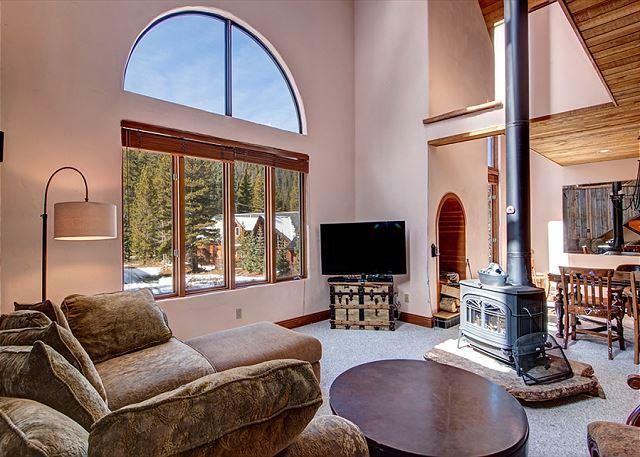 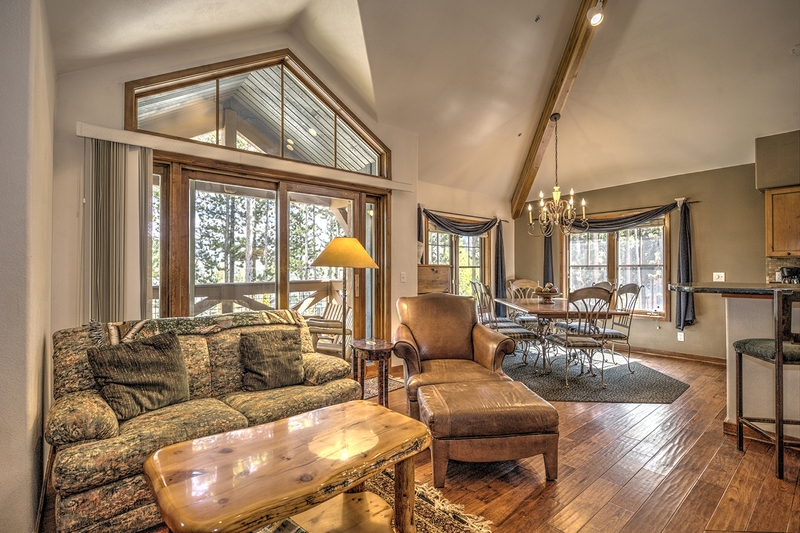 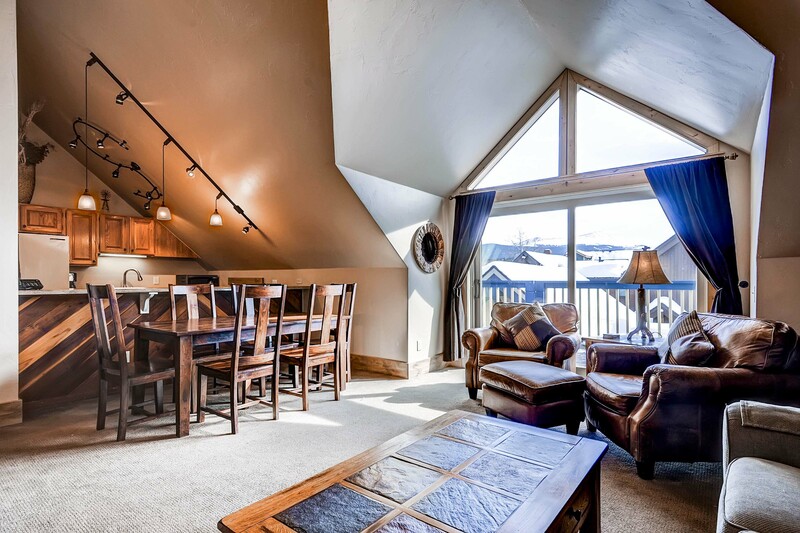 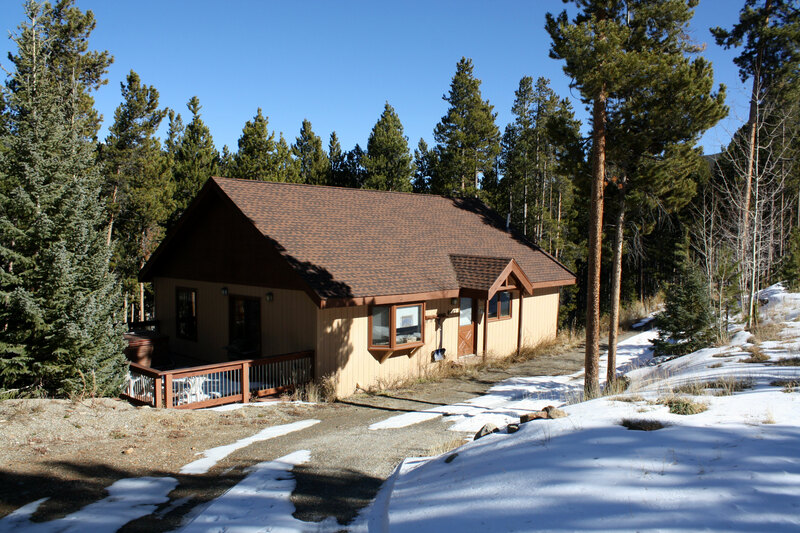 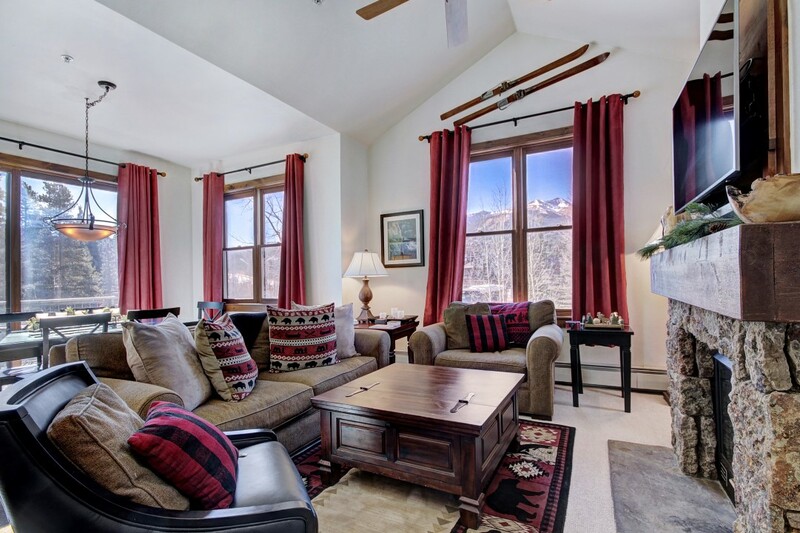 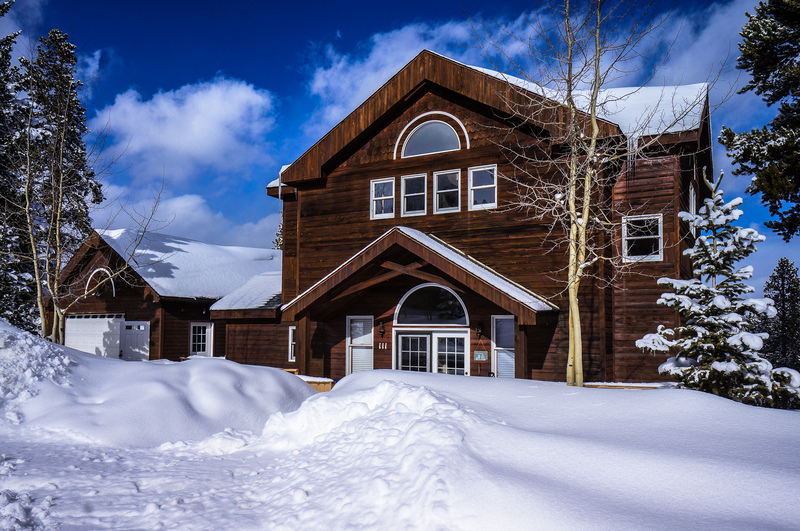 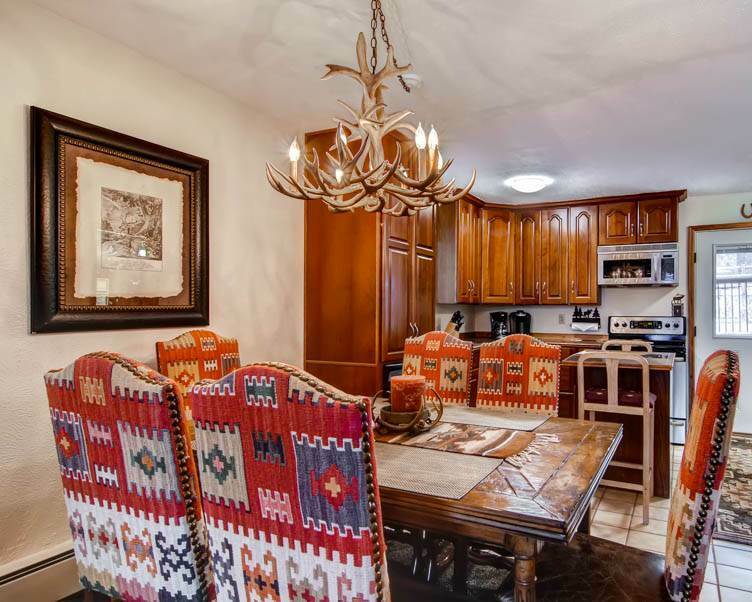 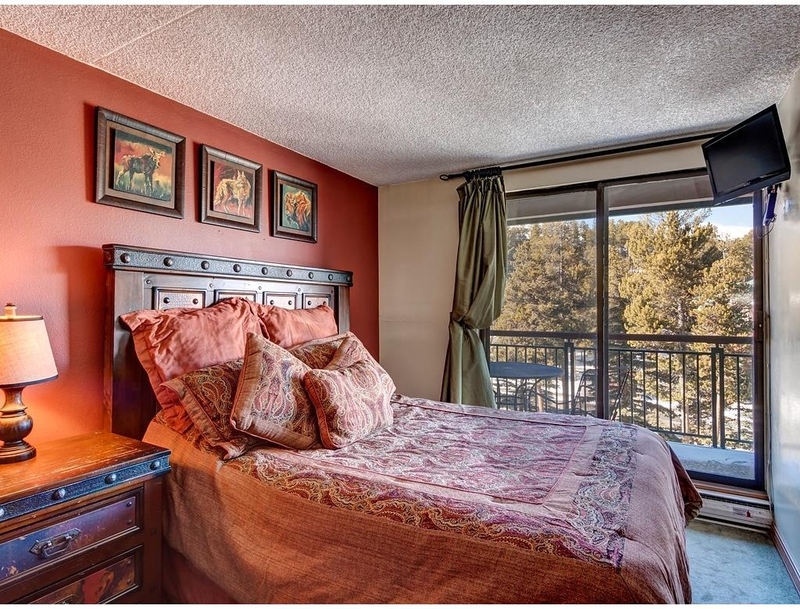 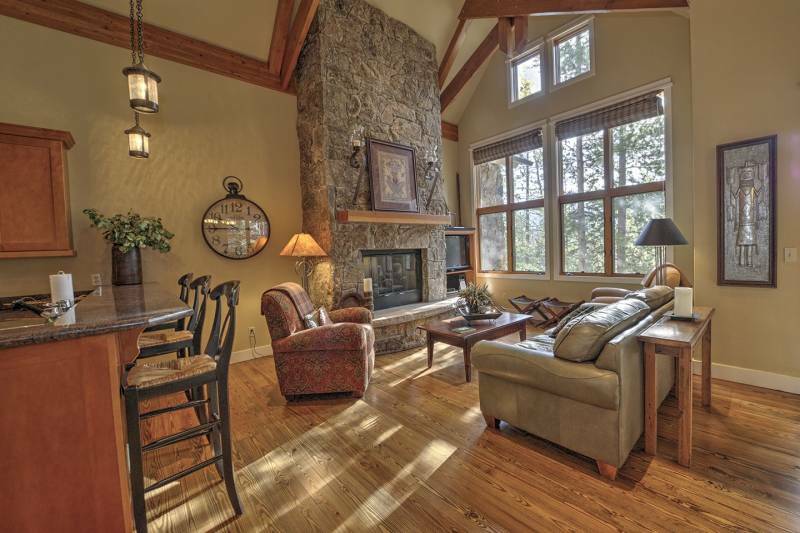 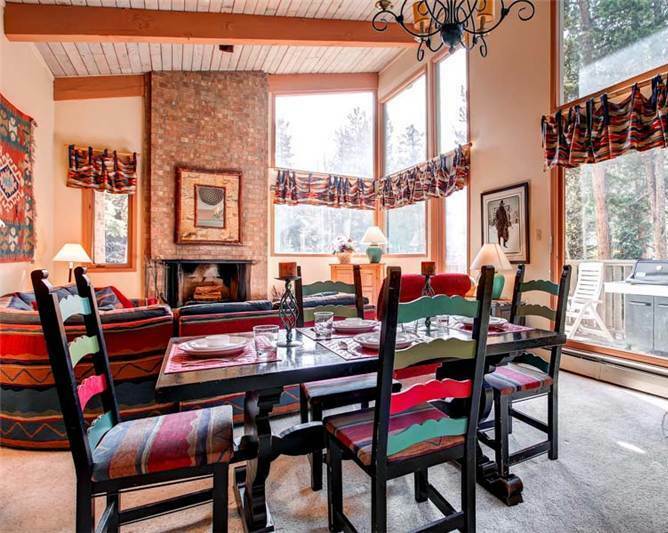 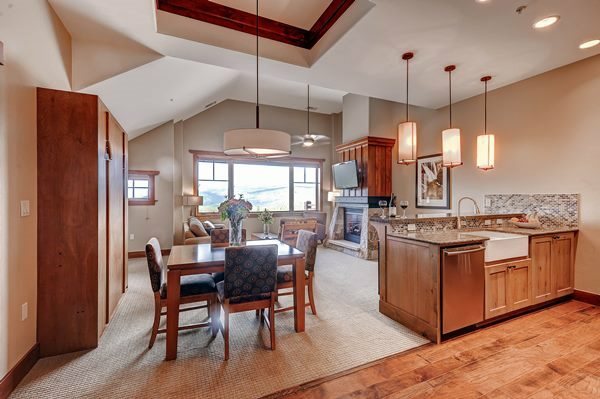 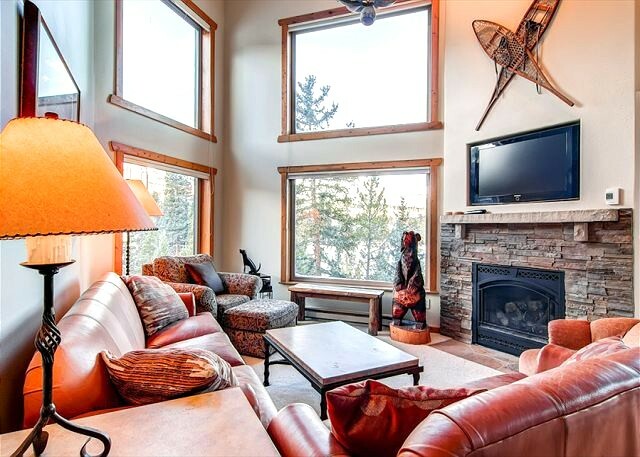 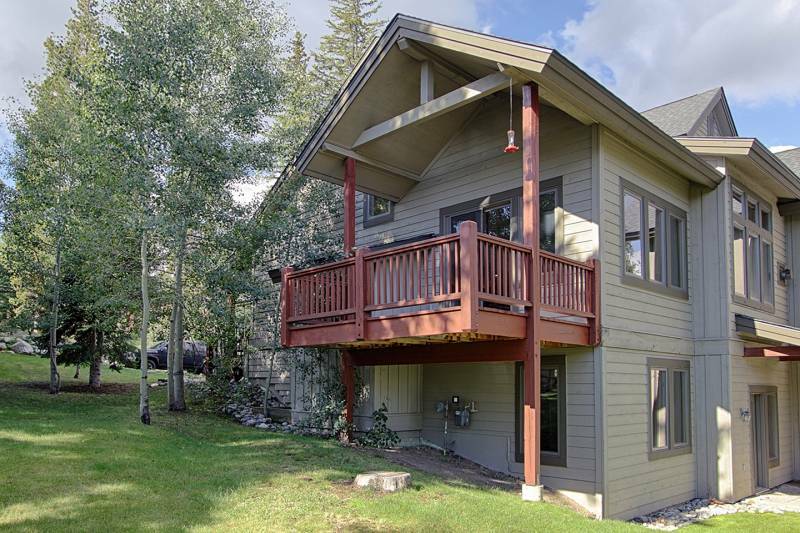 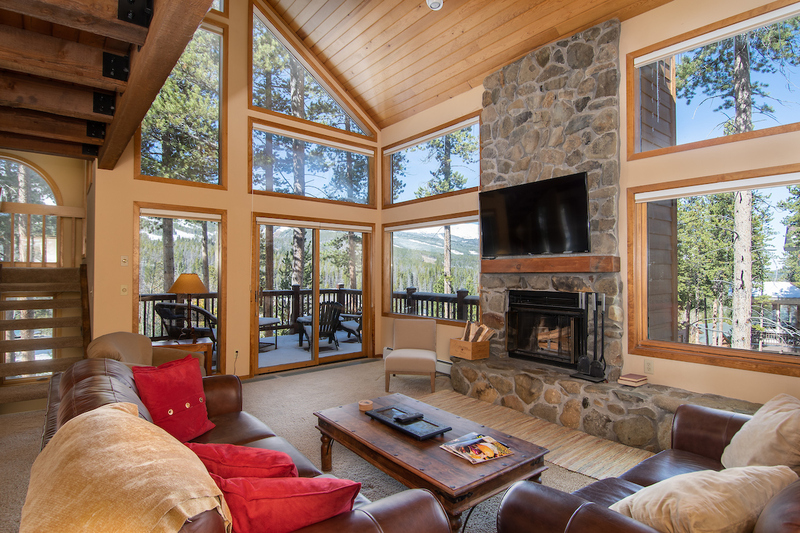 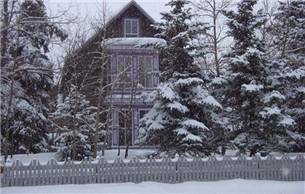 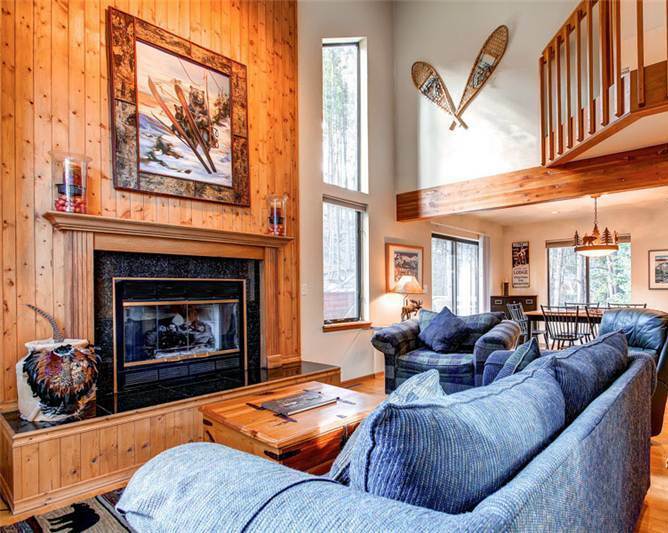 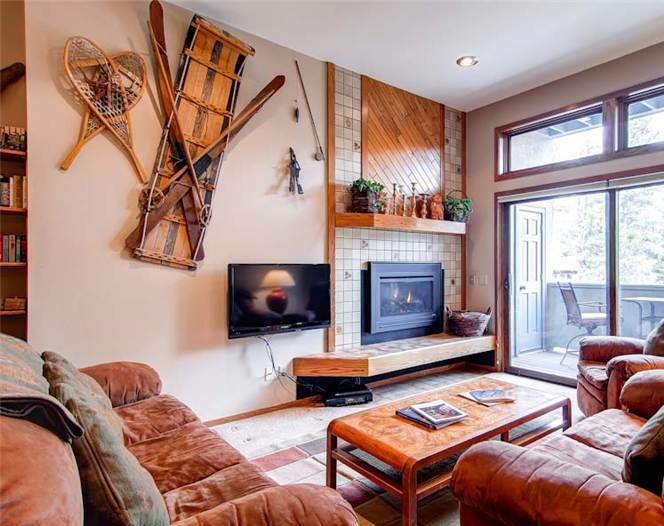 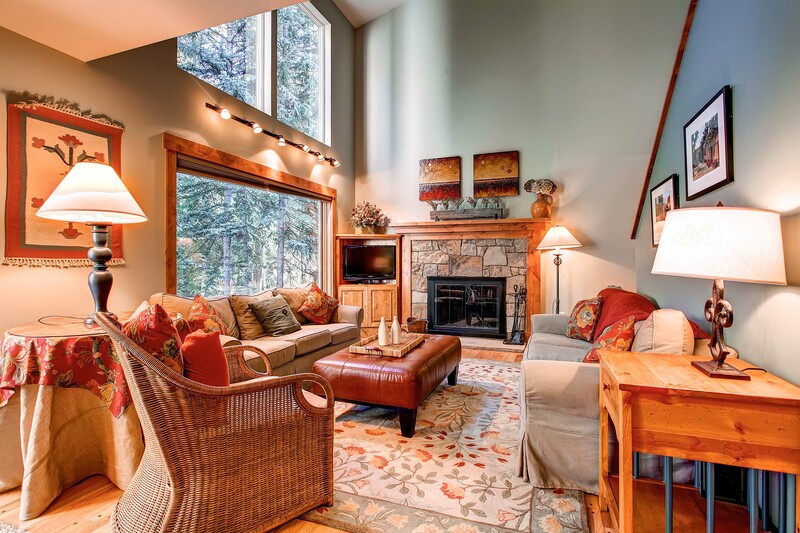 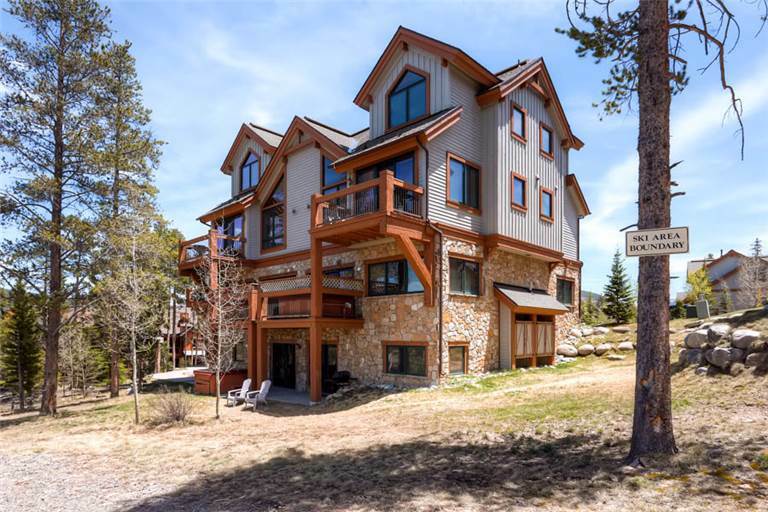 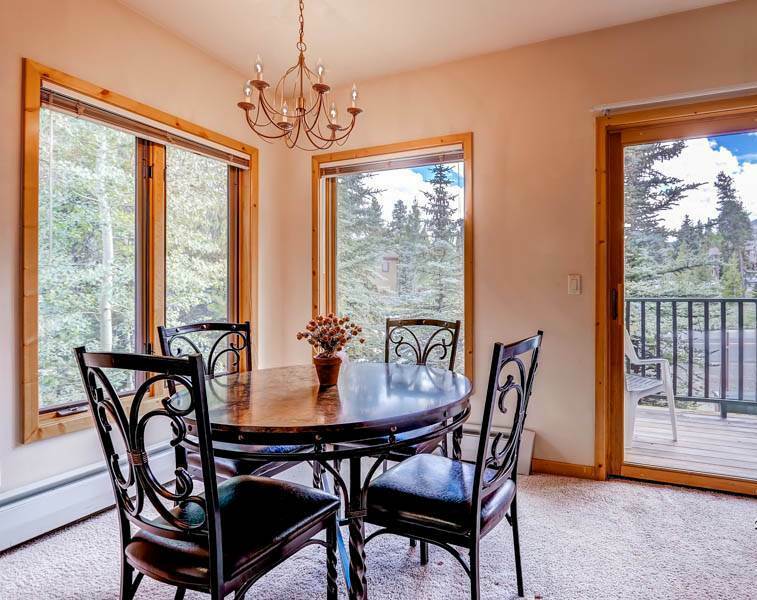 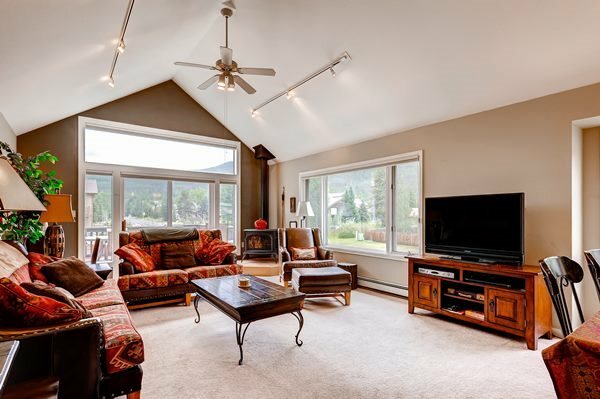 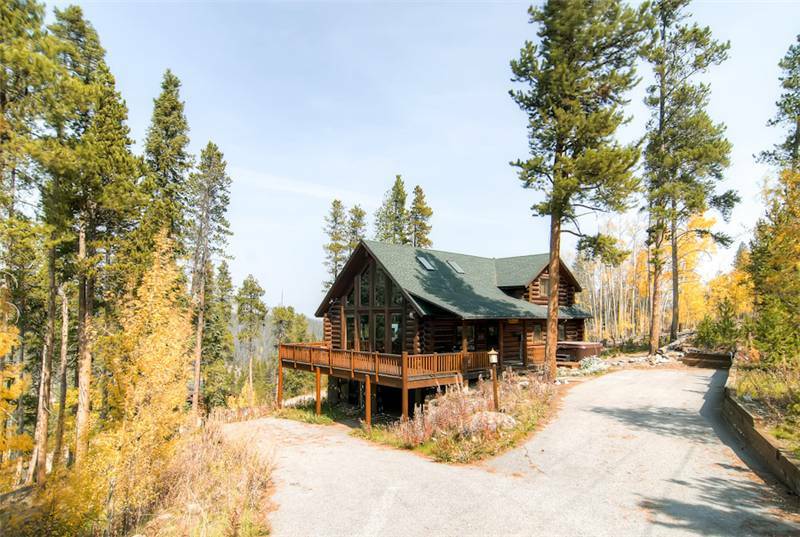 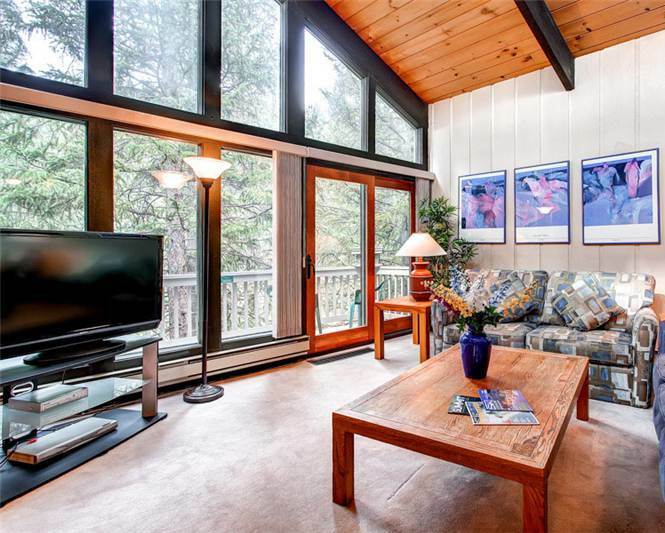 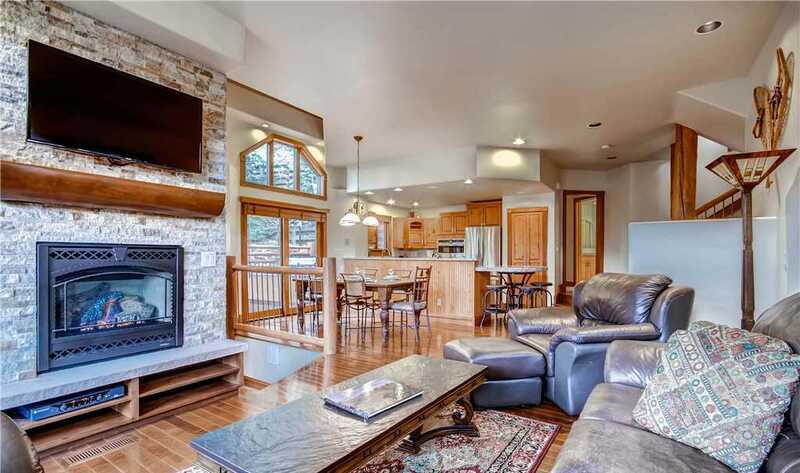 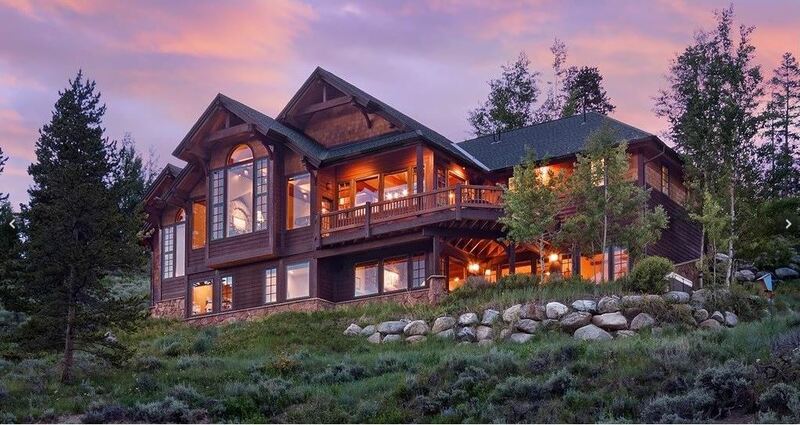 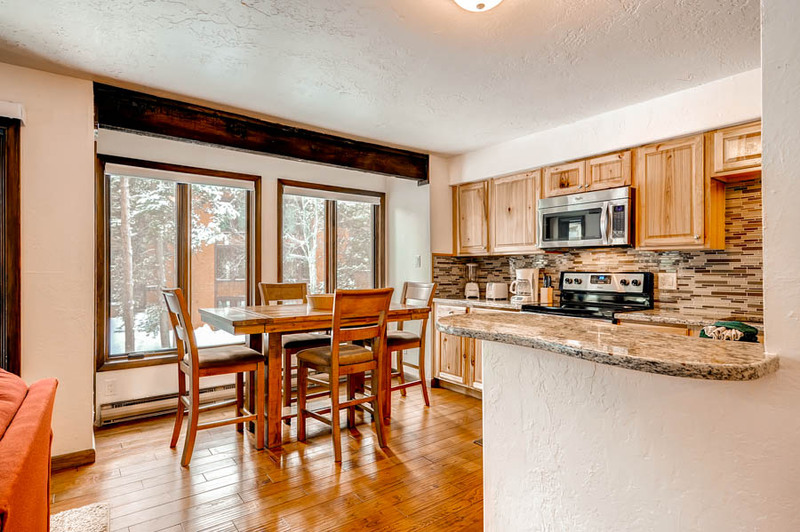 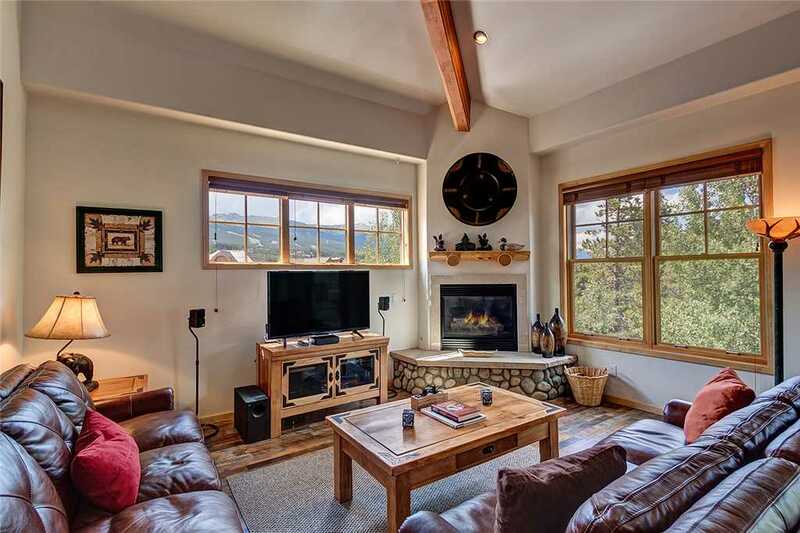 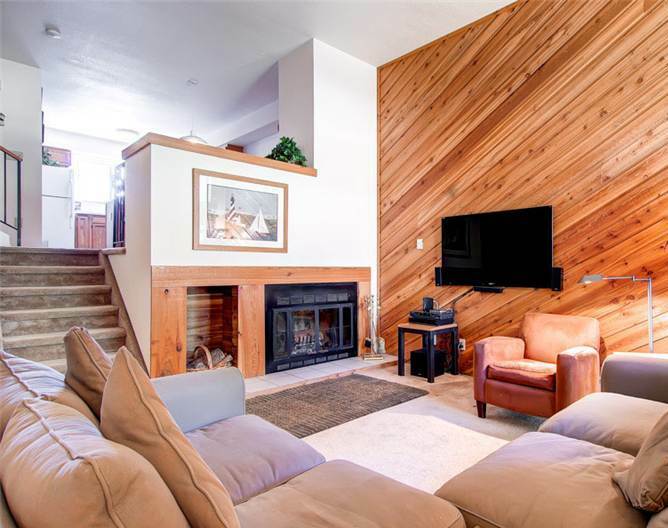 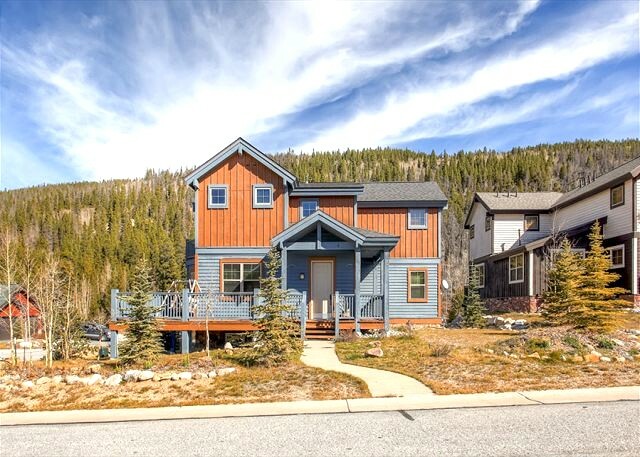 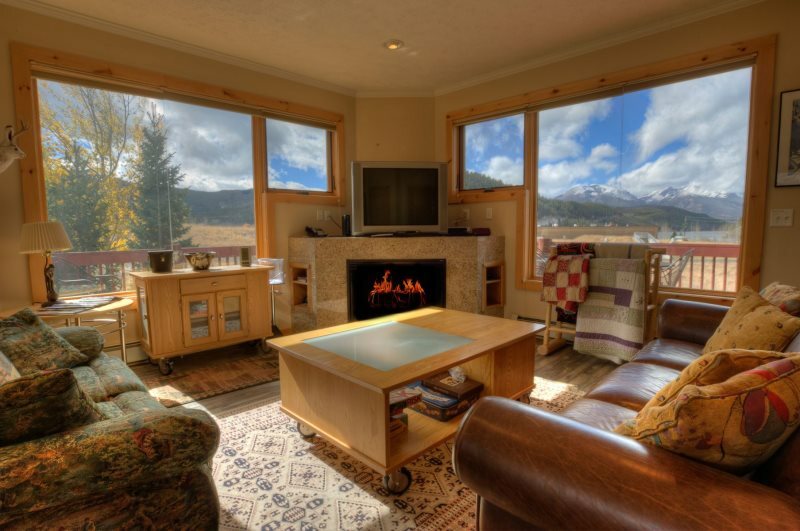 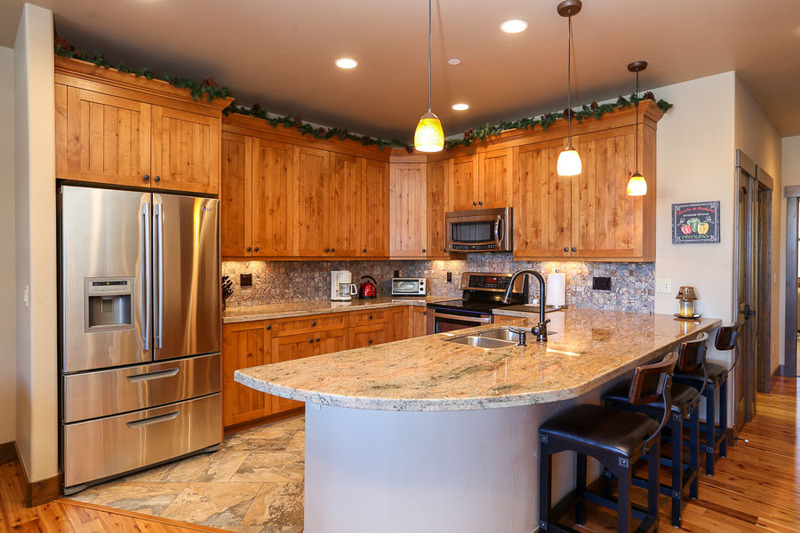 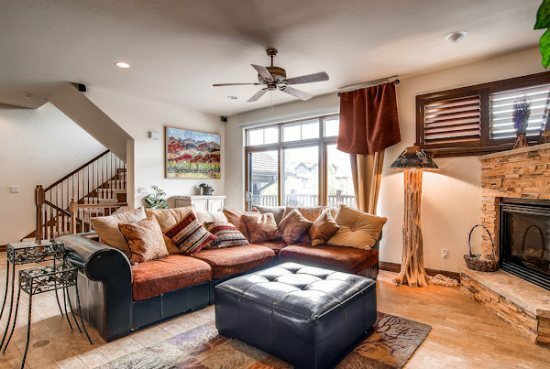 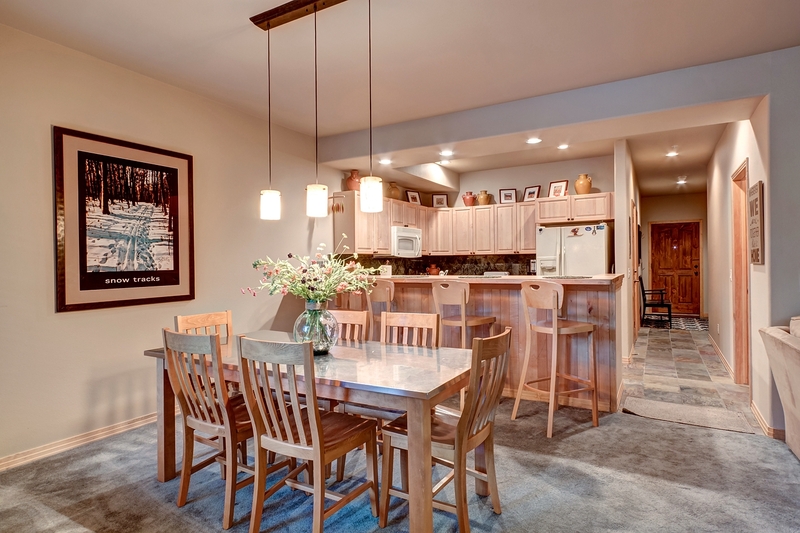 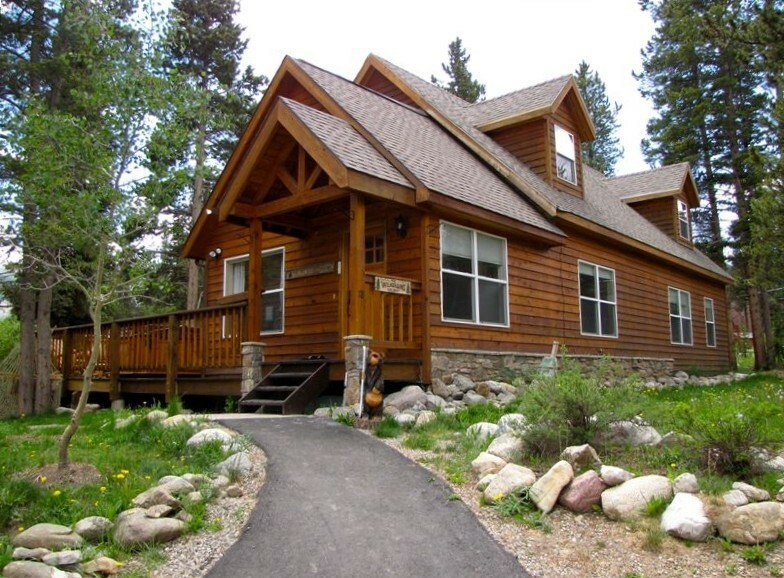 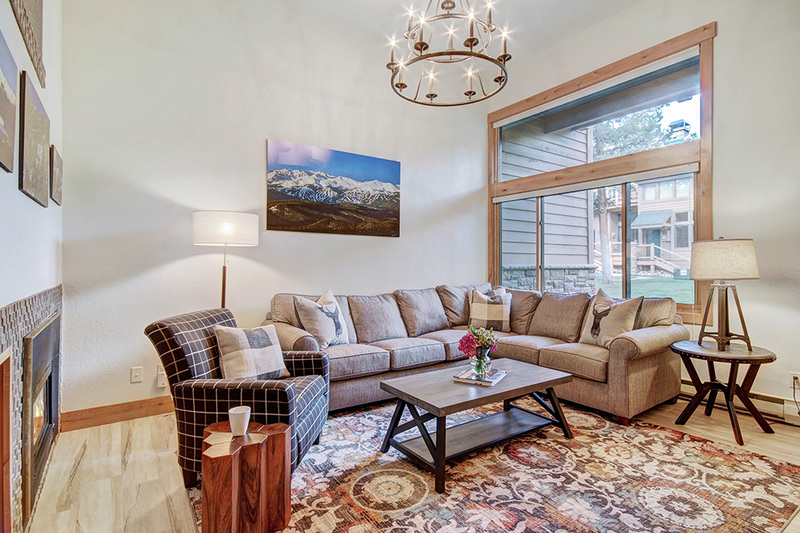 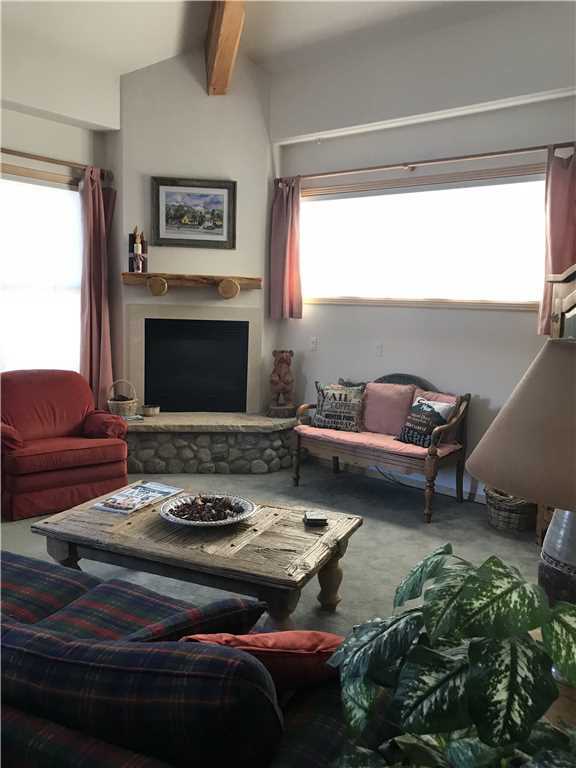 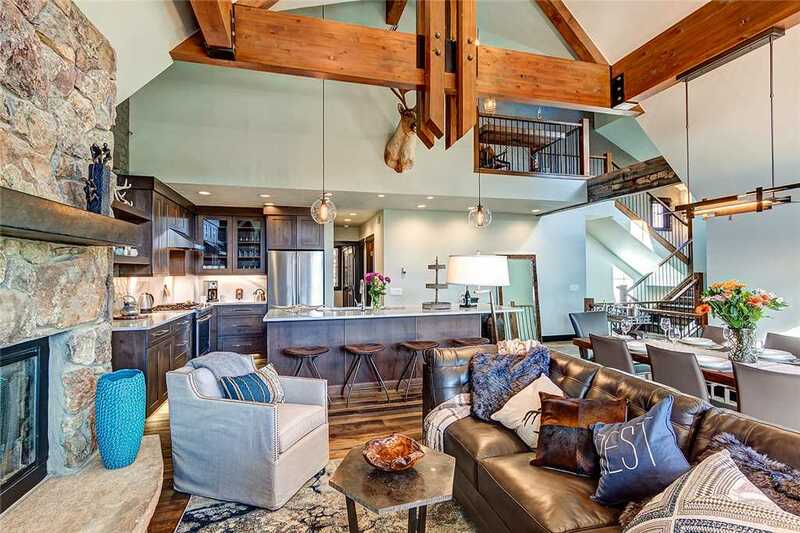 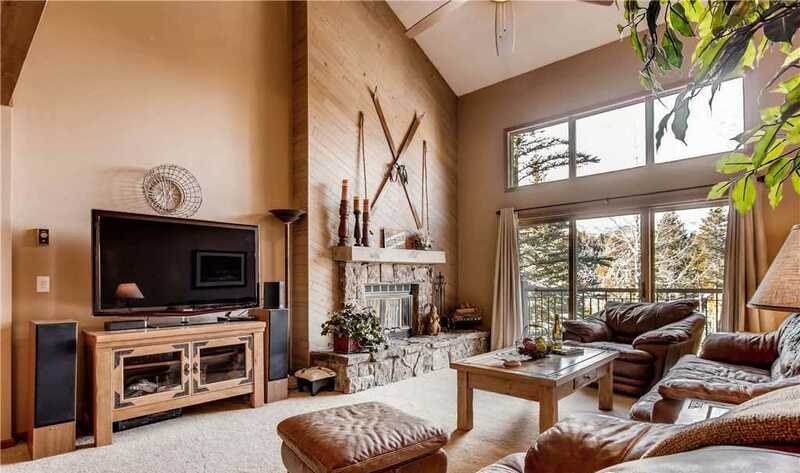 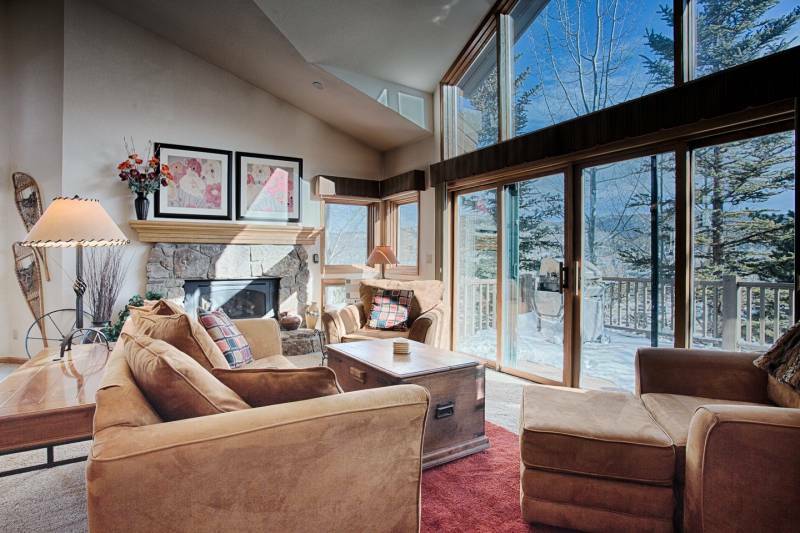 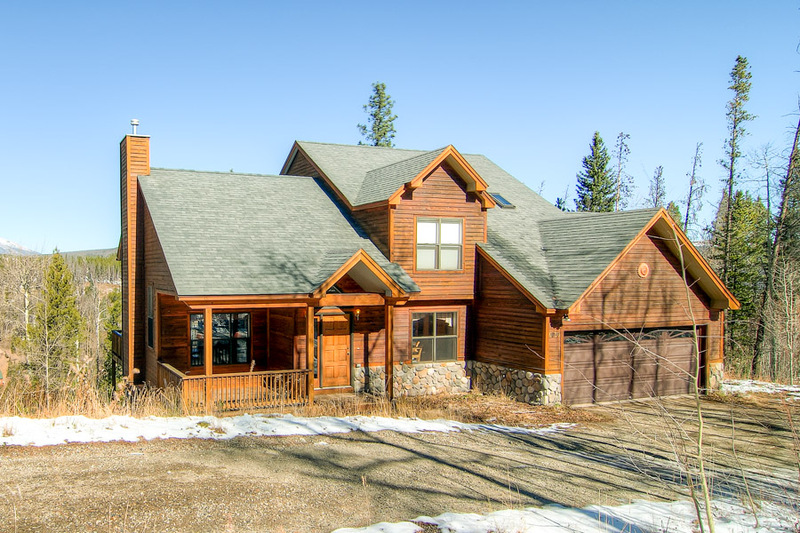 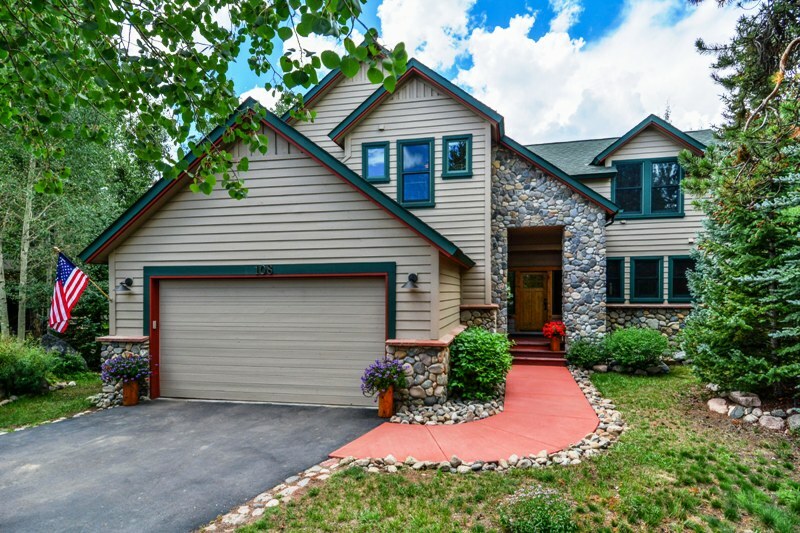 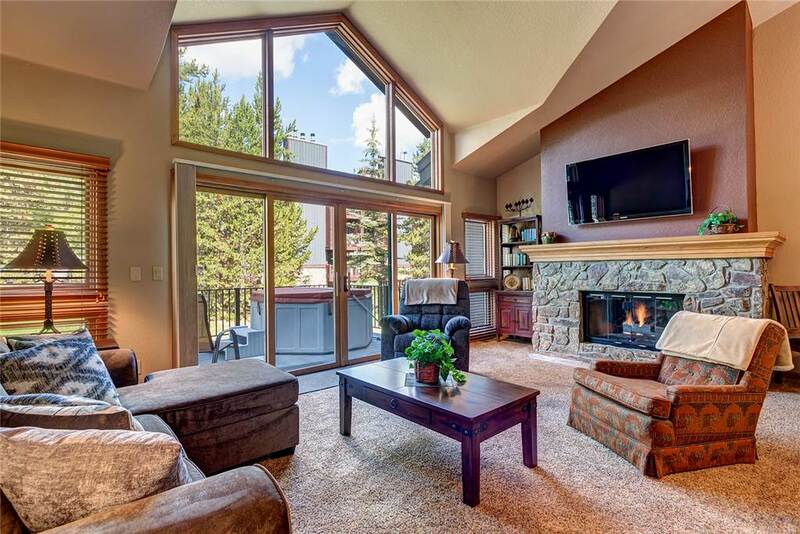 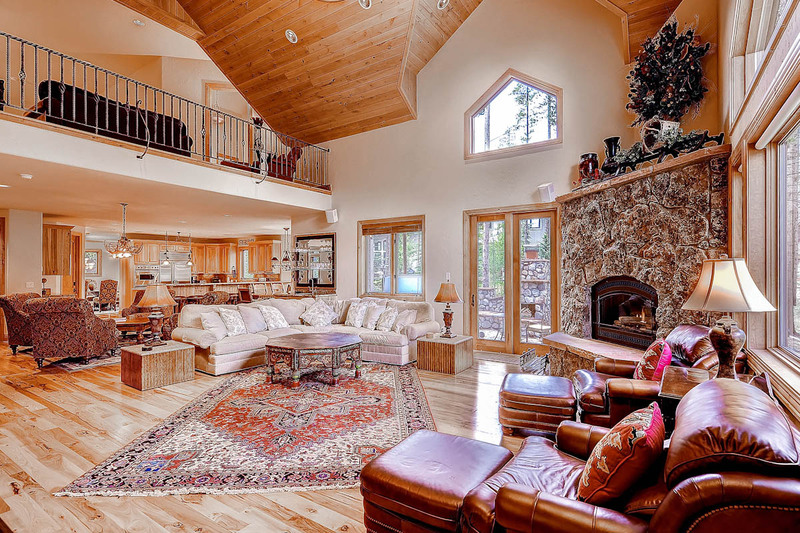 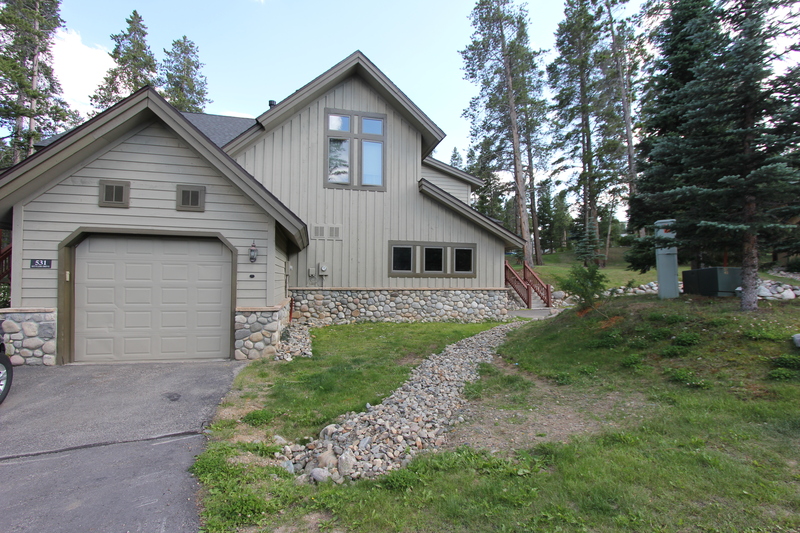 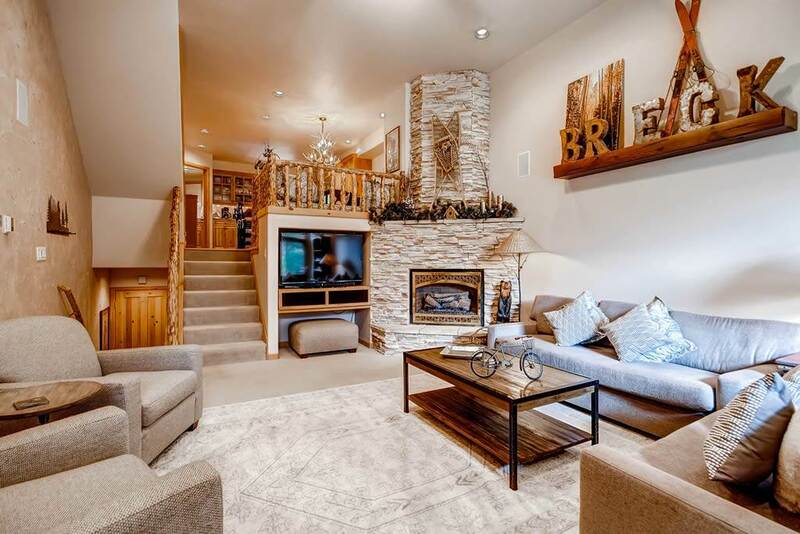 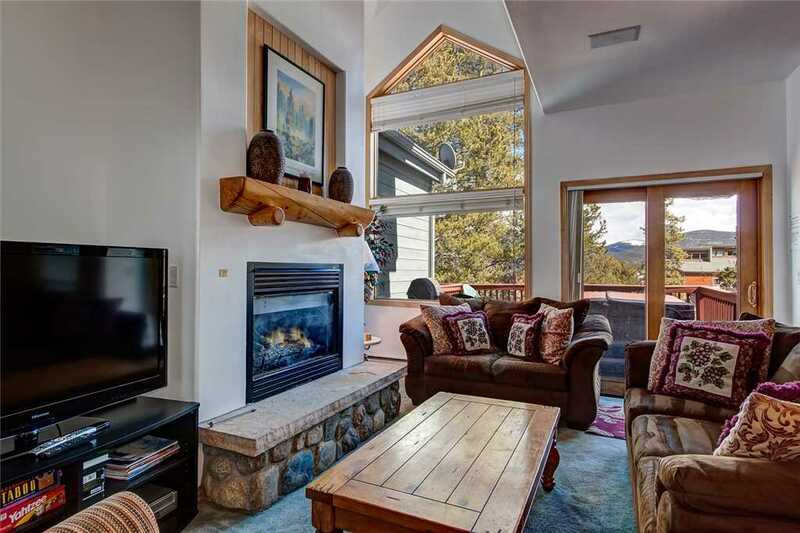 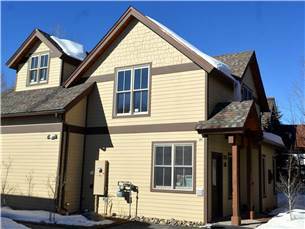 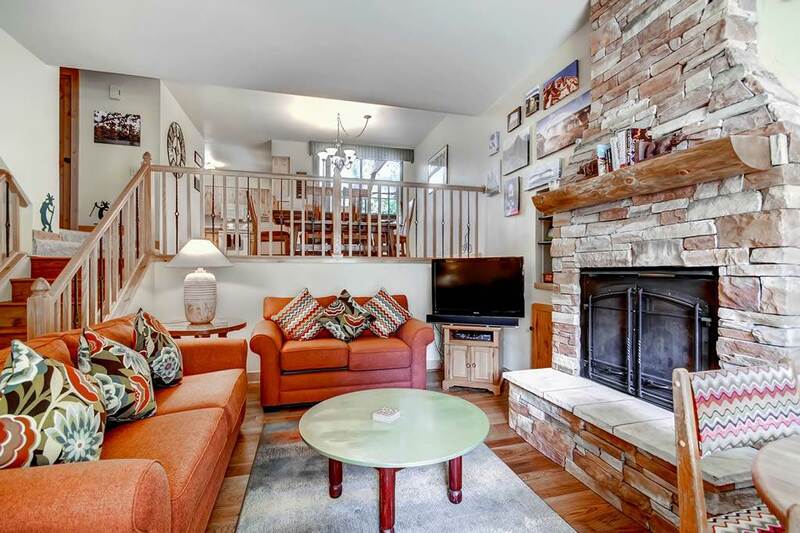 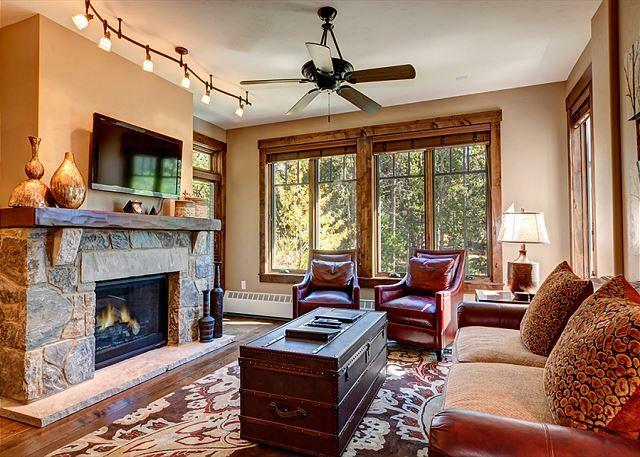 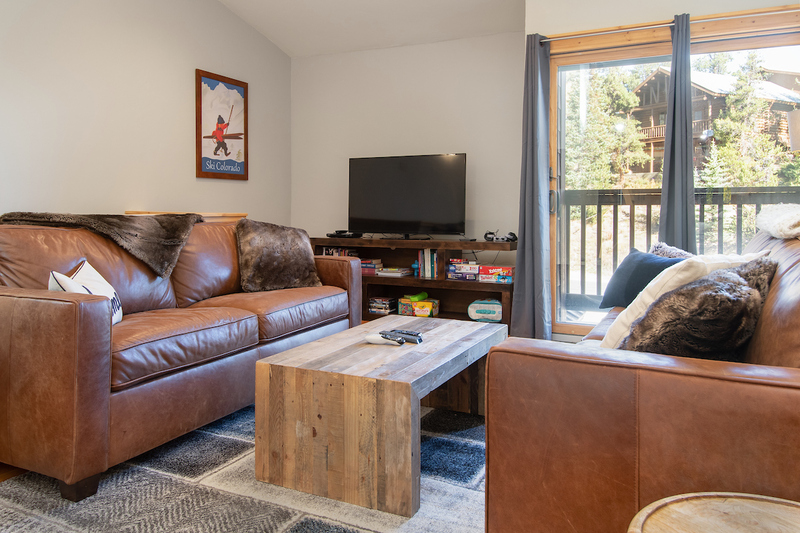 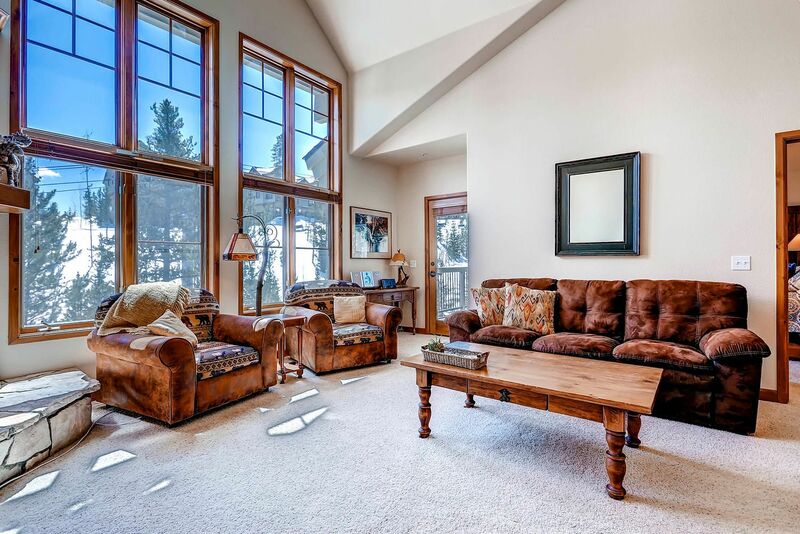 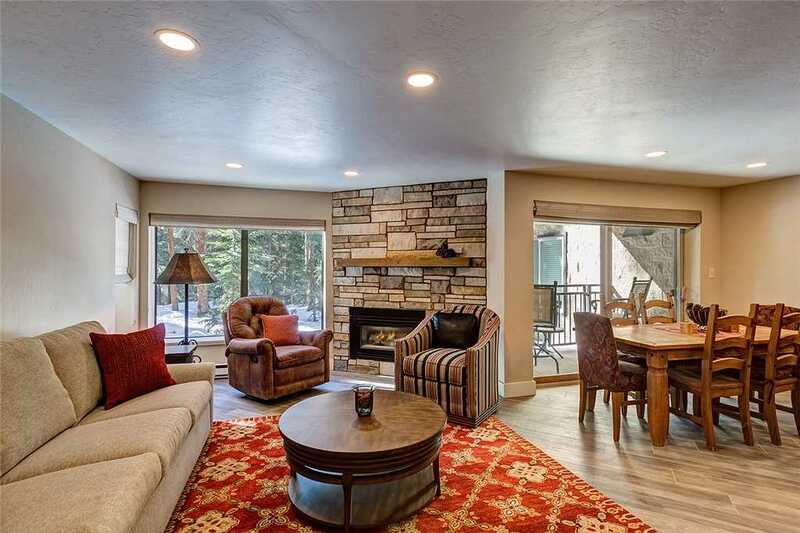 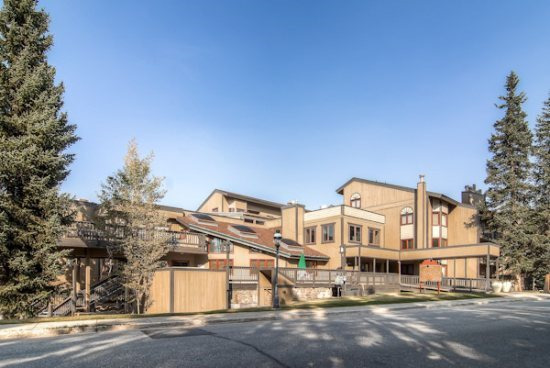 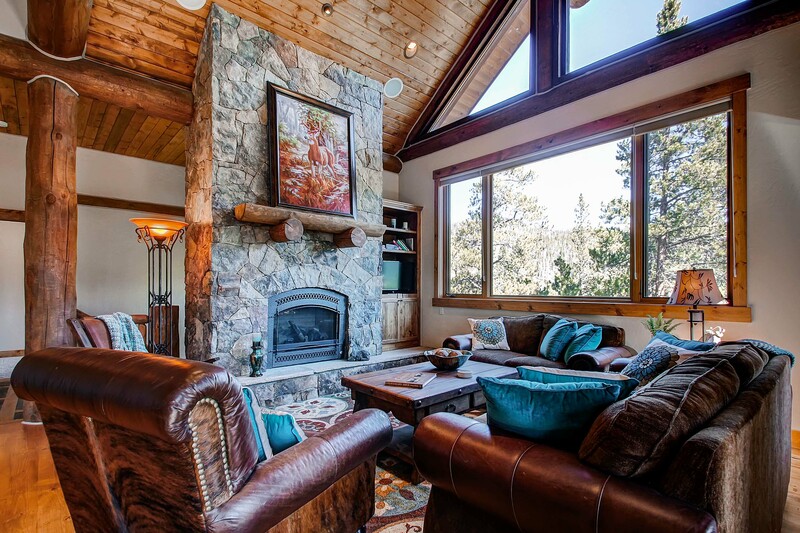 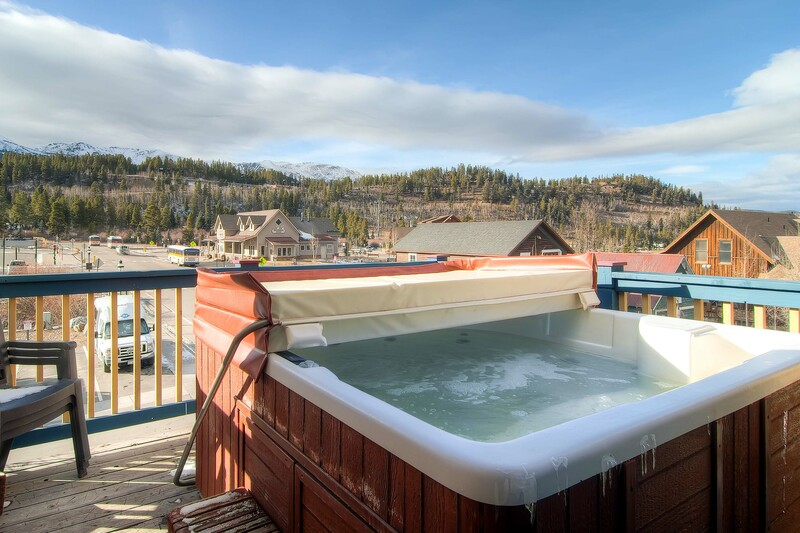 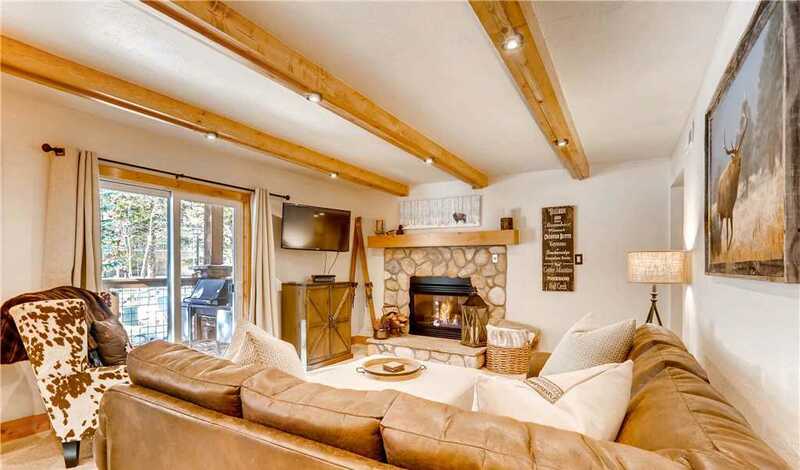 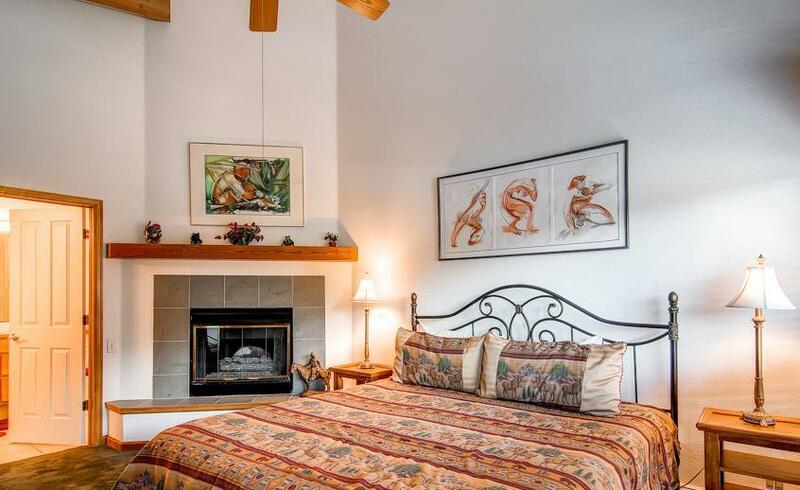 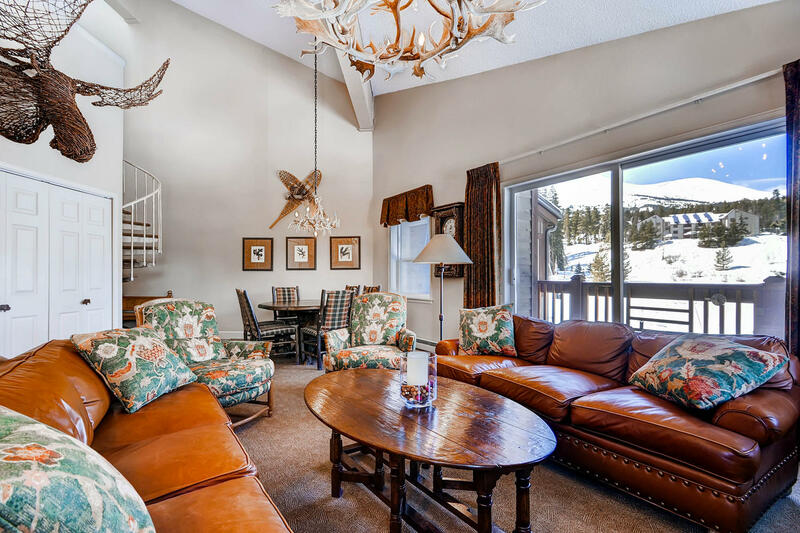 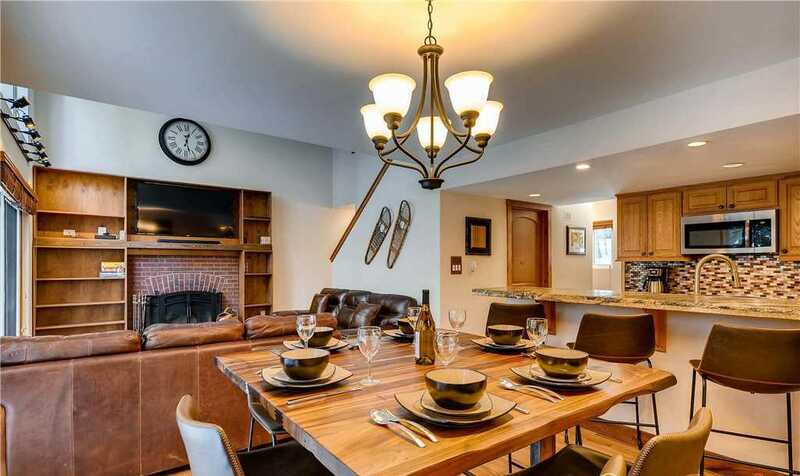 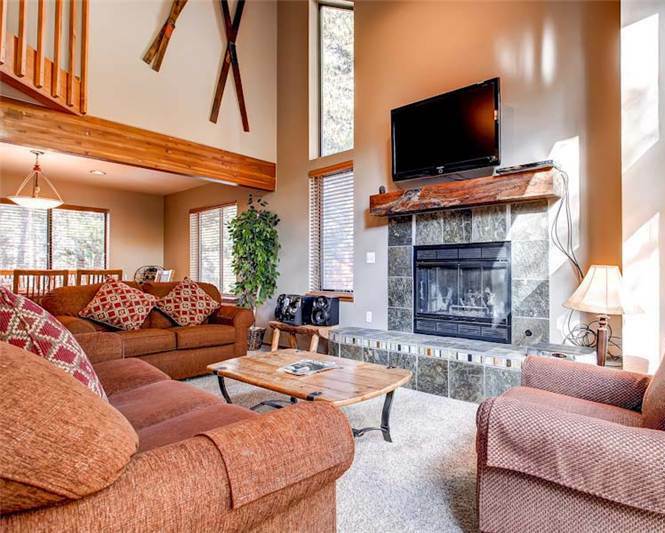 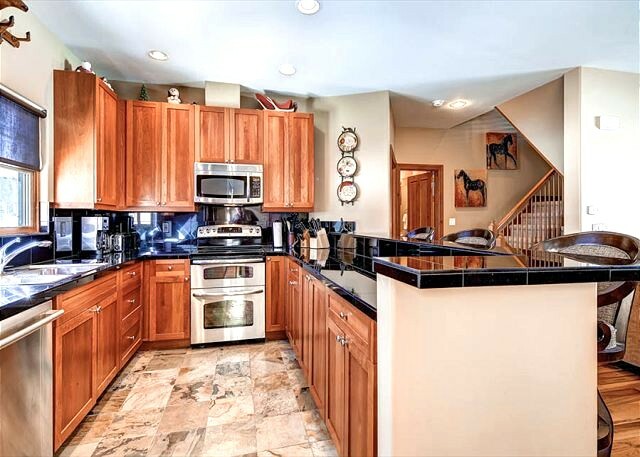 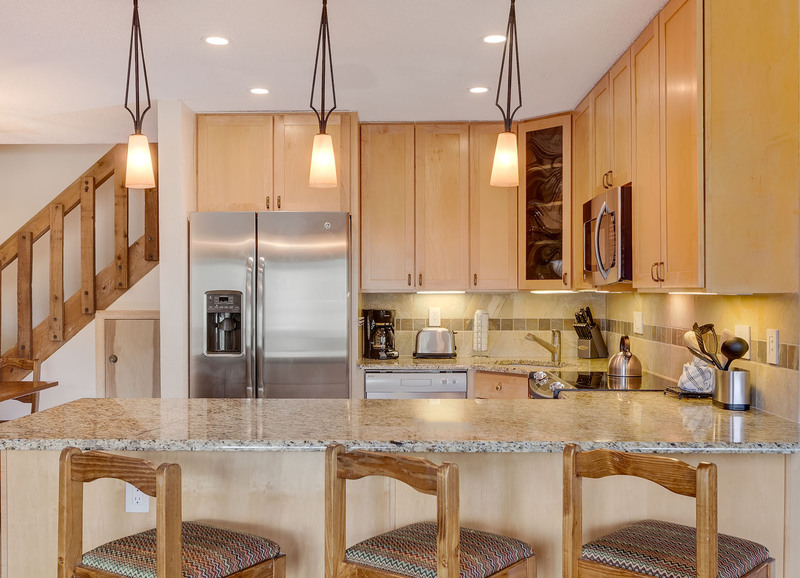 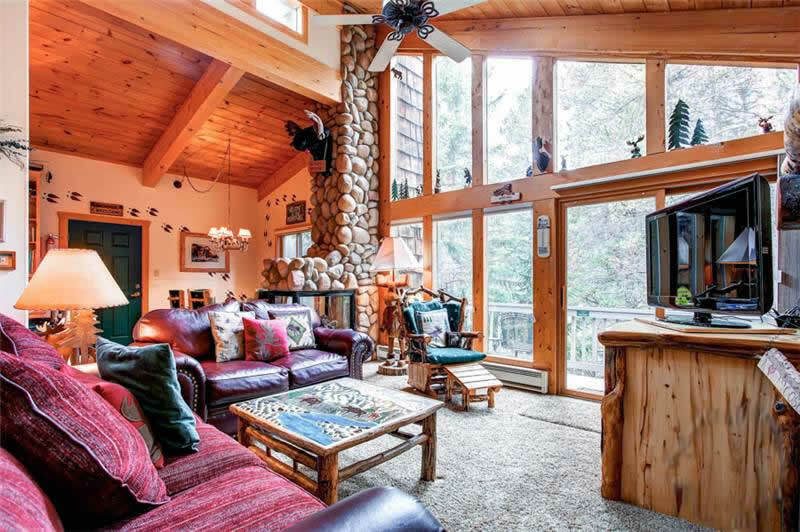 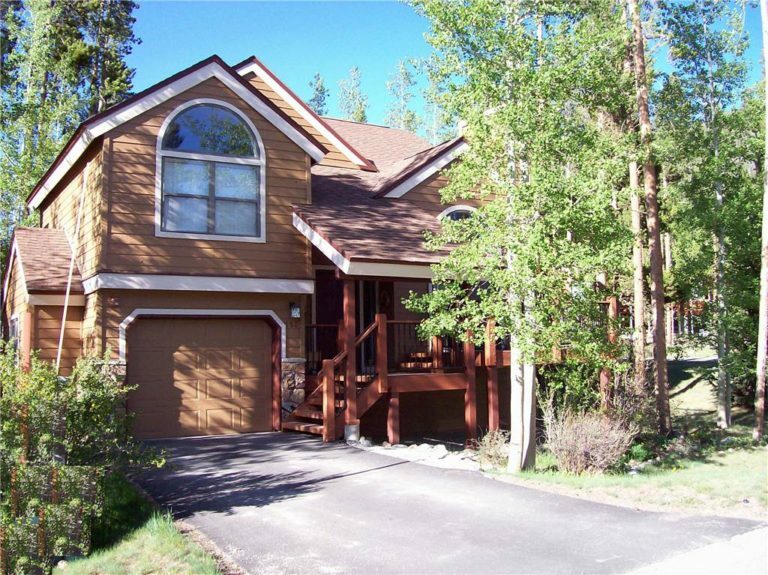 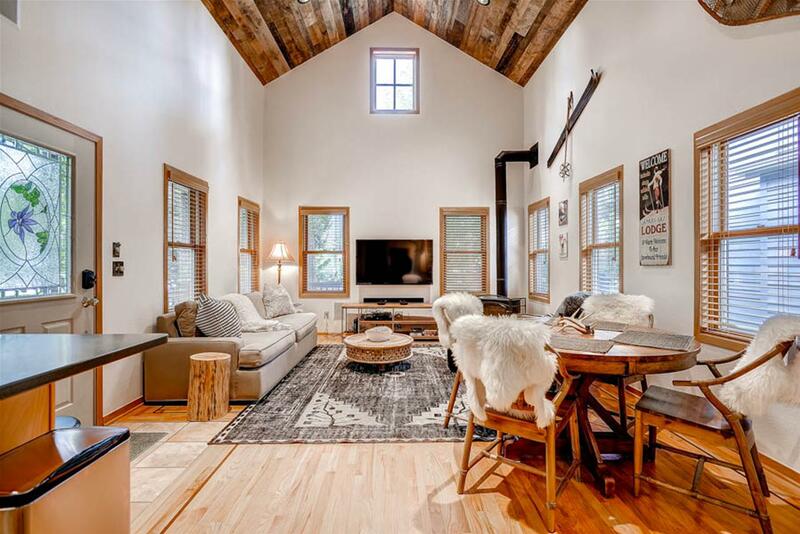 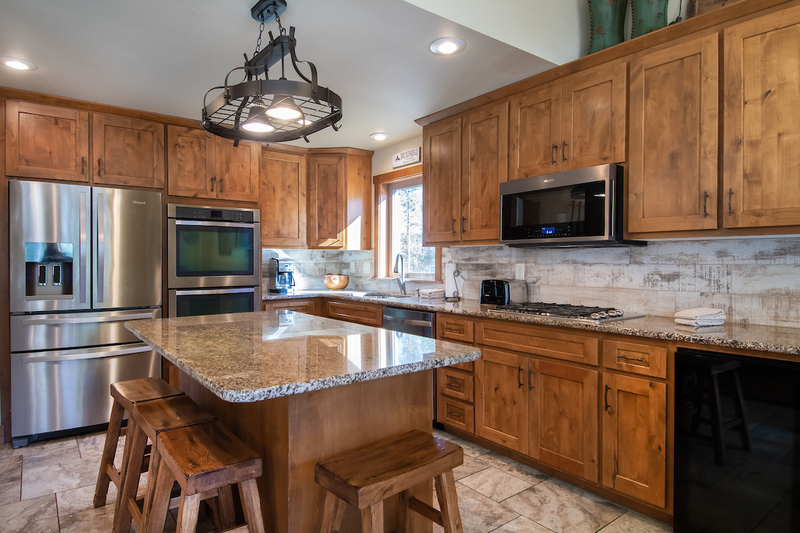 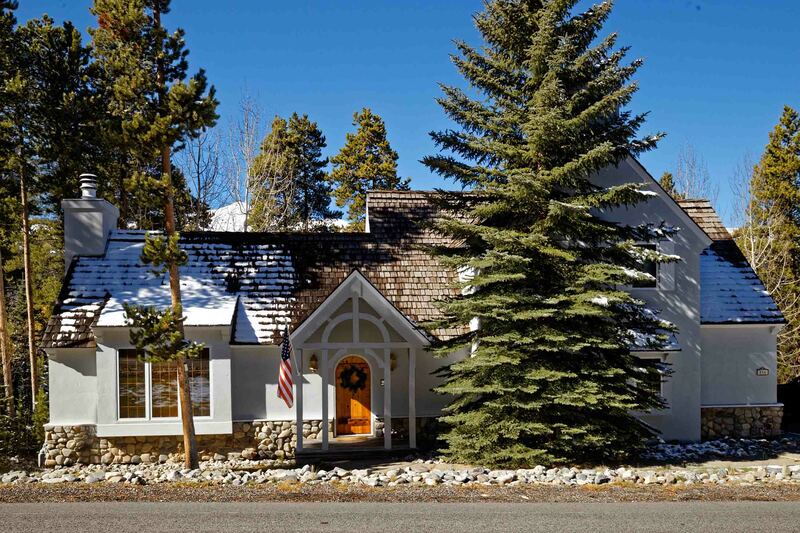 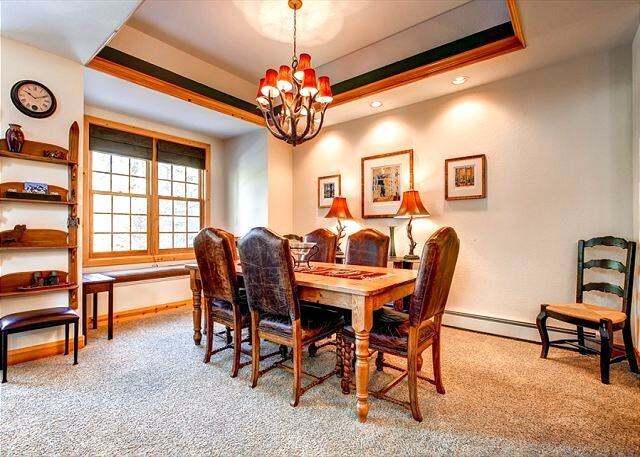 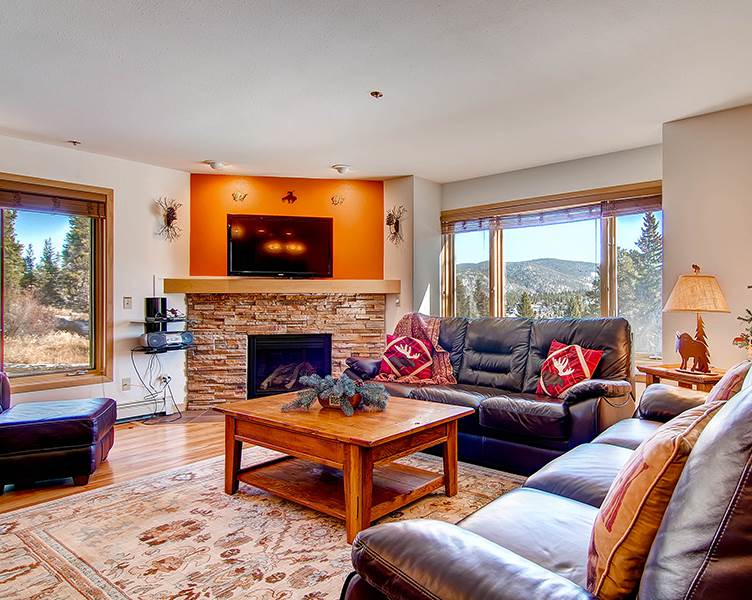 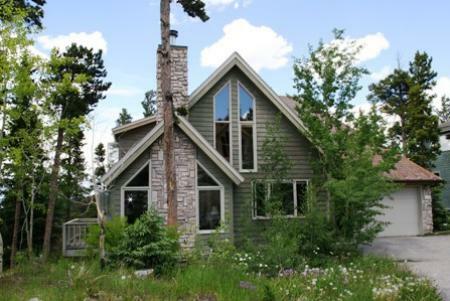 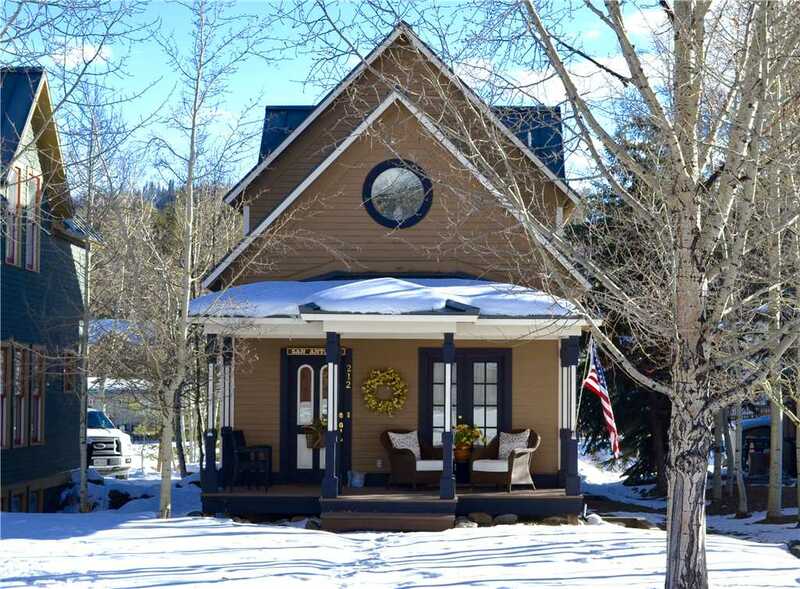 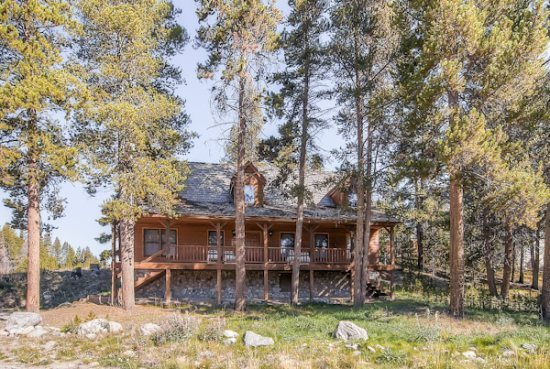 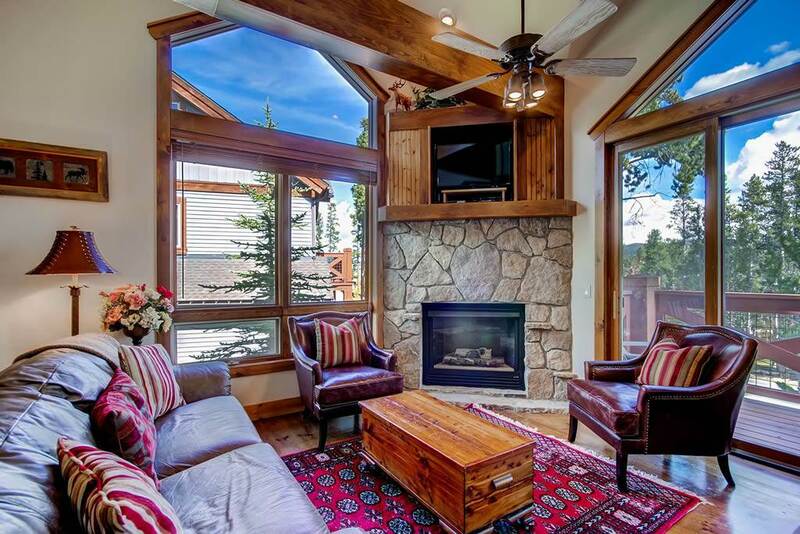 This beautiful home is tucked away in the Blue River Valley, just a couple of miles away from the congestion of downtown Breckenridge but just minutes from the ski slopes, restaurants and other attractions. 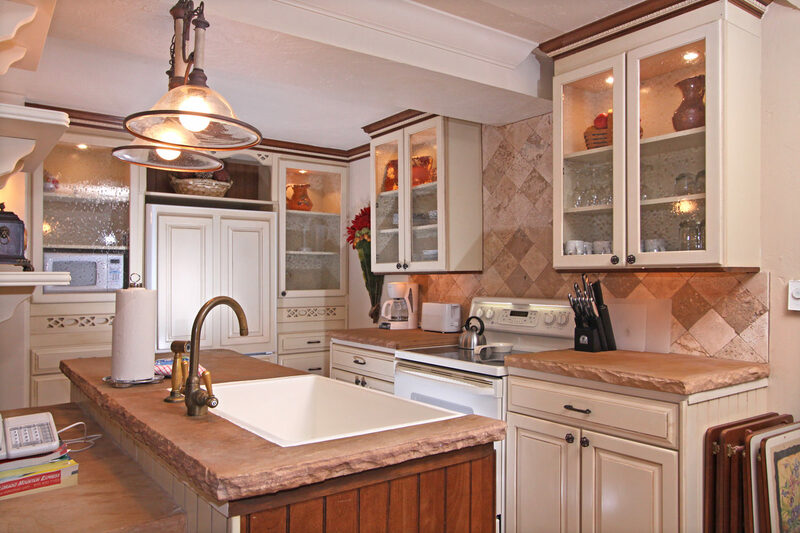 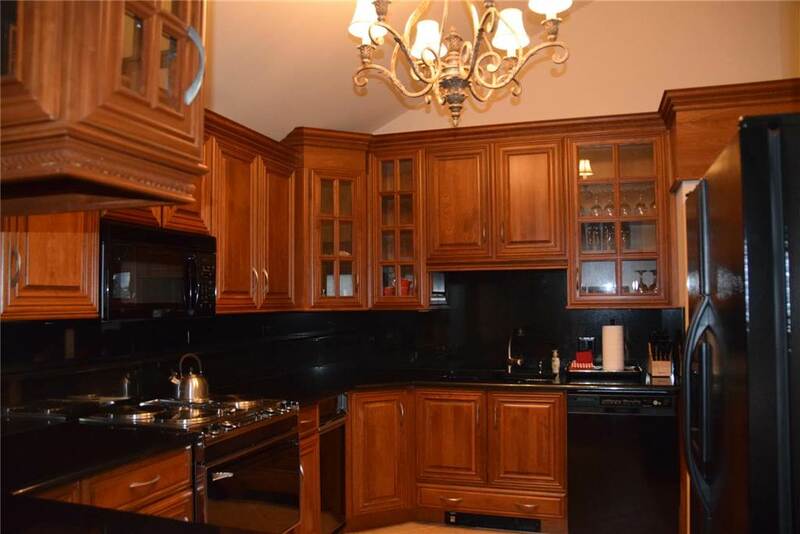 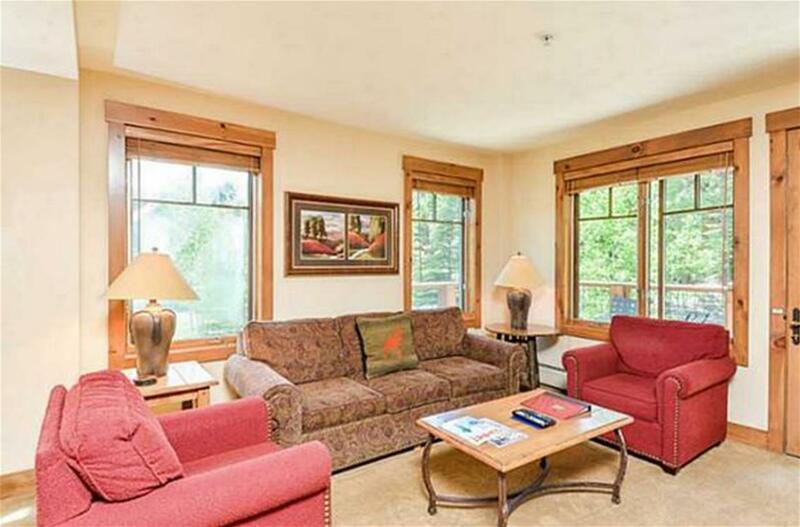 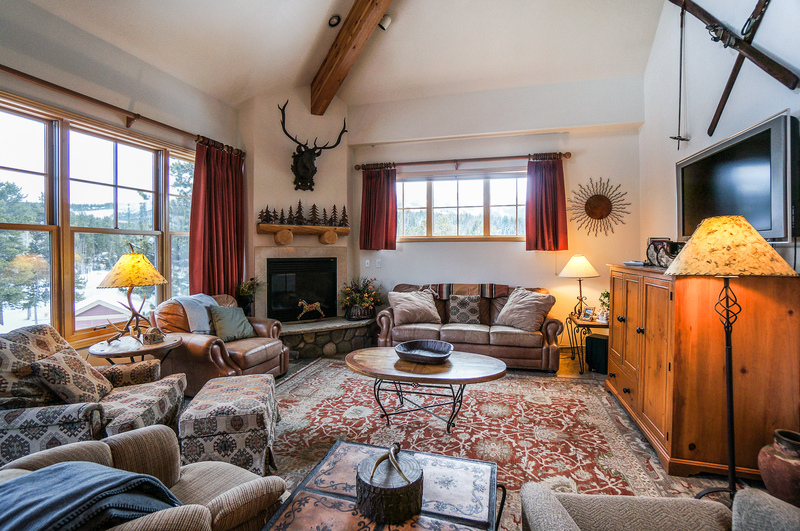 You’ll feel like you’re miles away in this a quiet, peaceful setting with incredible views. 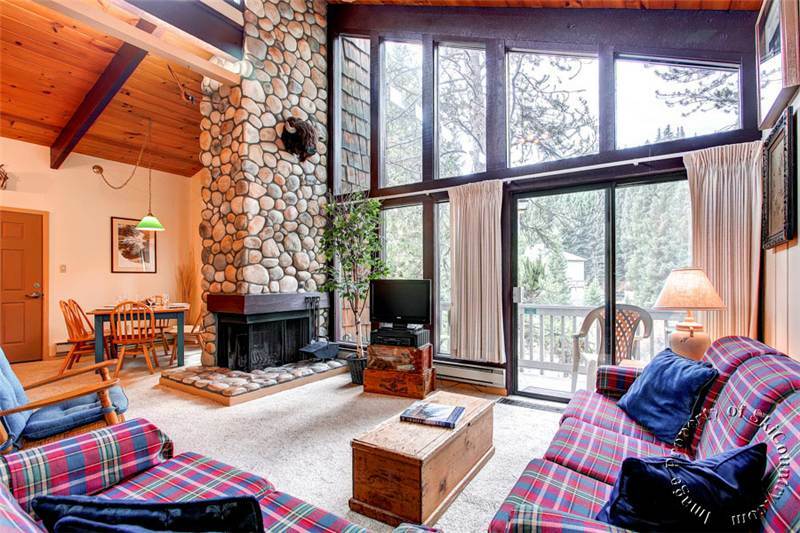 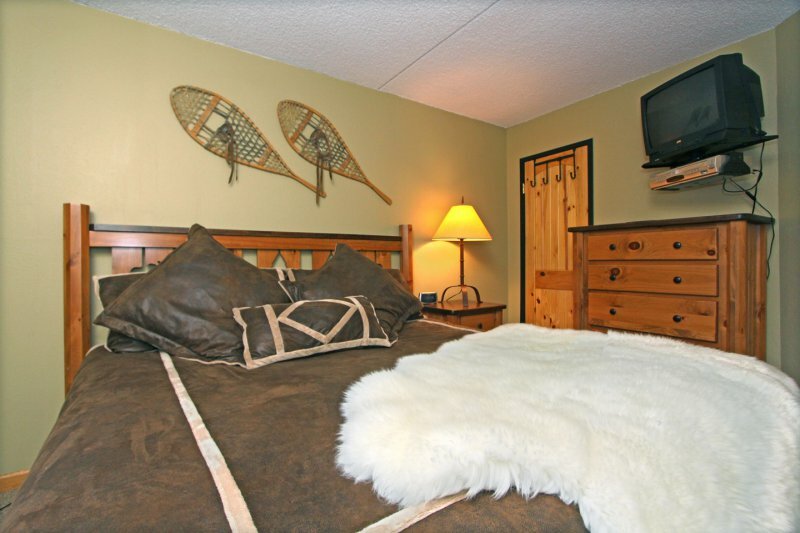 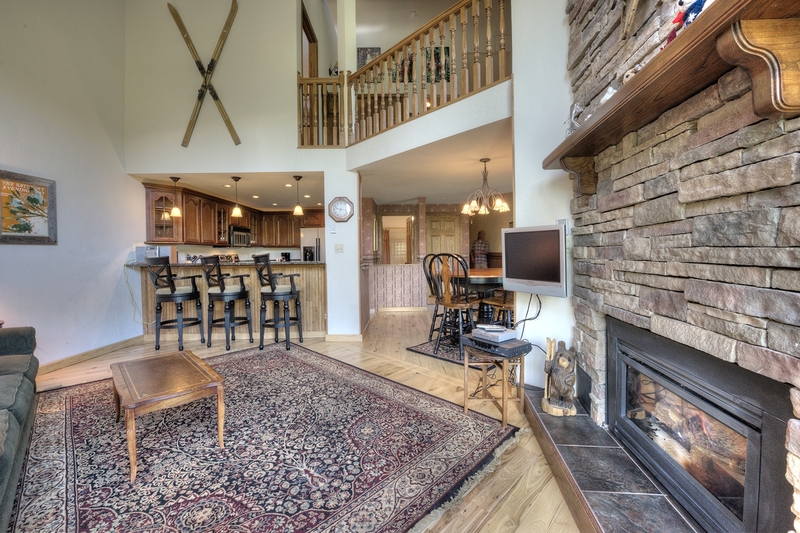 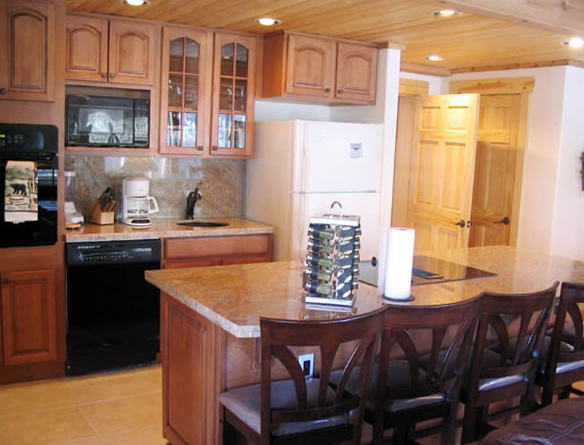 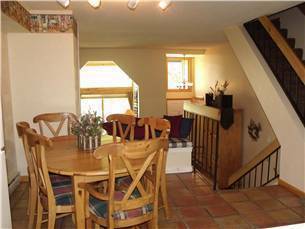 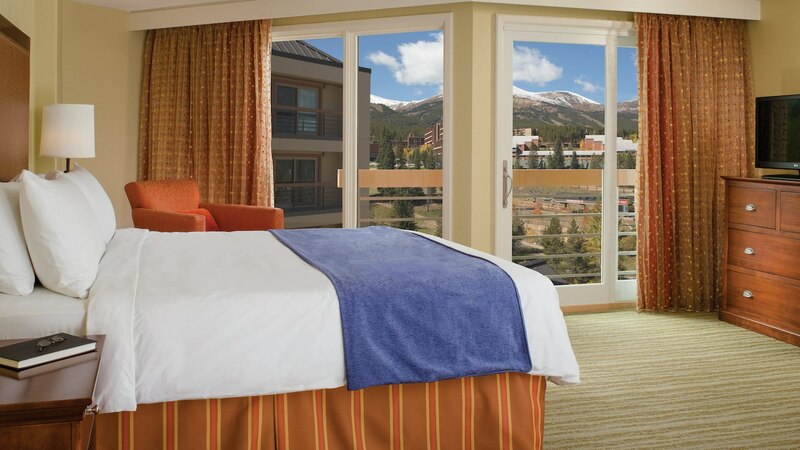 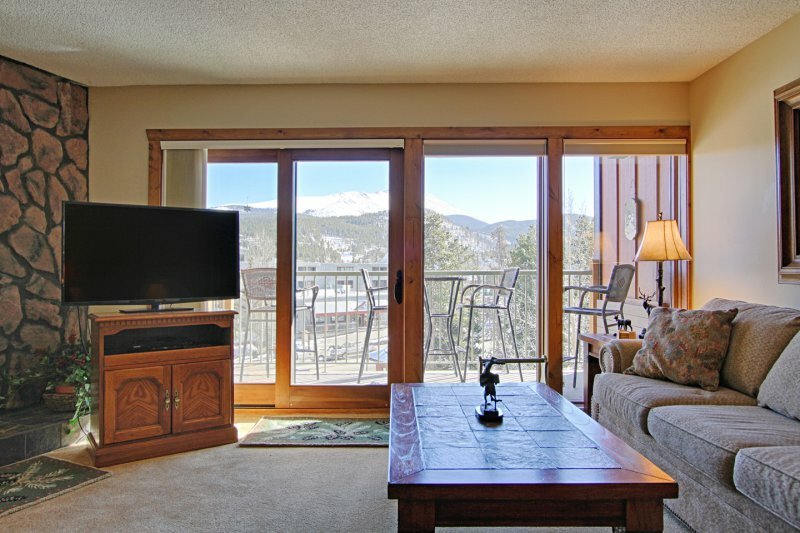 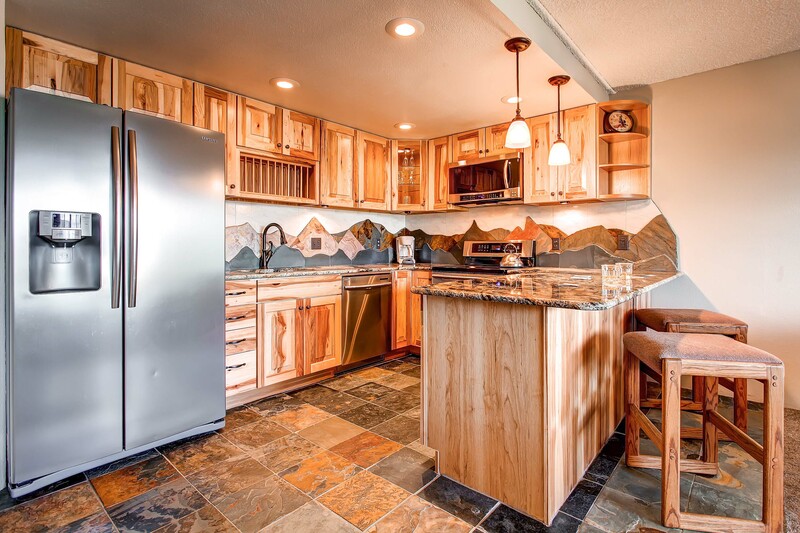 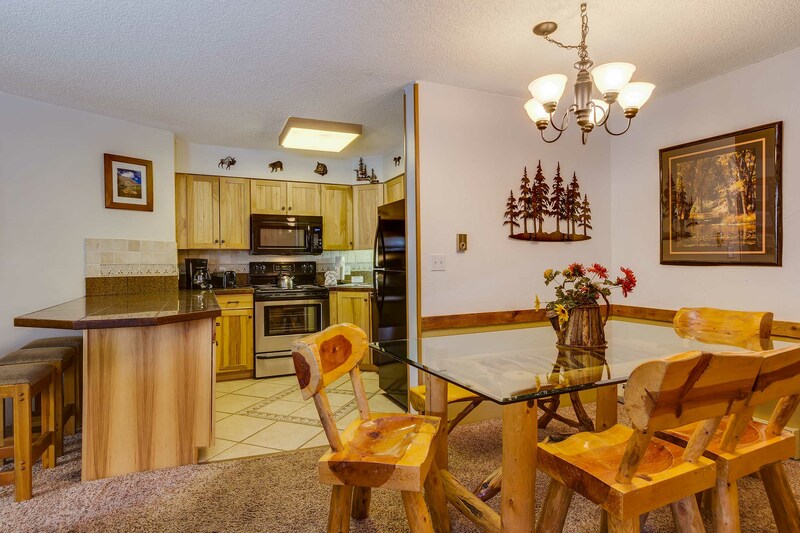 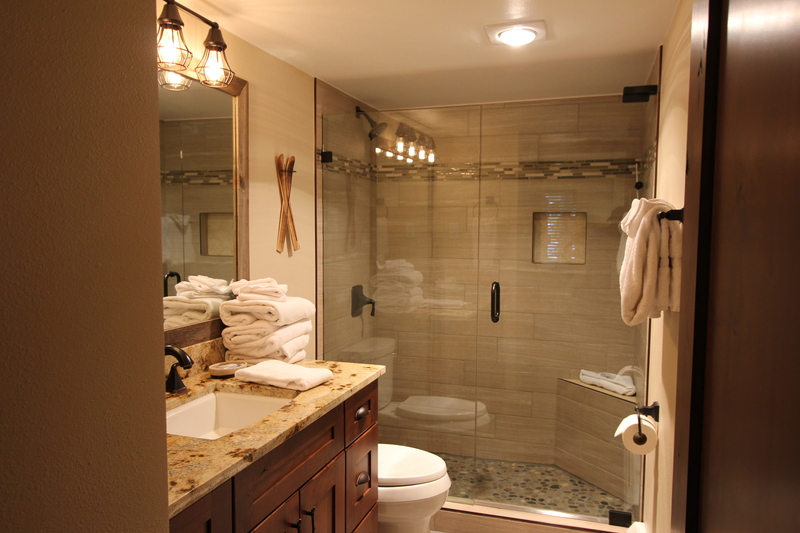 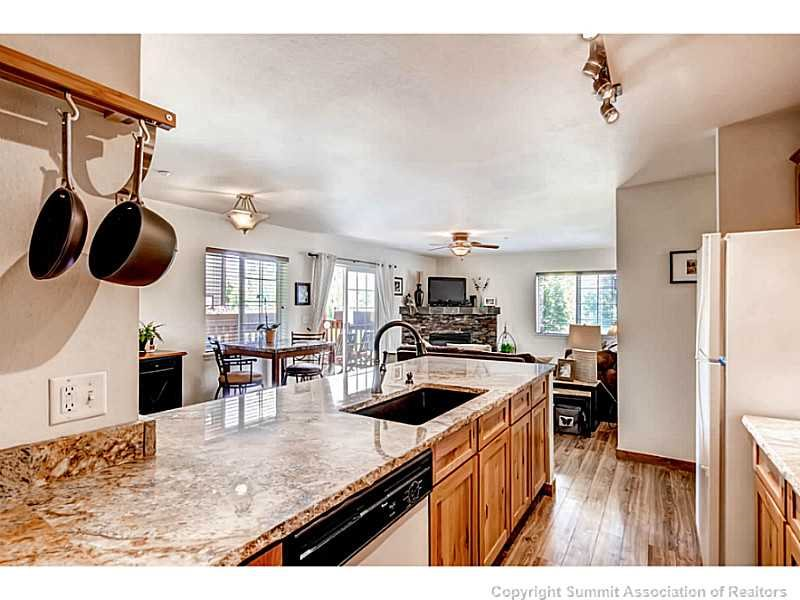 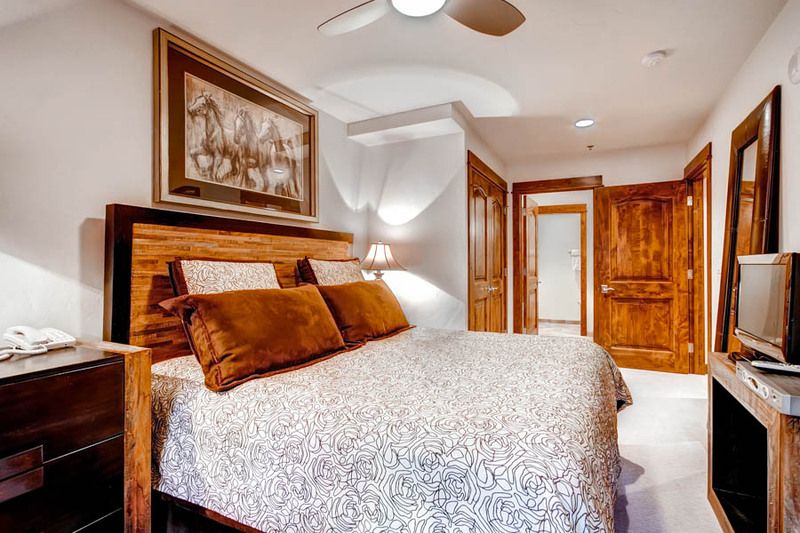 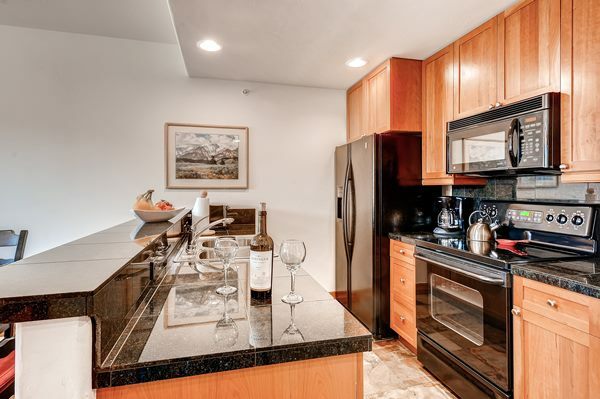 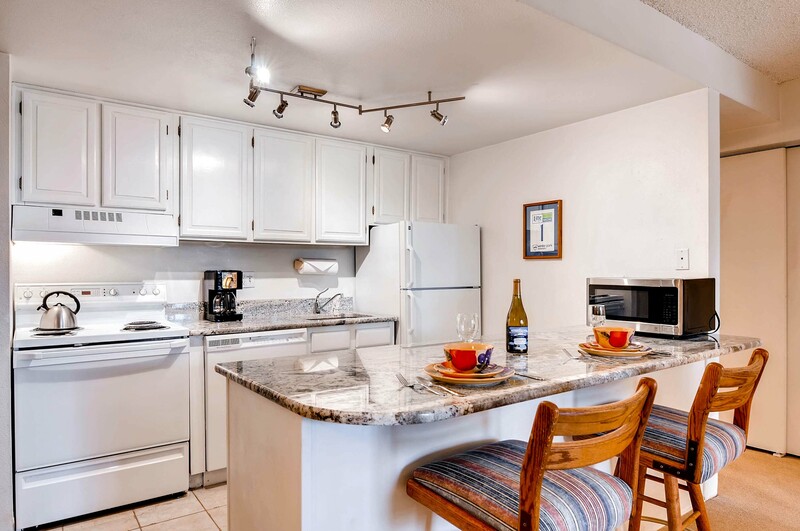 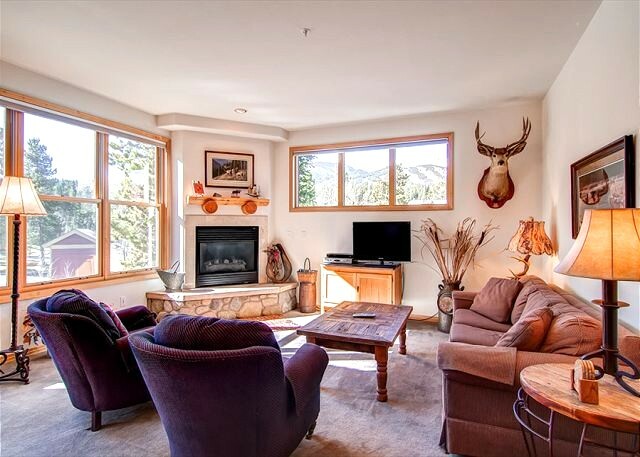 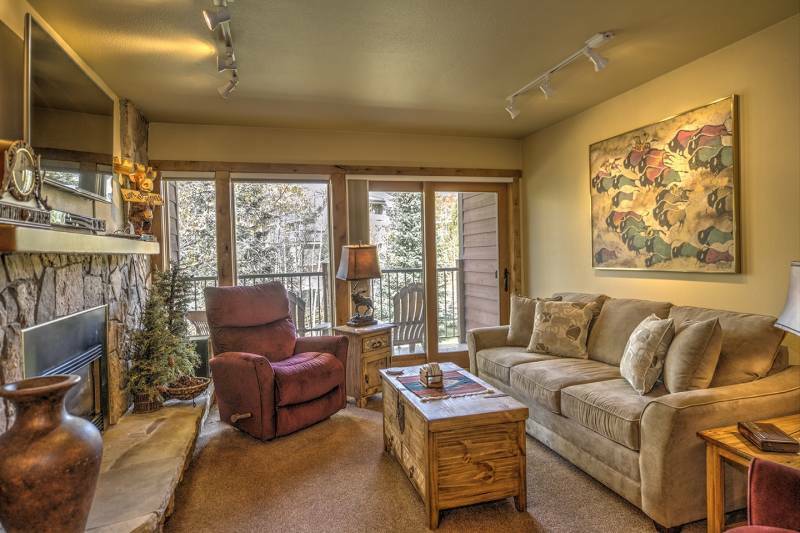 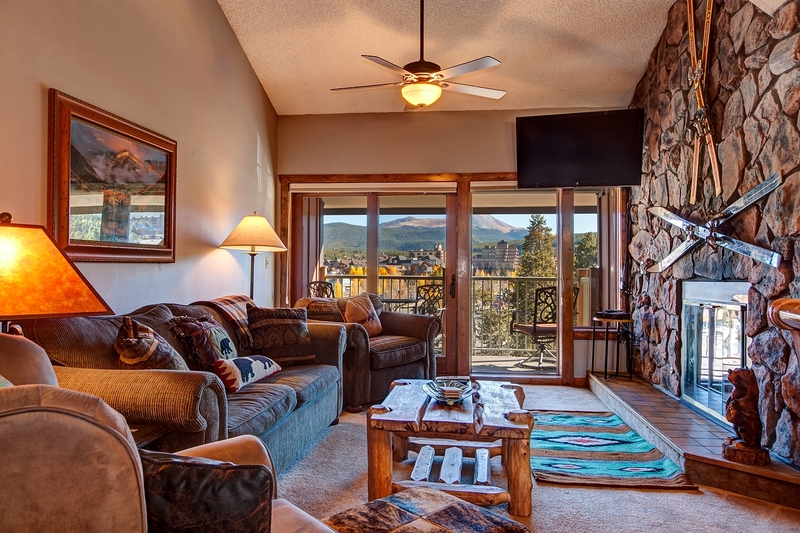 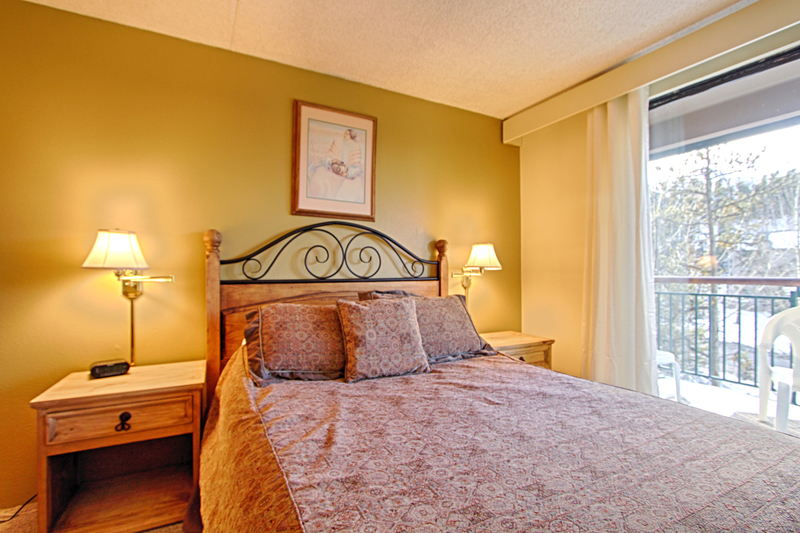 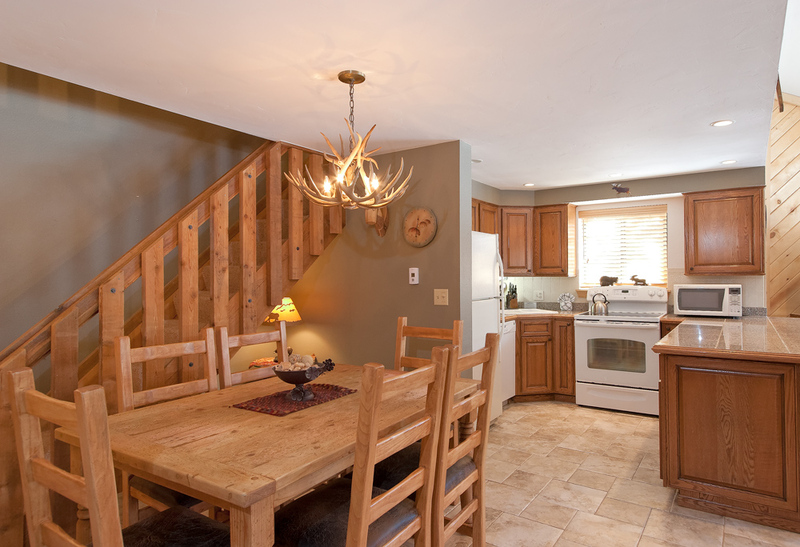 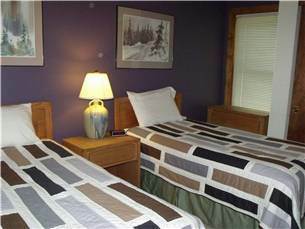 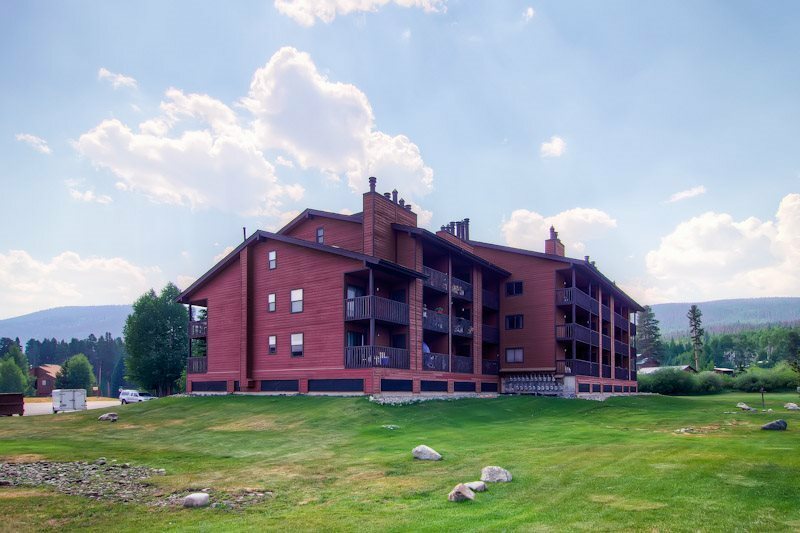 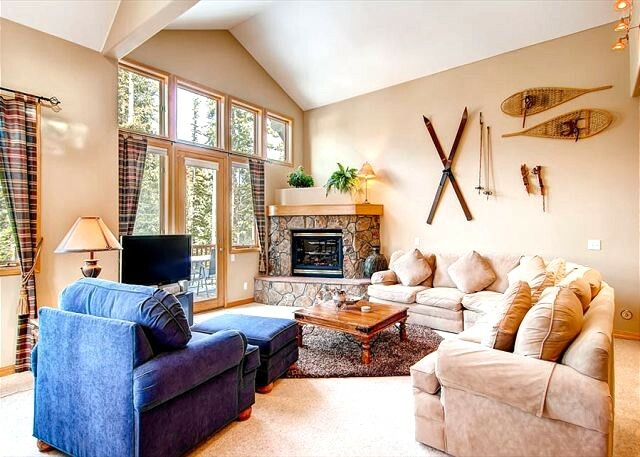 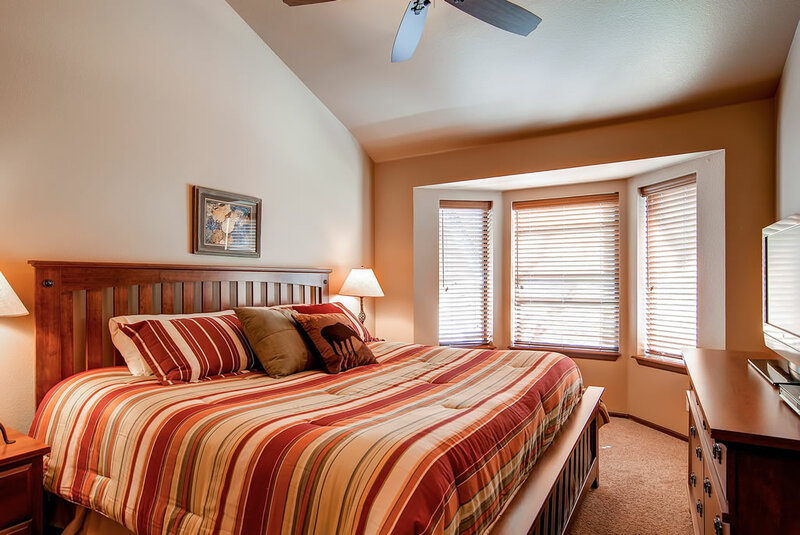 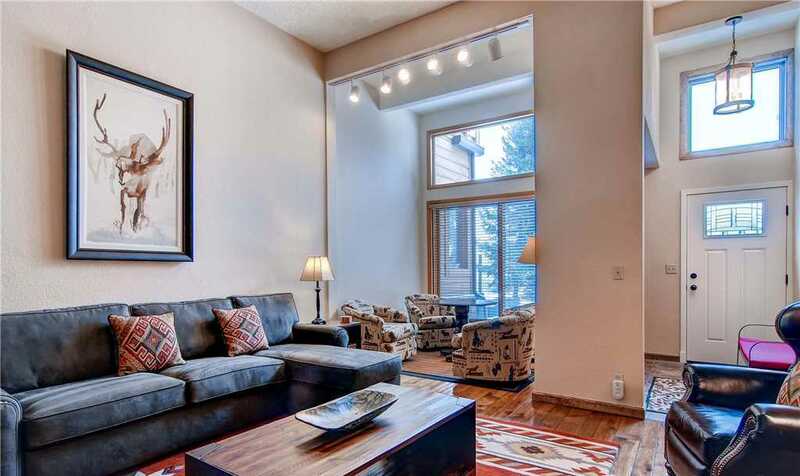 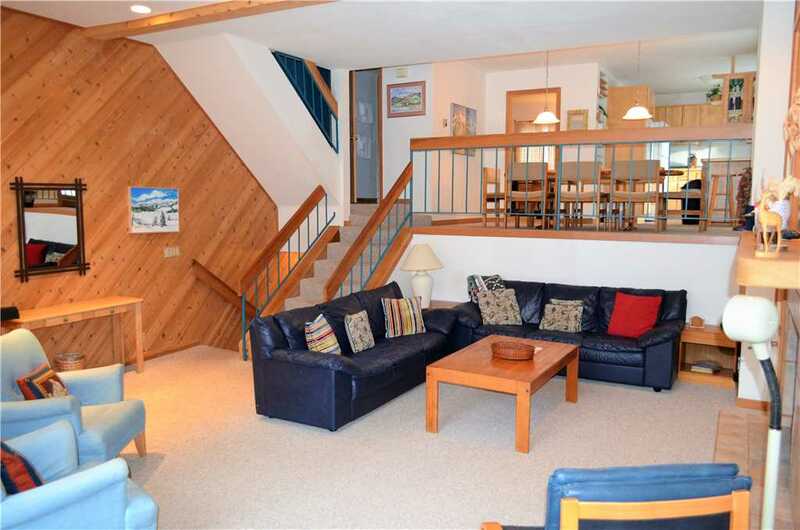 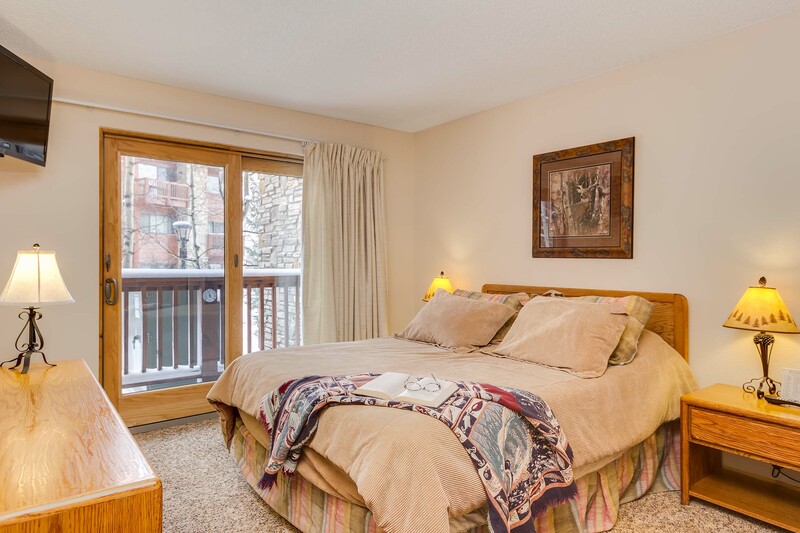 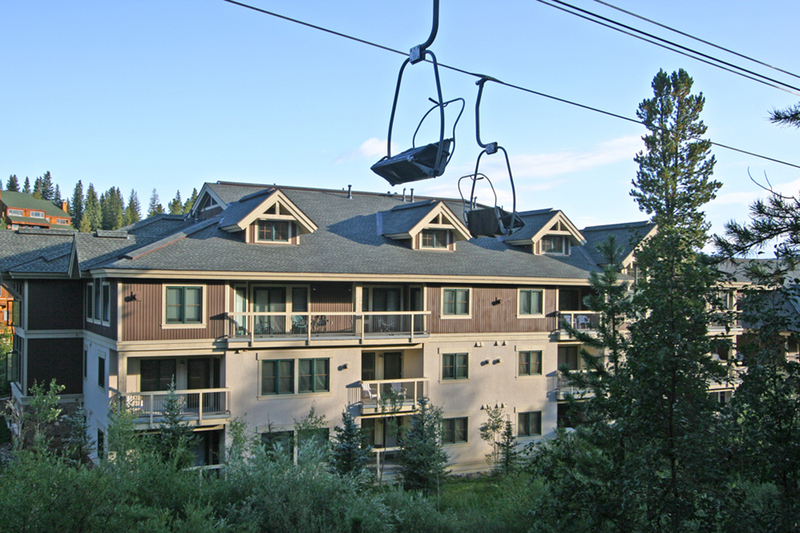 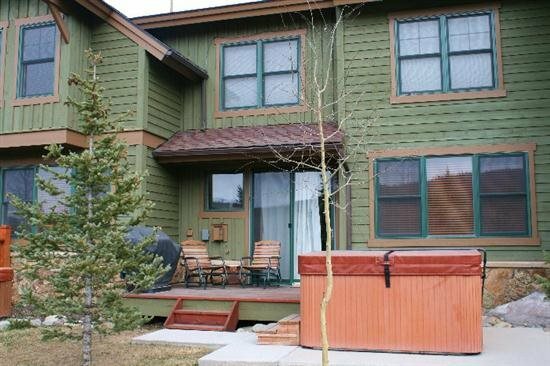 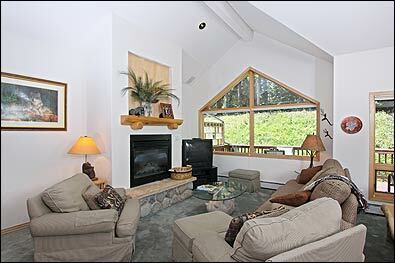 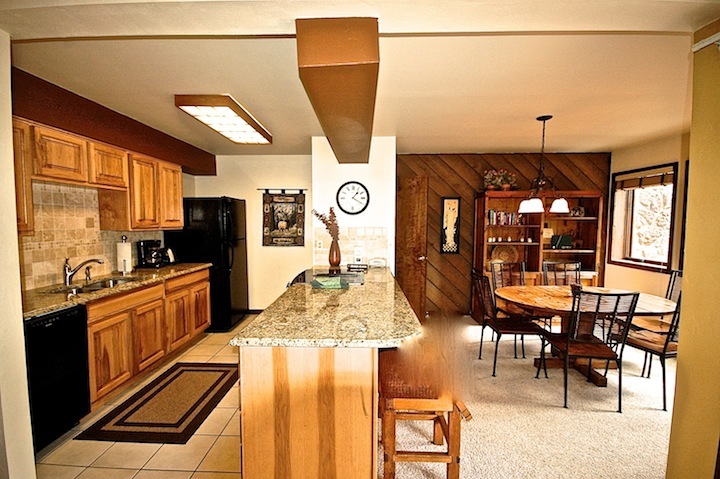 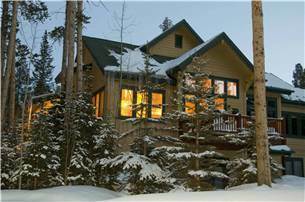 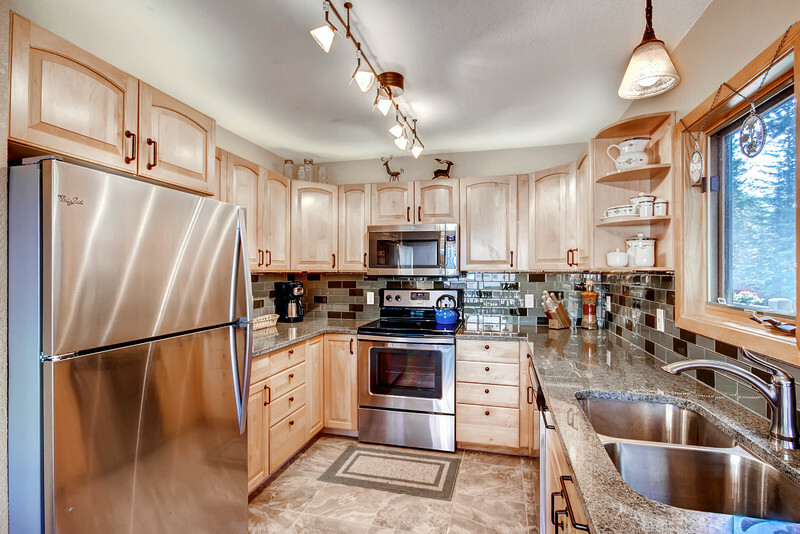 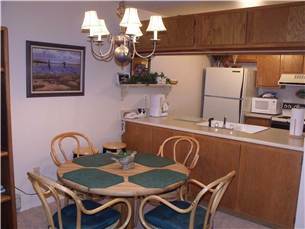 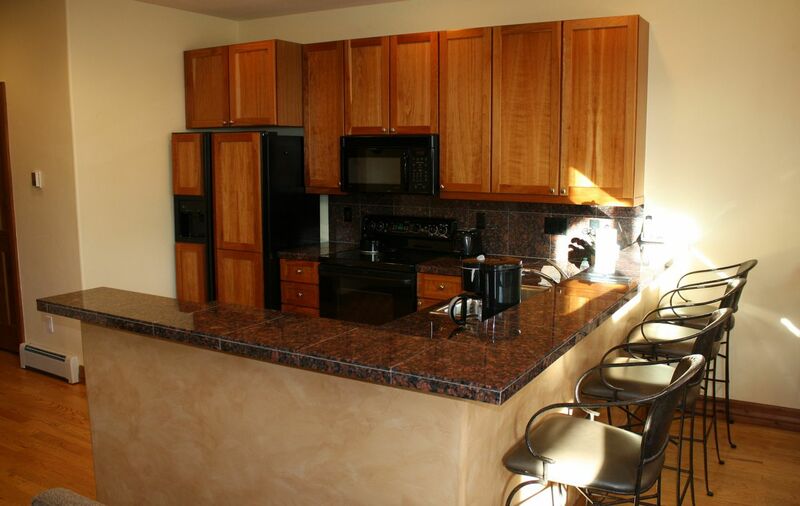 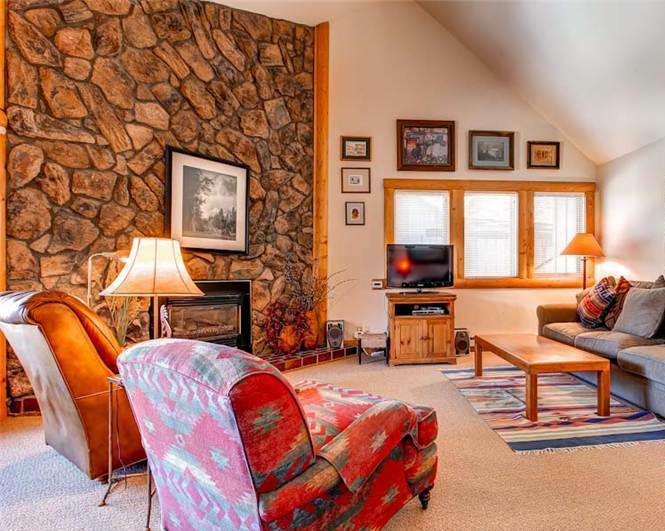 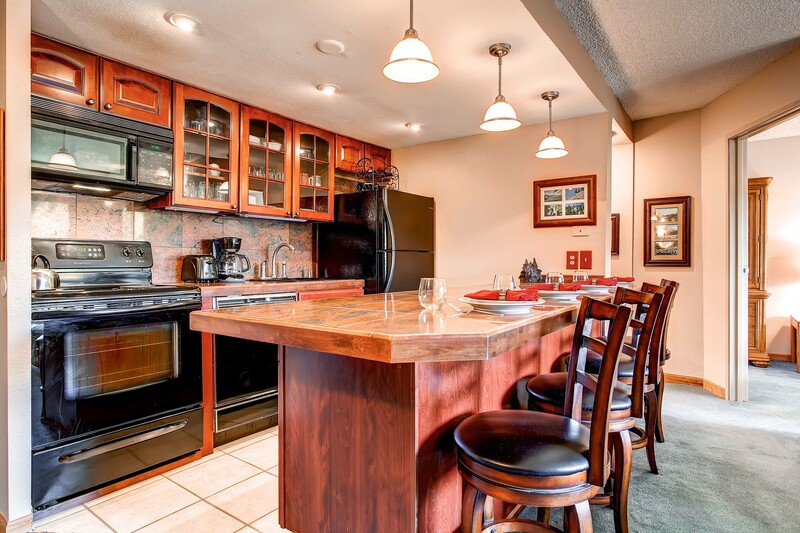 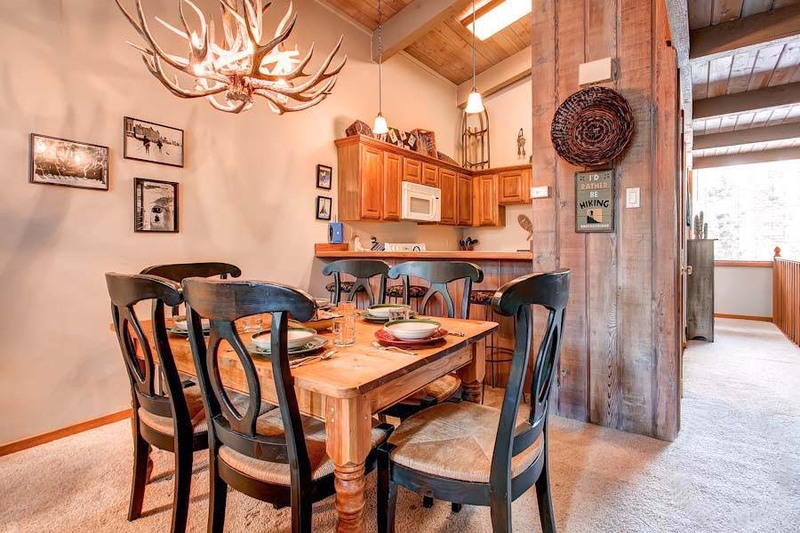 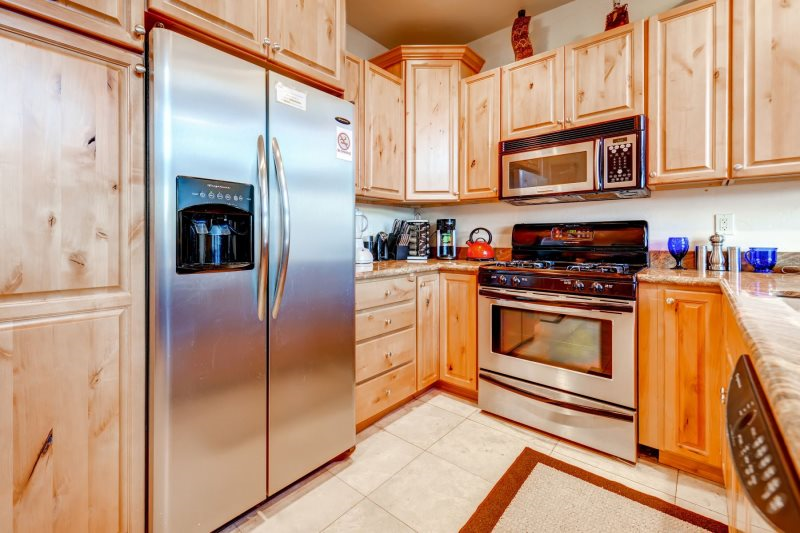 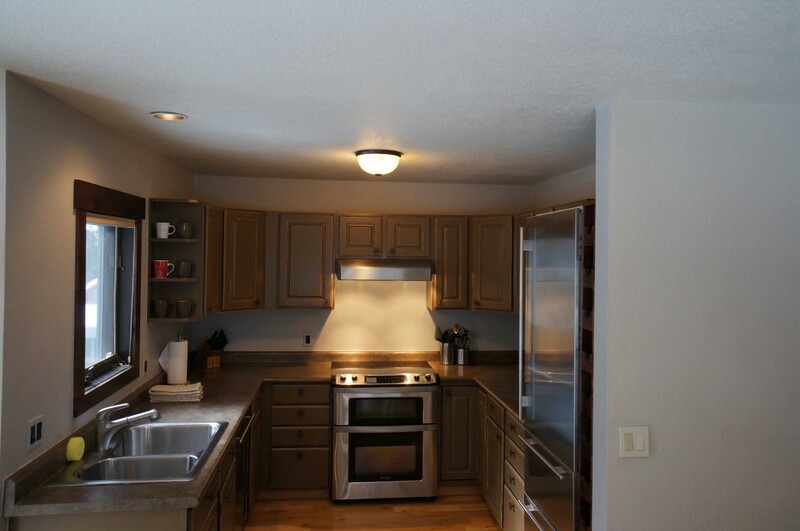 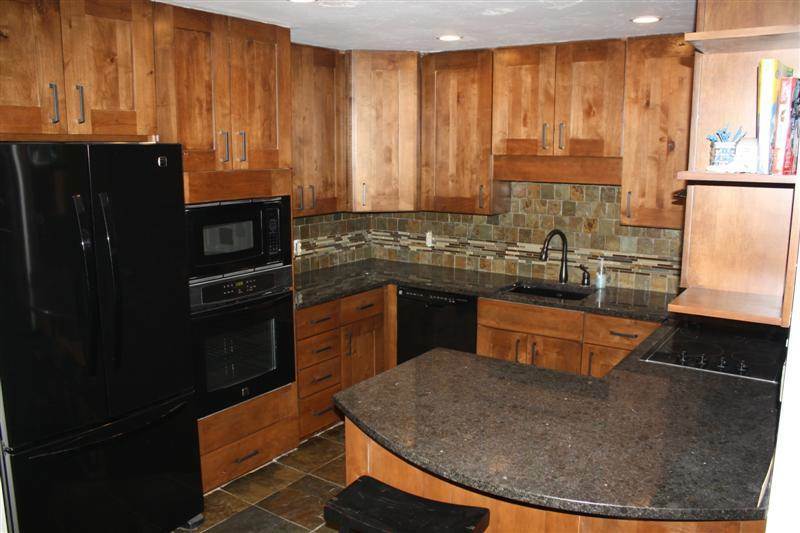 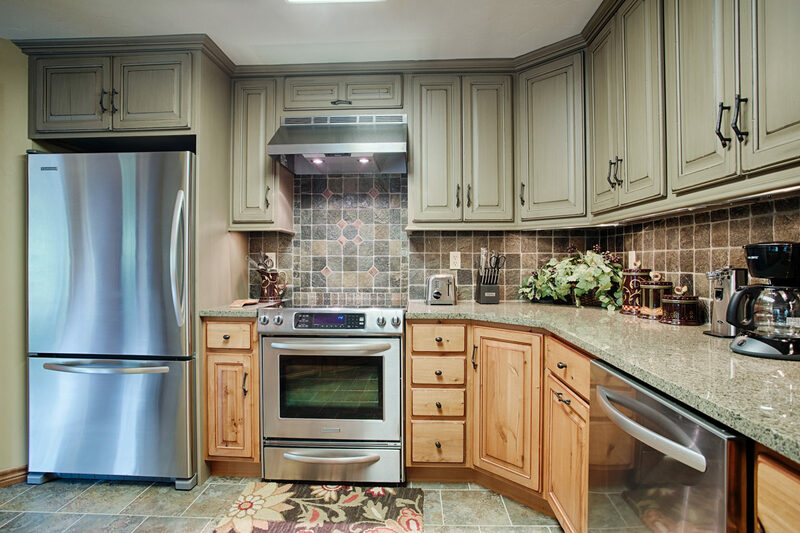 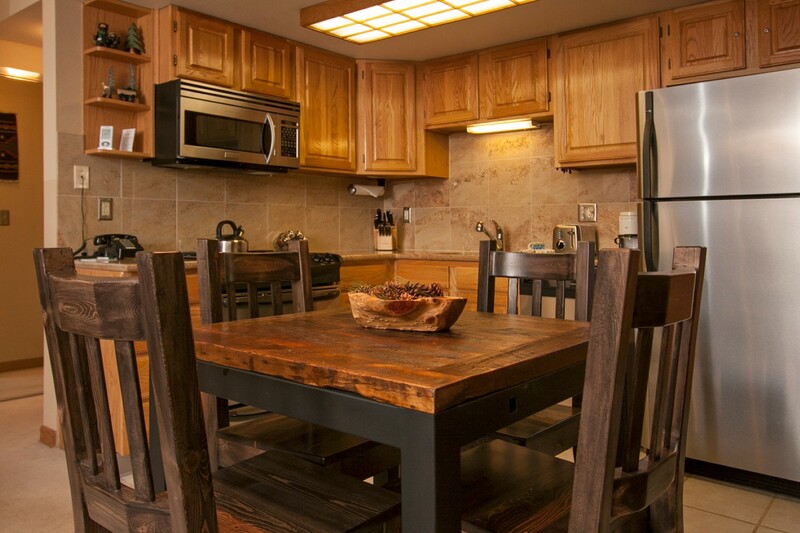 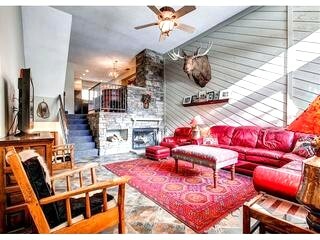 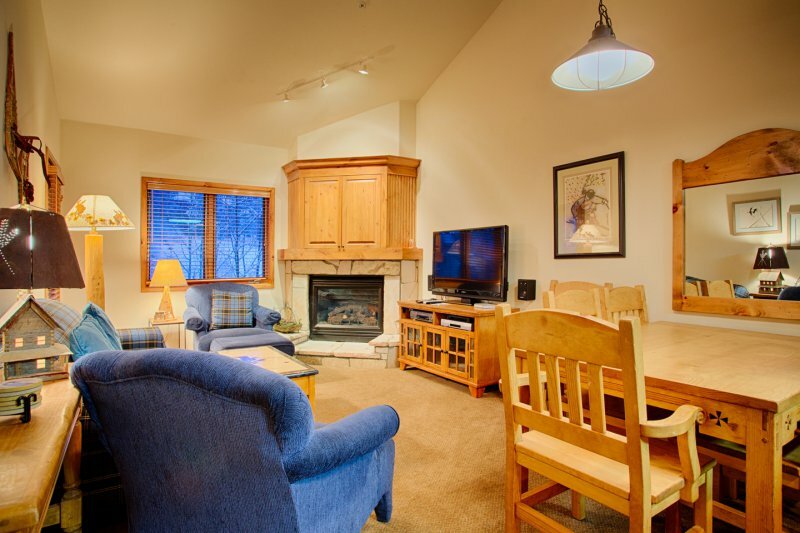 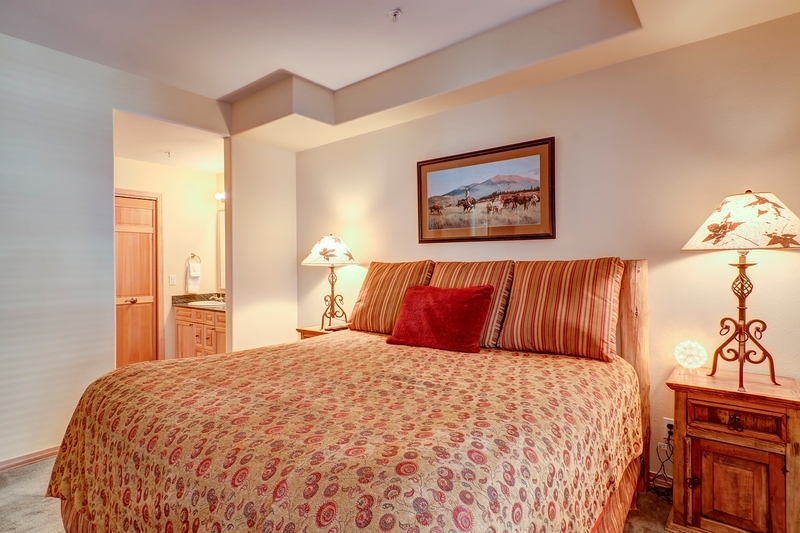 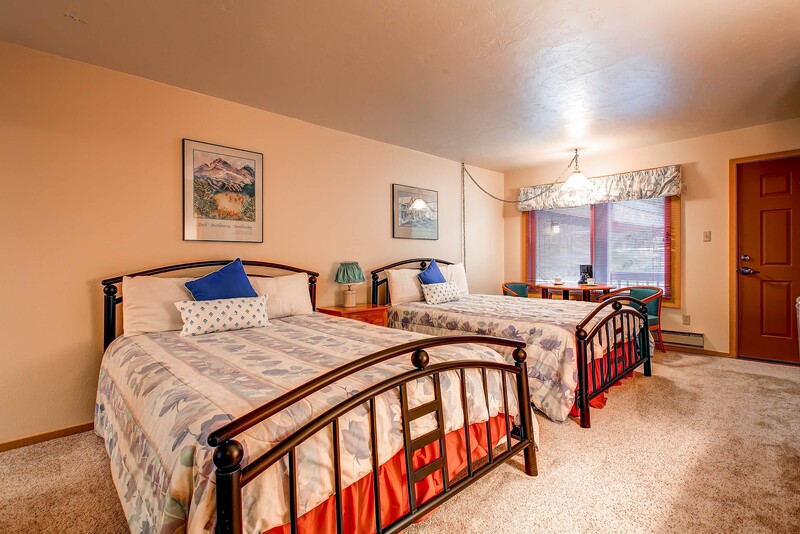 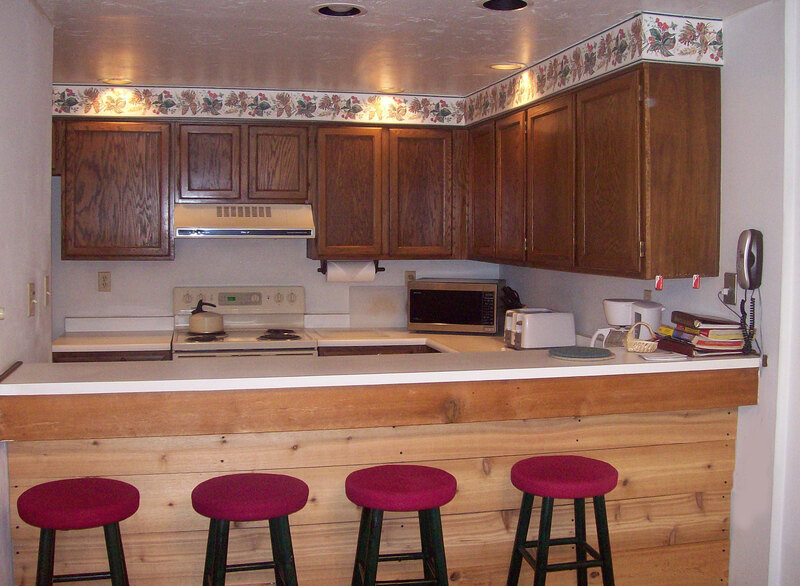 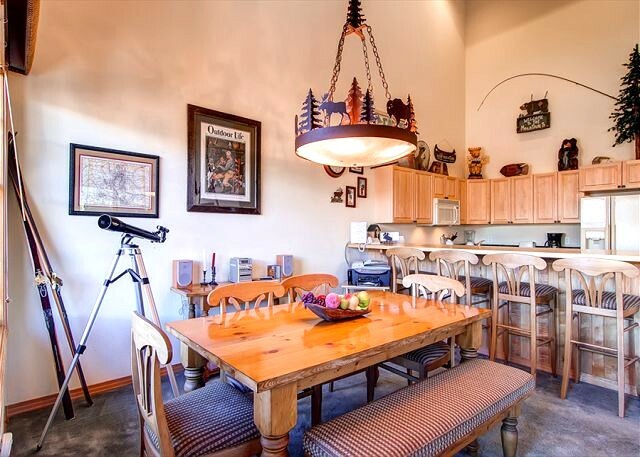 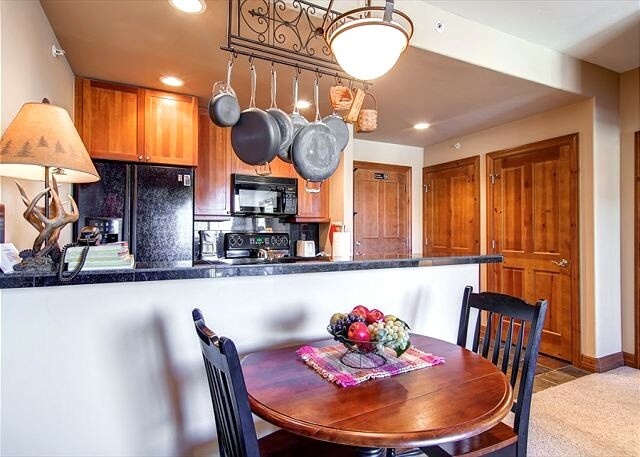 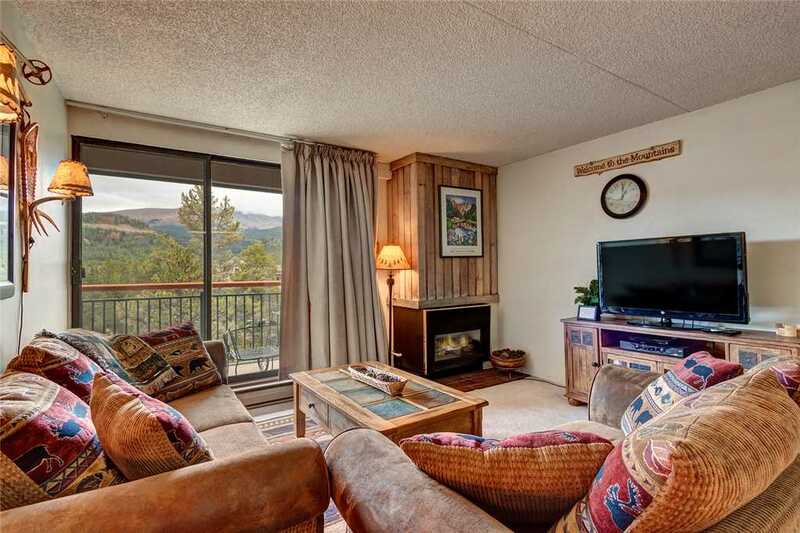 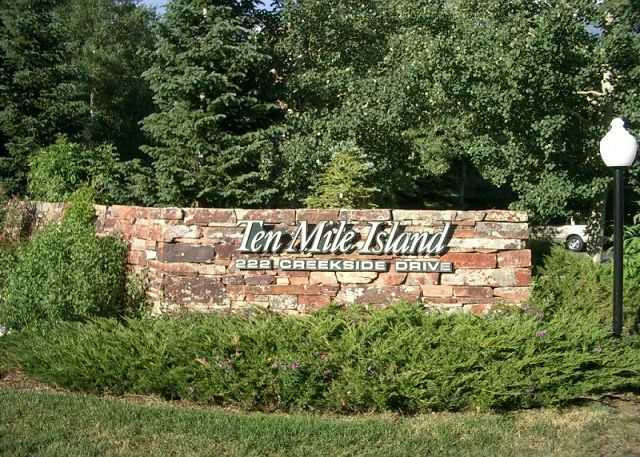 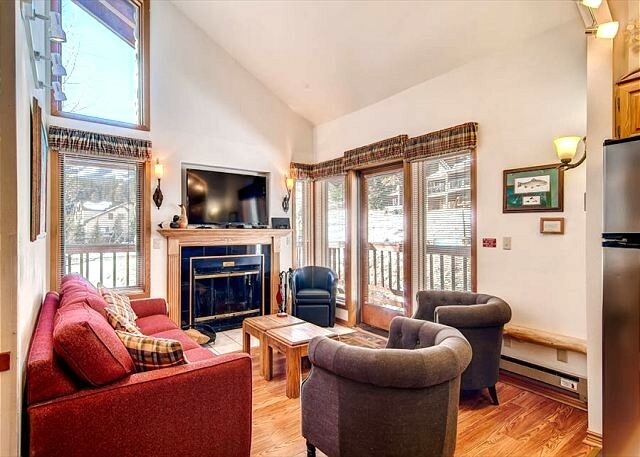 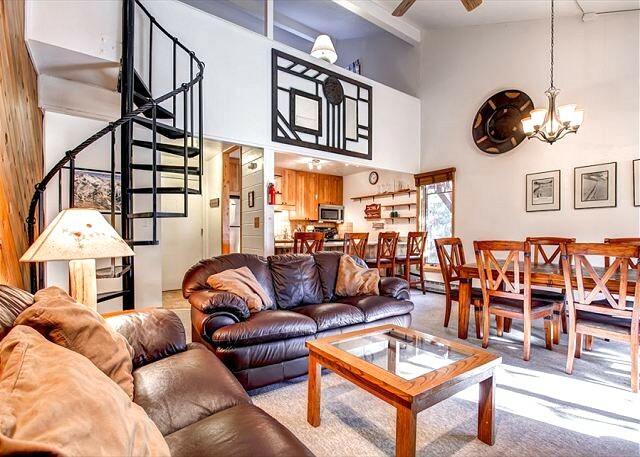 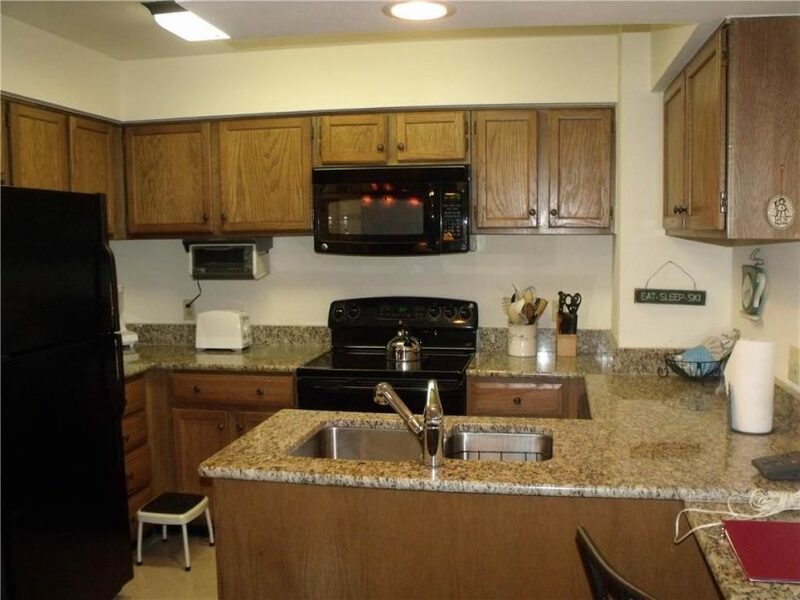 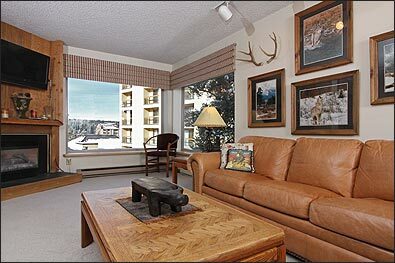 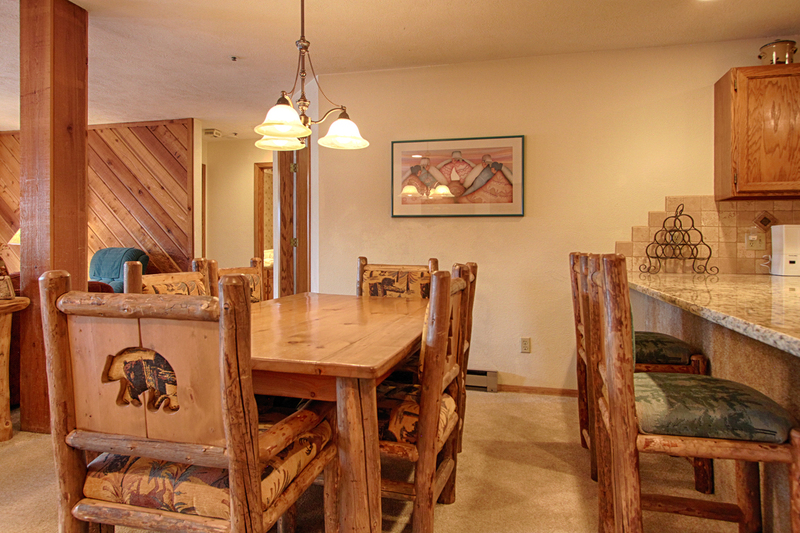 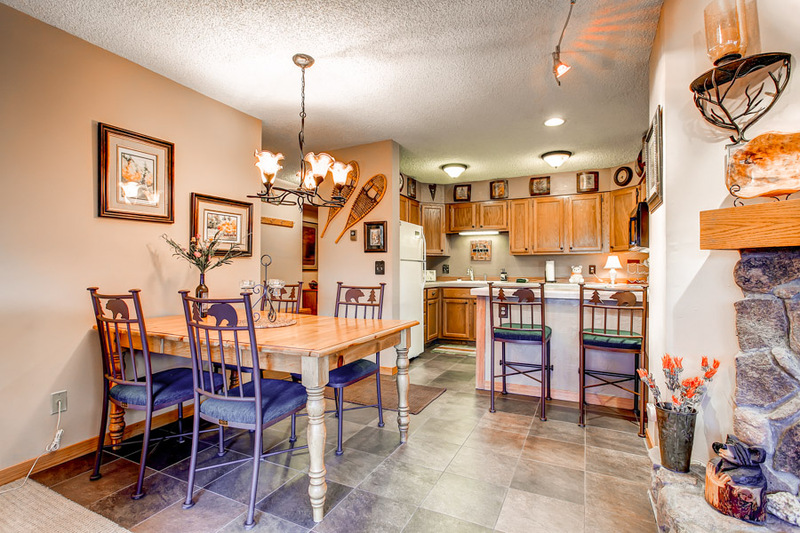 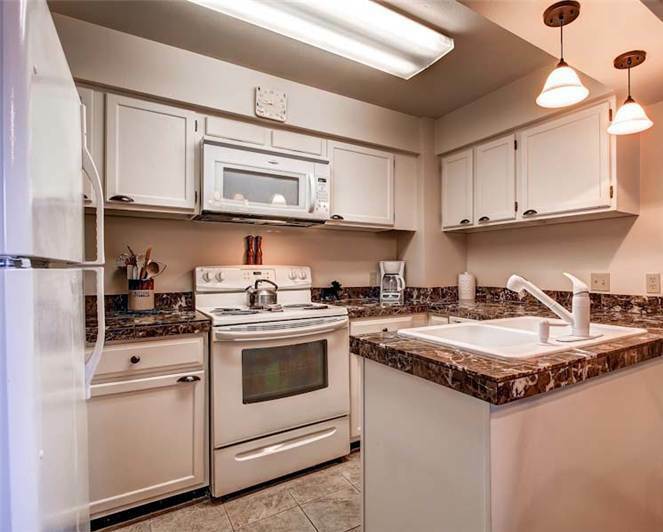 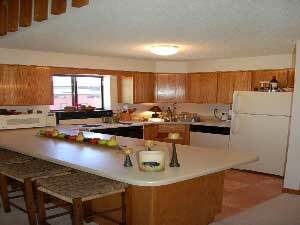 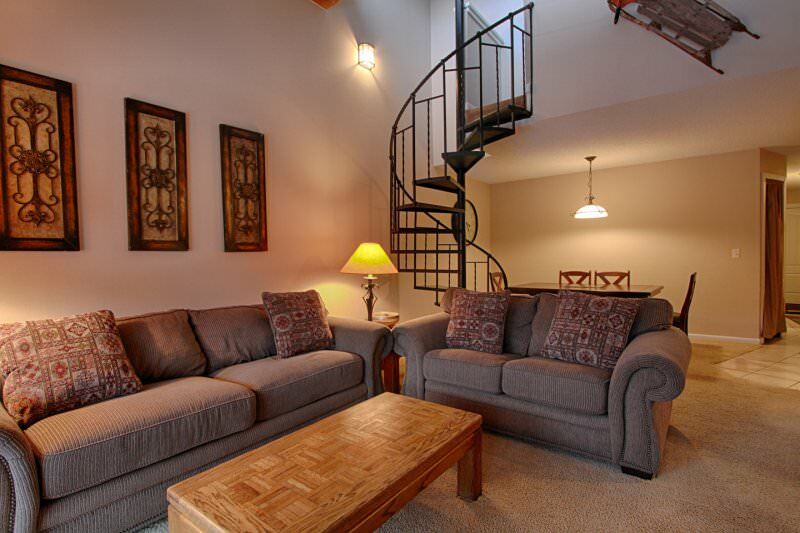 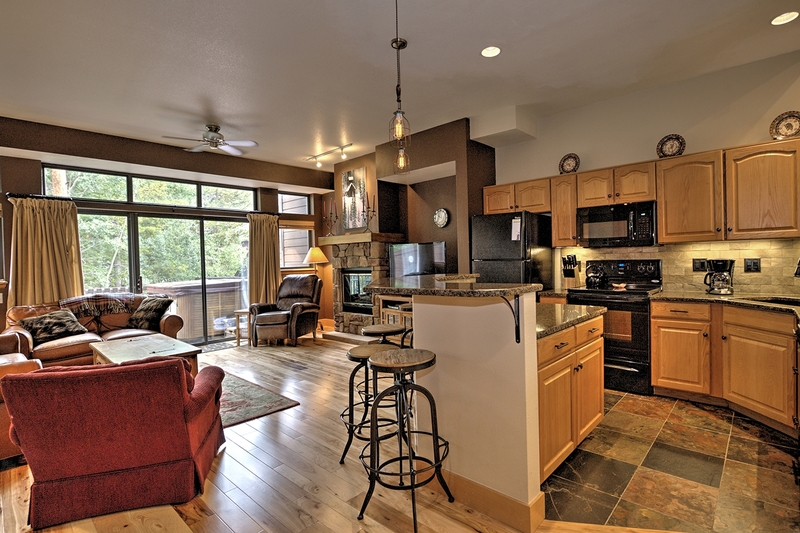 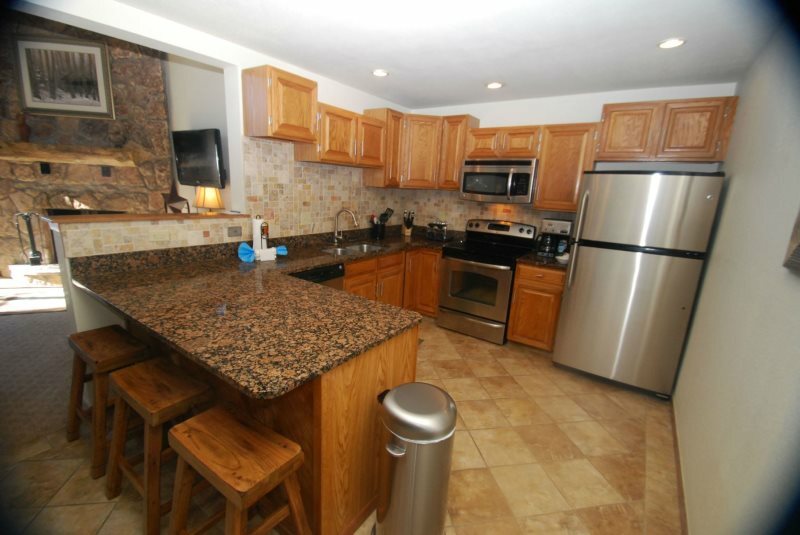 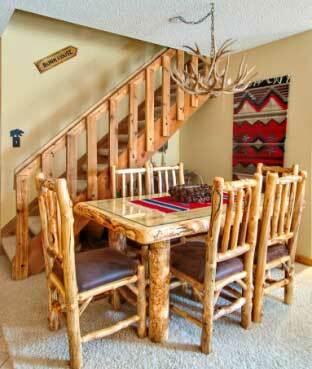 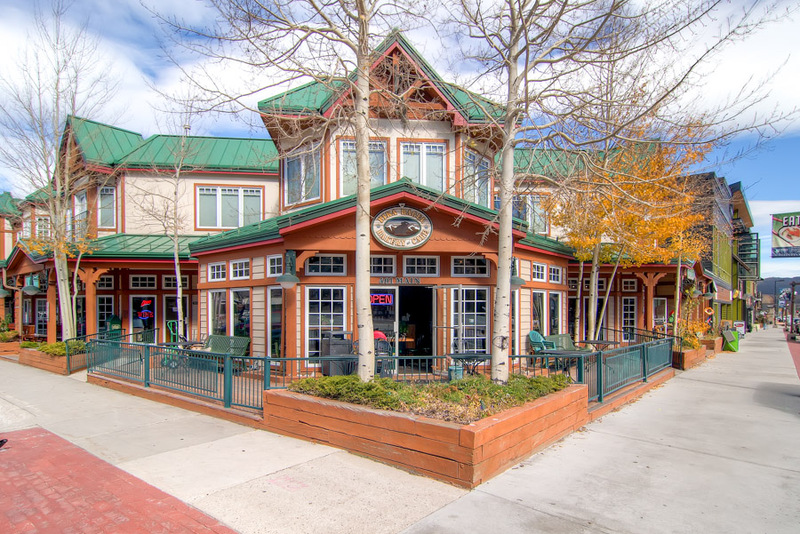 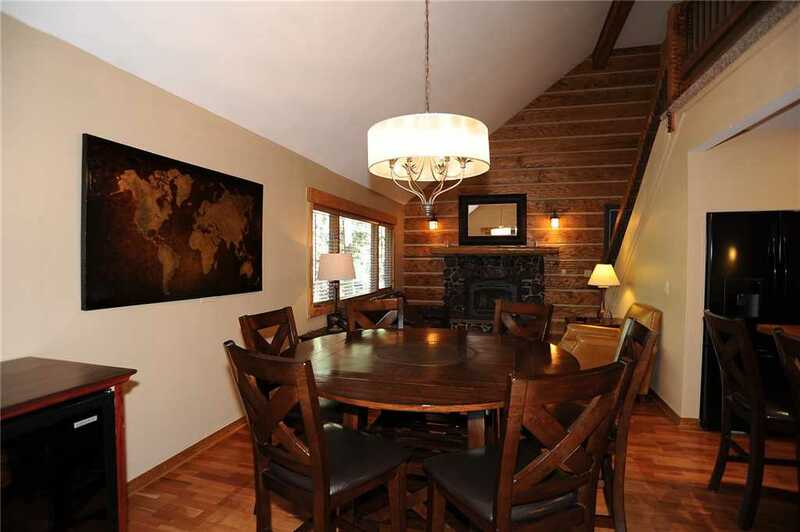 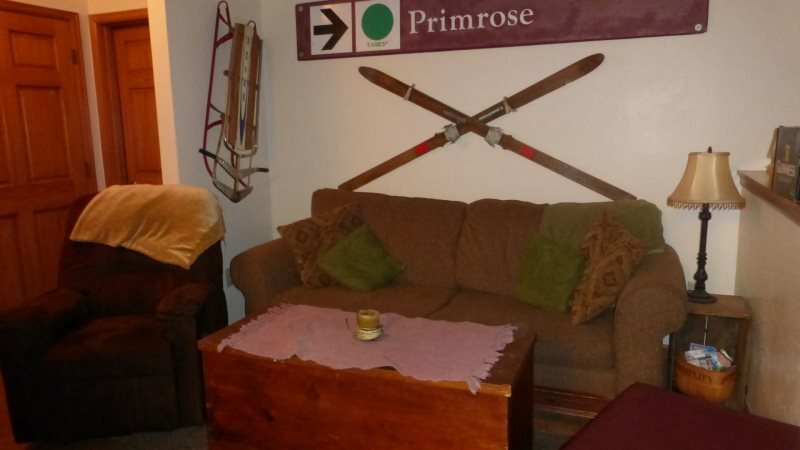 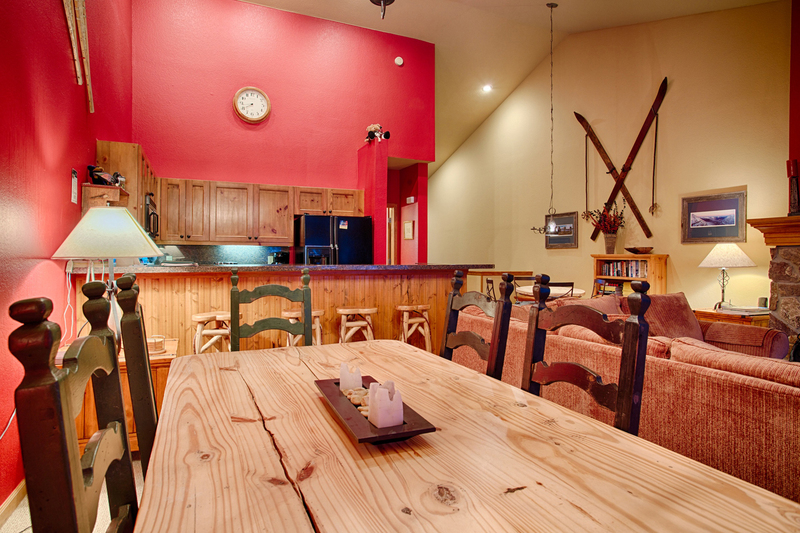 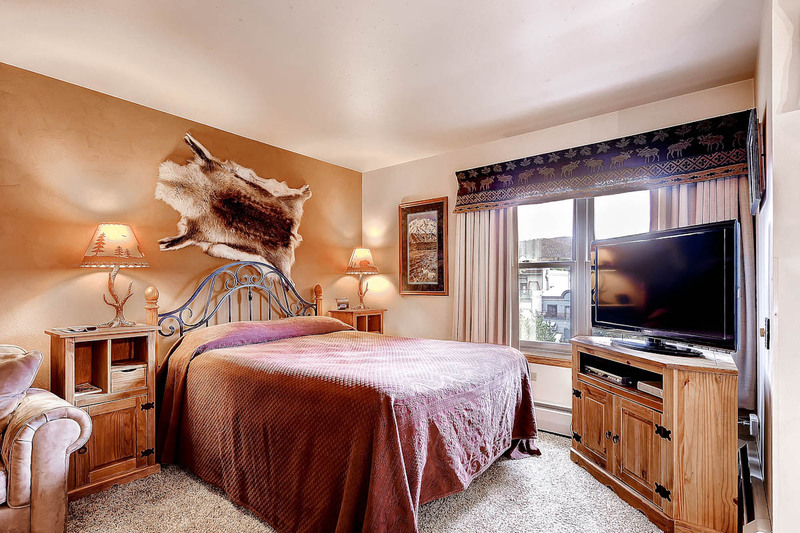 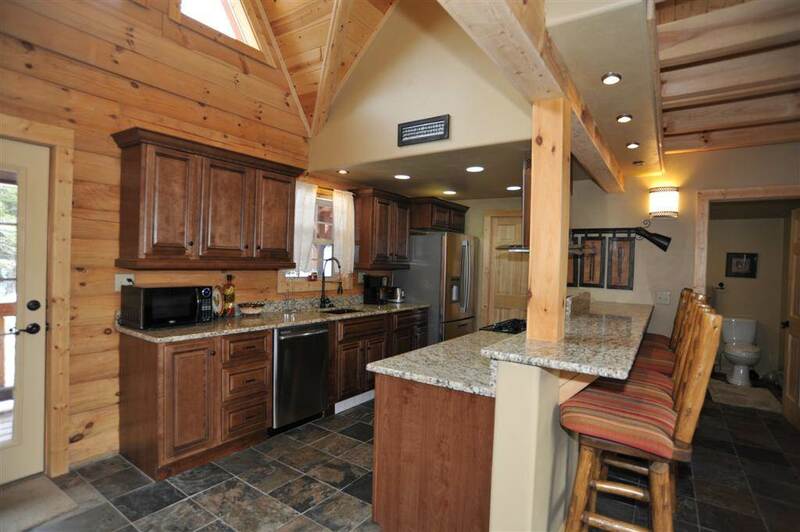 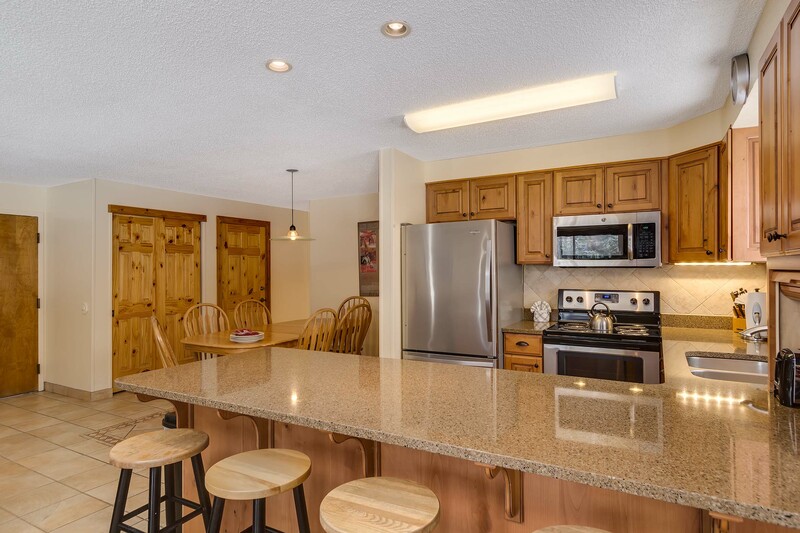 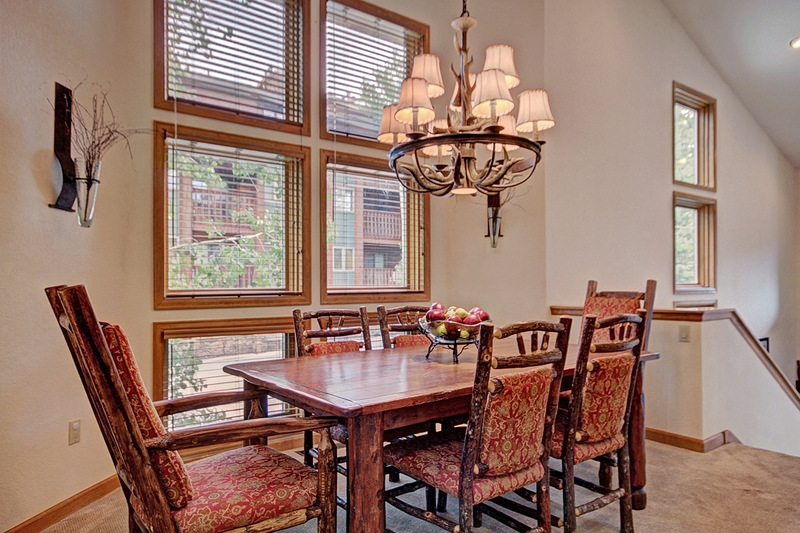 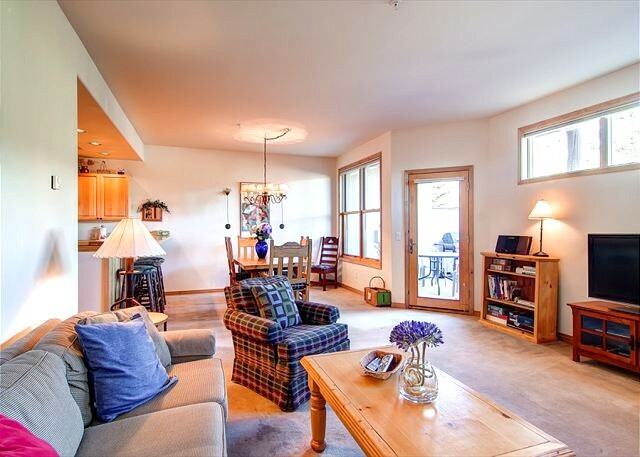 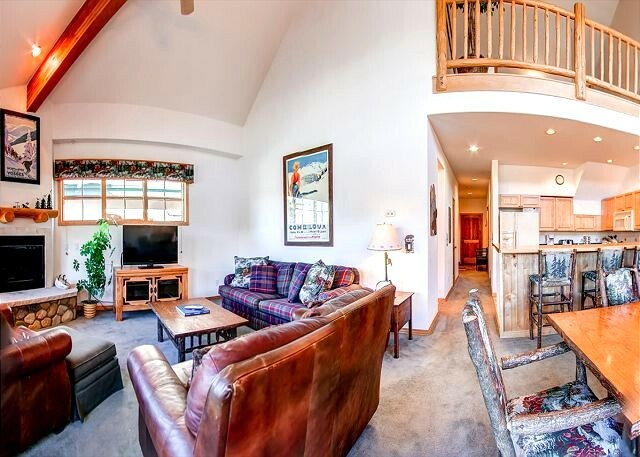 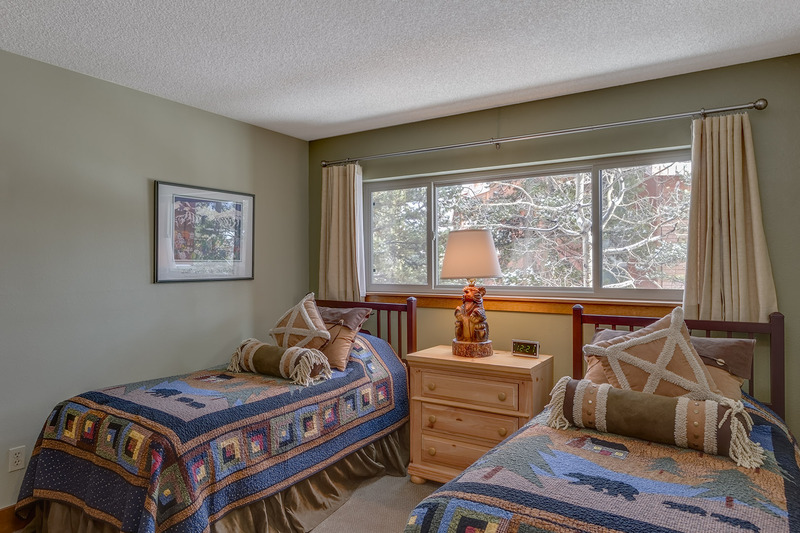 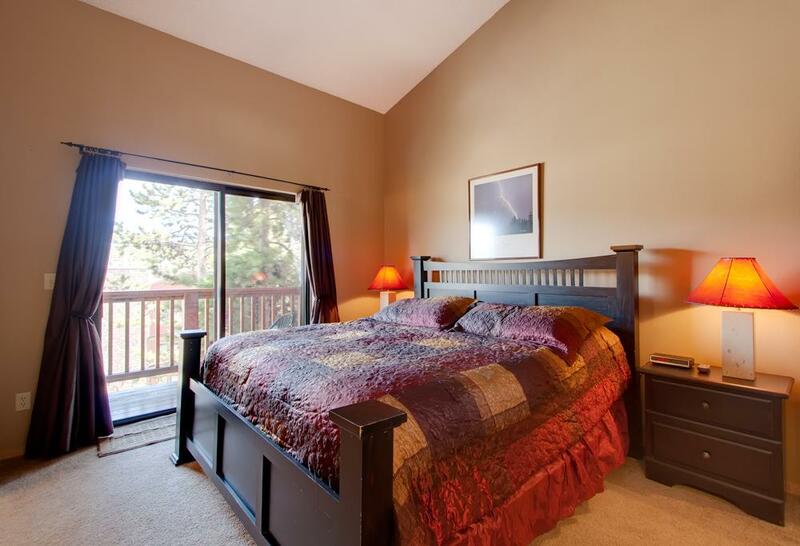 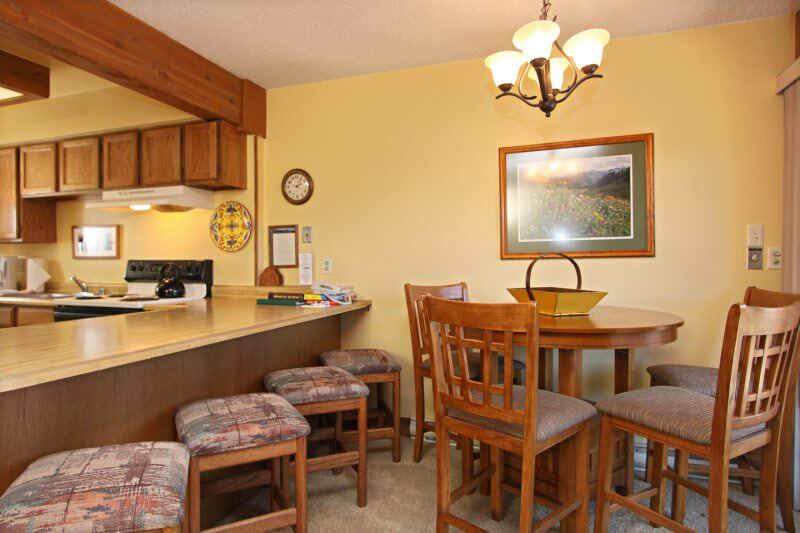 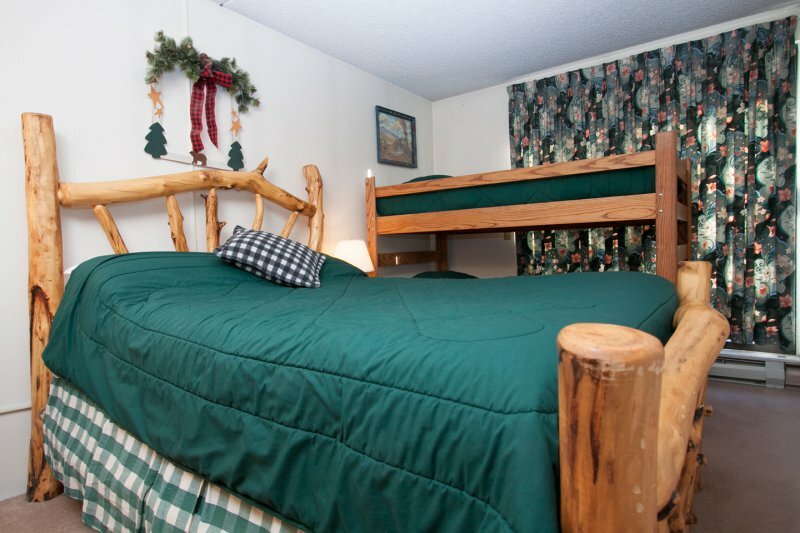 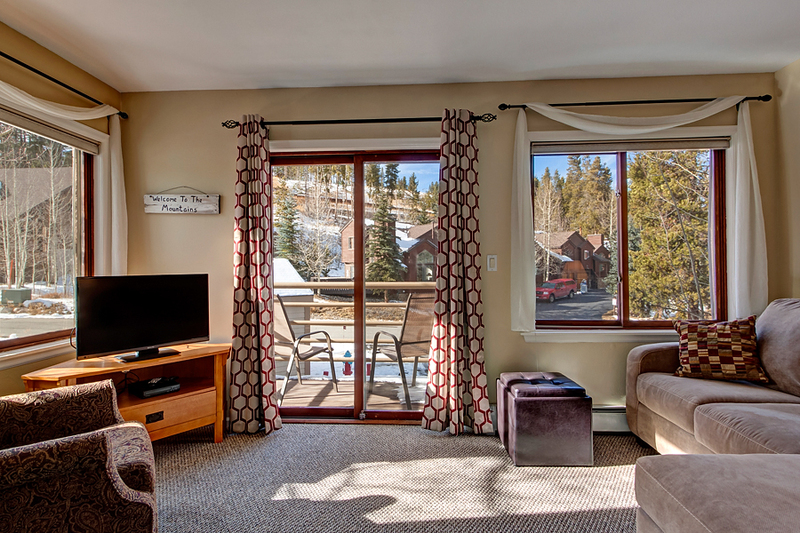 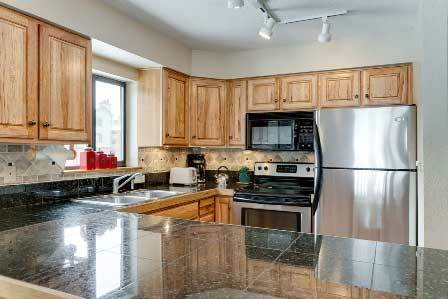 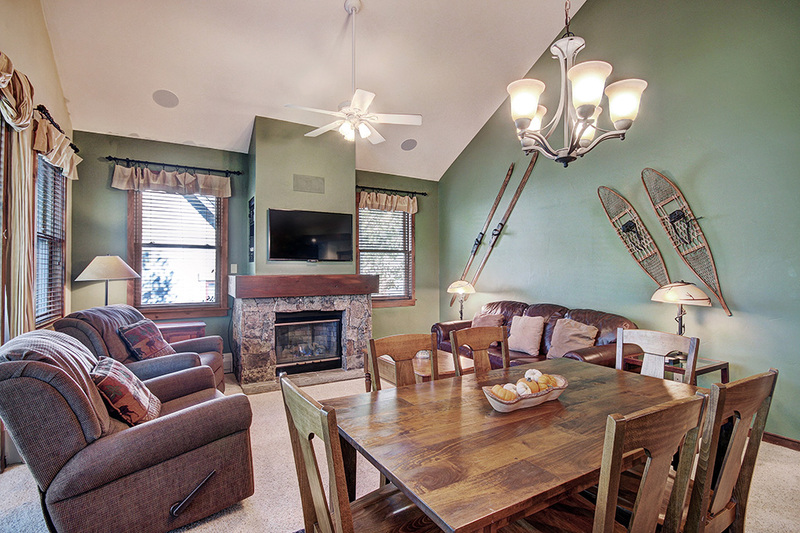 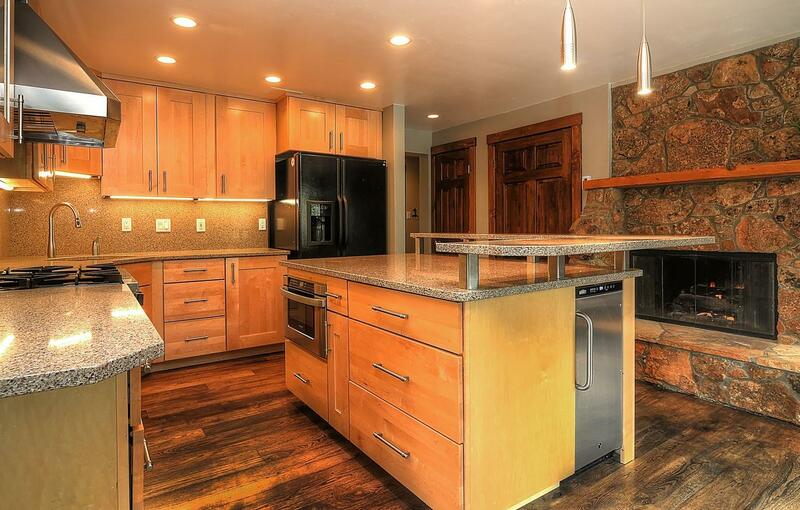 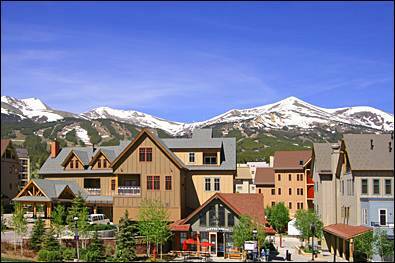 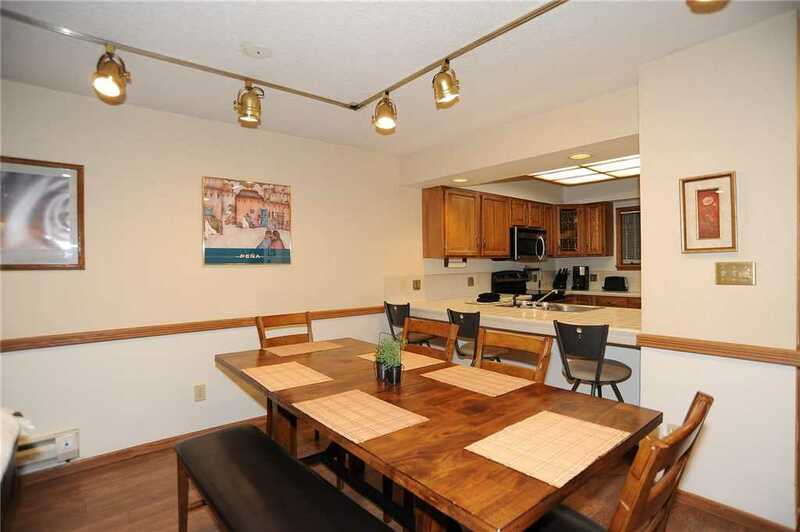 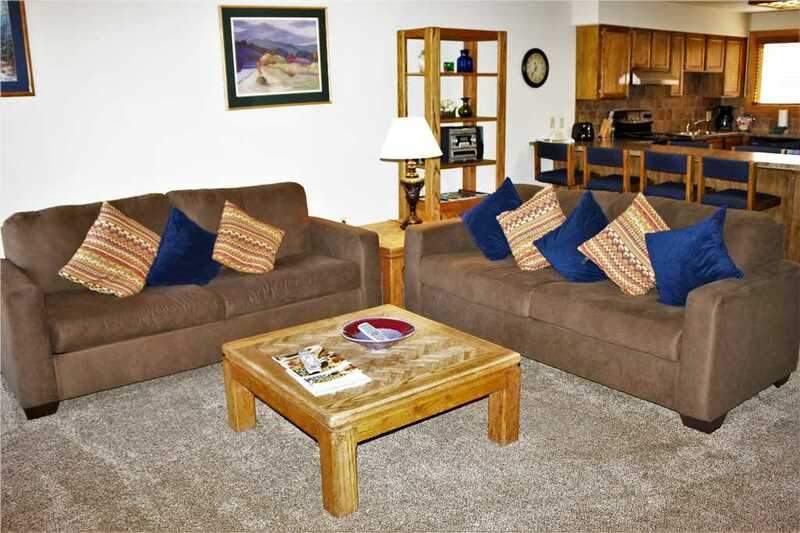 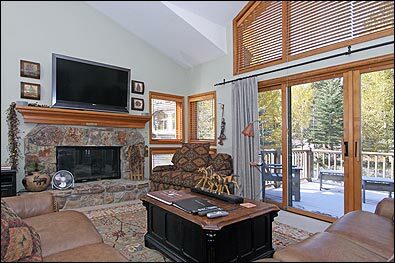 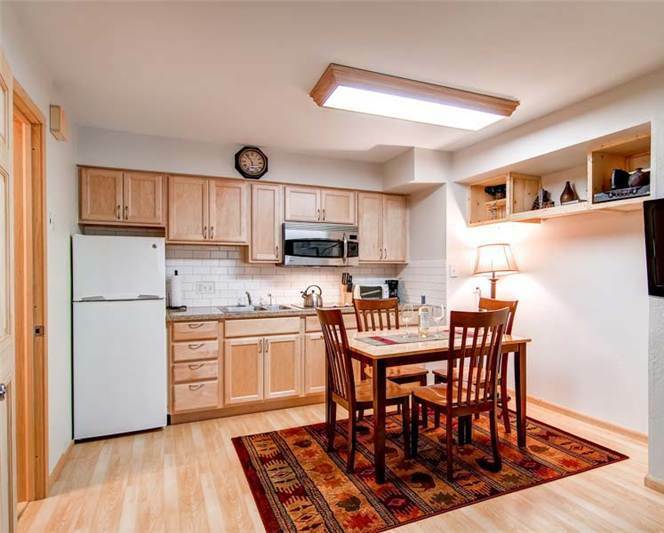 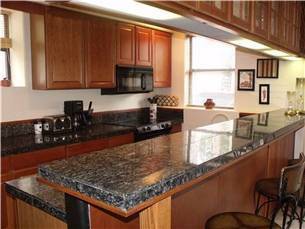 Enjoy the mountains, lakes, streams and great hiking trails, all within easy walking distance. 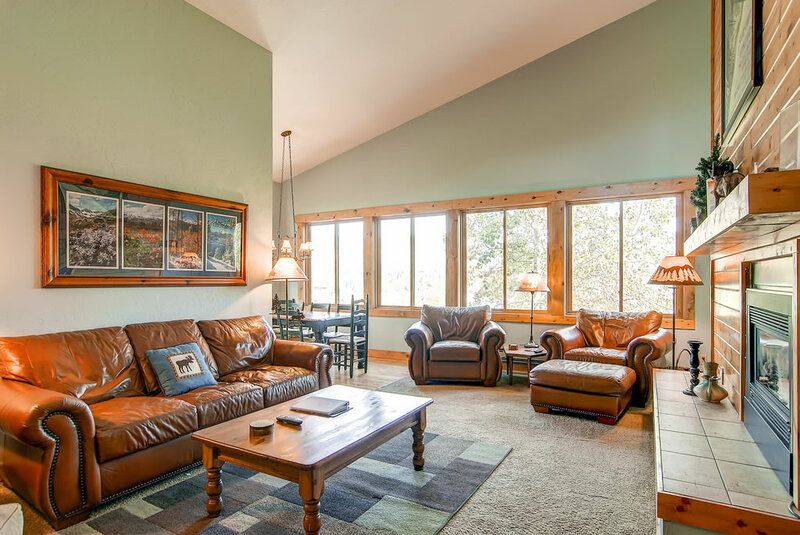 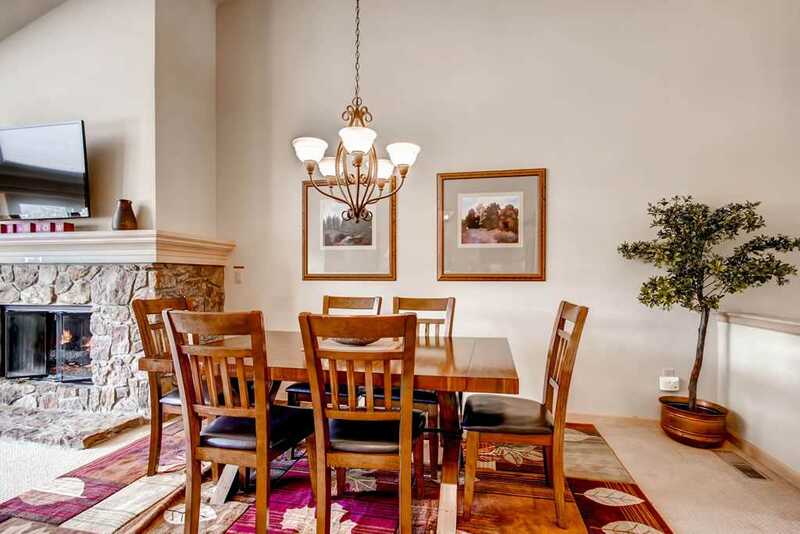 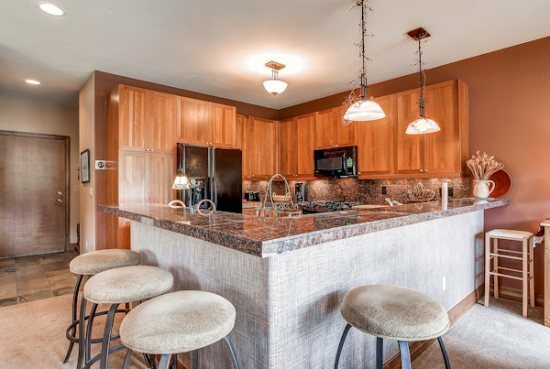 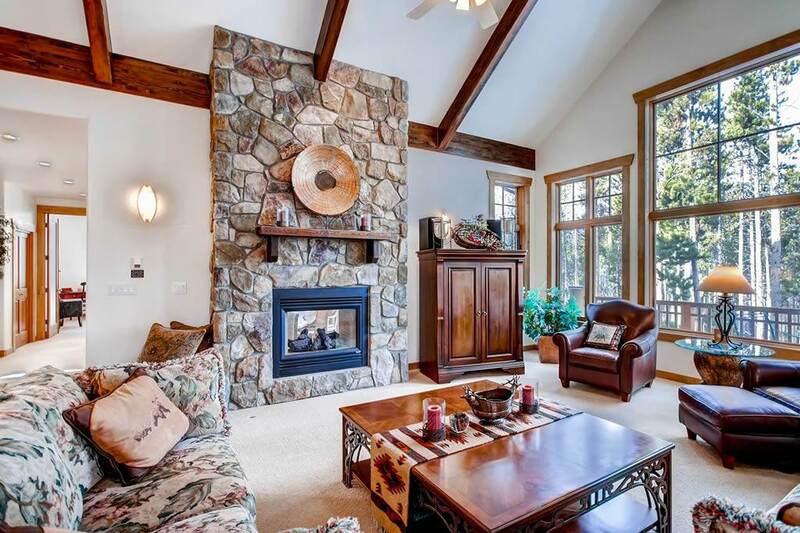 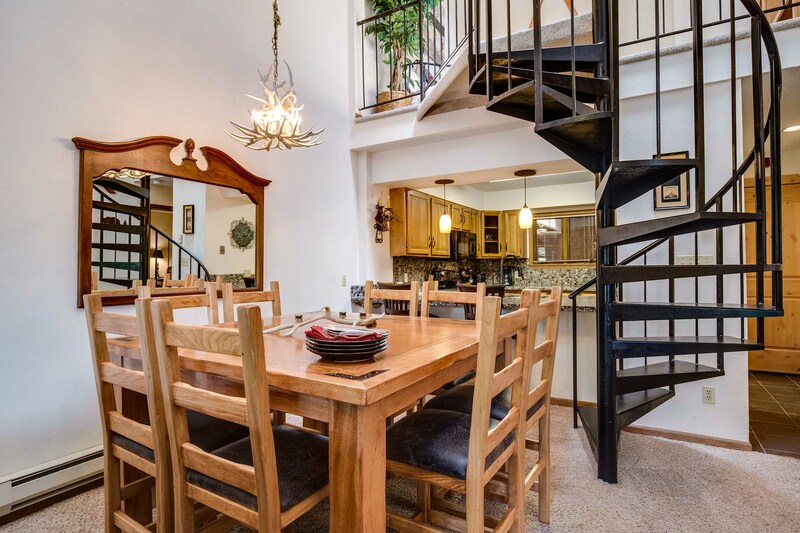 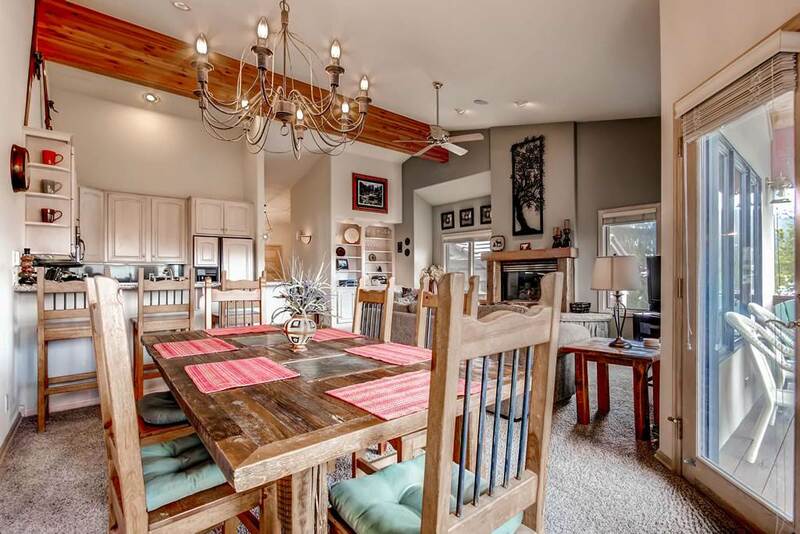 The home’s open floor plan and vaulted ceilings create a spacious, comfortable feel, and the layout is perfect for entertaining and family gatherings. 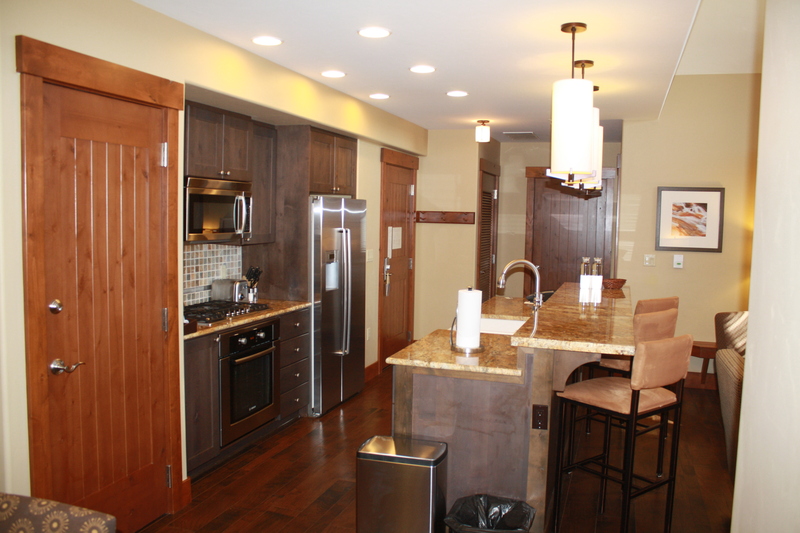 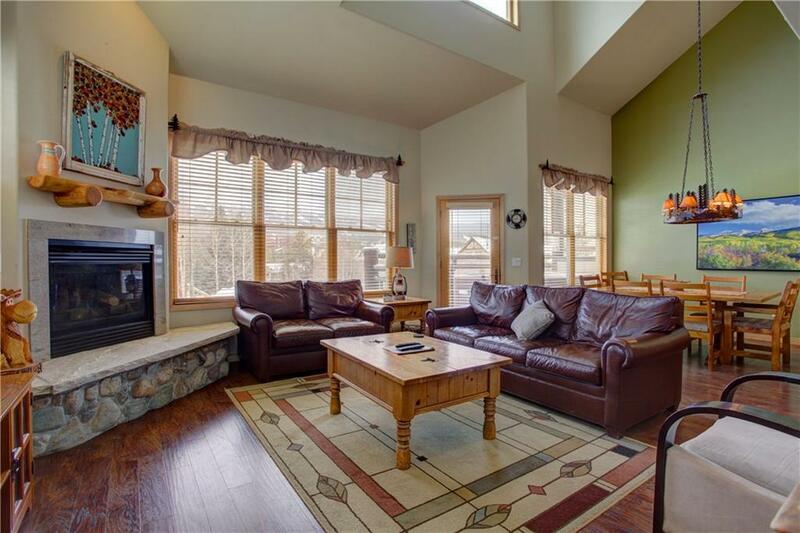 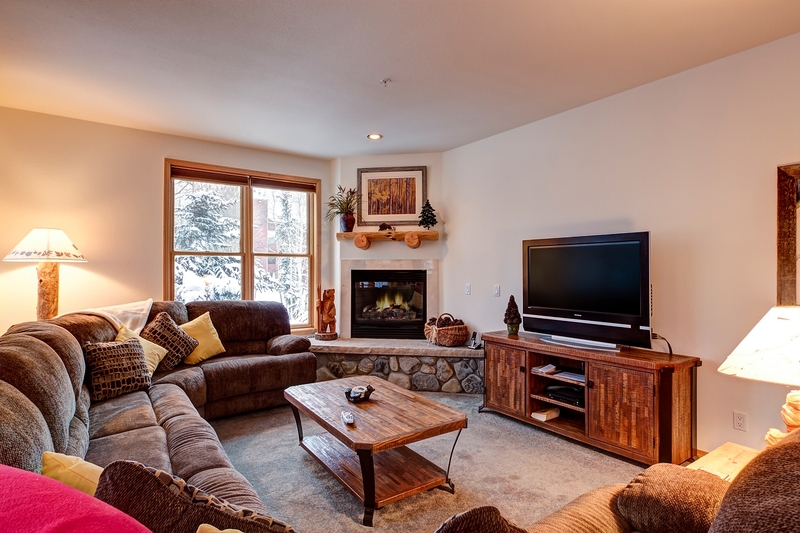 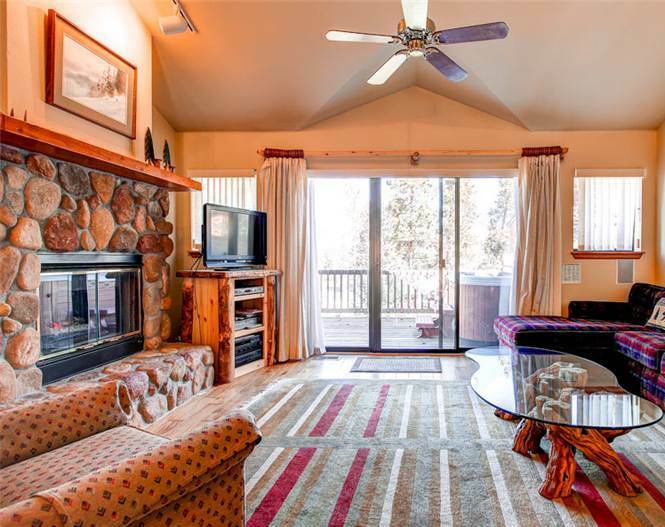 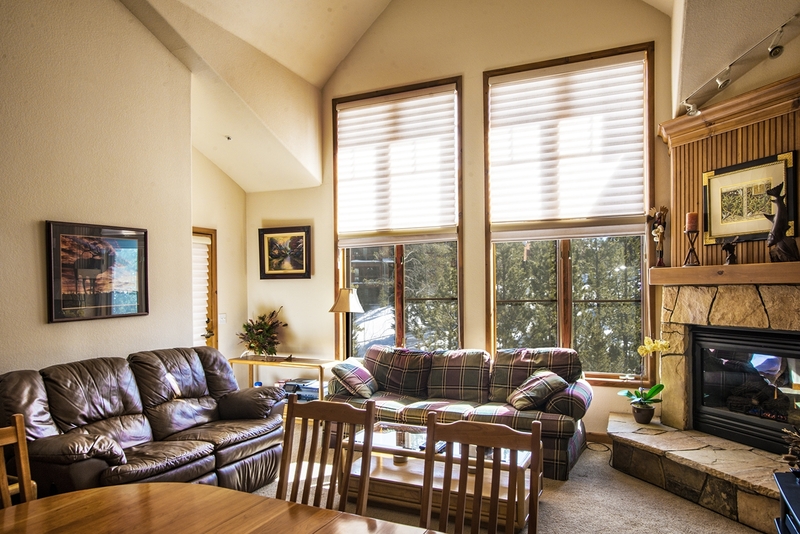 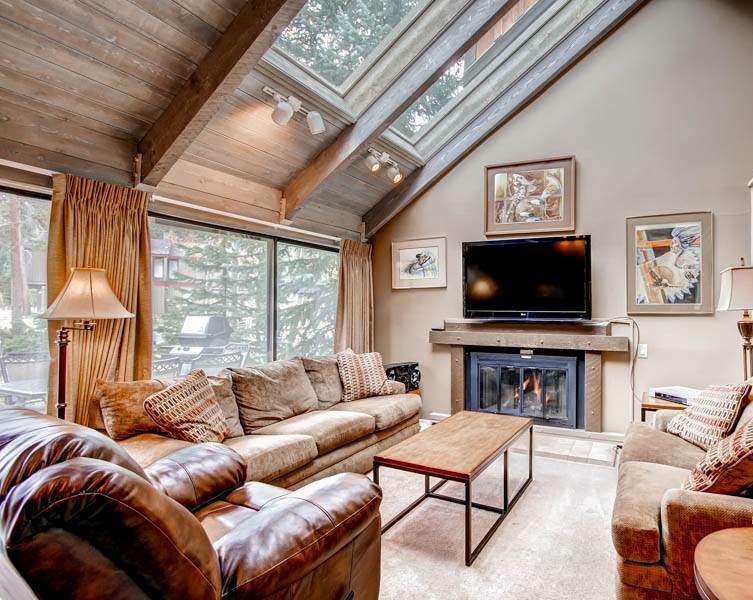 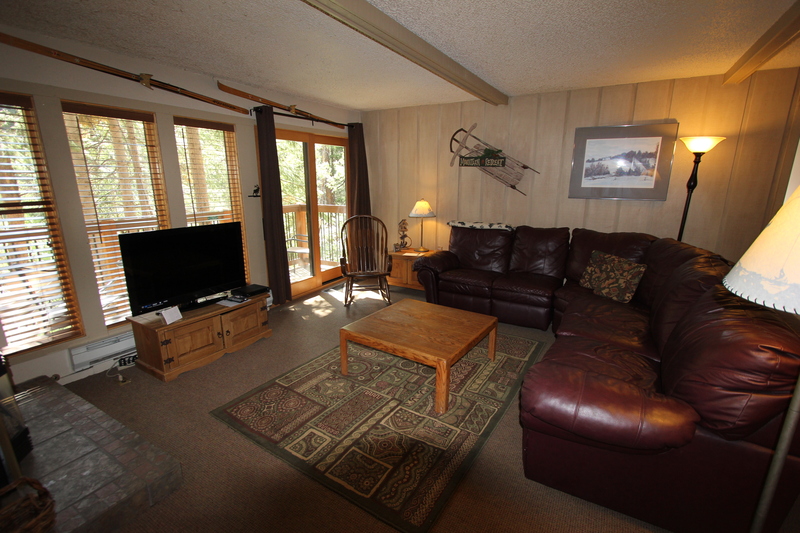 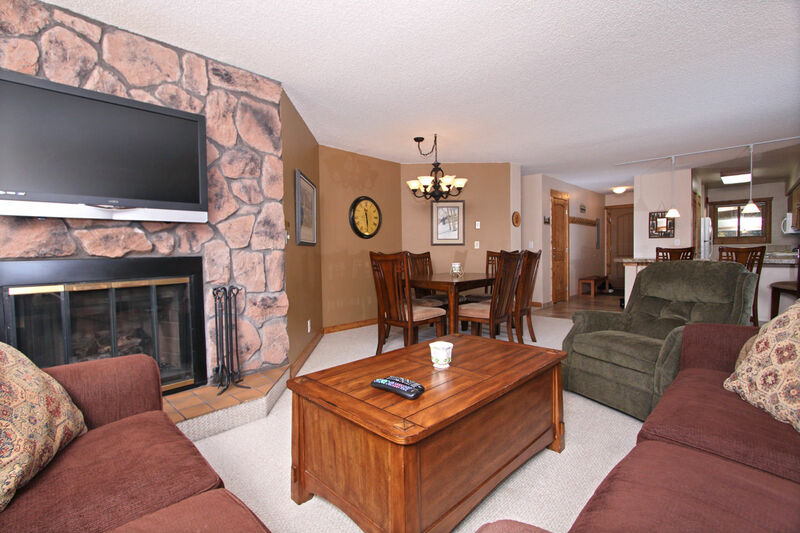 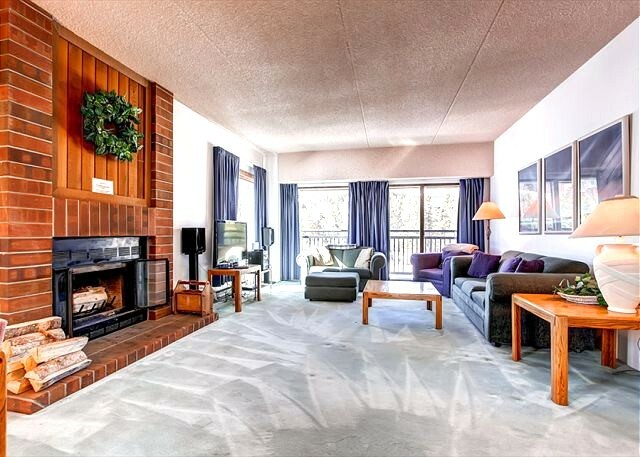 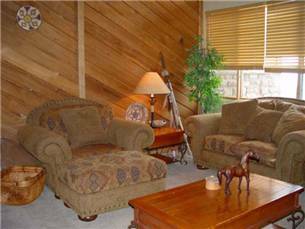 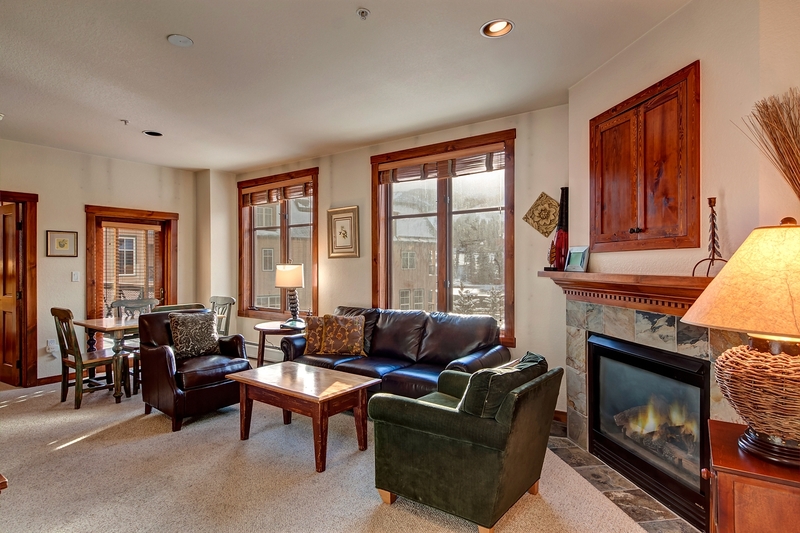 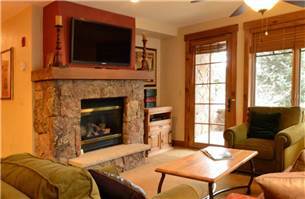 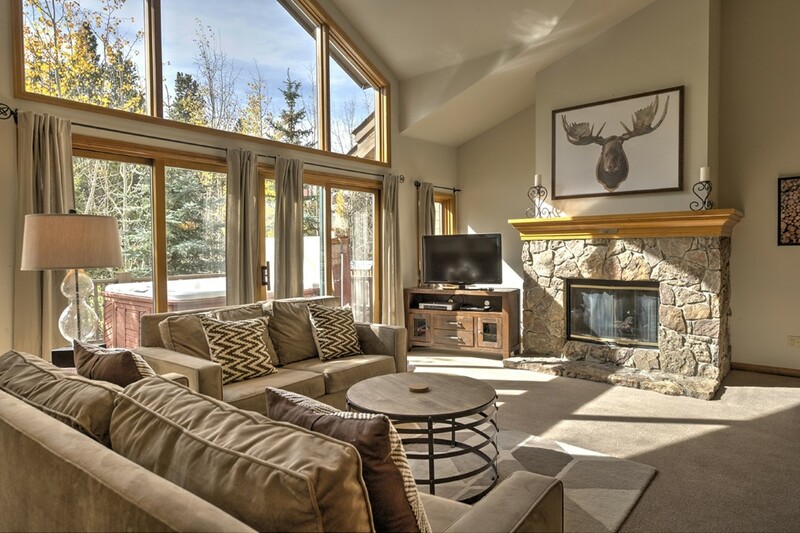 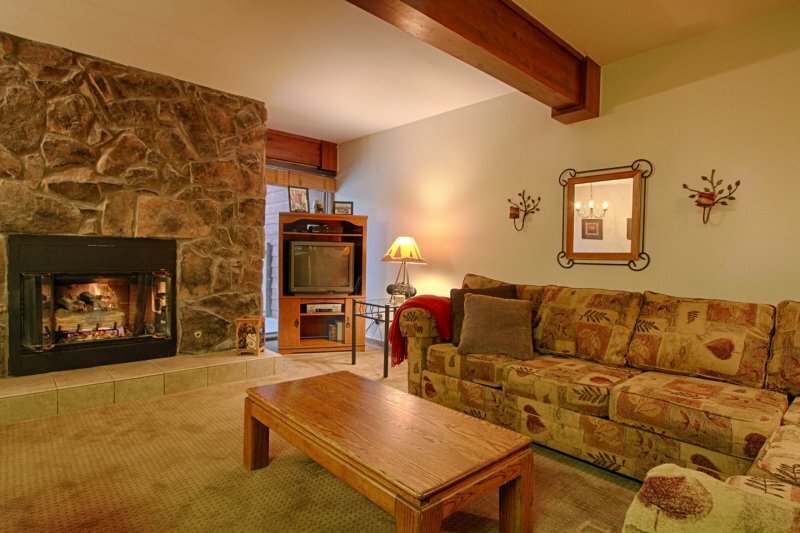 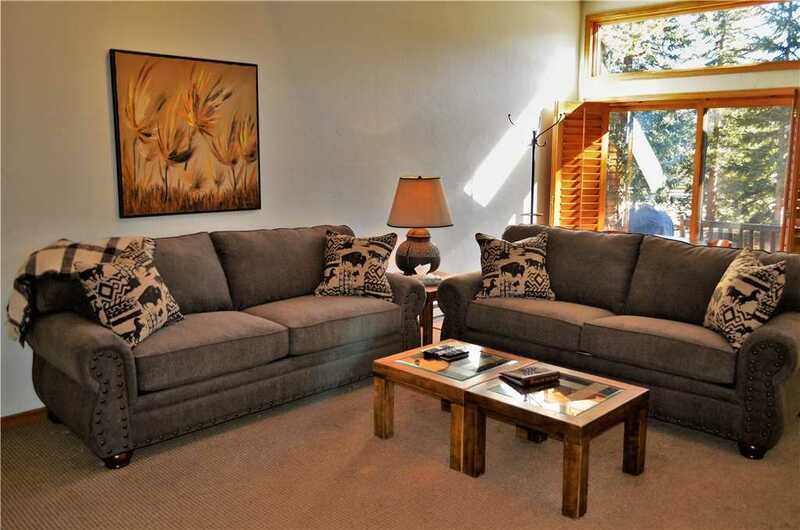 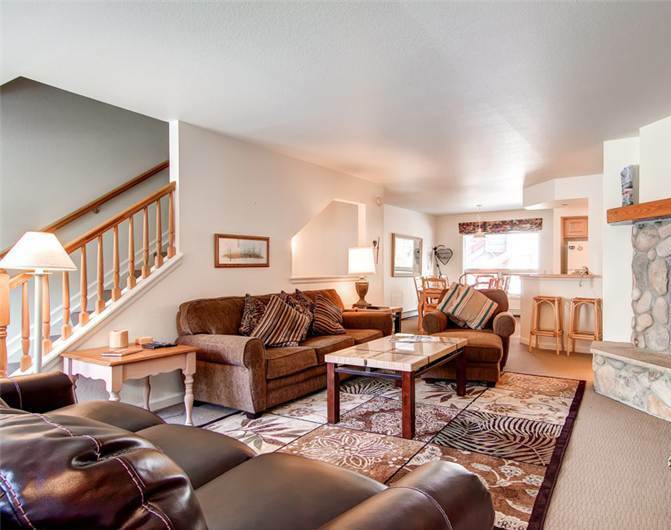 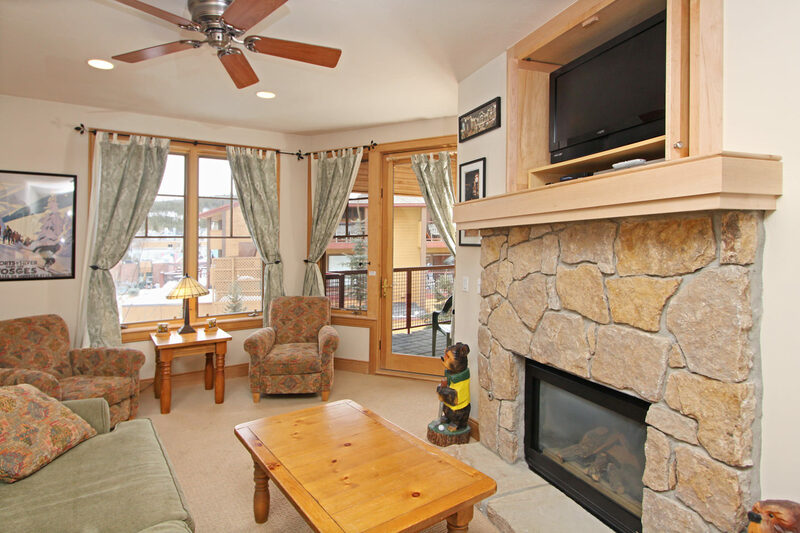 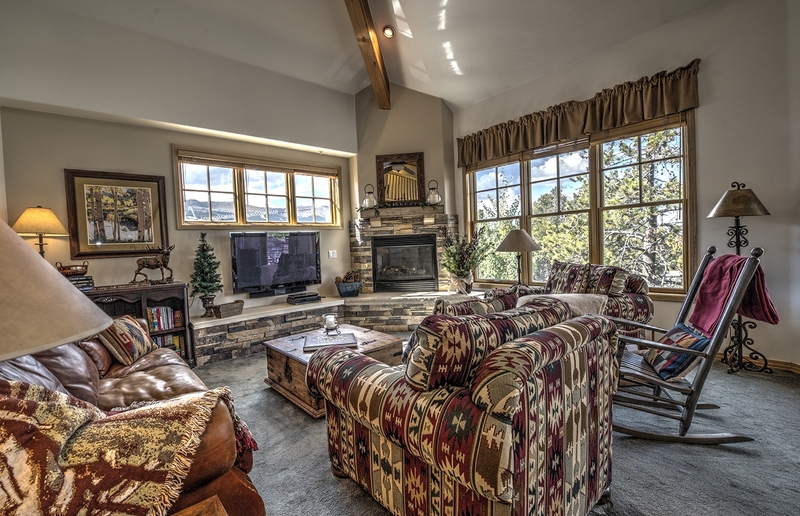 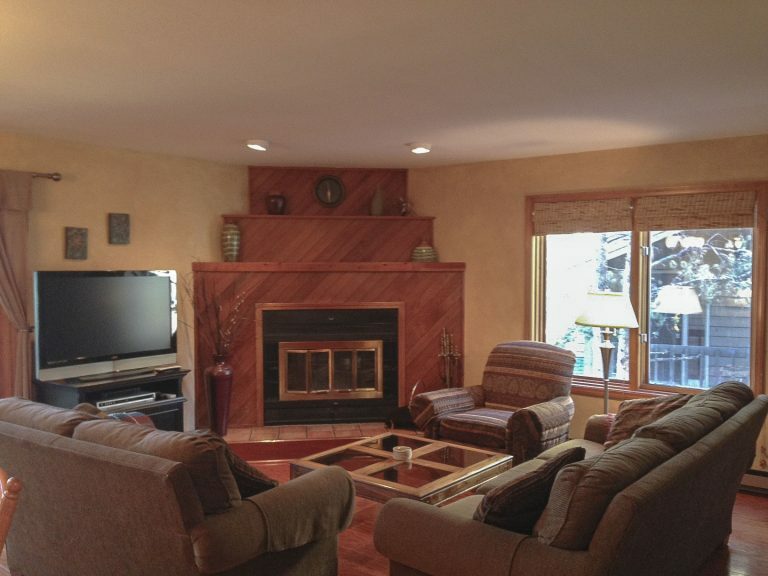 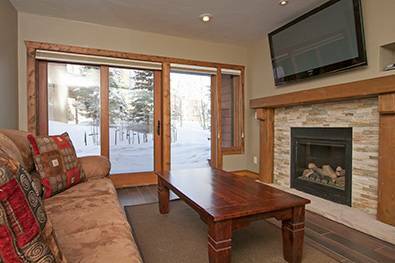 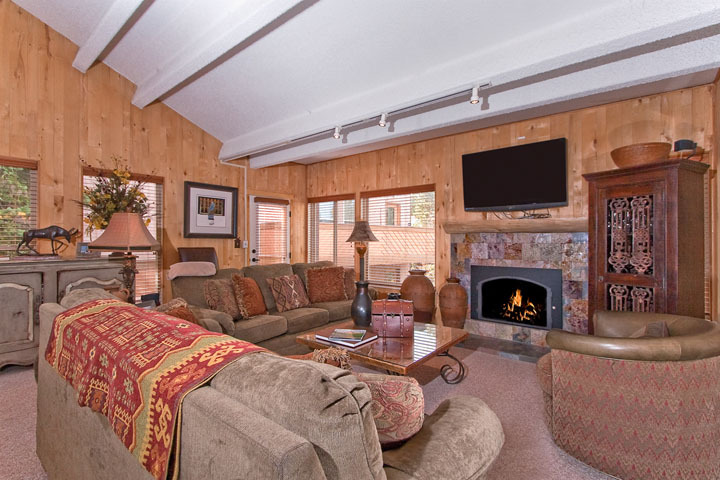 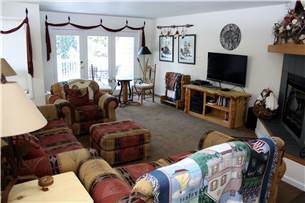 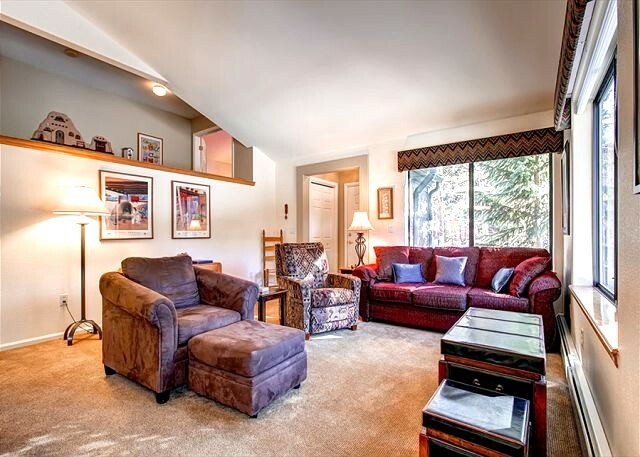 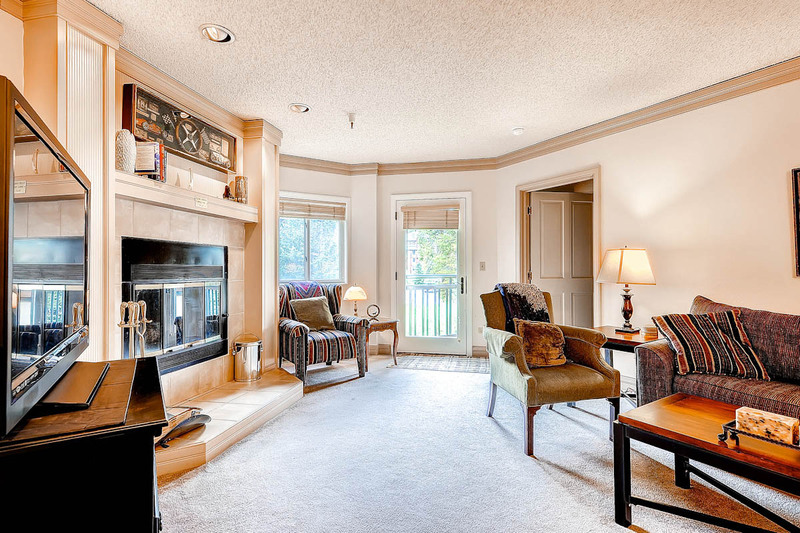 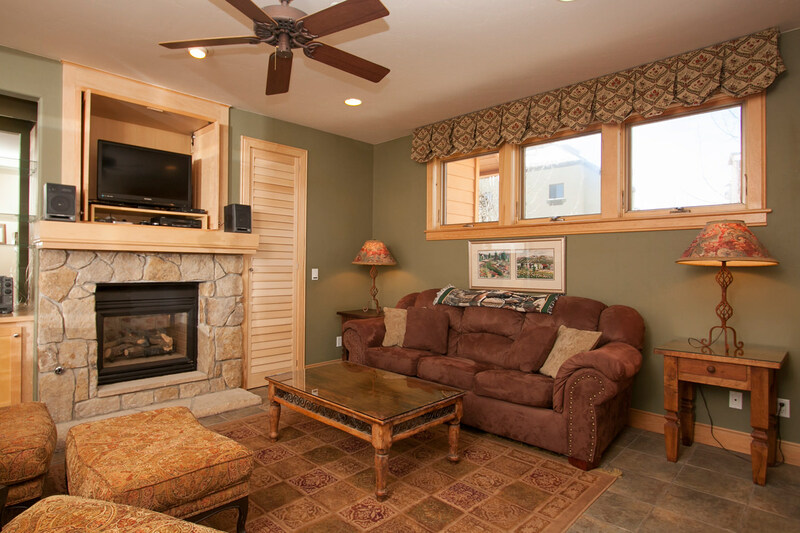 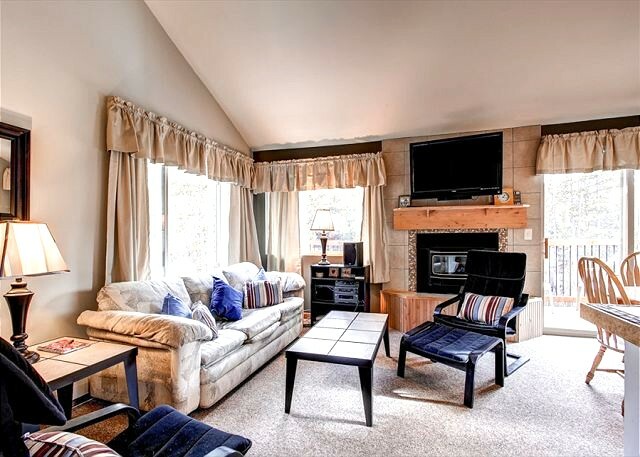 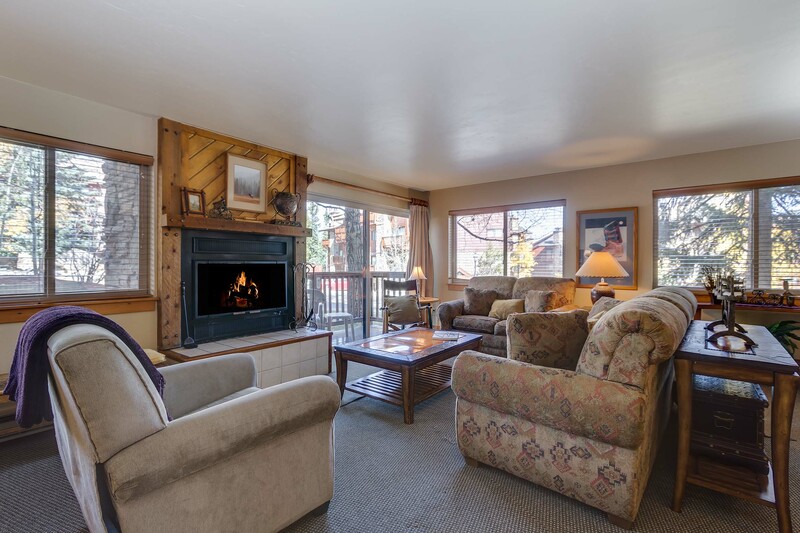 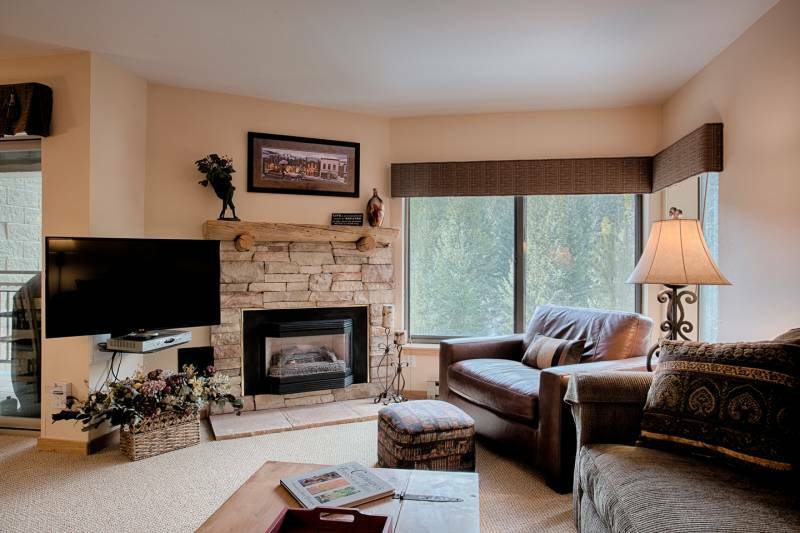 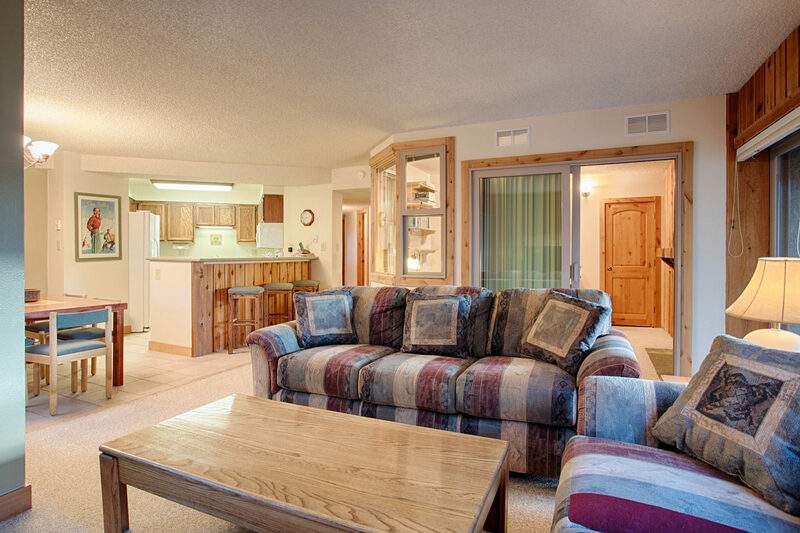 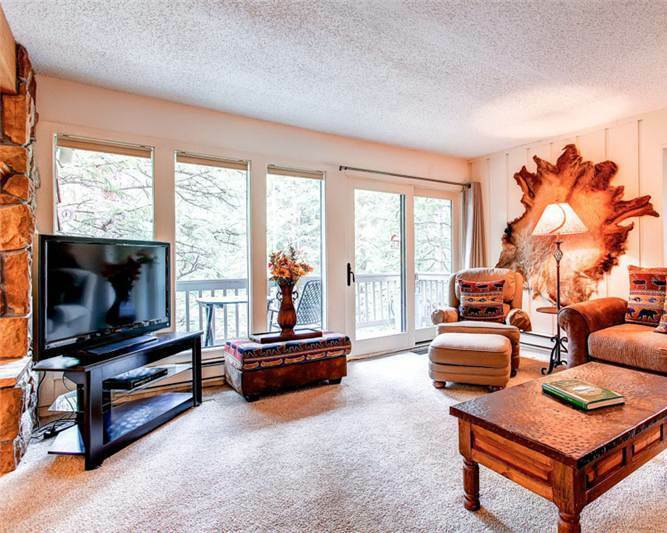 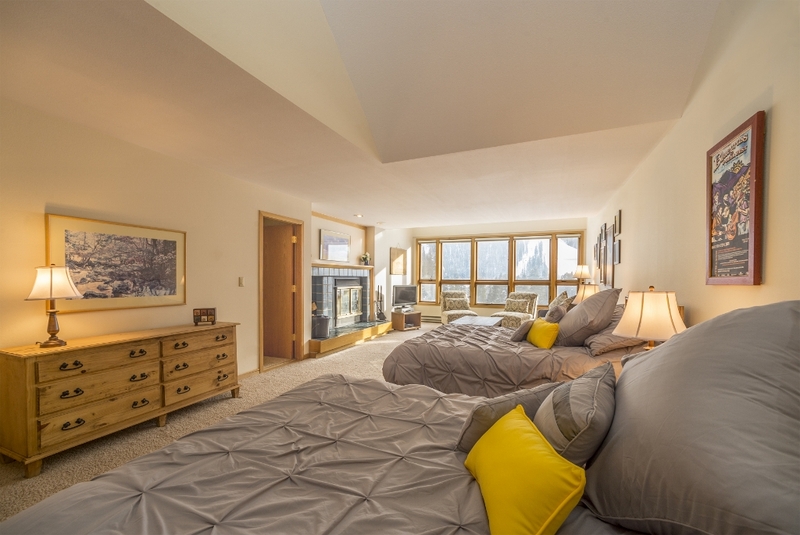 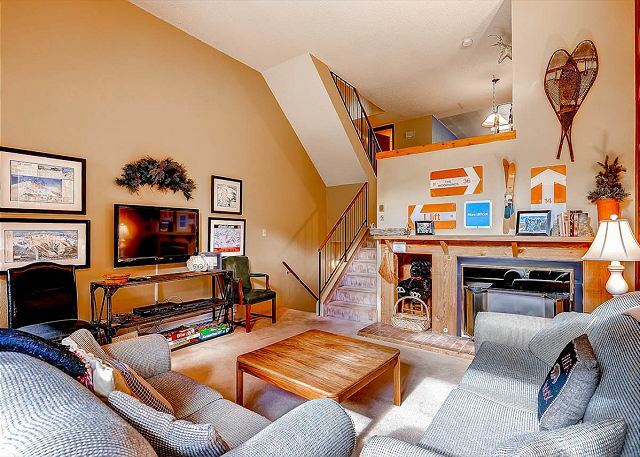 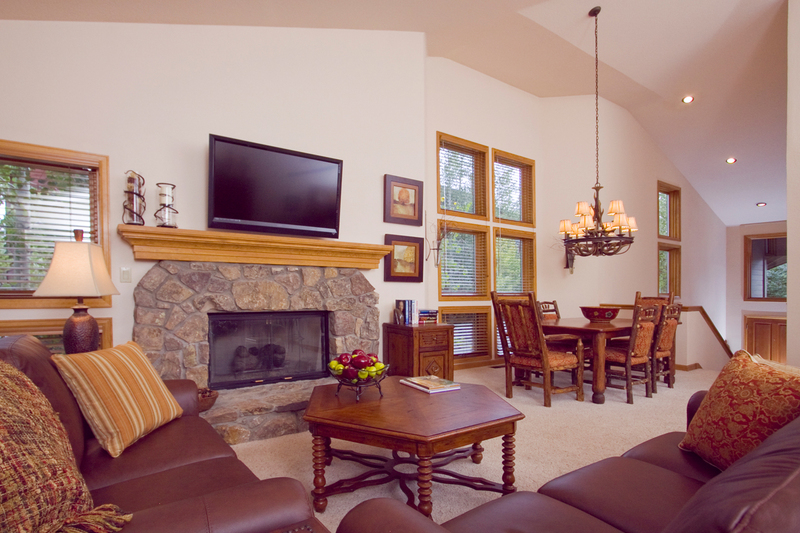 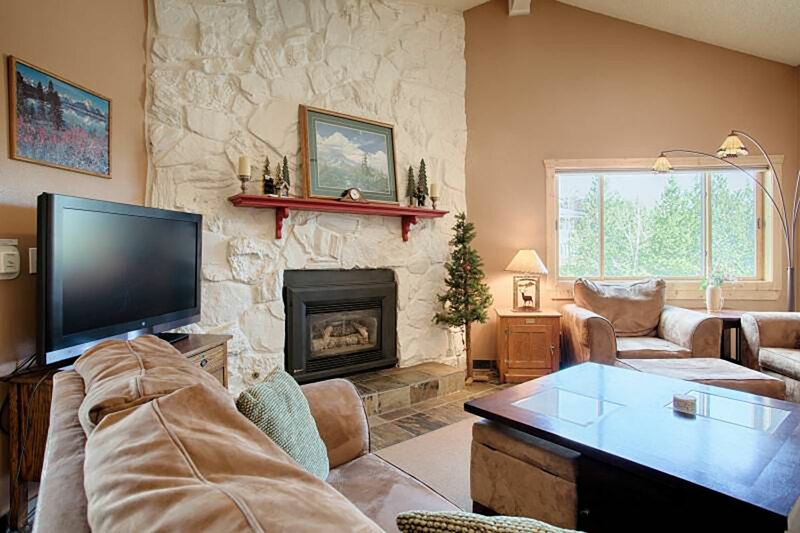 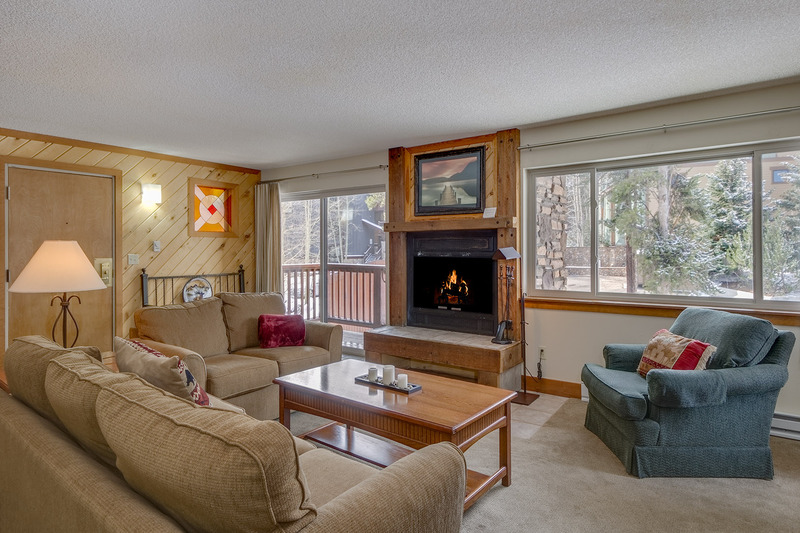 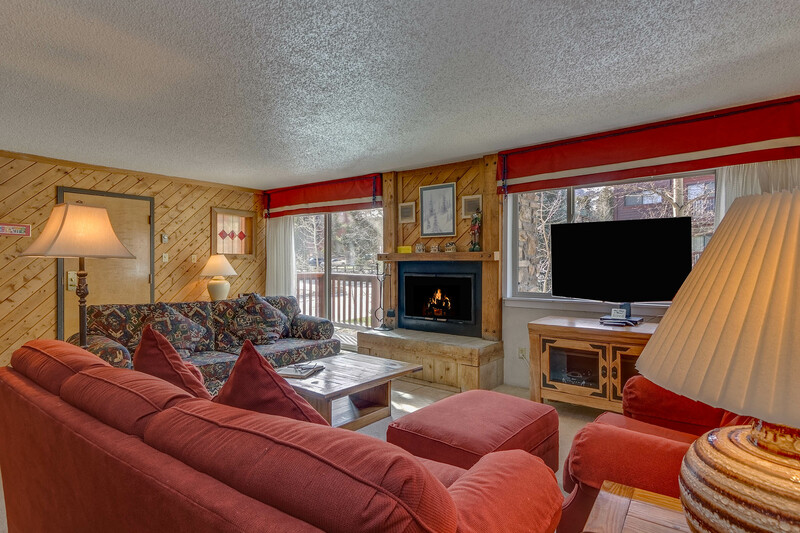 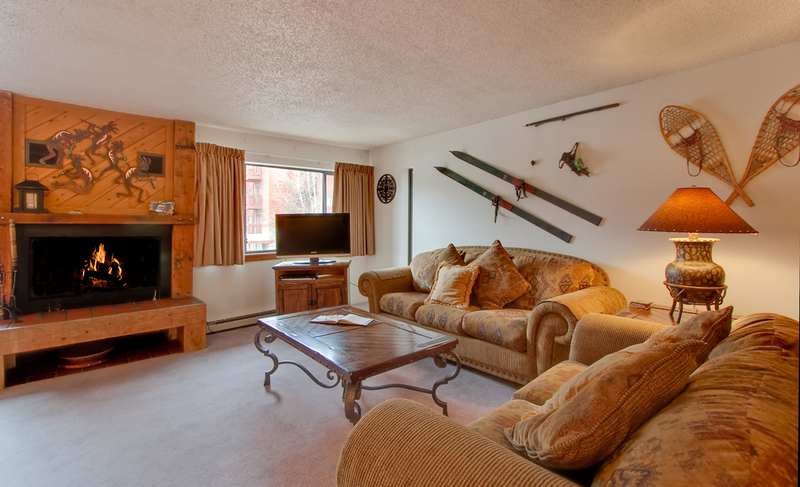 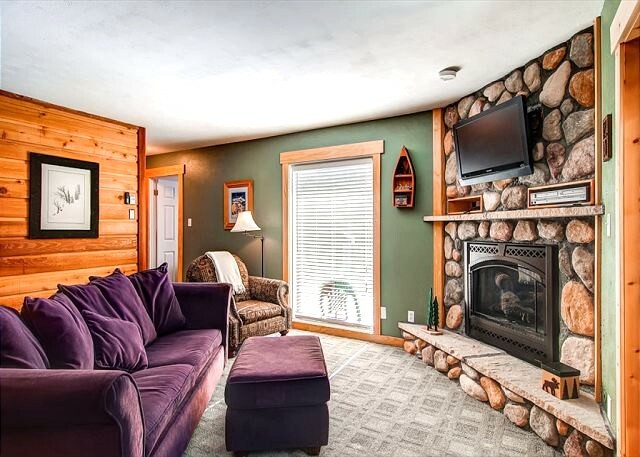 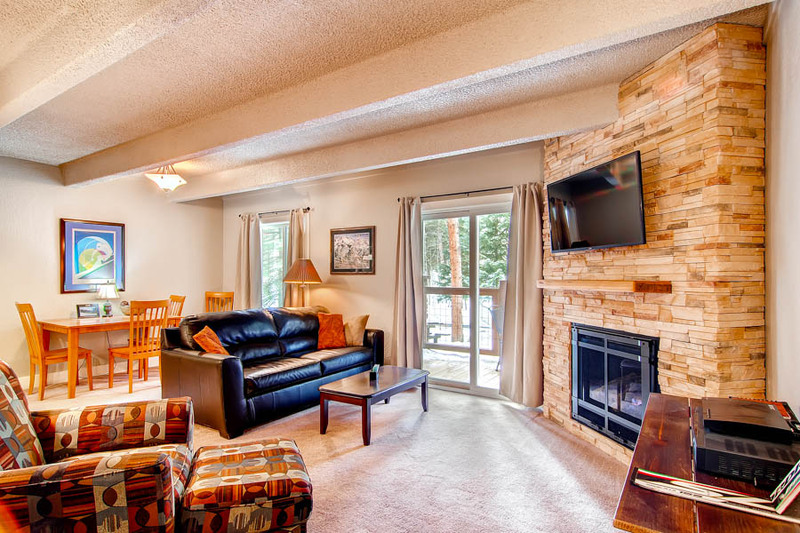 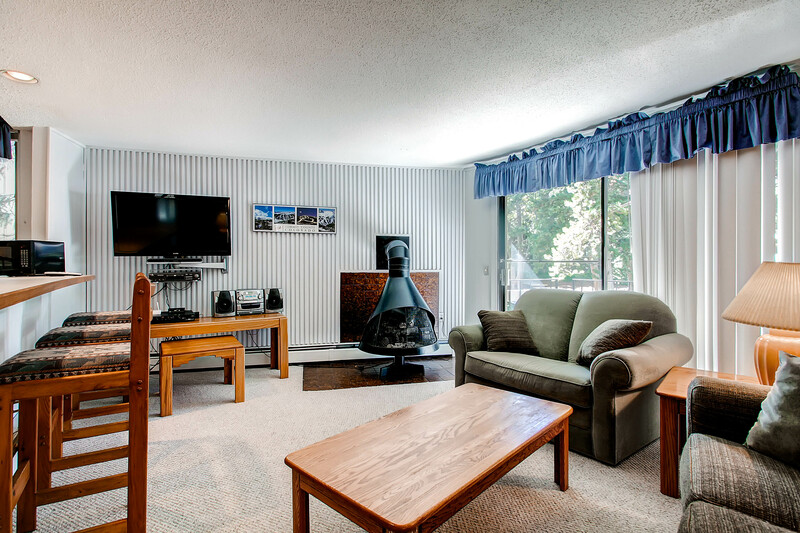 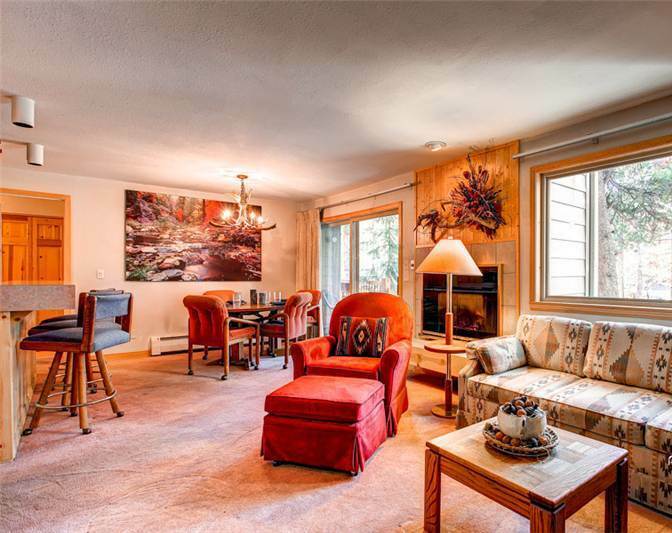 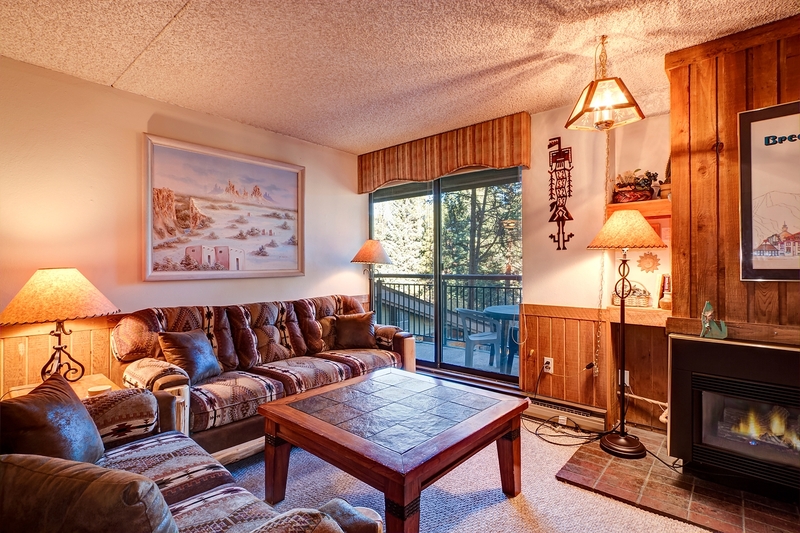 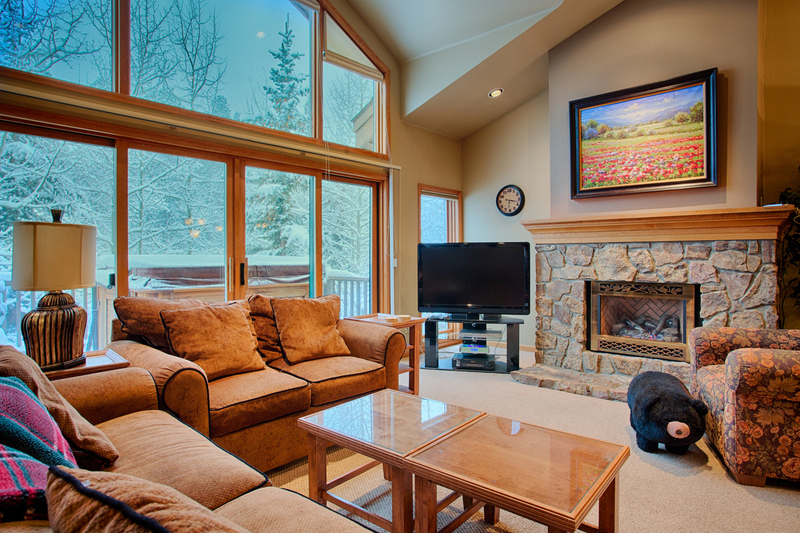 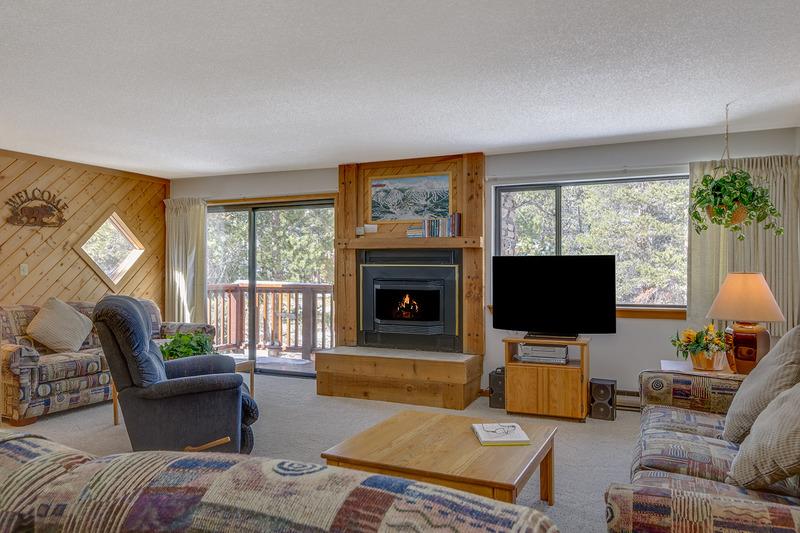 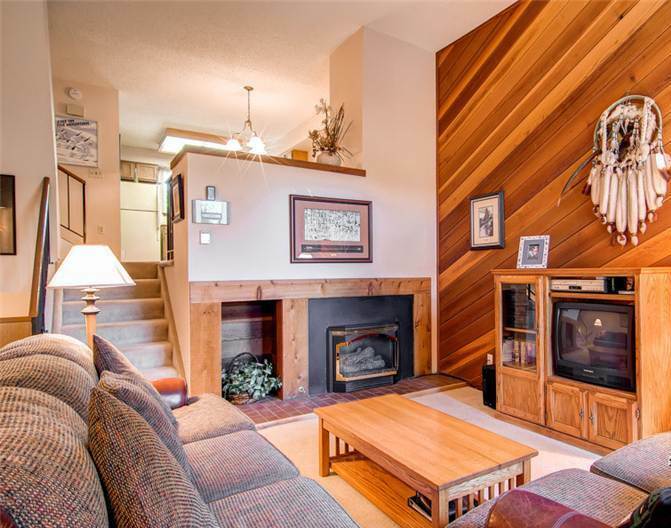 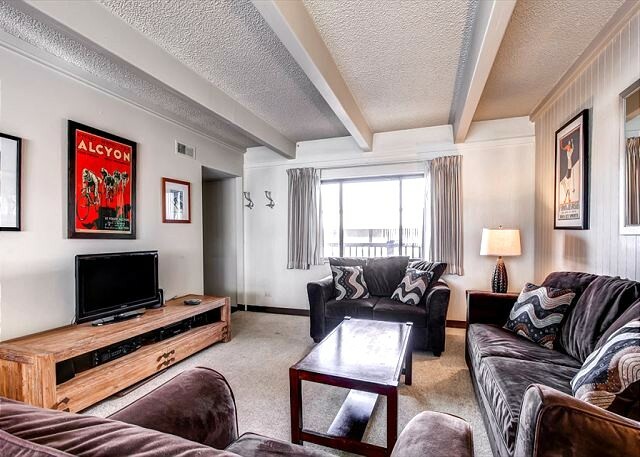 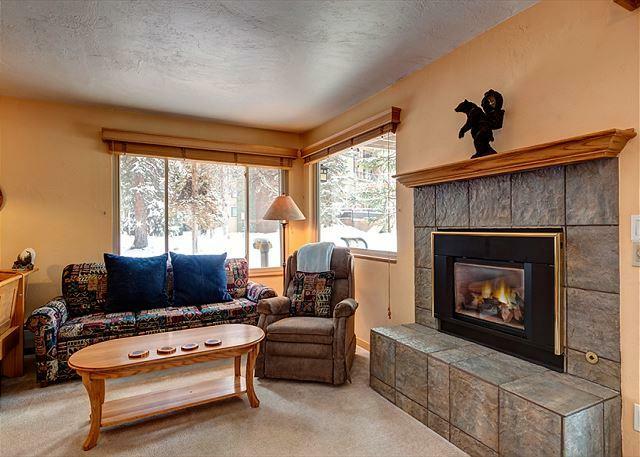 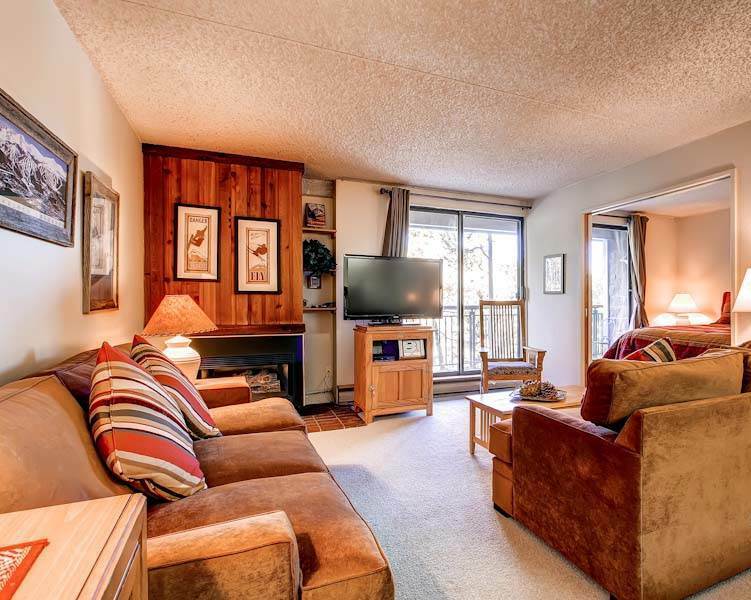 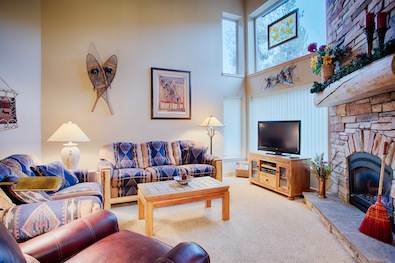 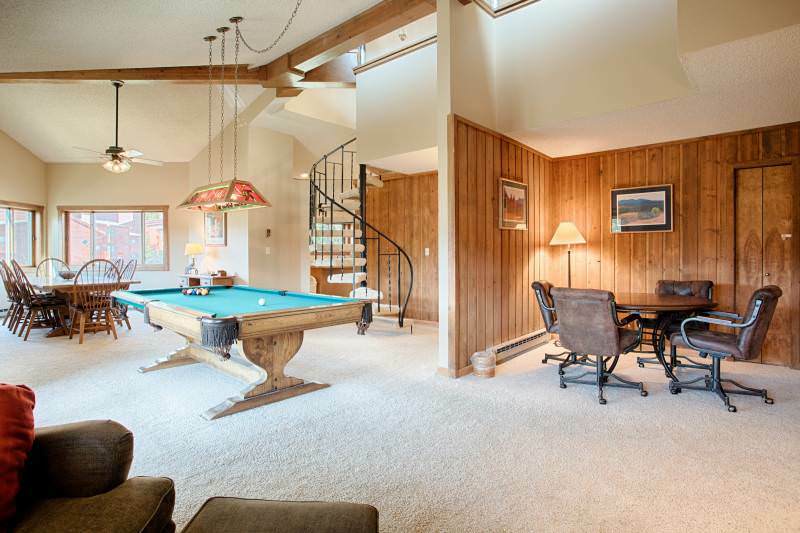 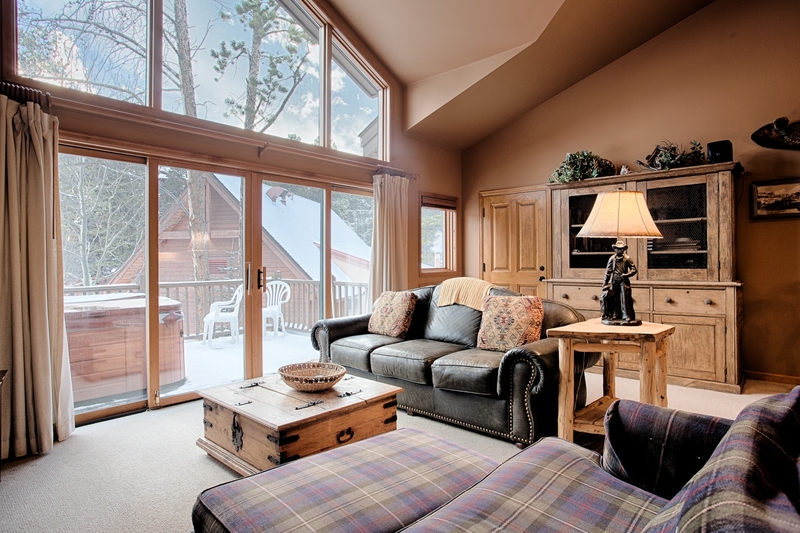 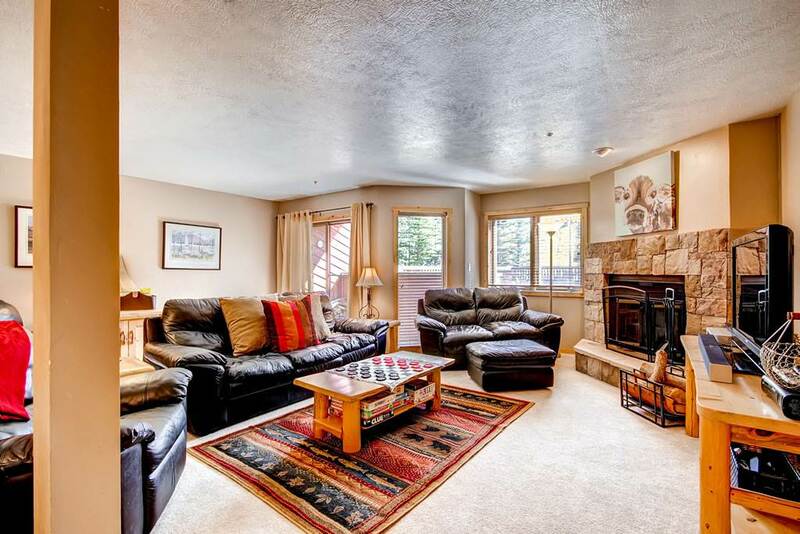 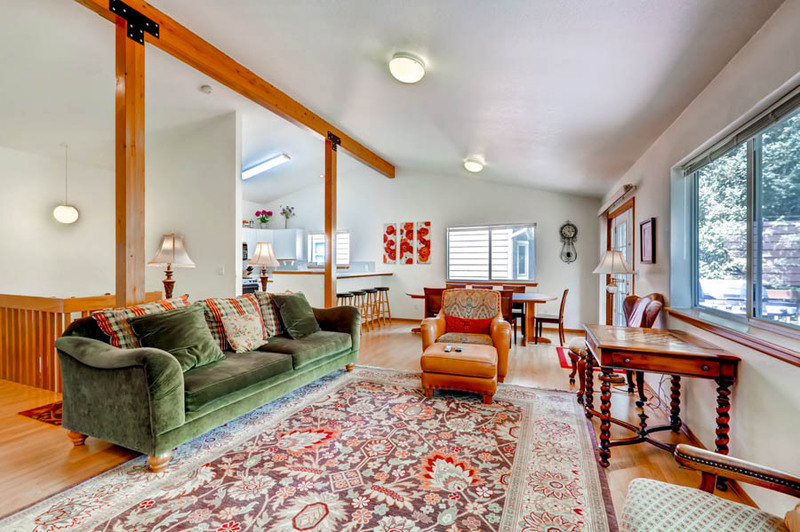 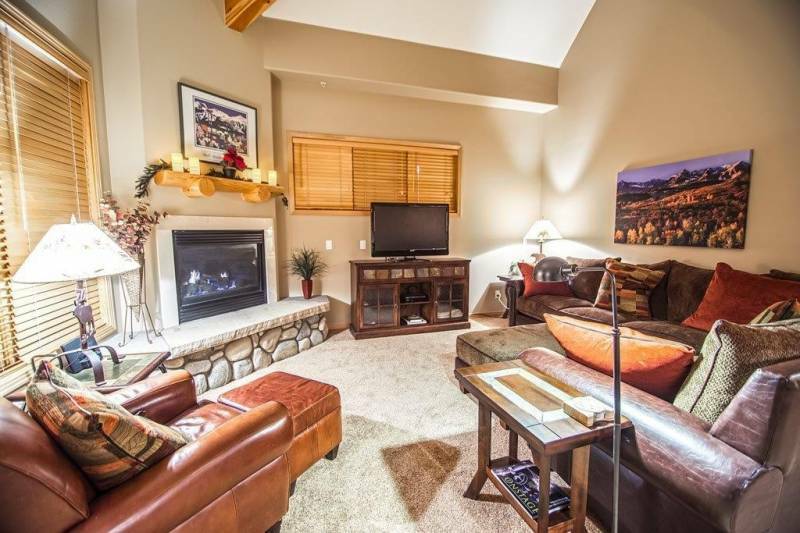 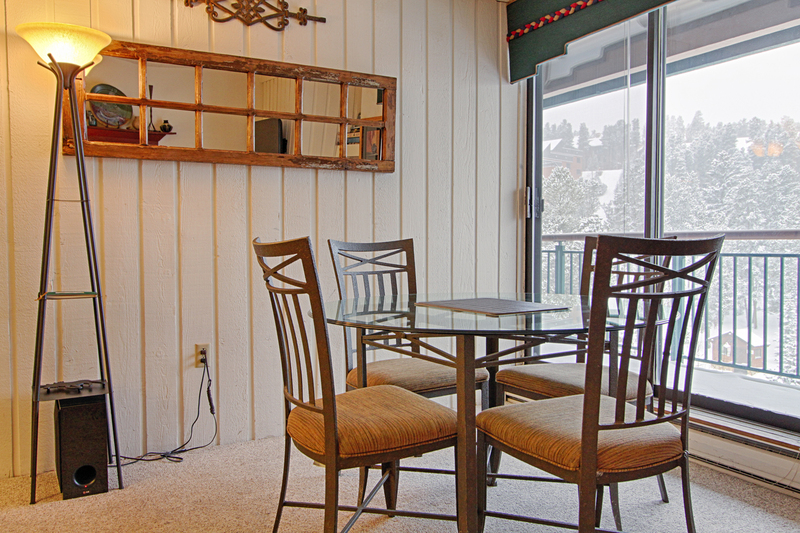 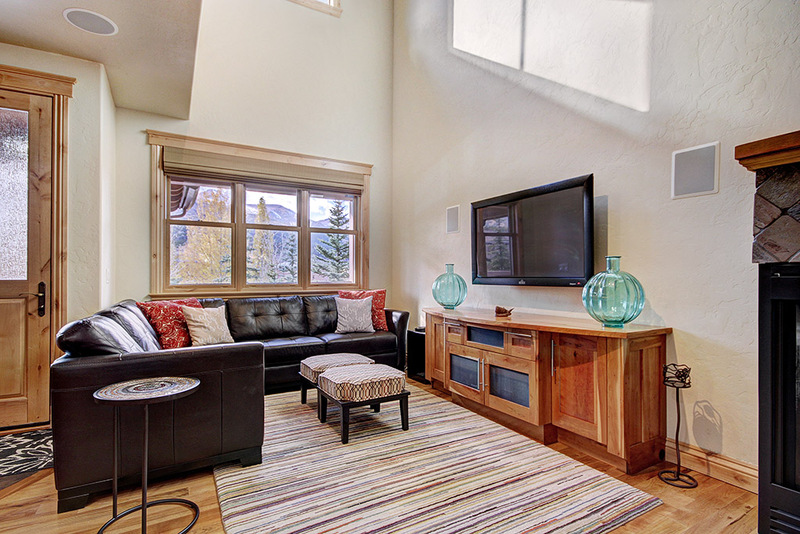 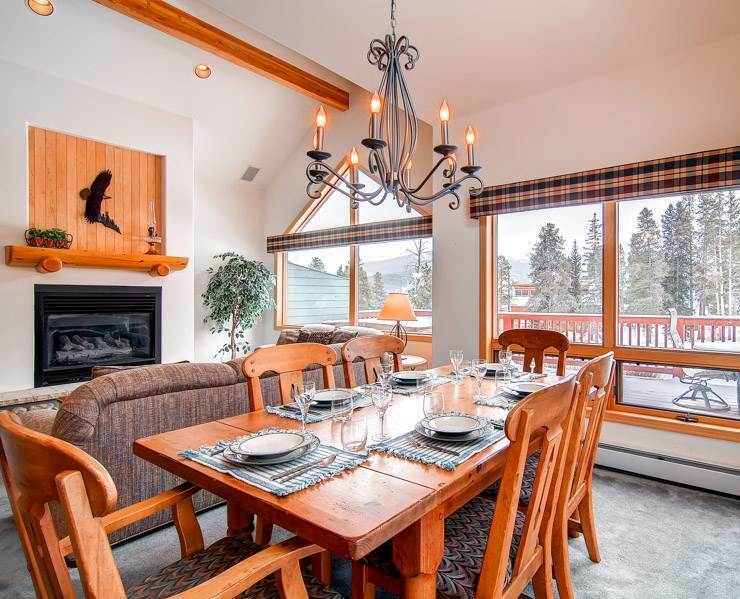 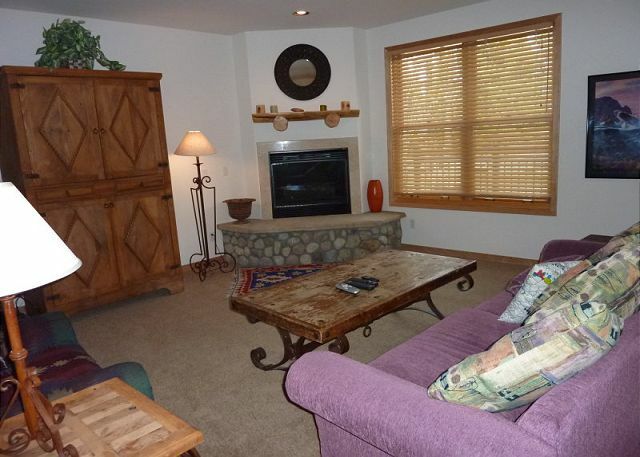 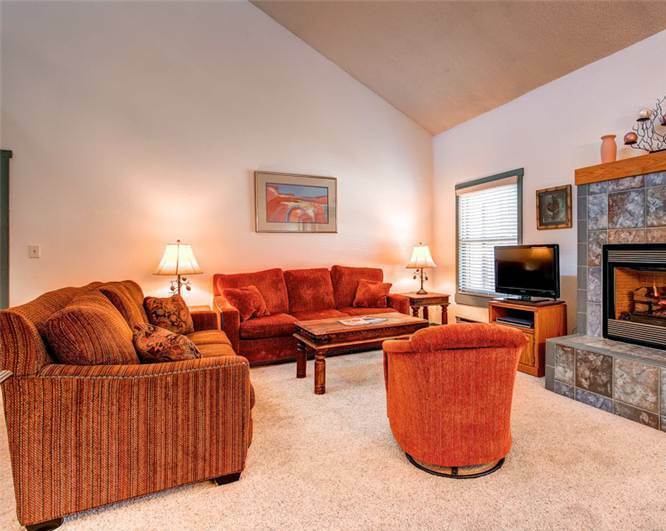 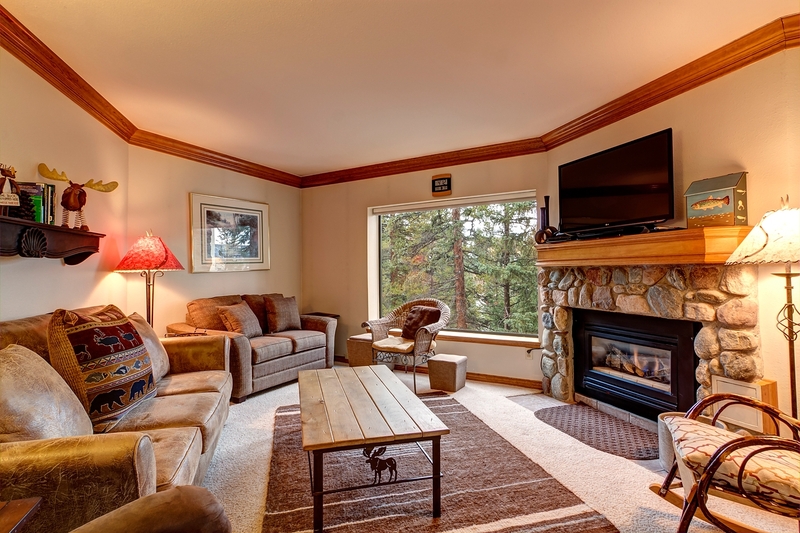 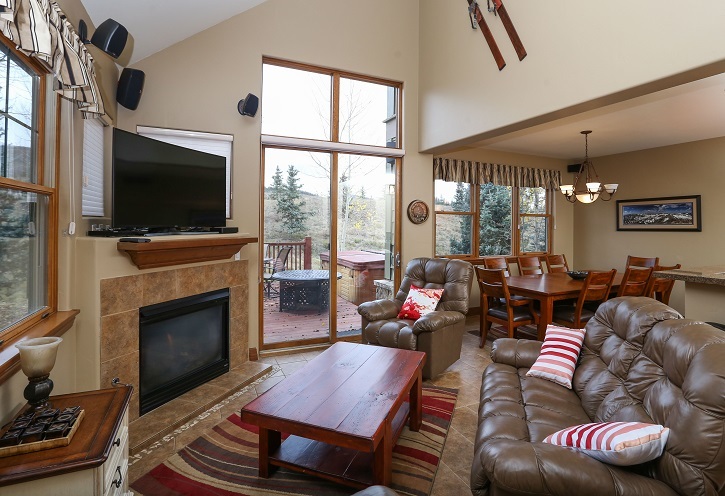 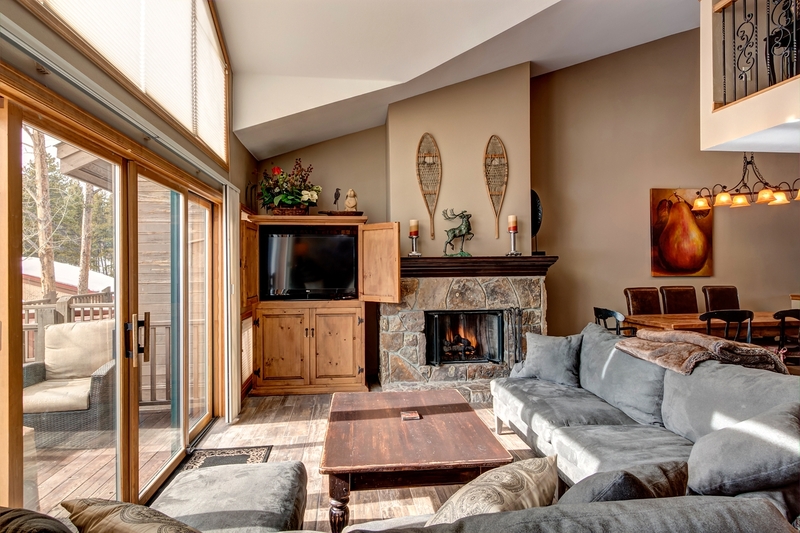 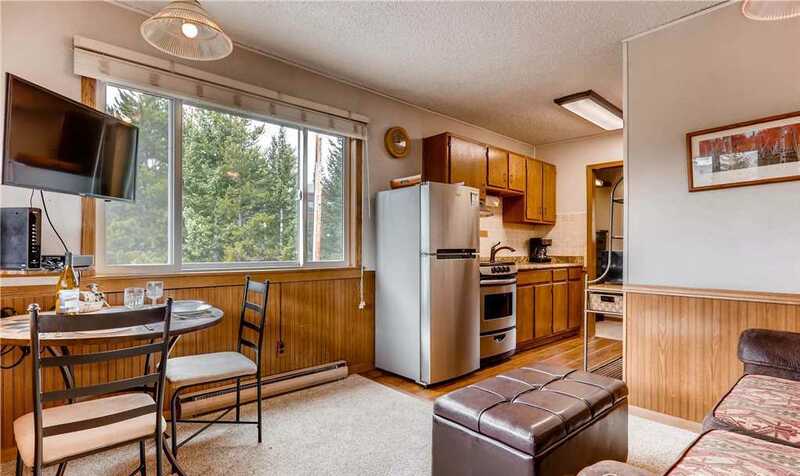 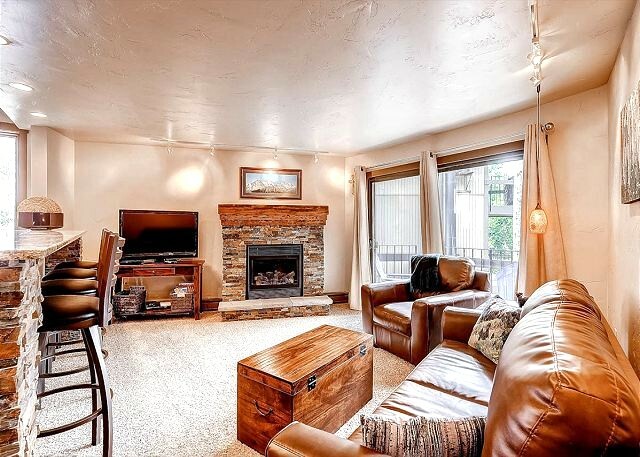 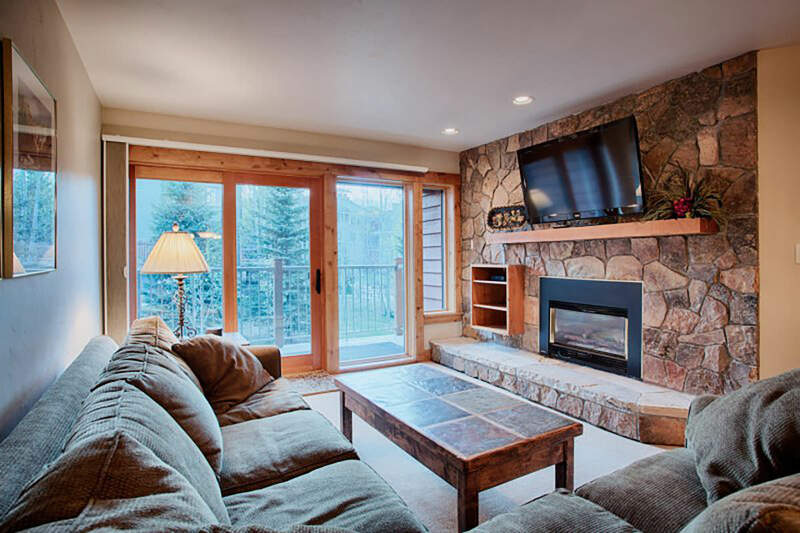 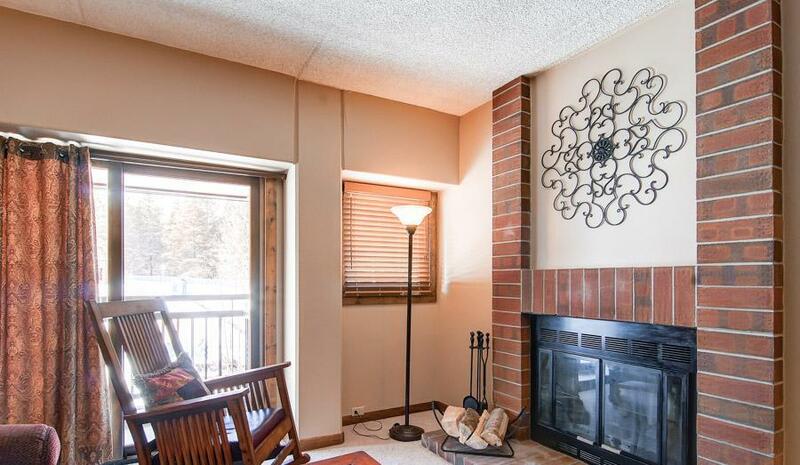 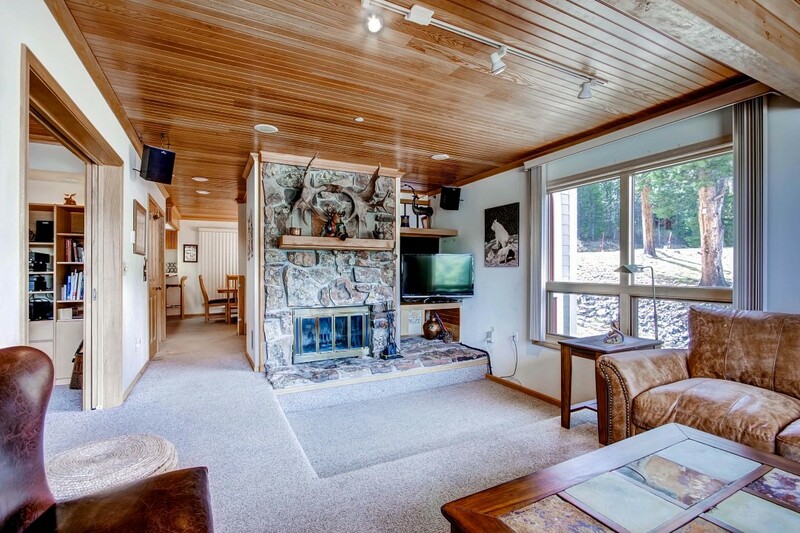 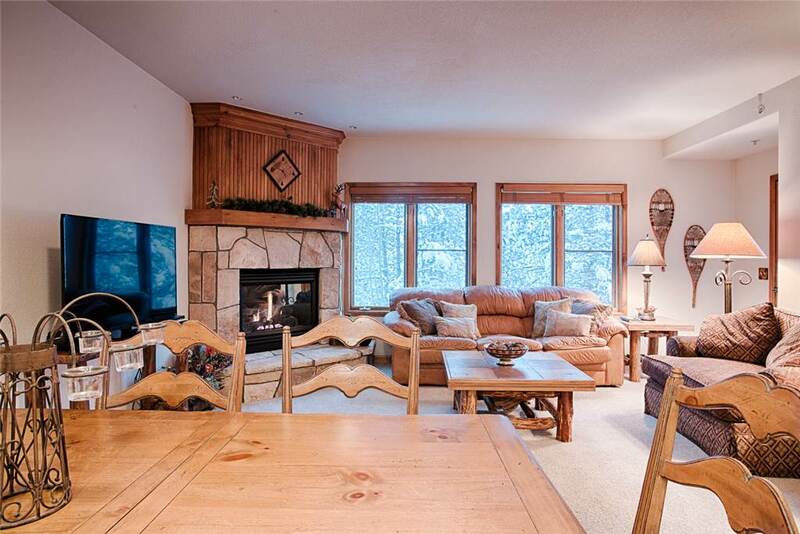 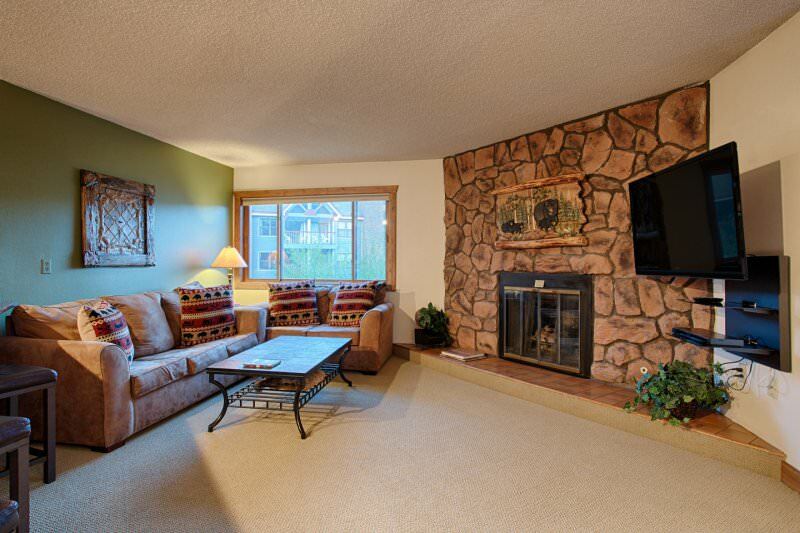 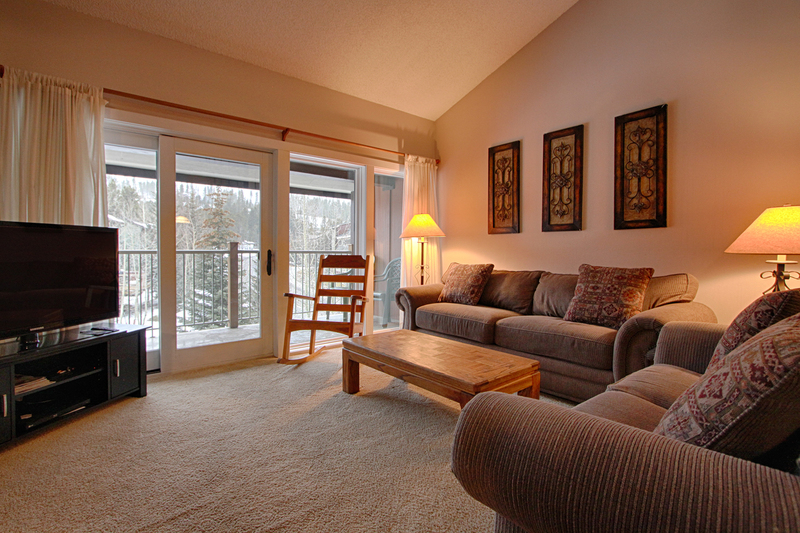 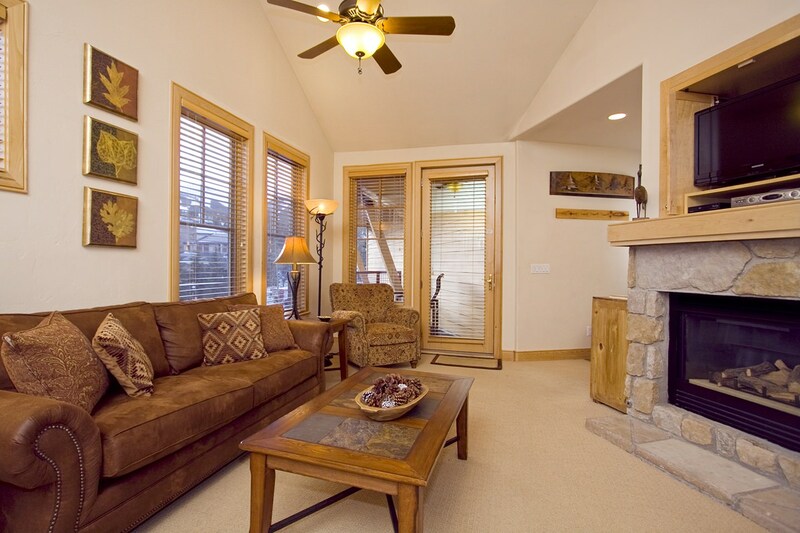 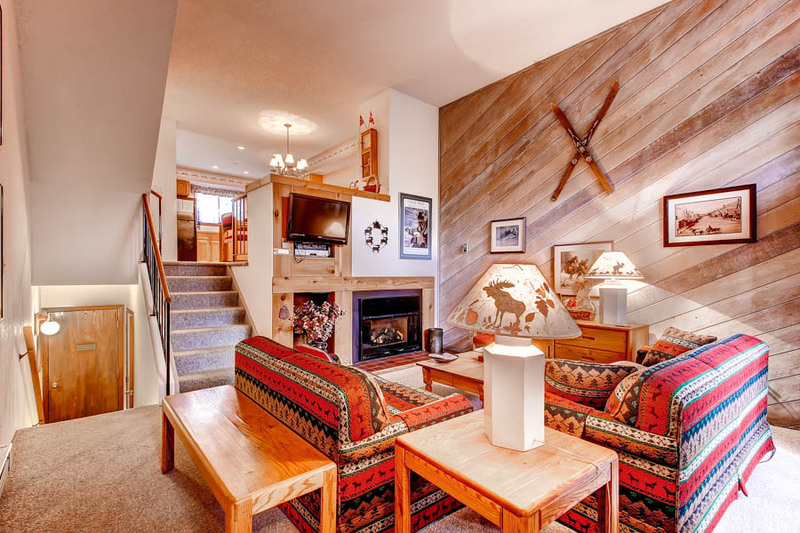 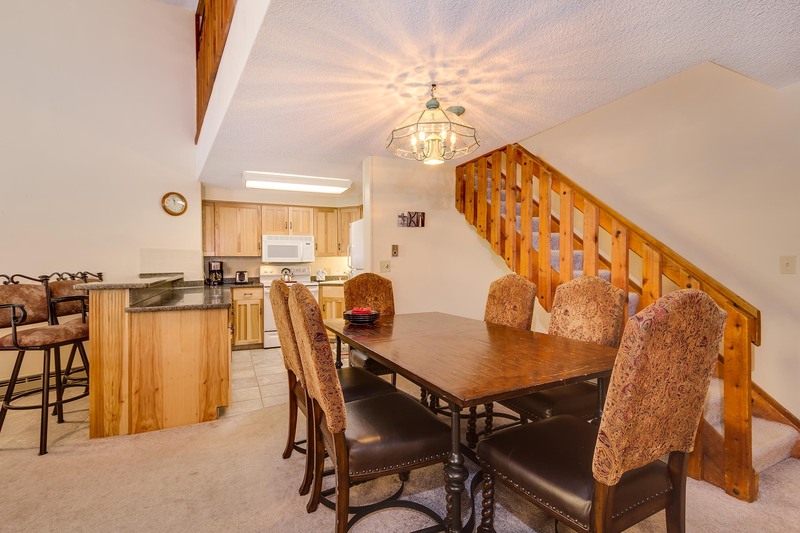 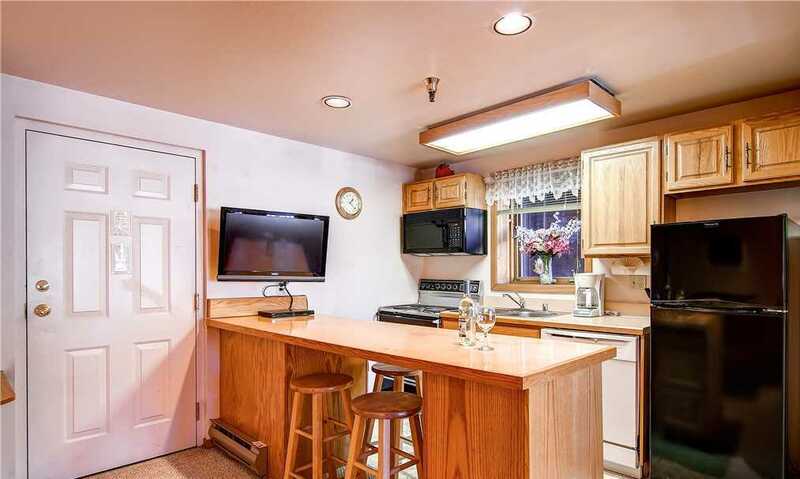 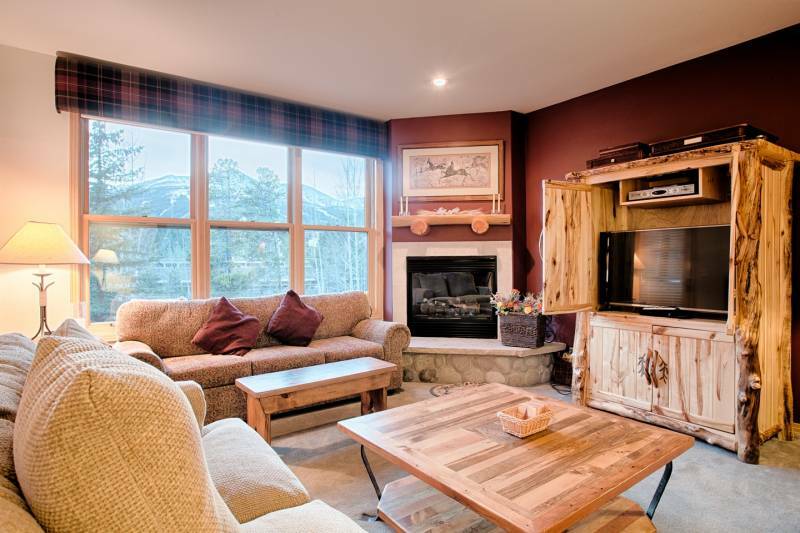 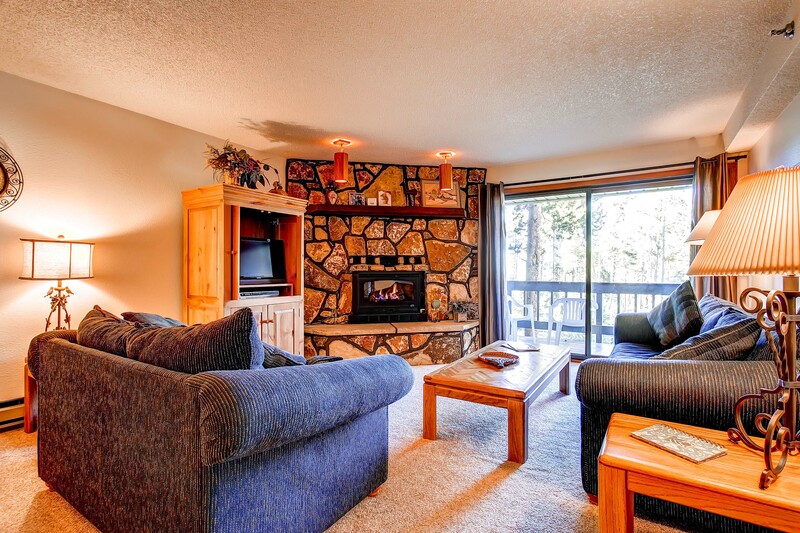 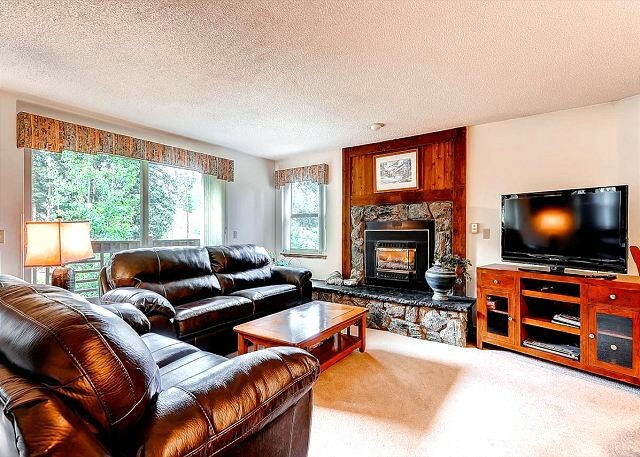 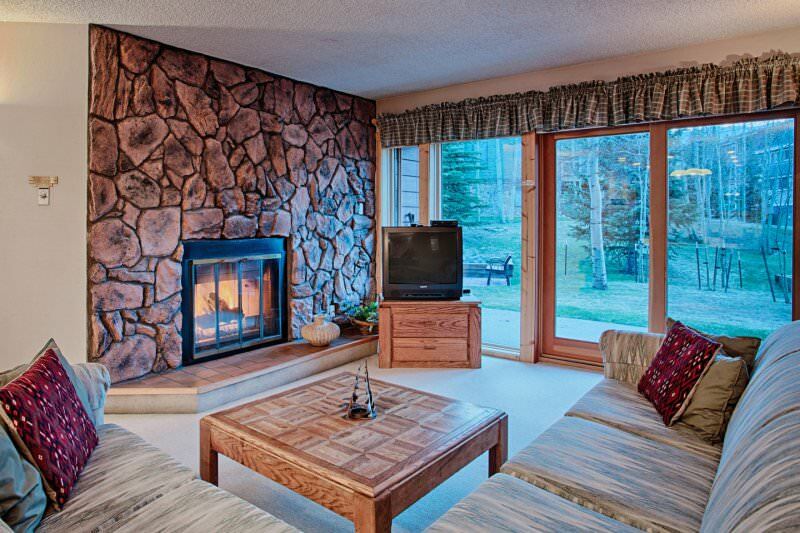 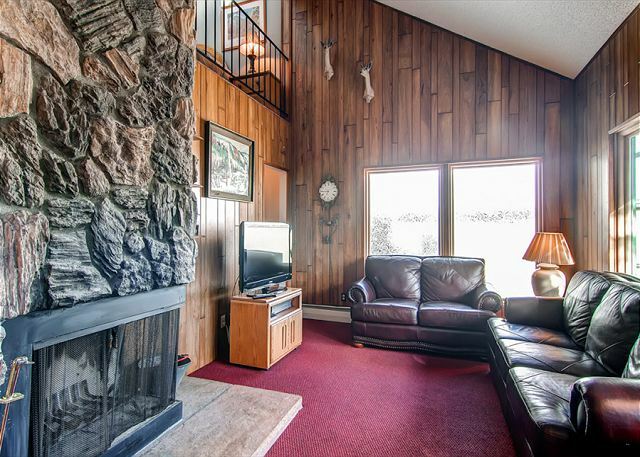 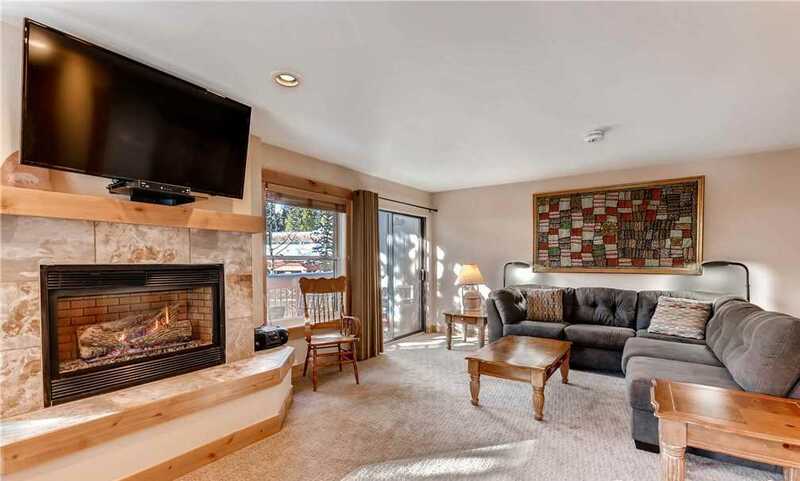 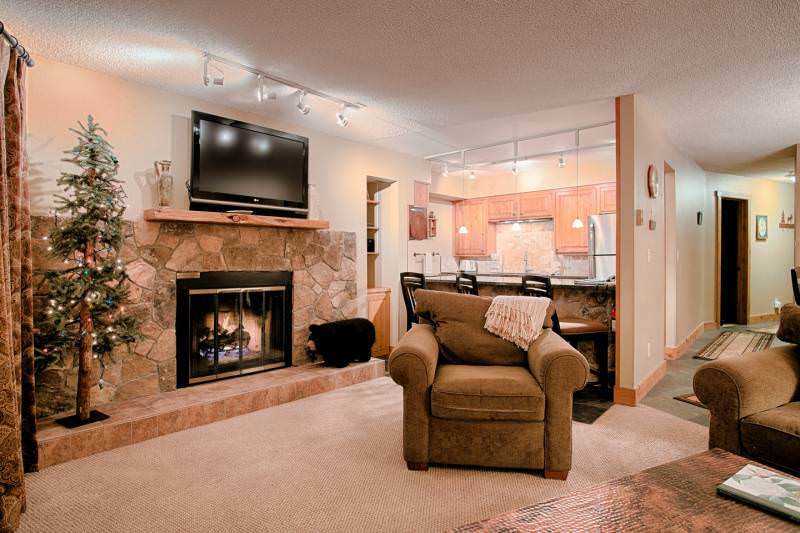 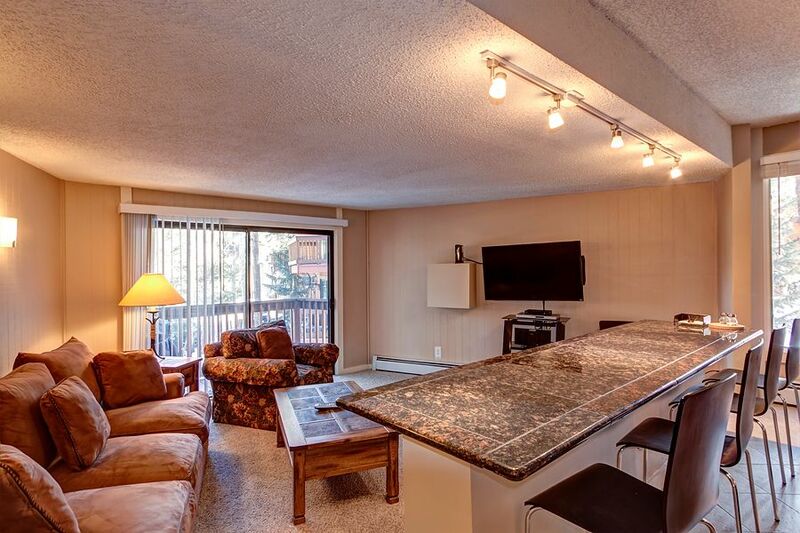 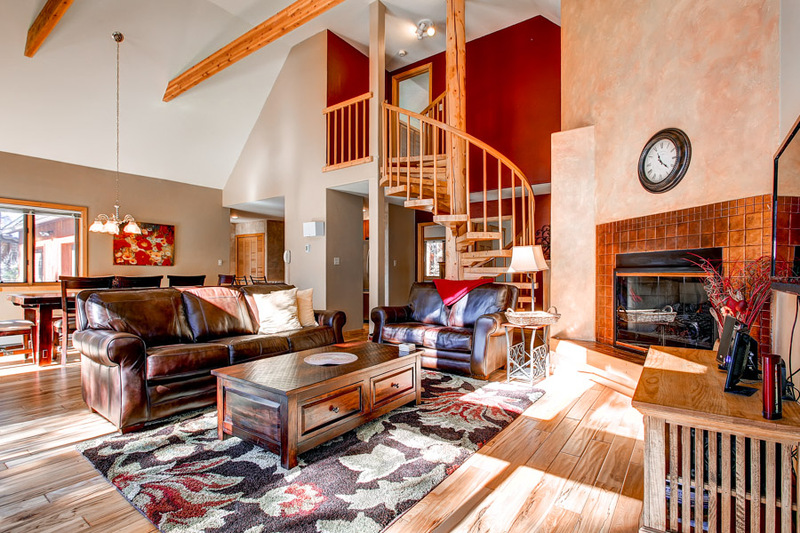 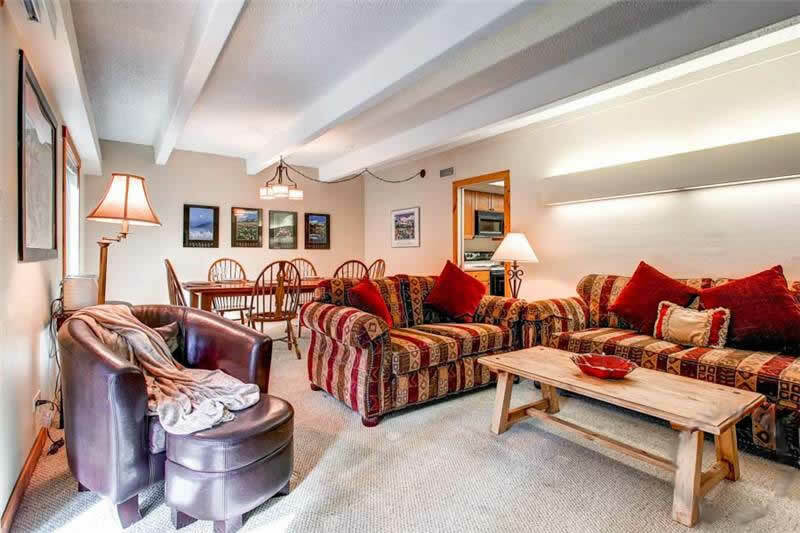 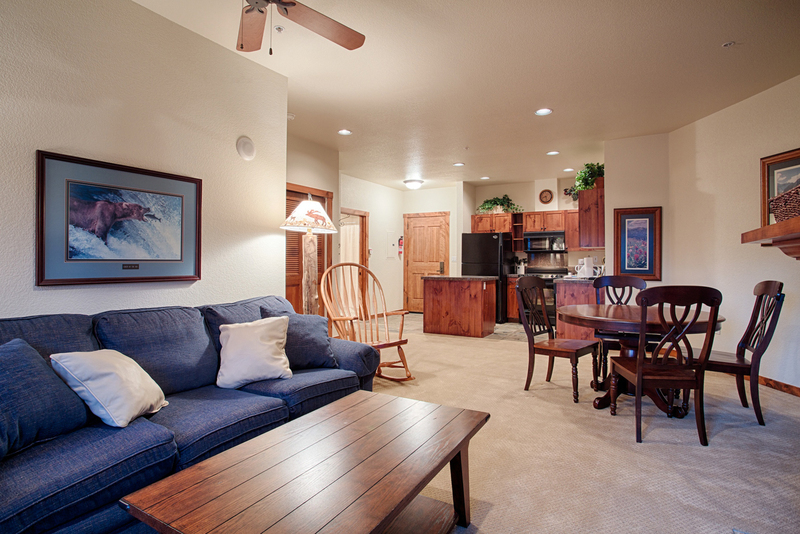 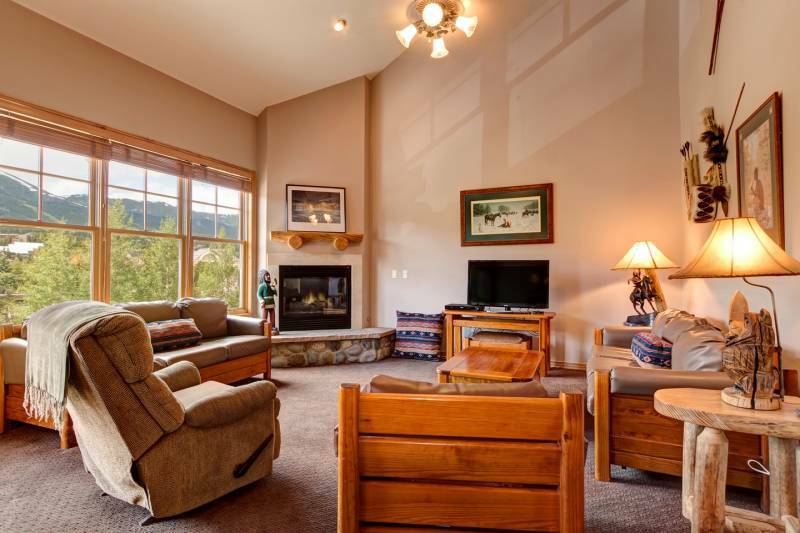 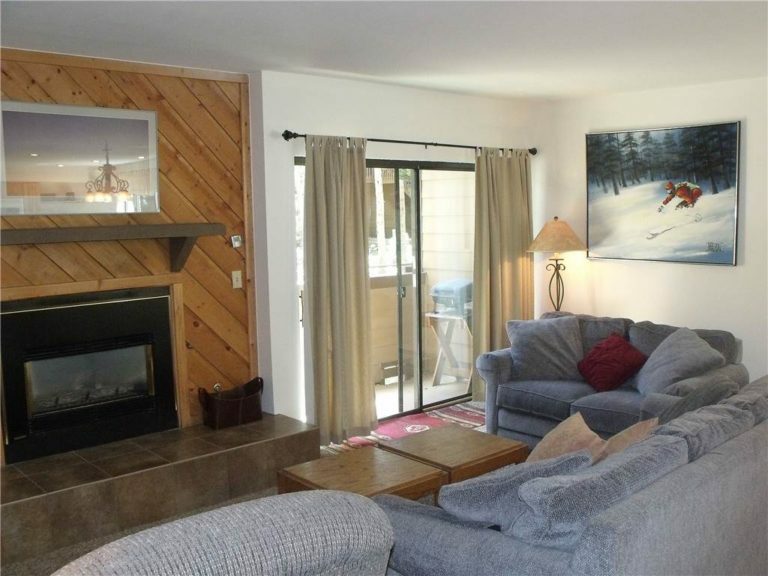 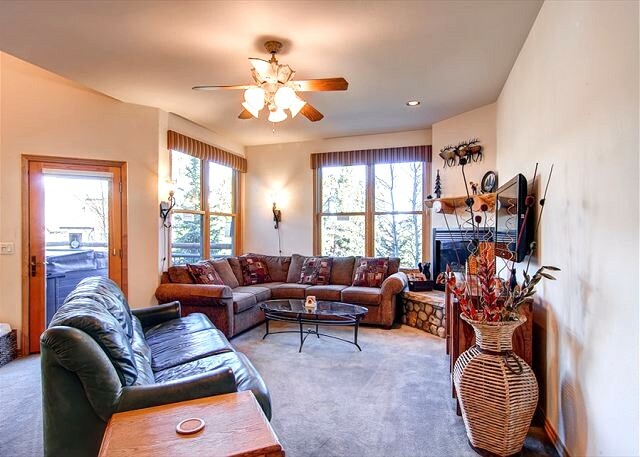 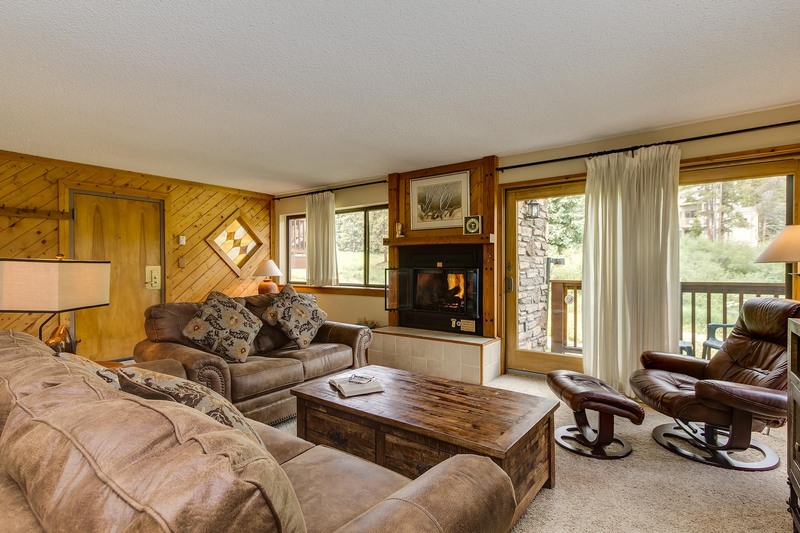 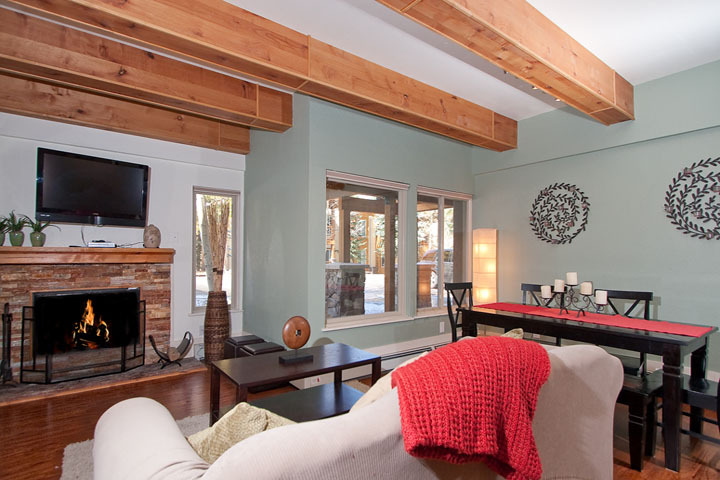 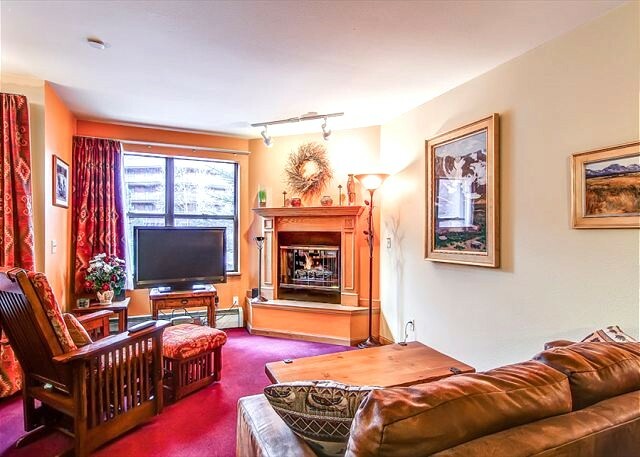 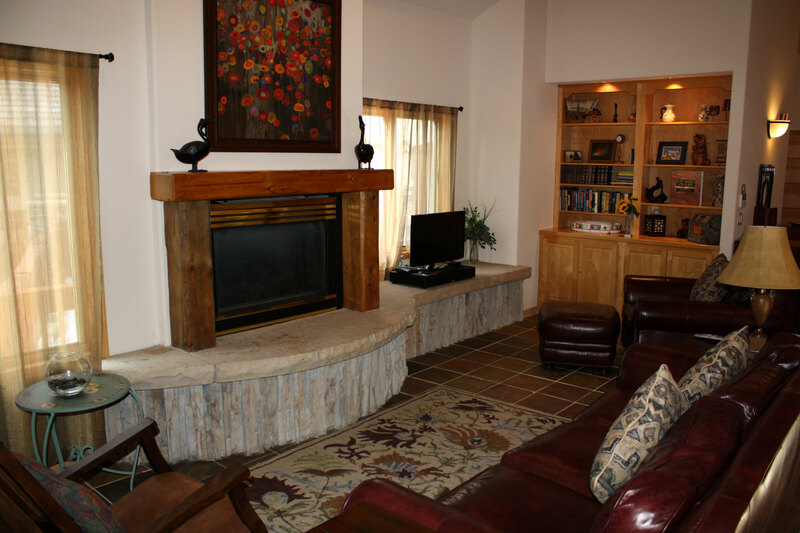 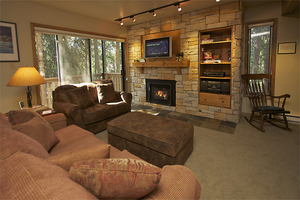 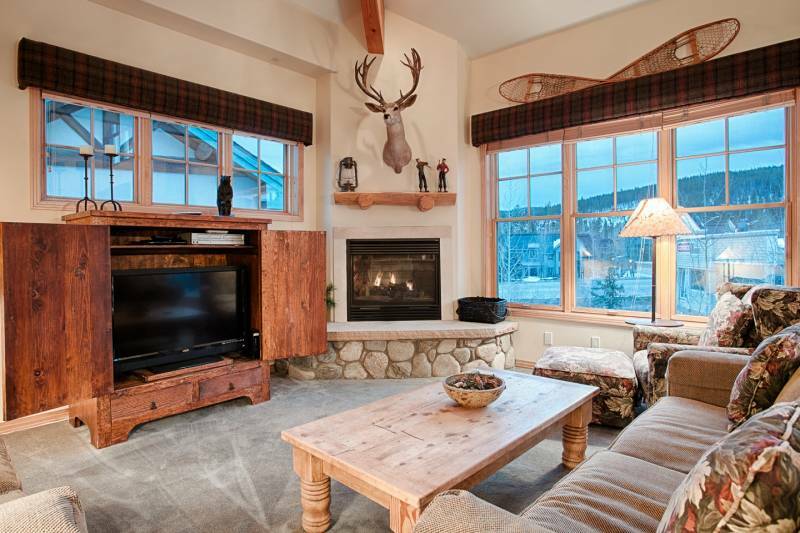 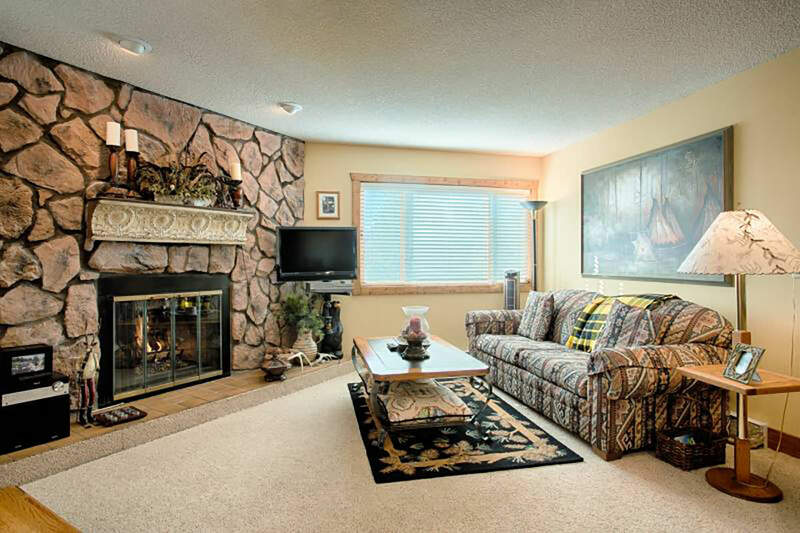 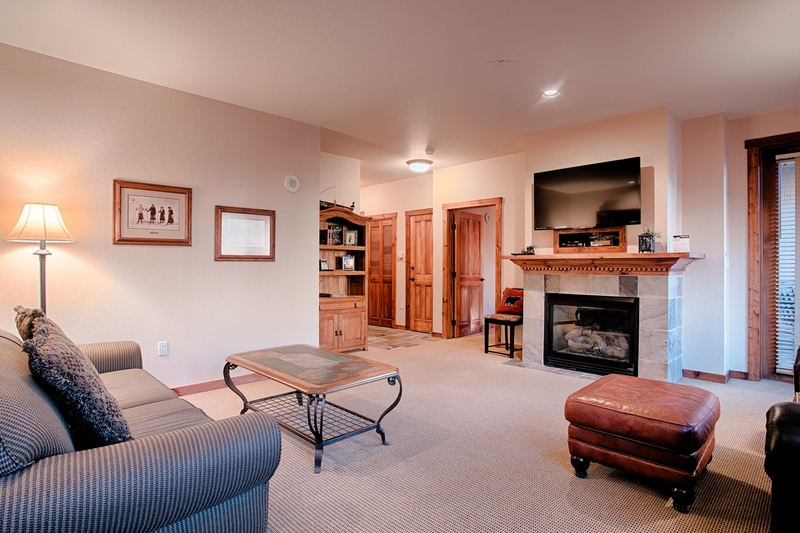 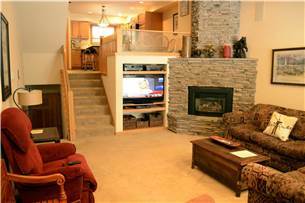 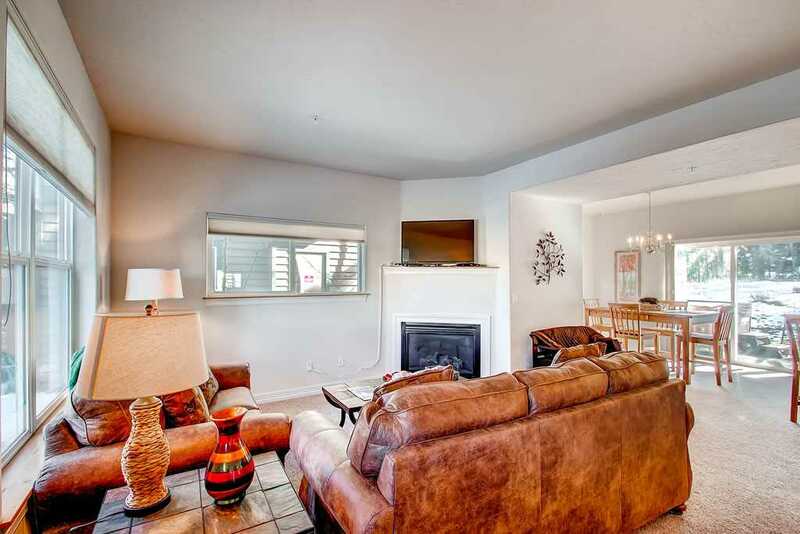 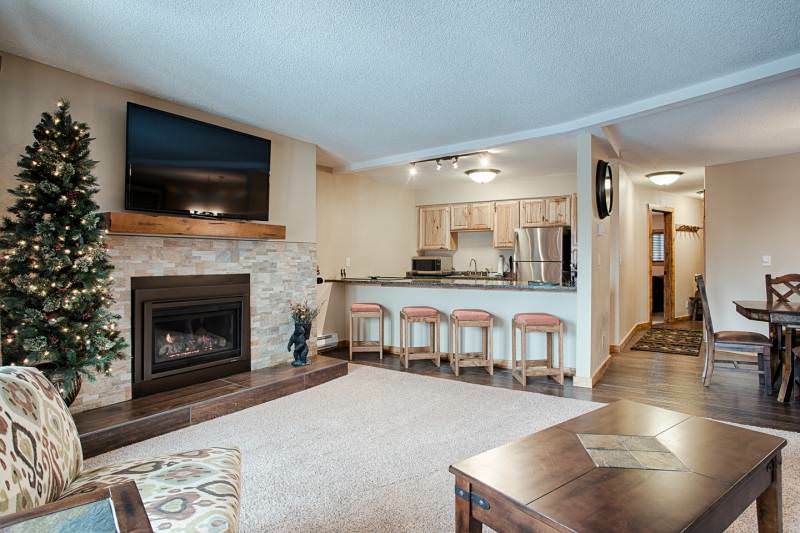 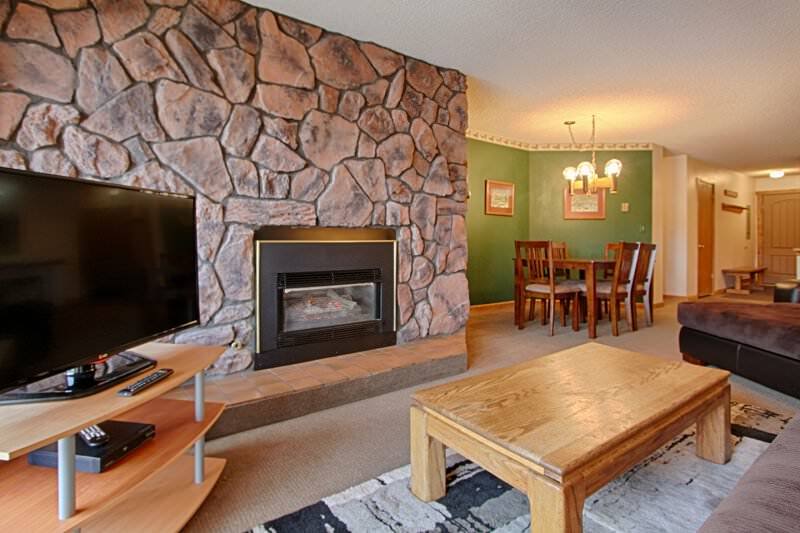 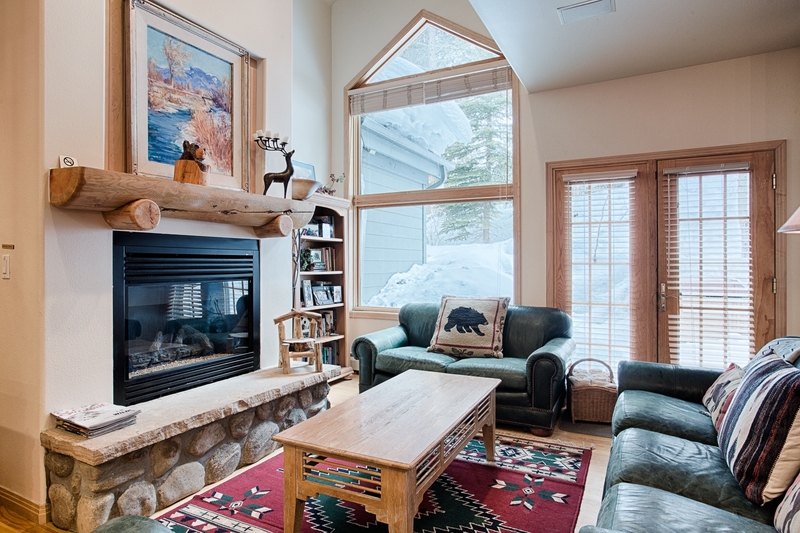 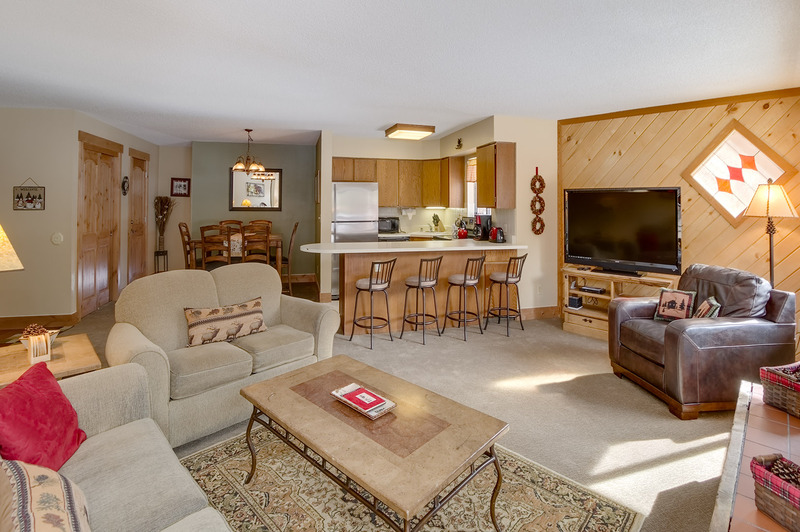 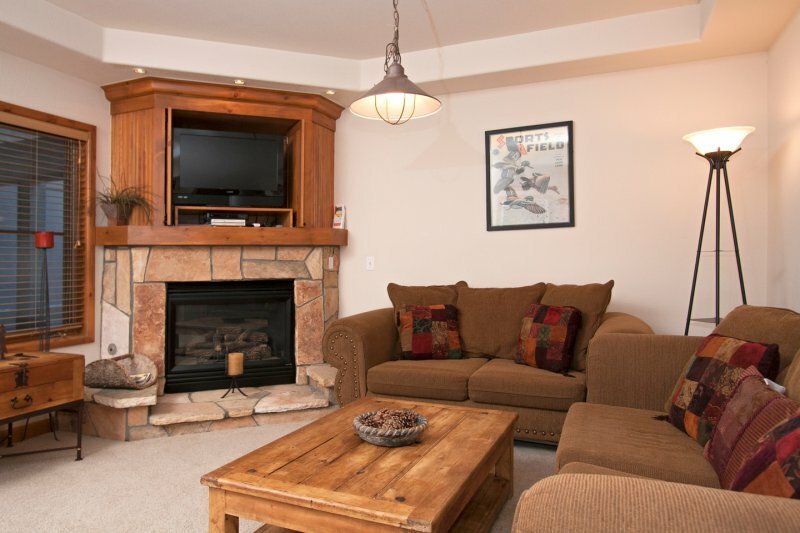 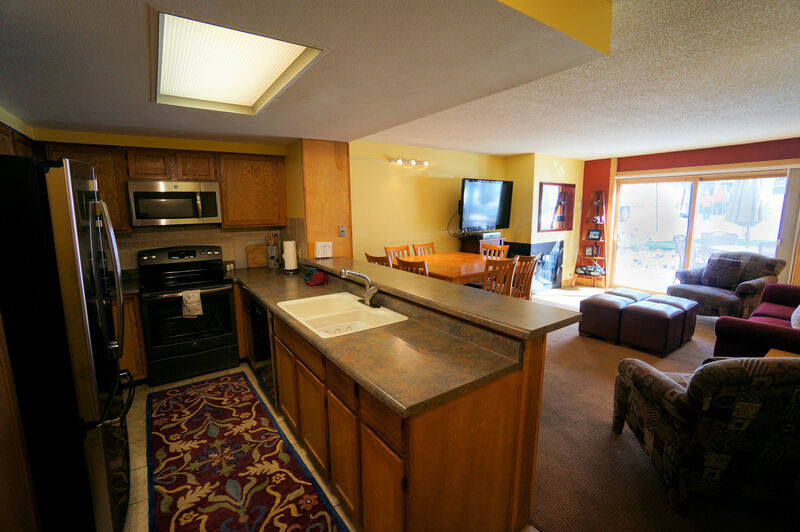 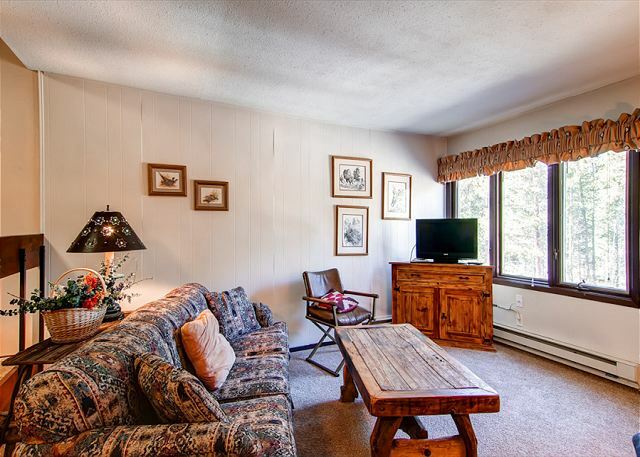 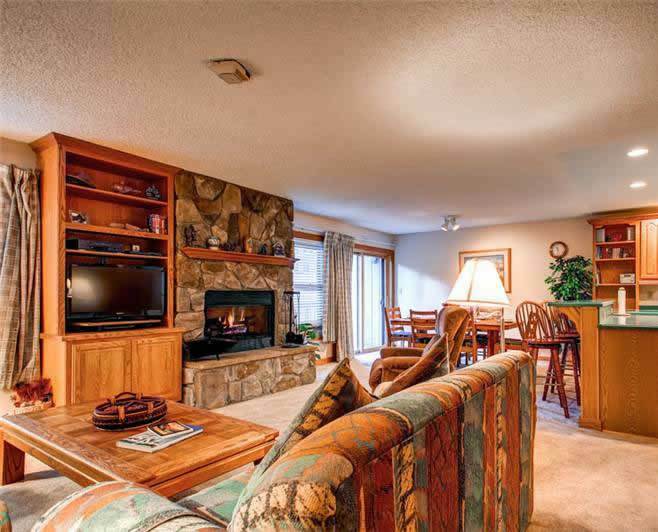 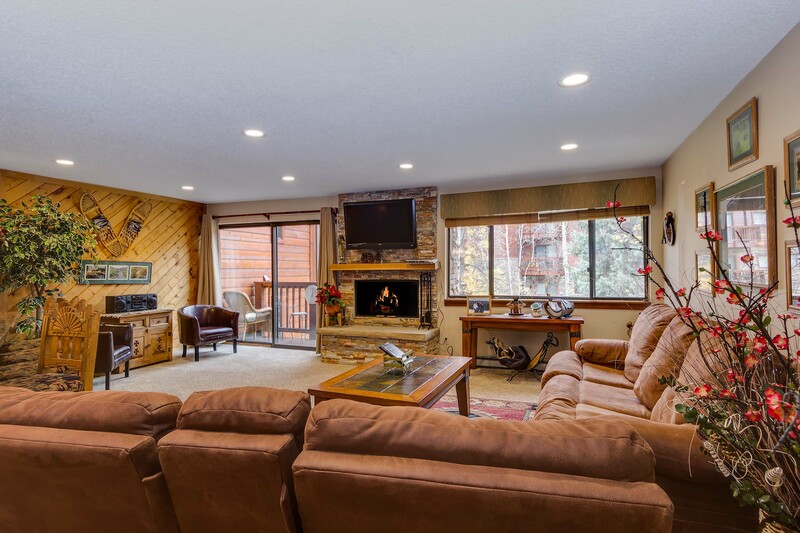 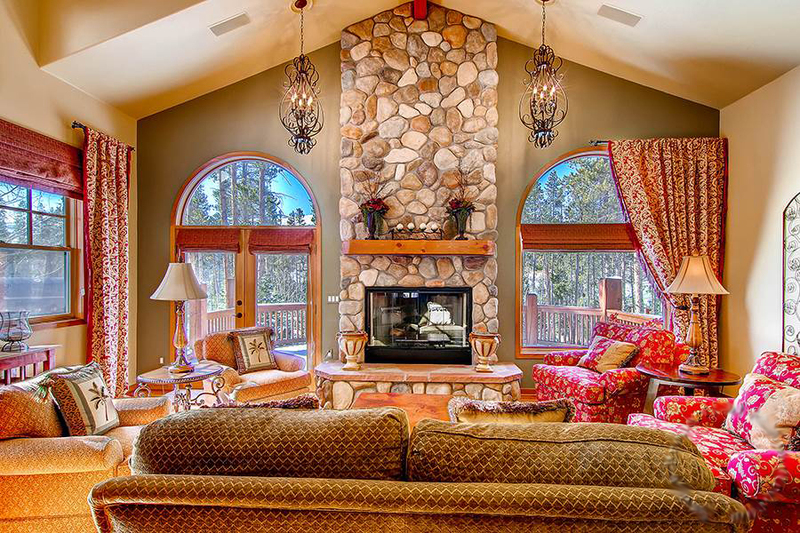 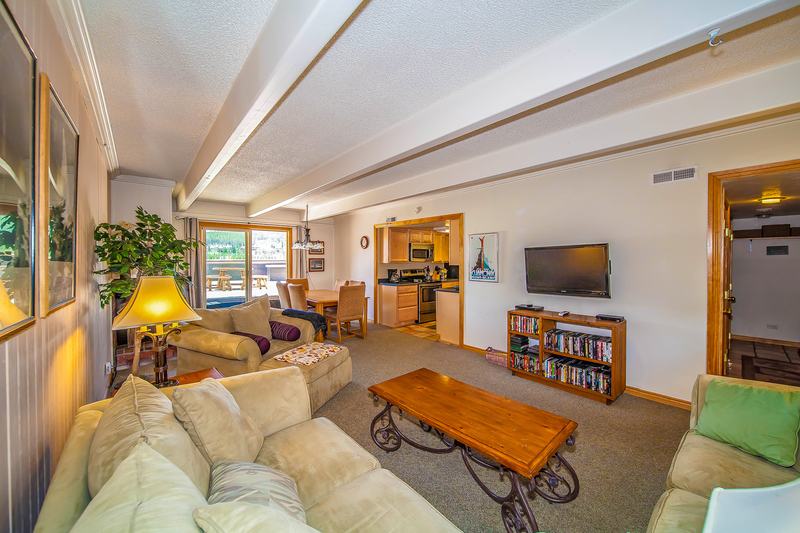 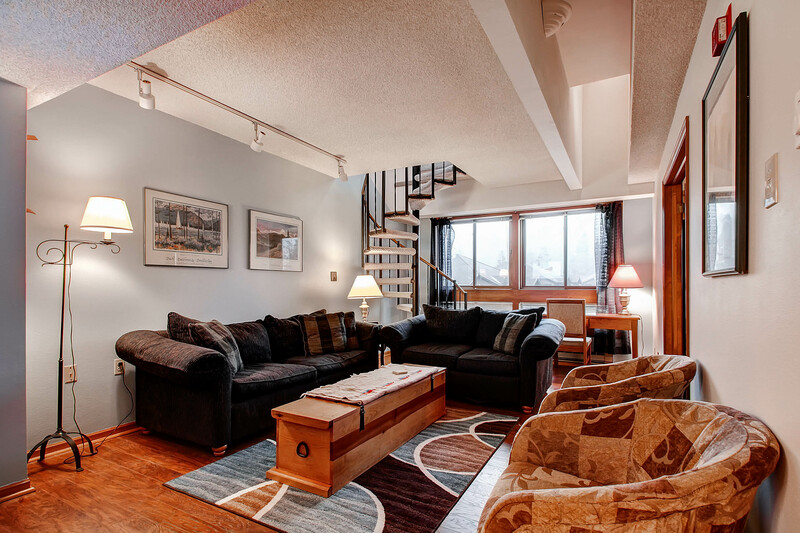 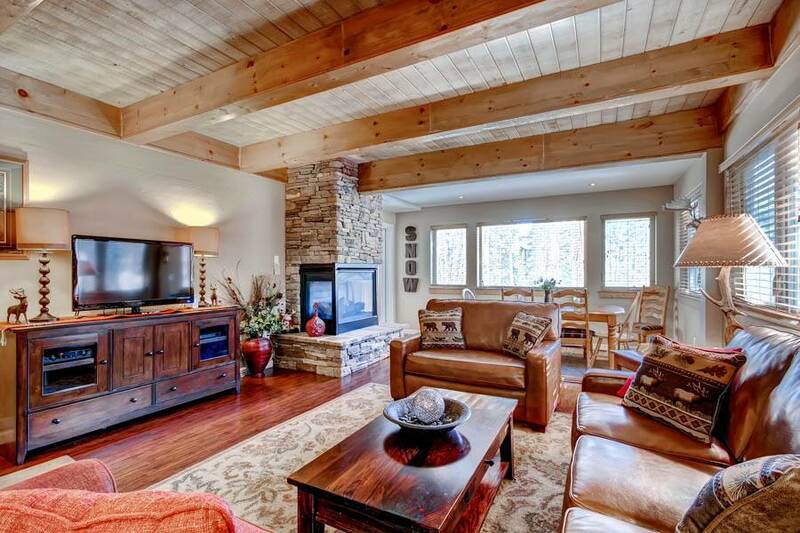 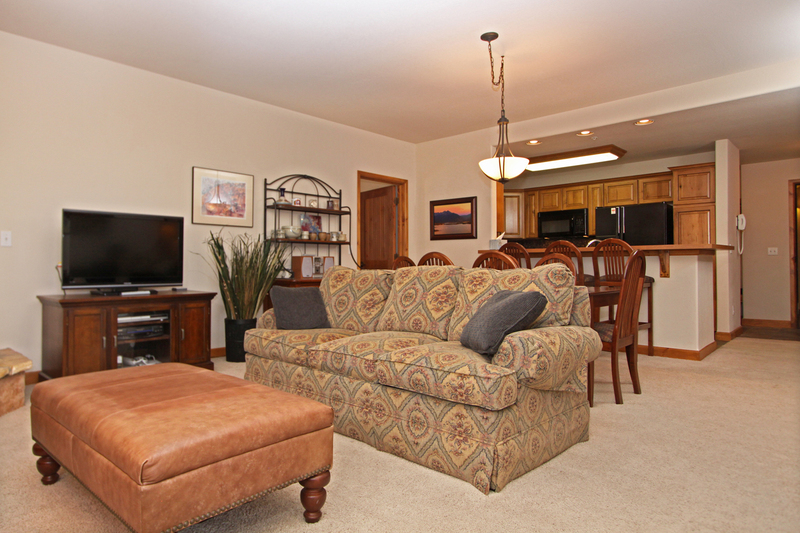 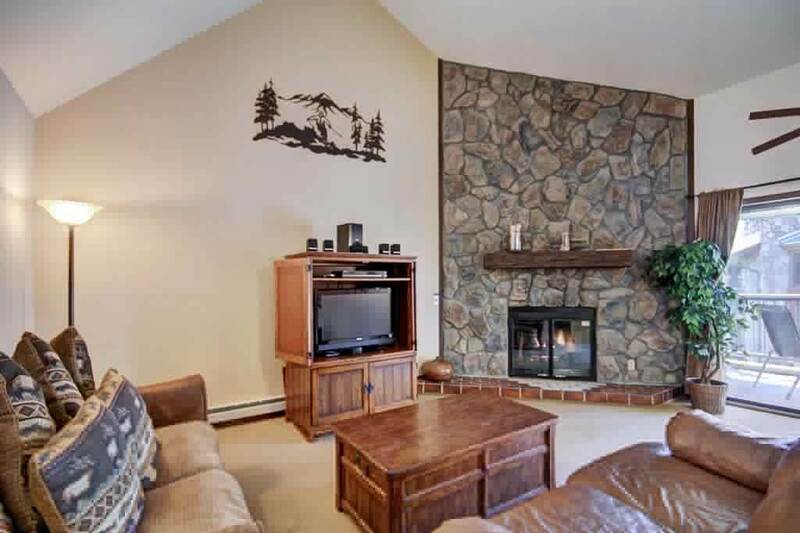 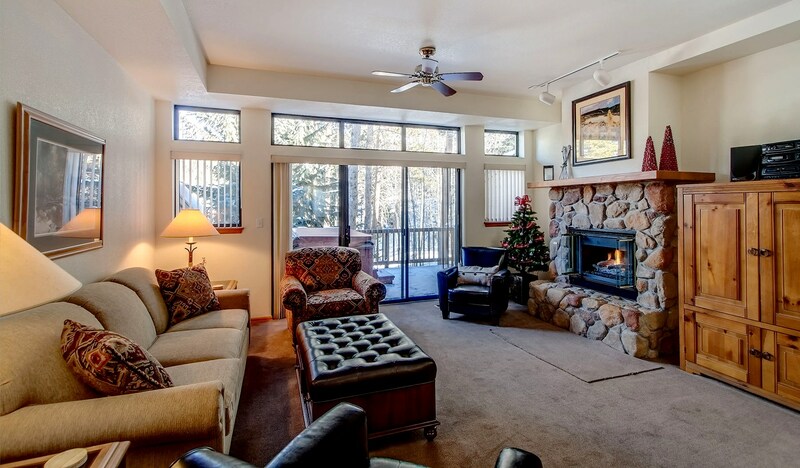 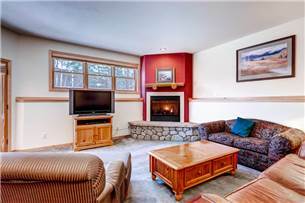 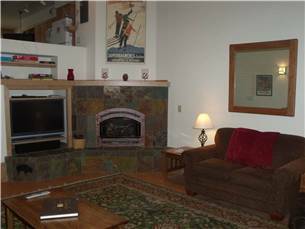 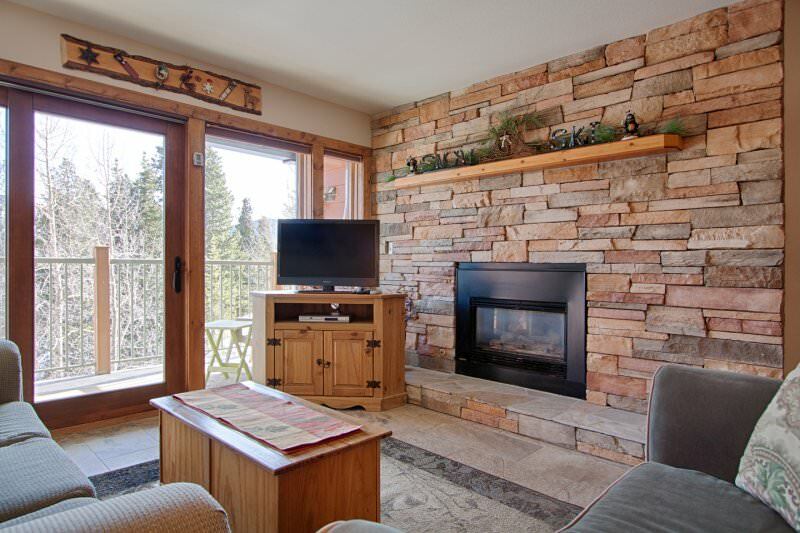 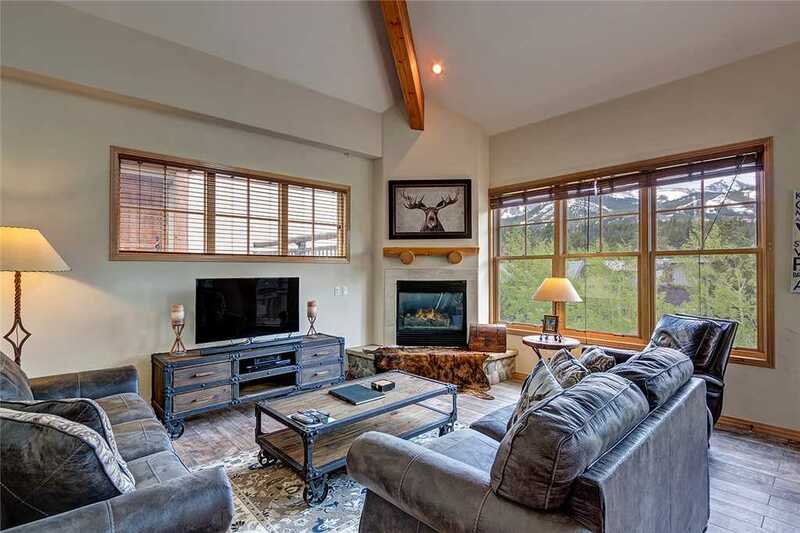 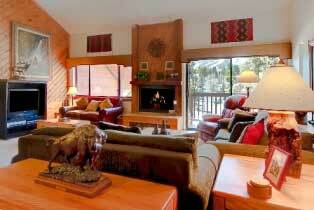 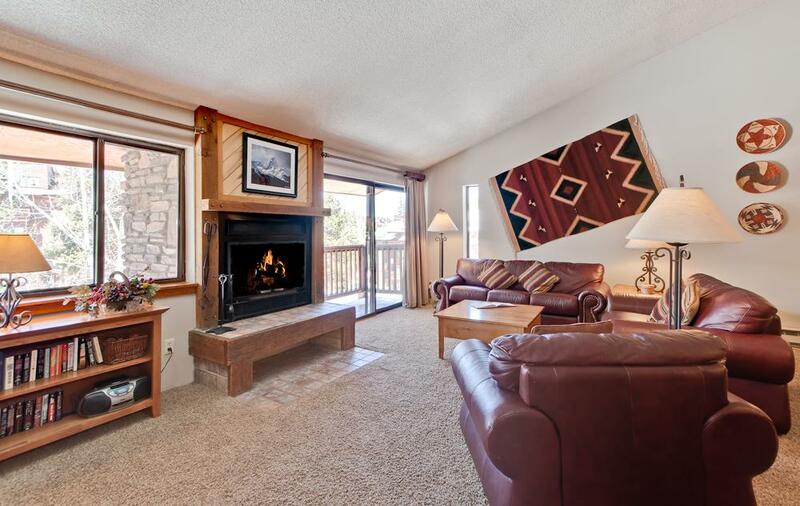 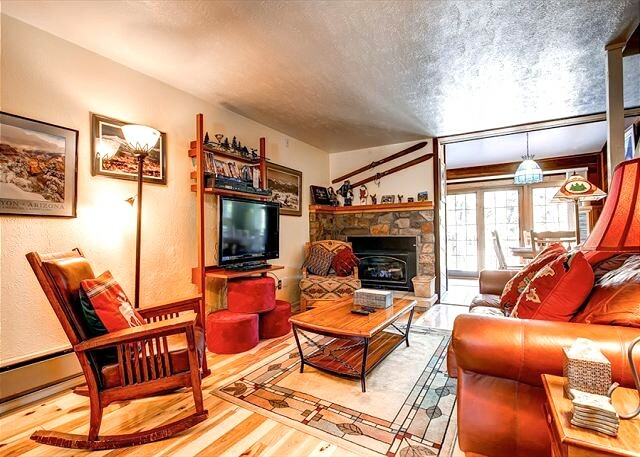 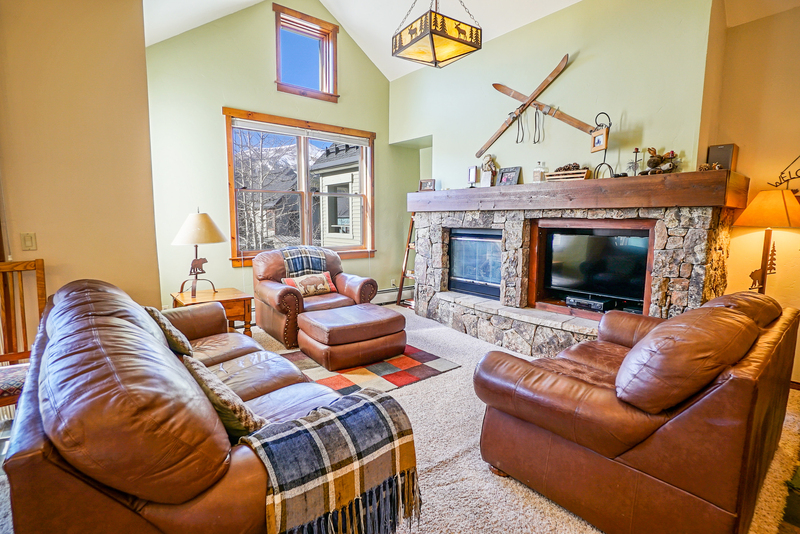 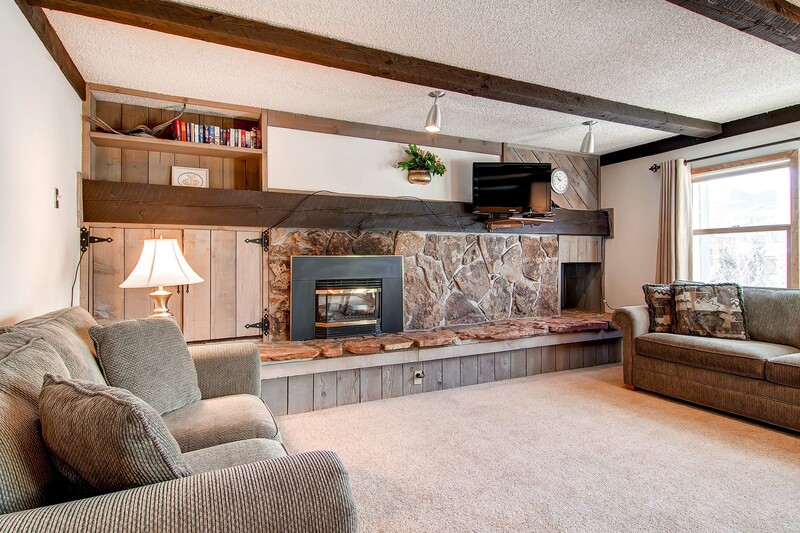 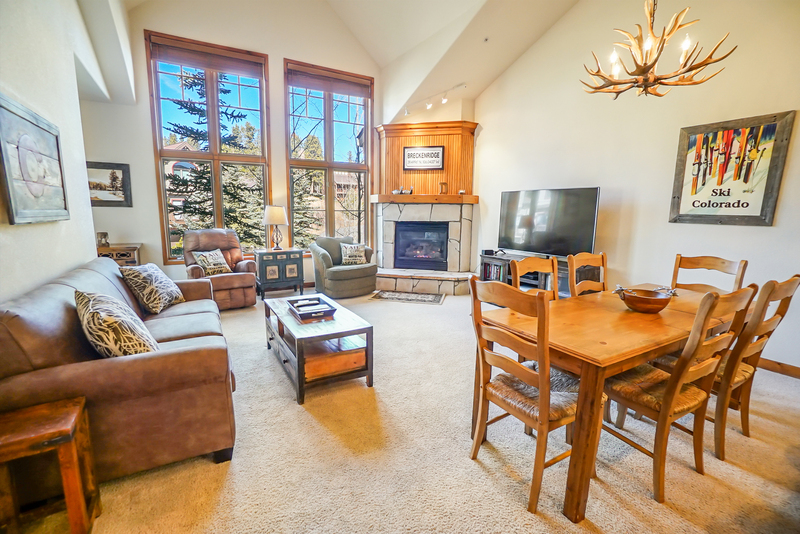 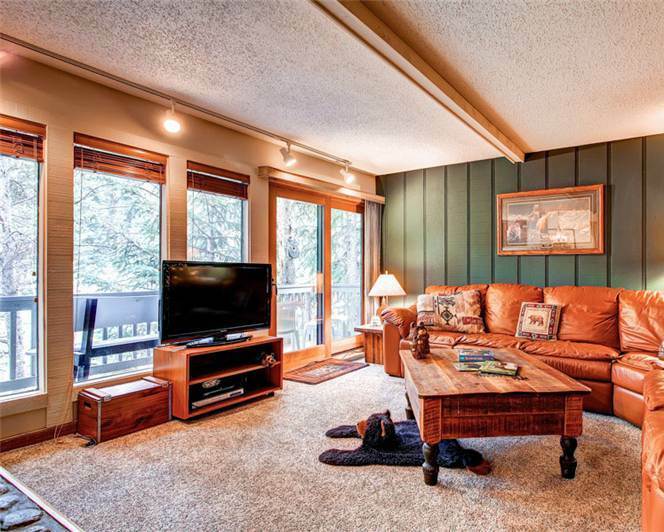 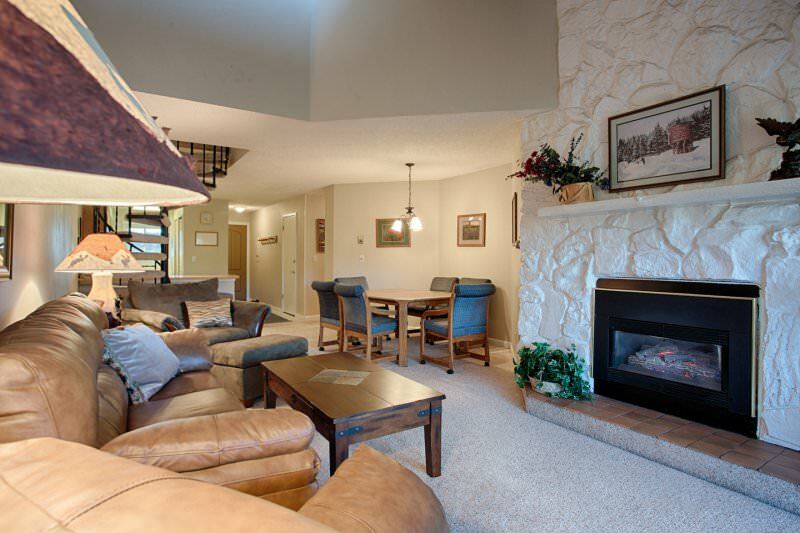 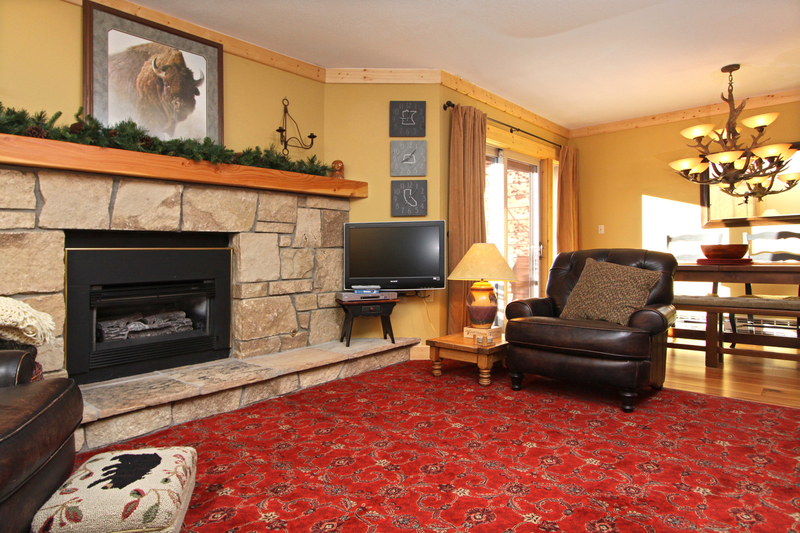 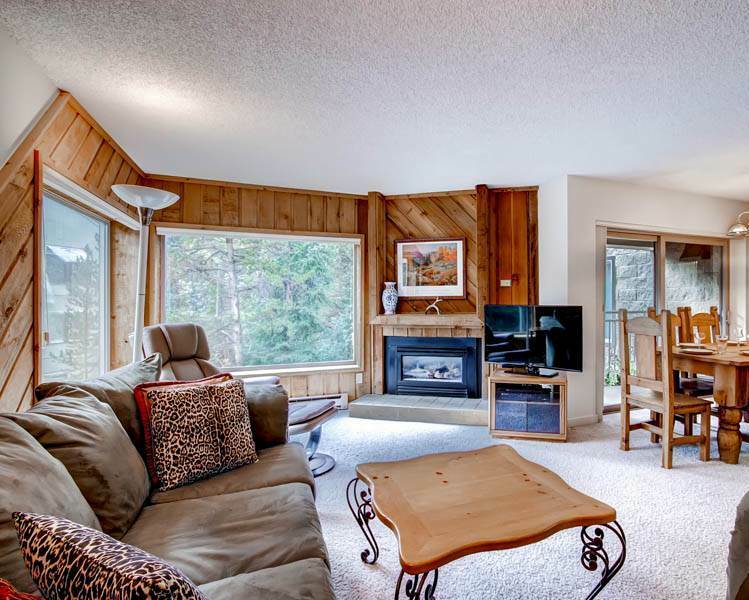 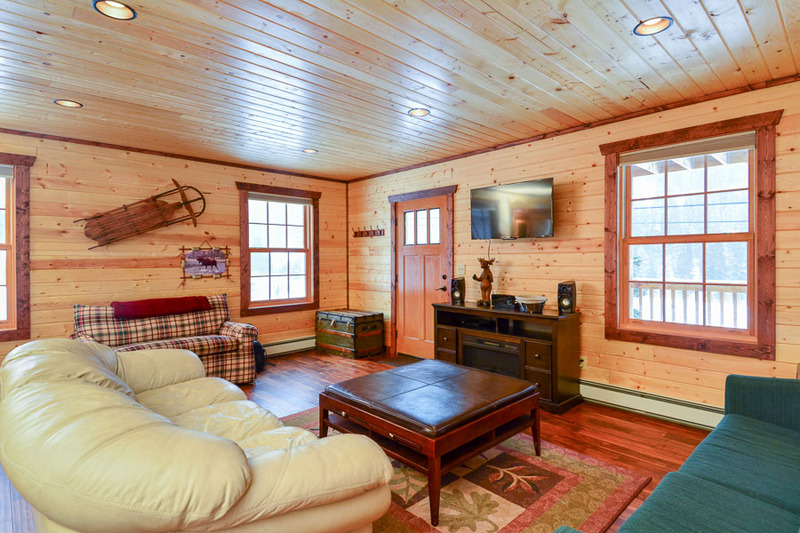 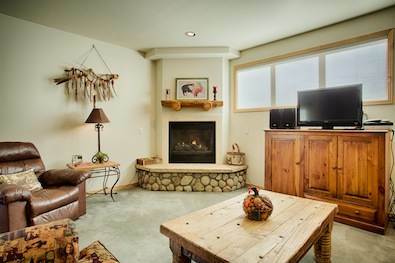 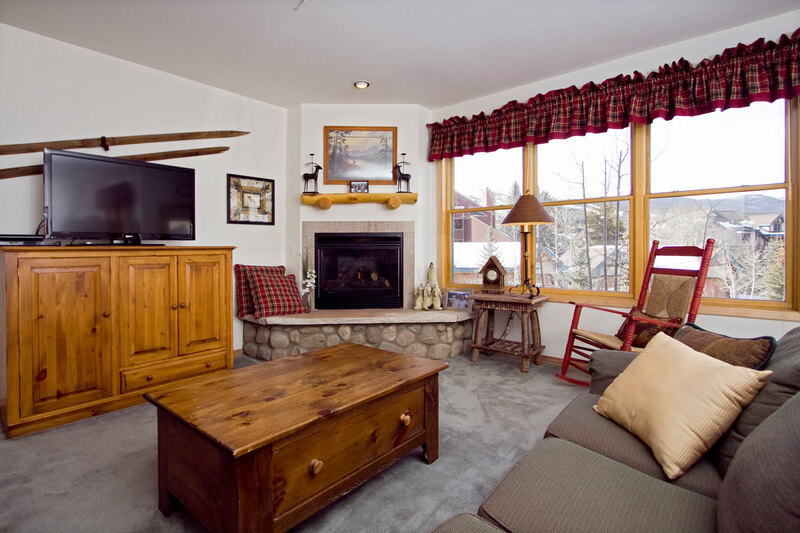 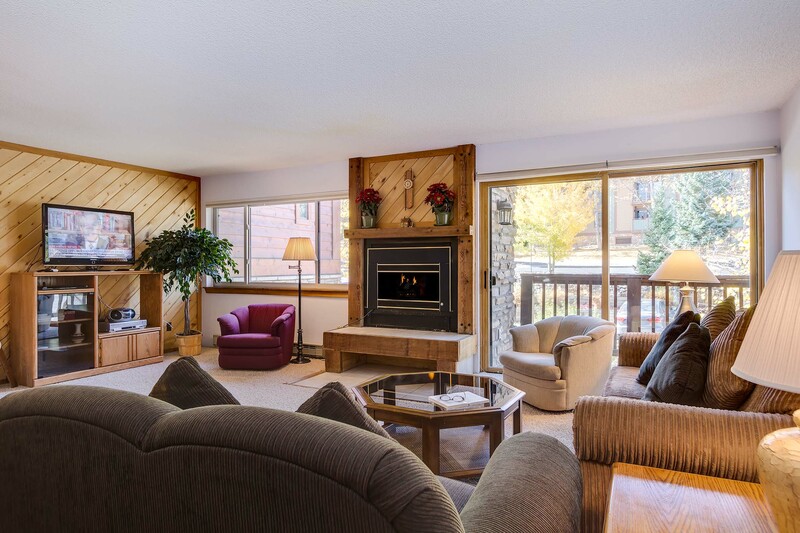 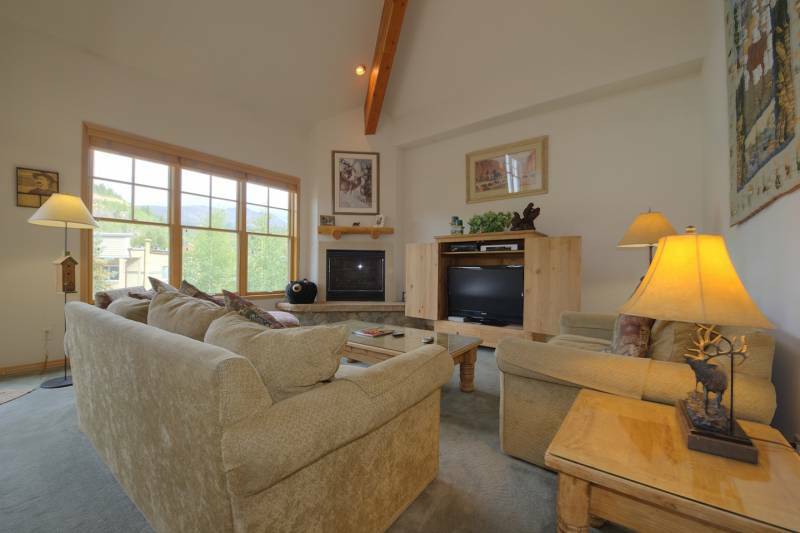 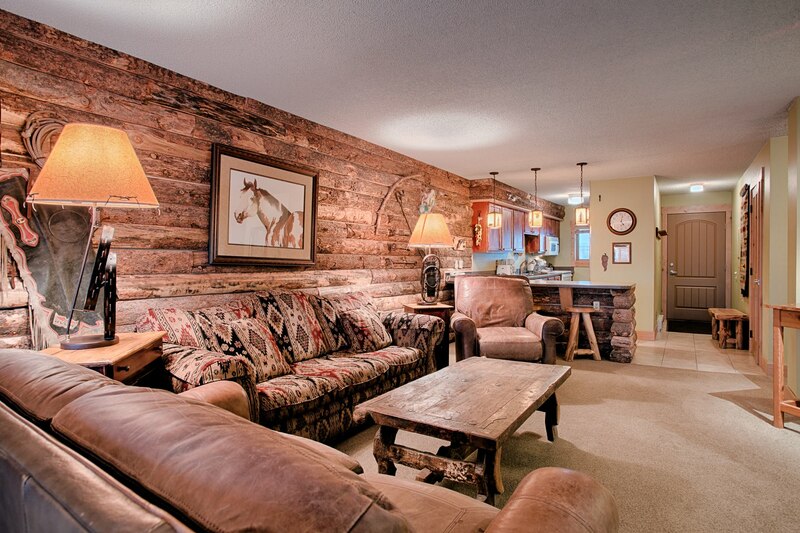 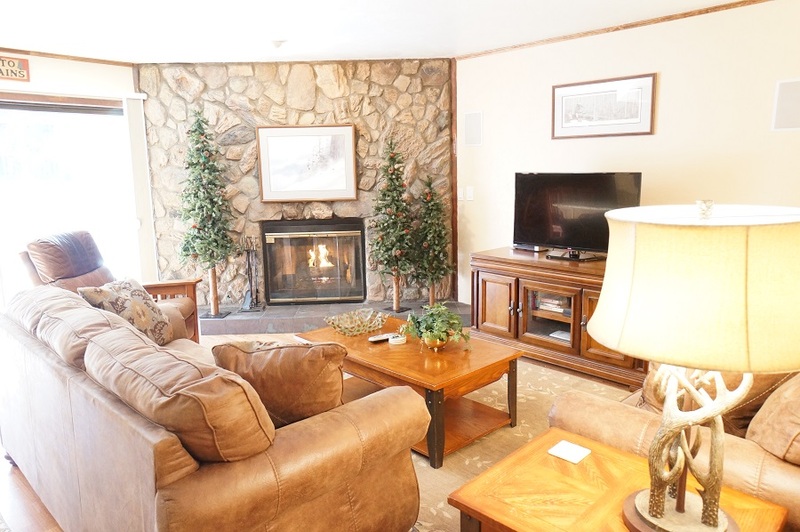 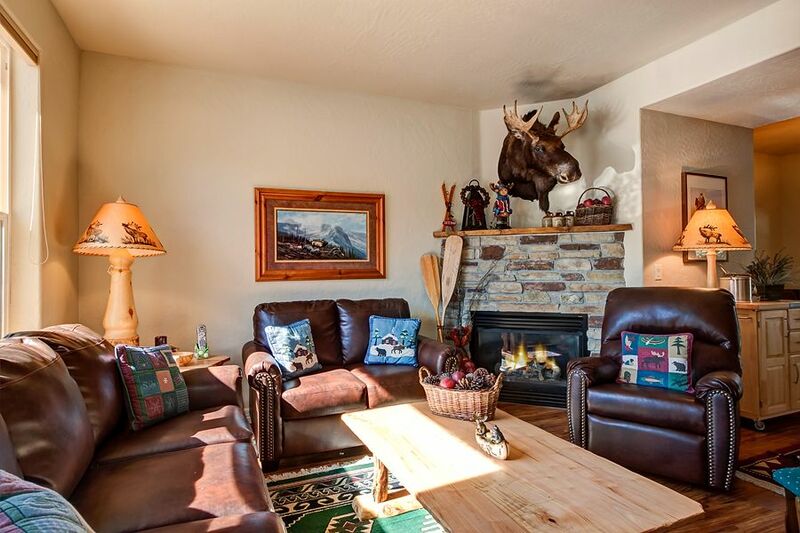 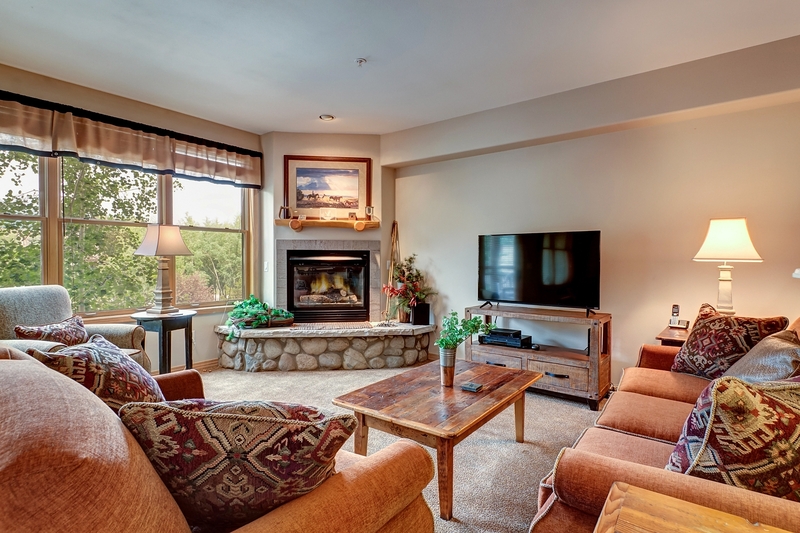 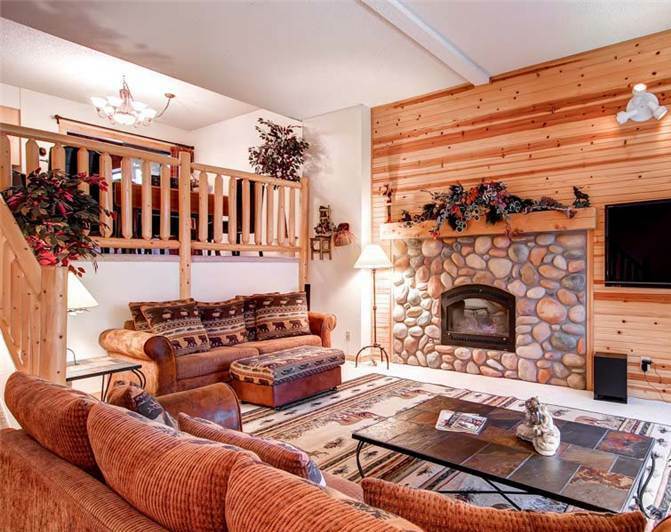 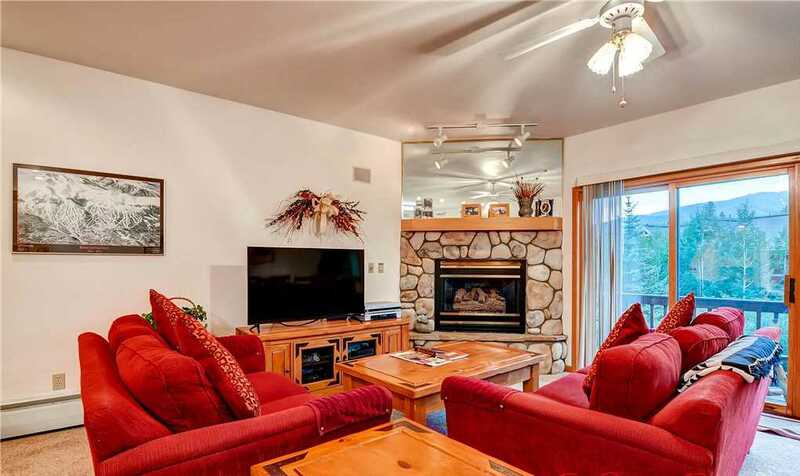 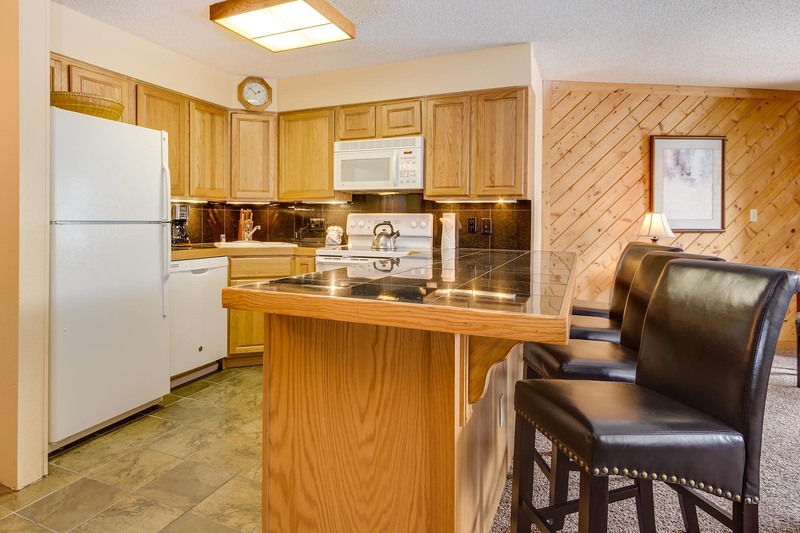 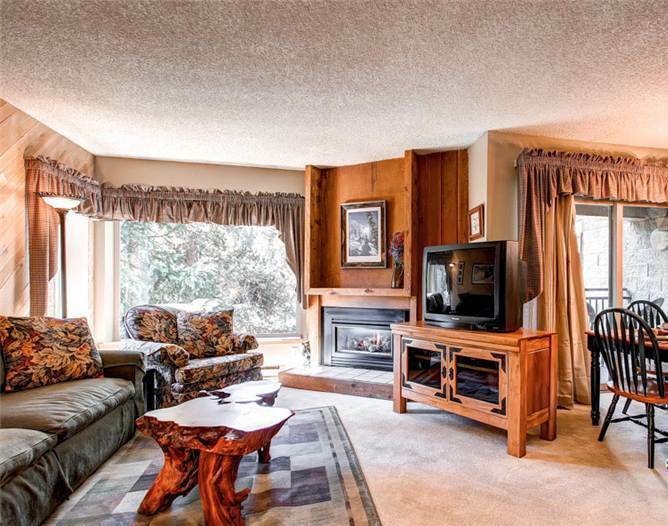 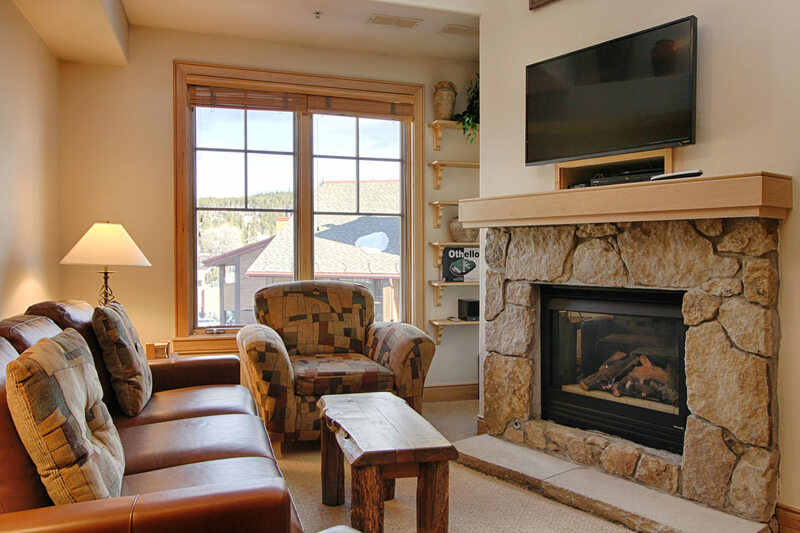 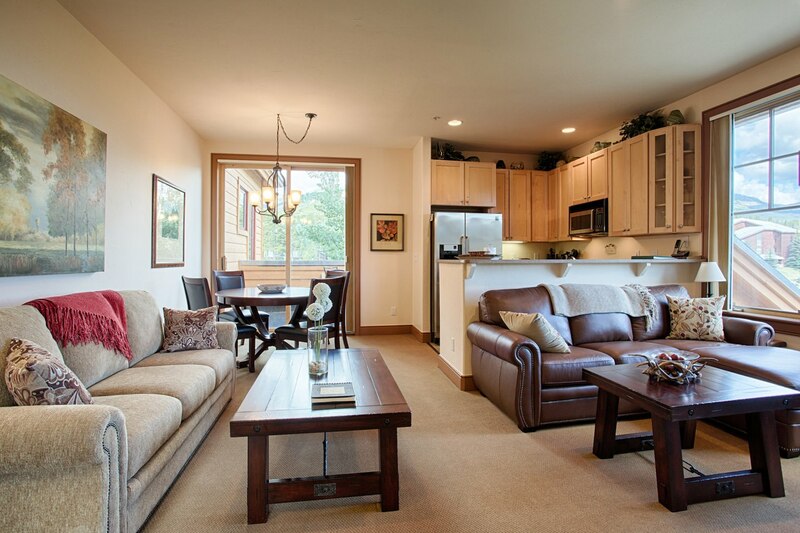 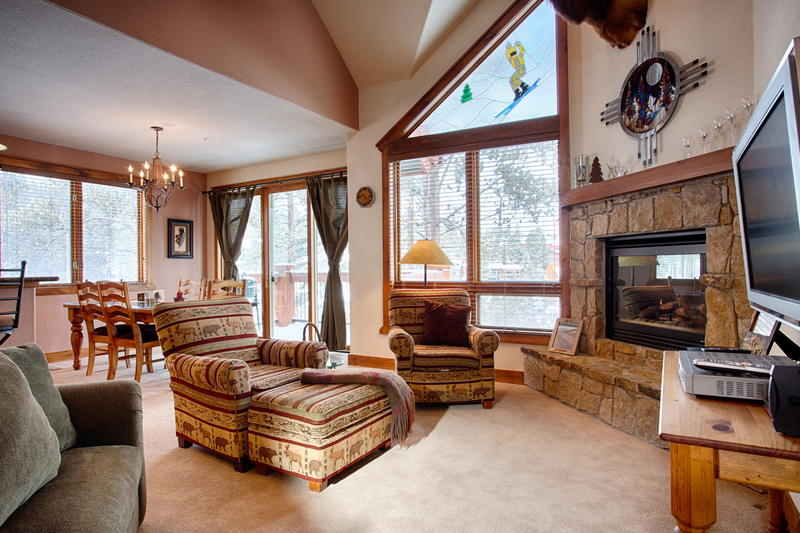 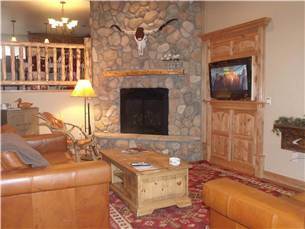 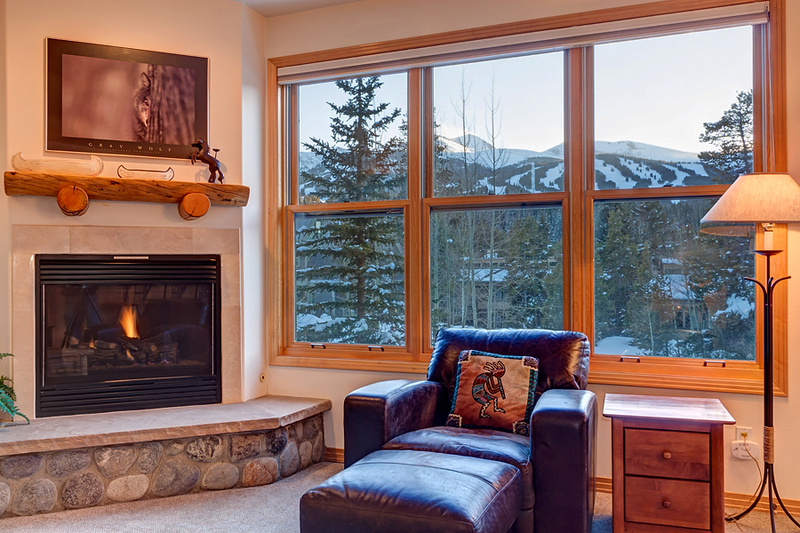 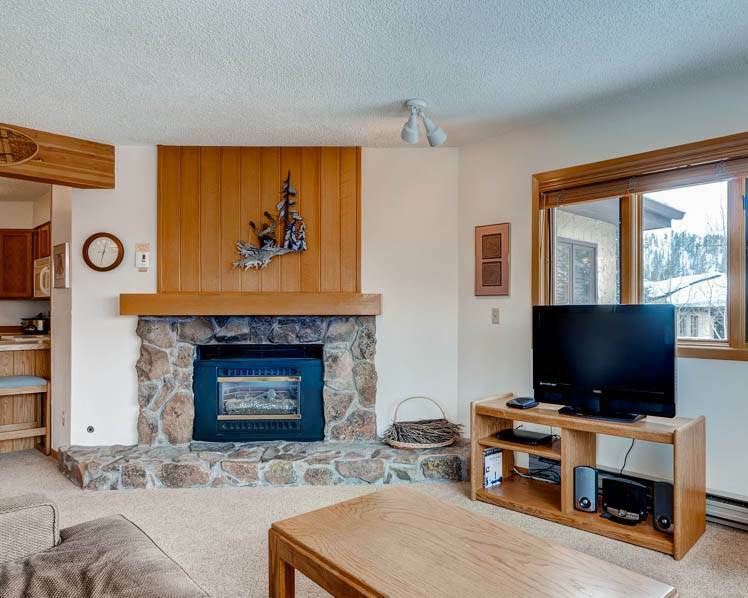 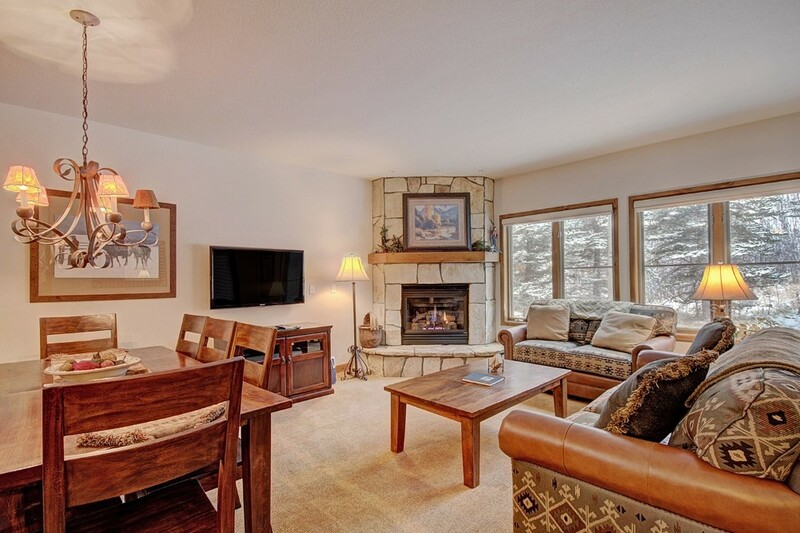 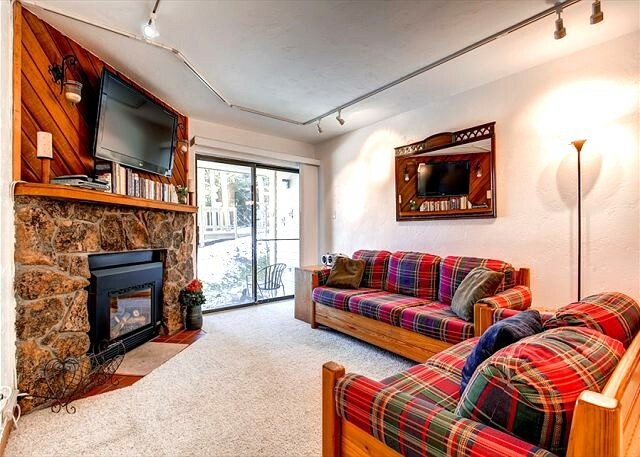 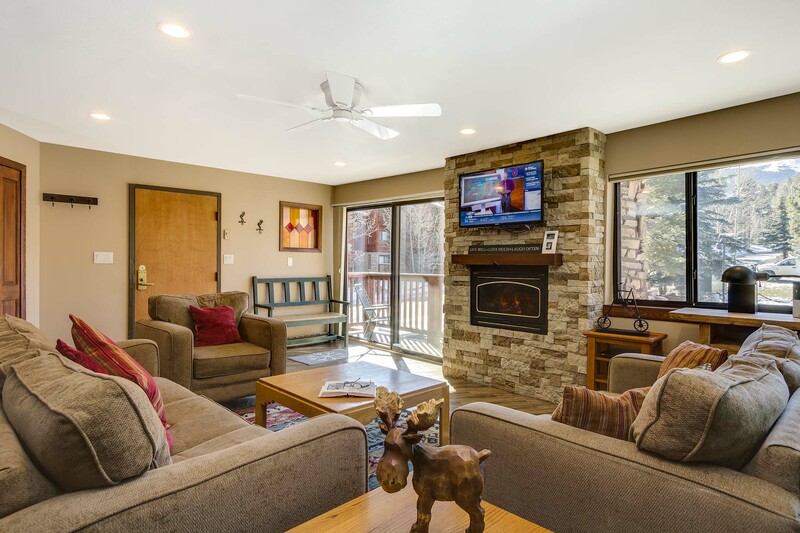 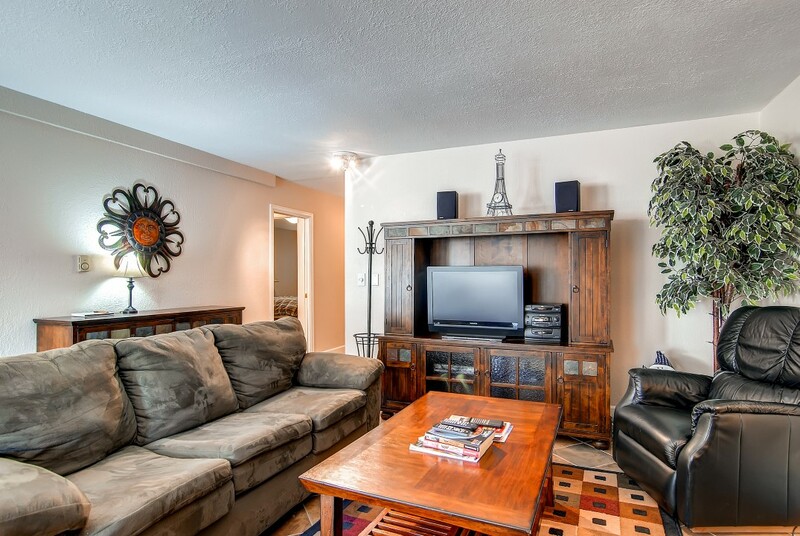 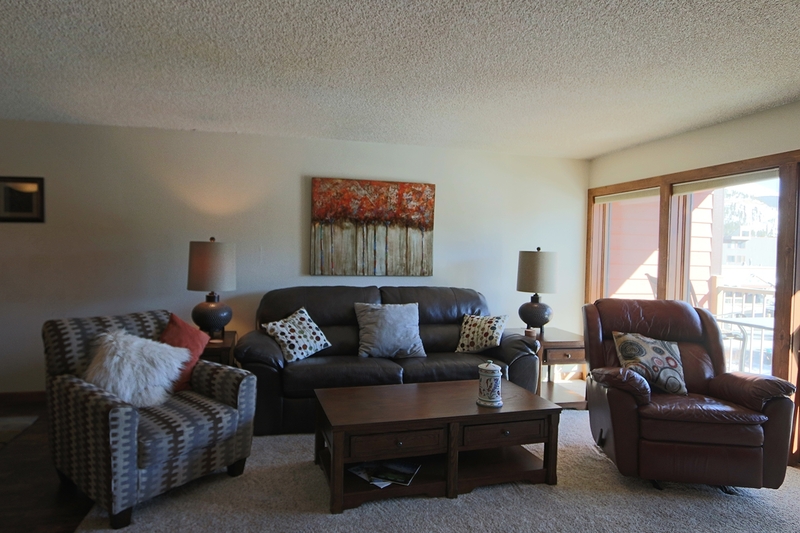 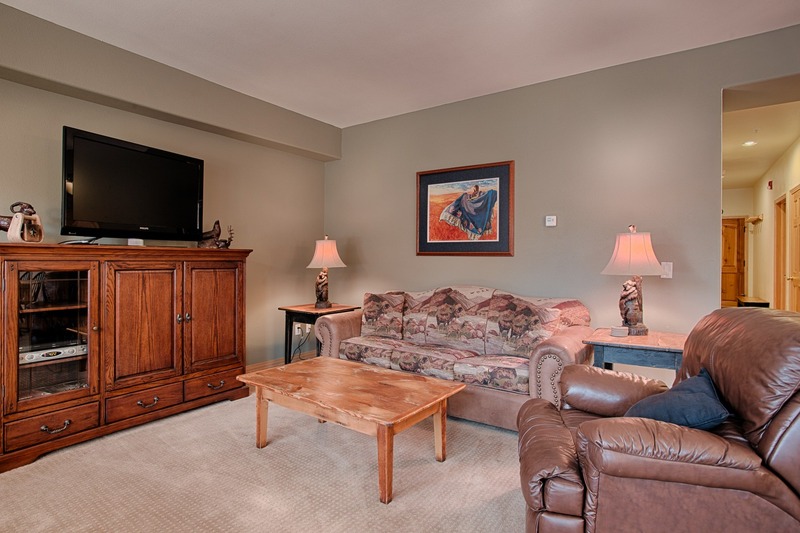 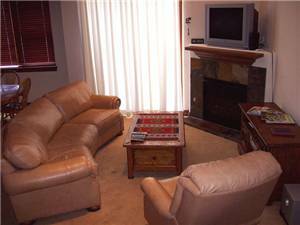 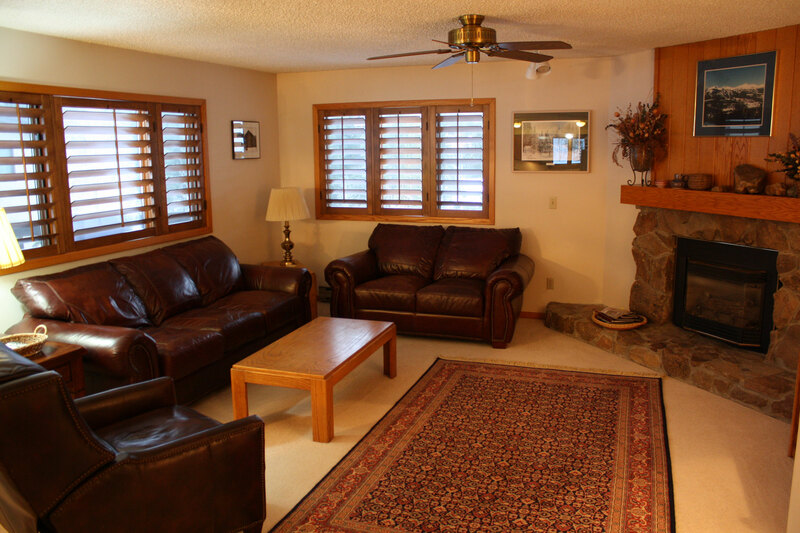 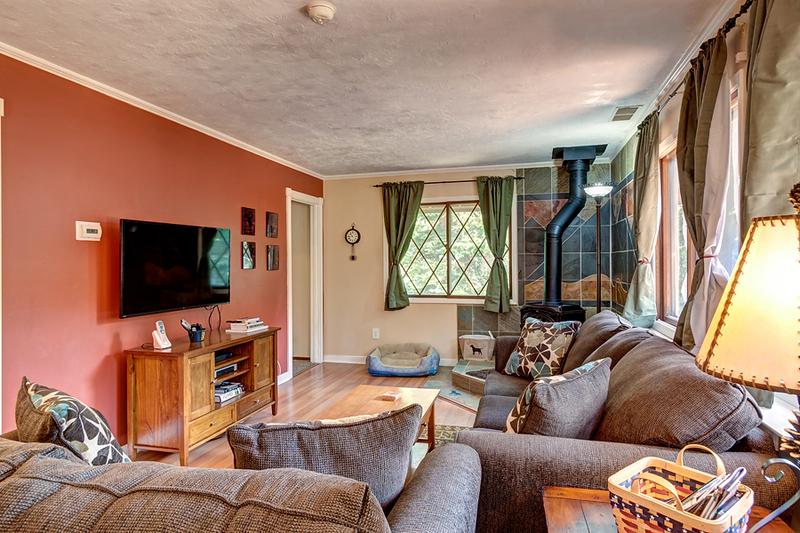 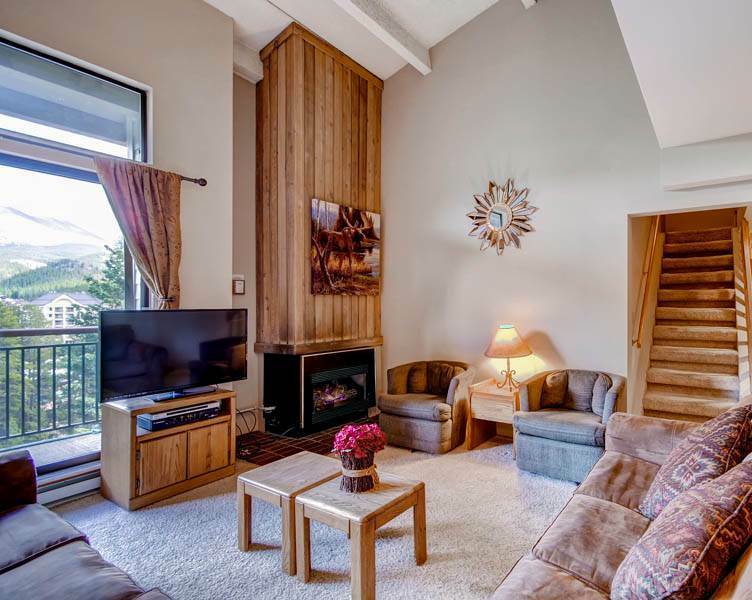 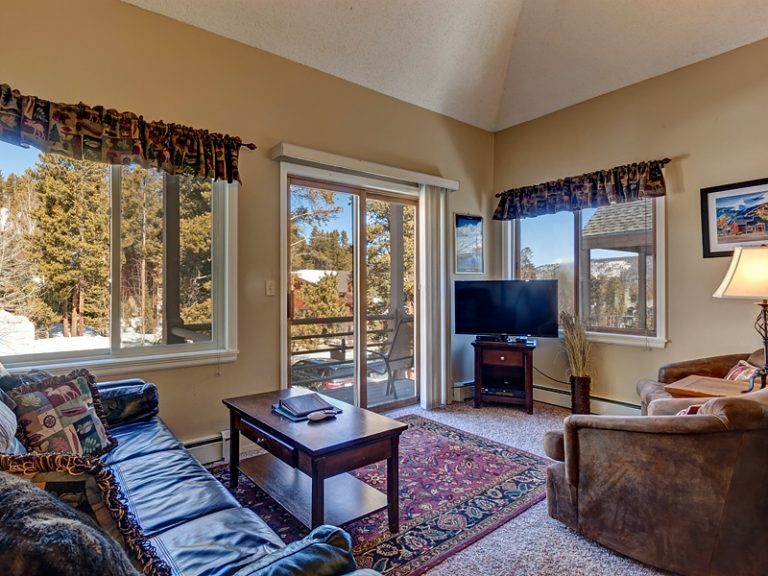 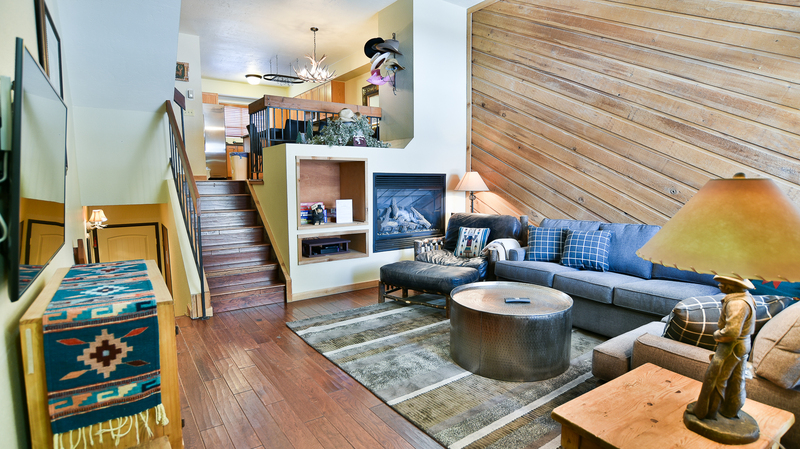 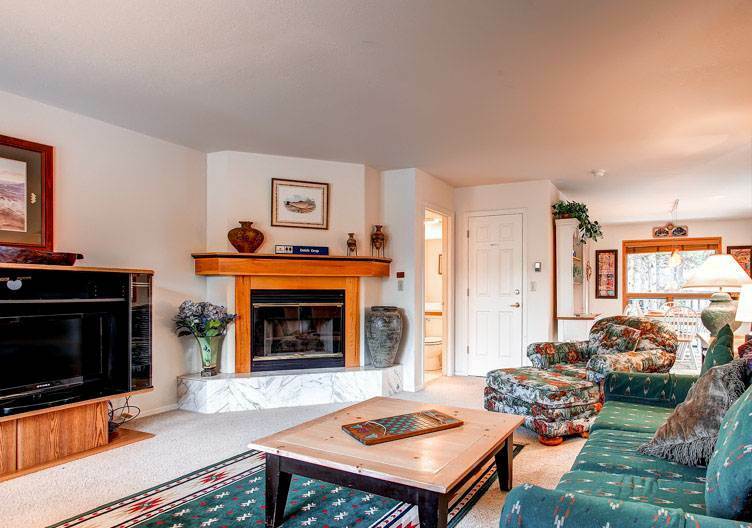 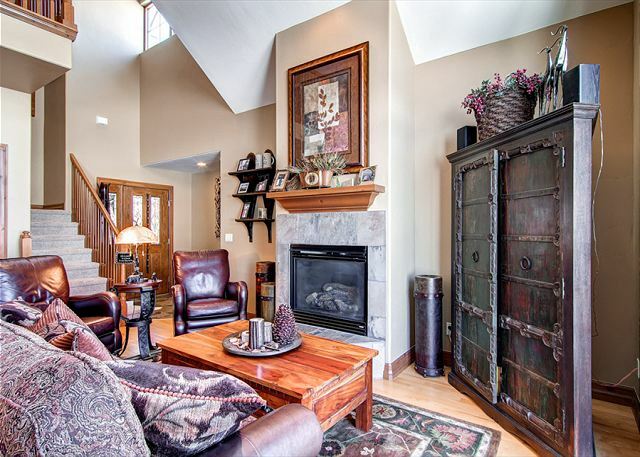 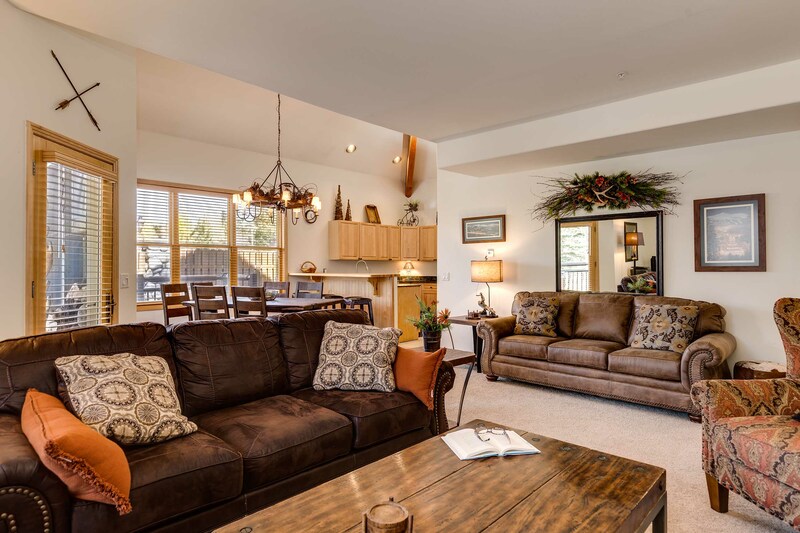 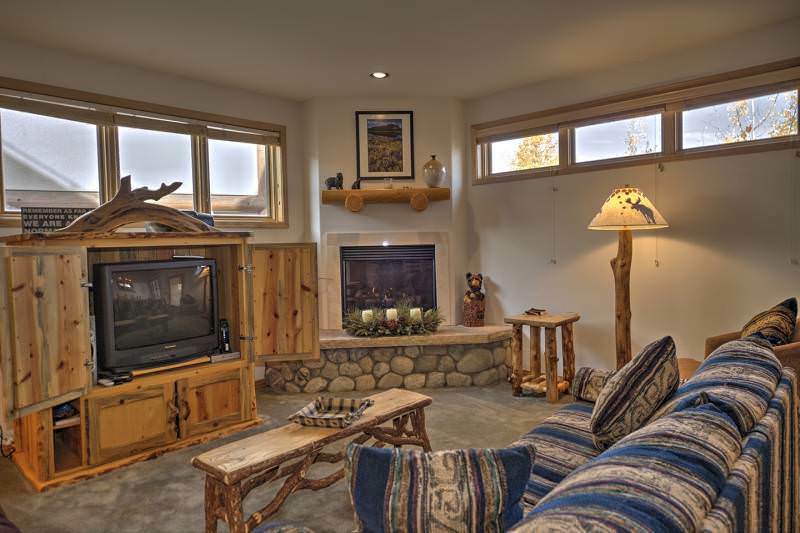 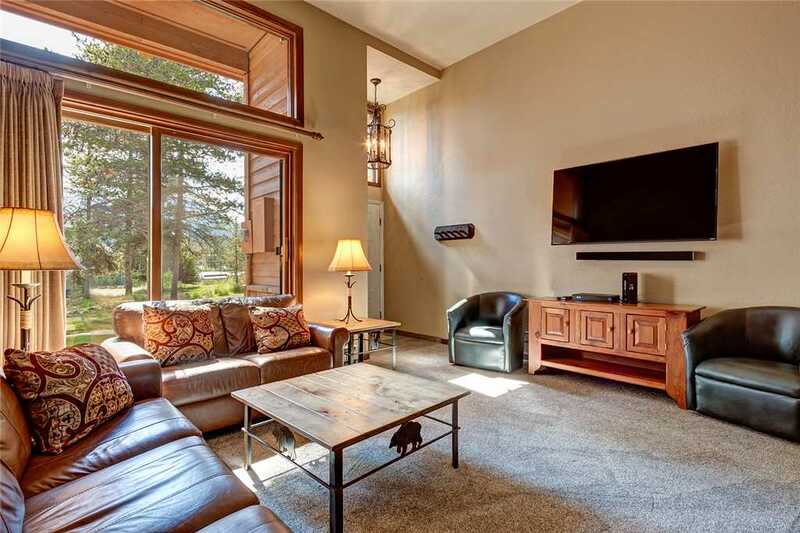 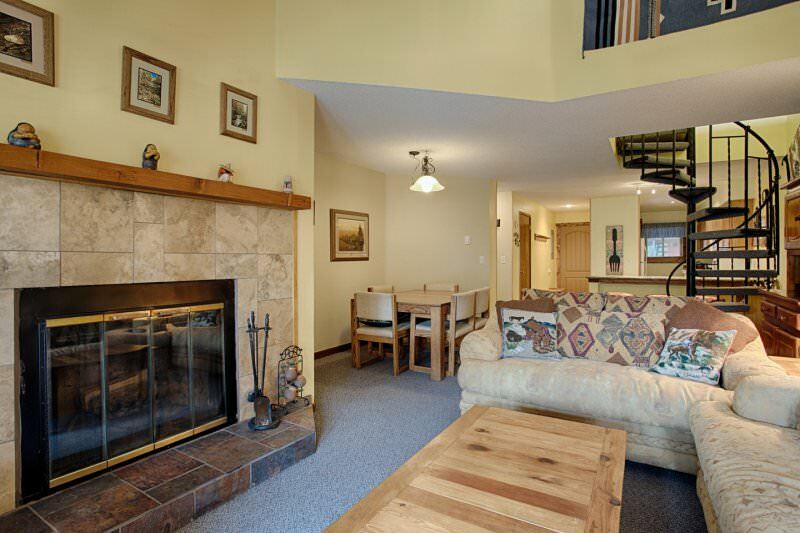 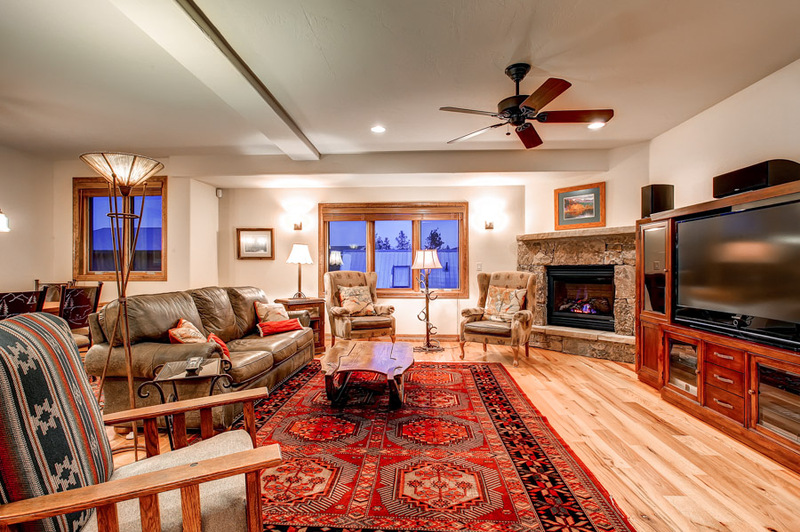 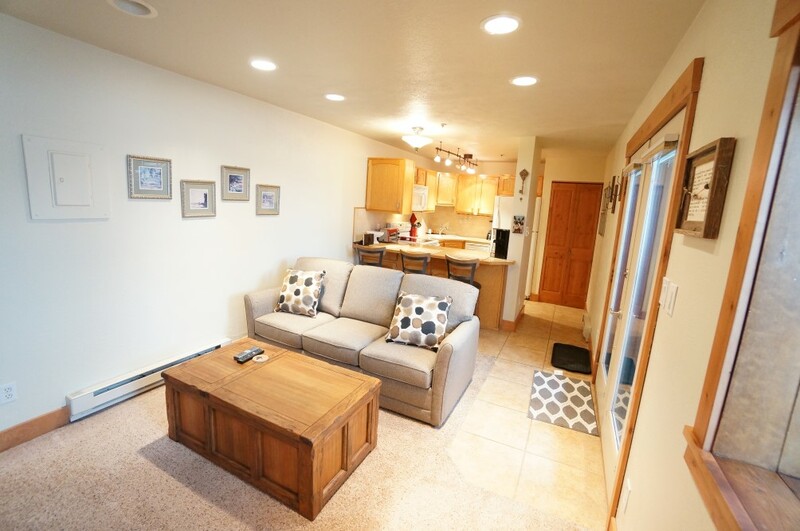 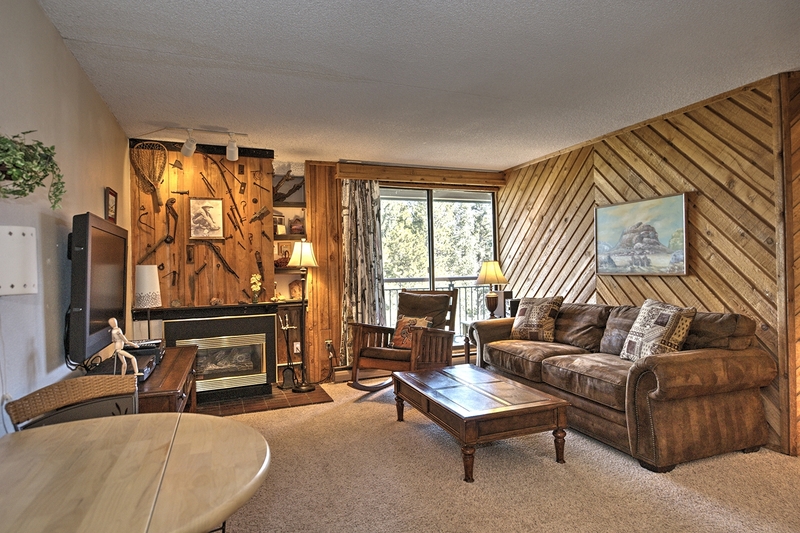 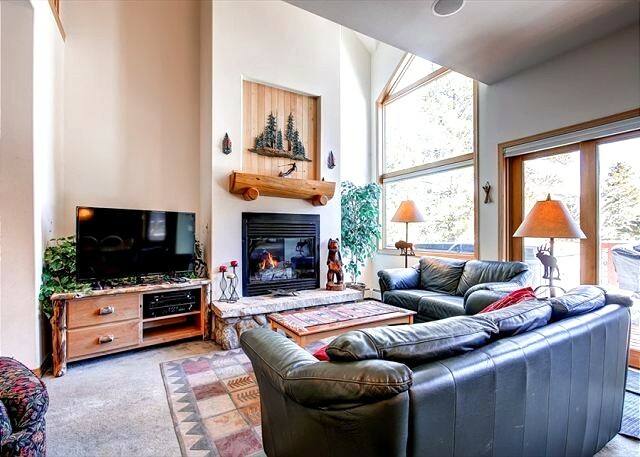 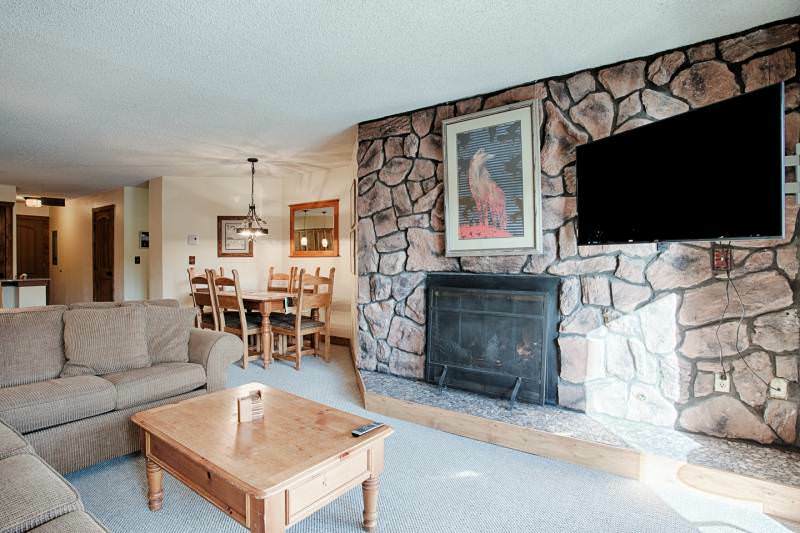 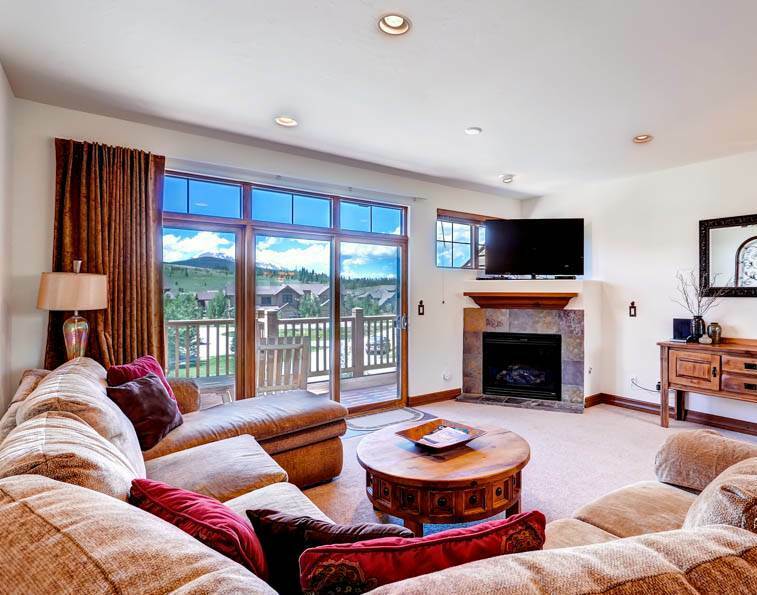 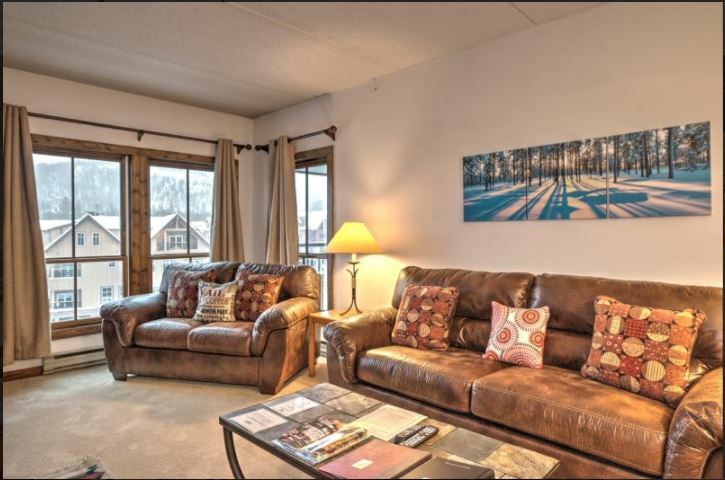 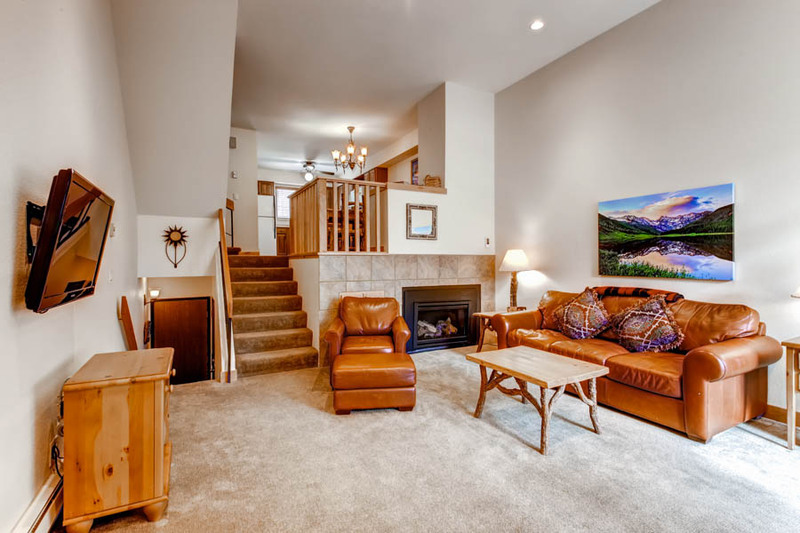 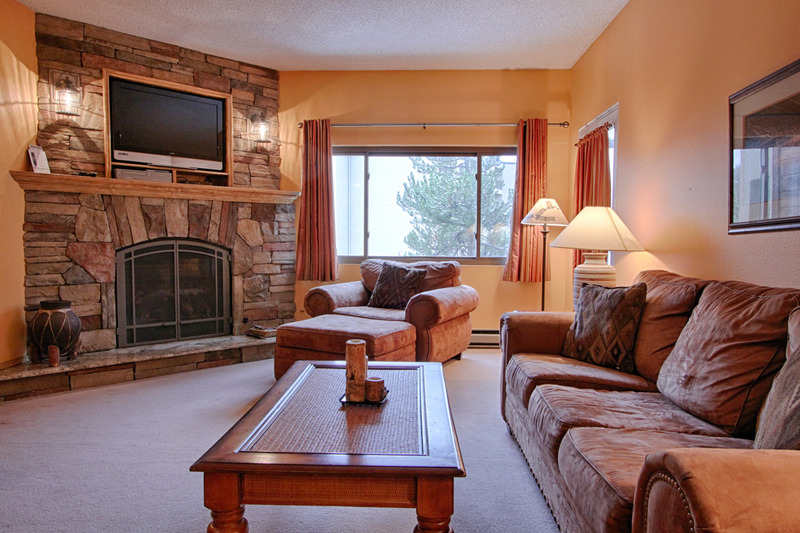 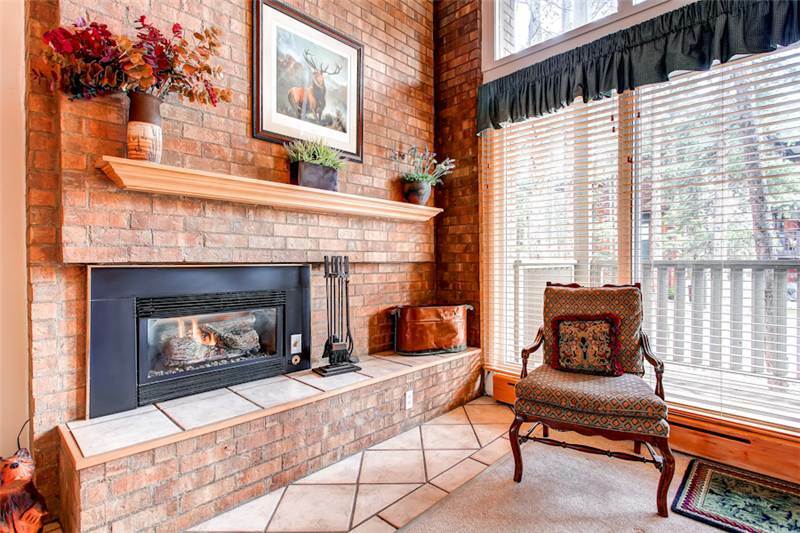 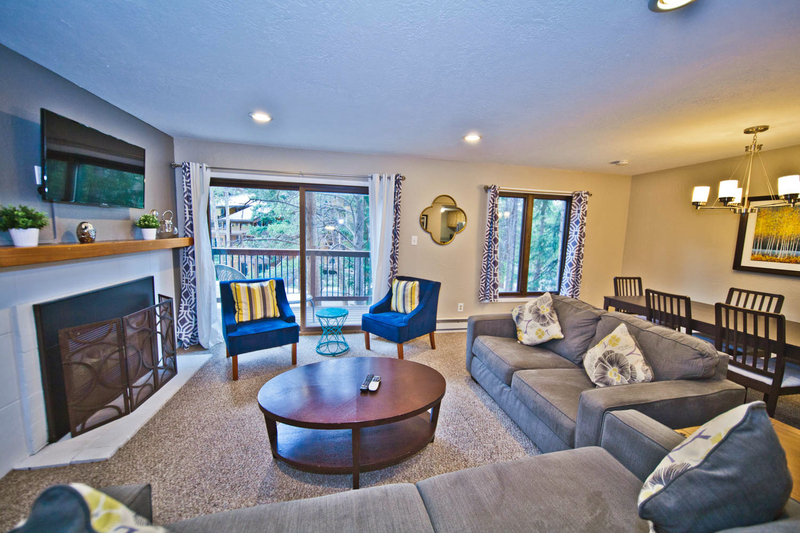 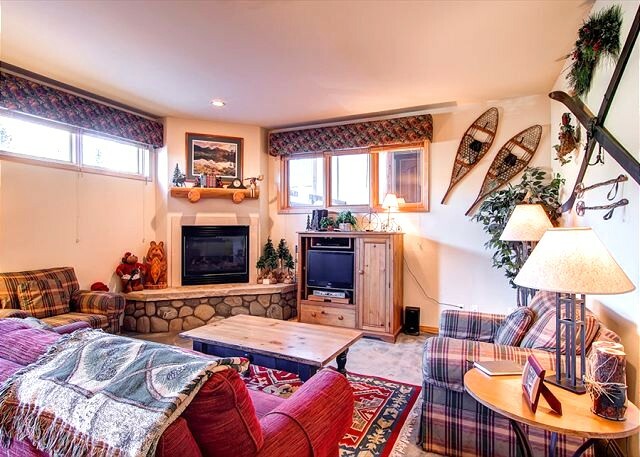 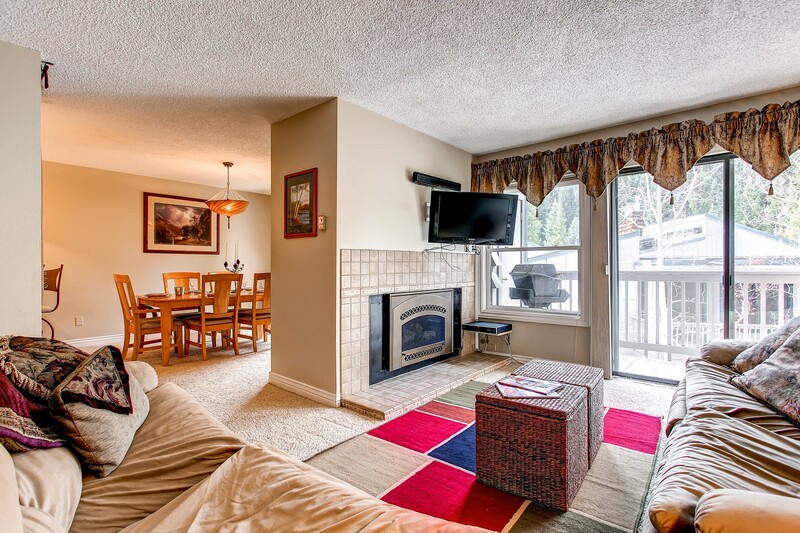 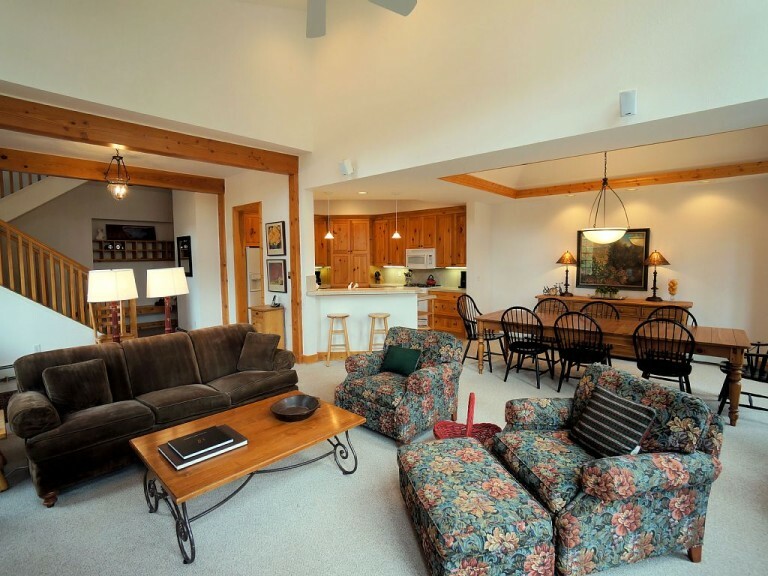 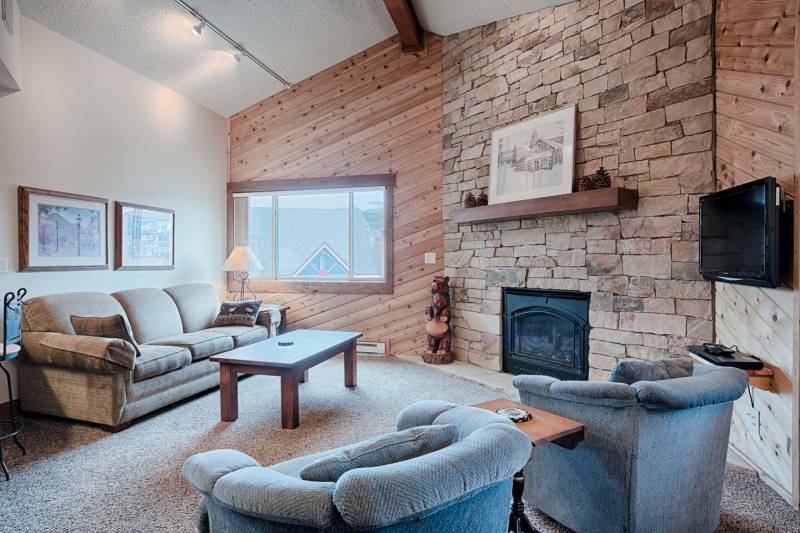 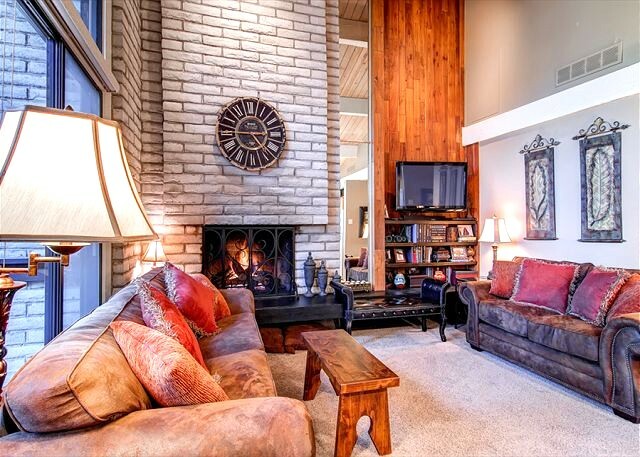 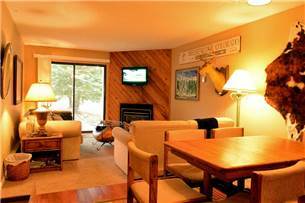 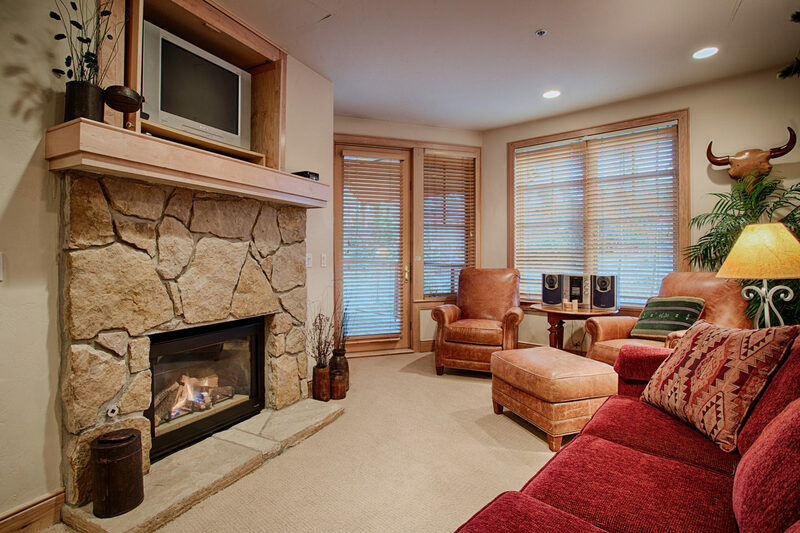 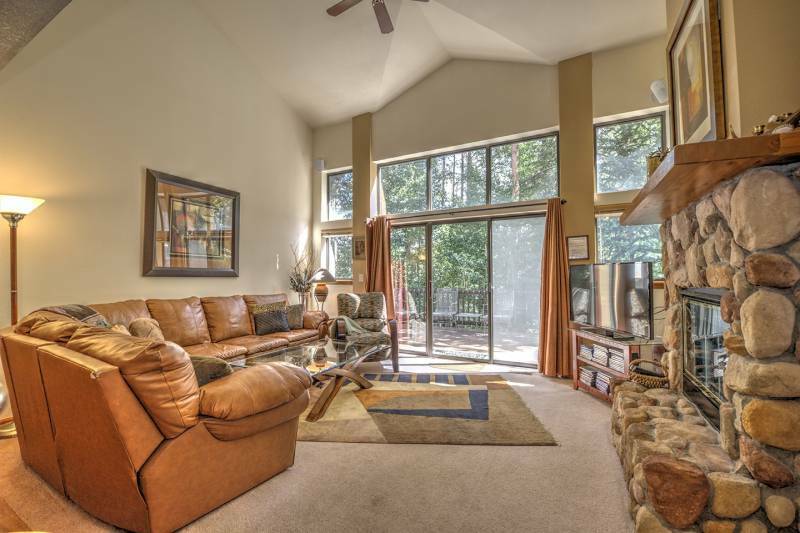 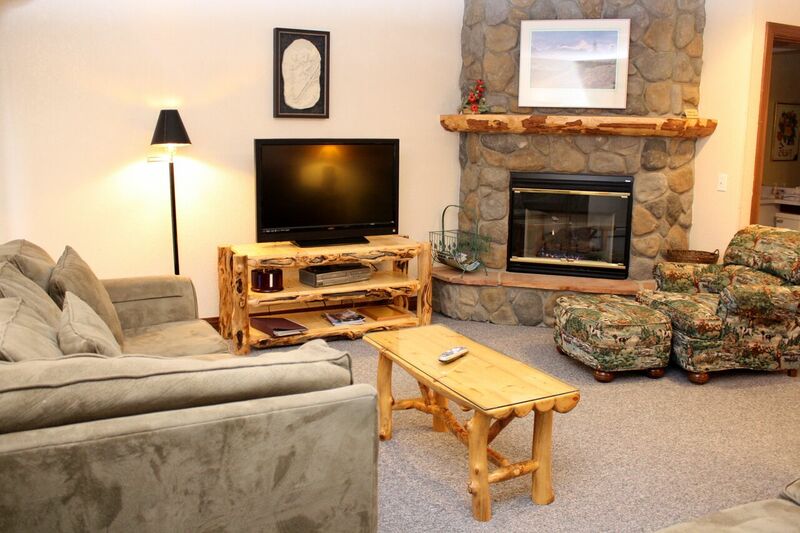 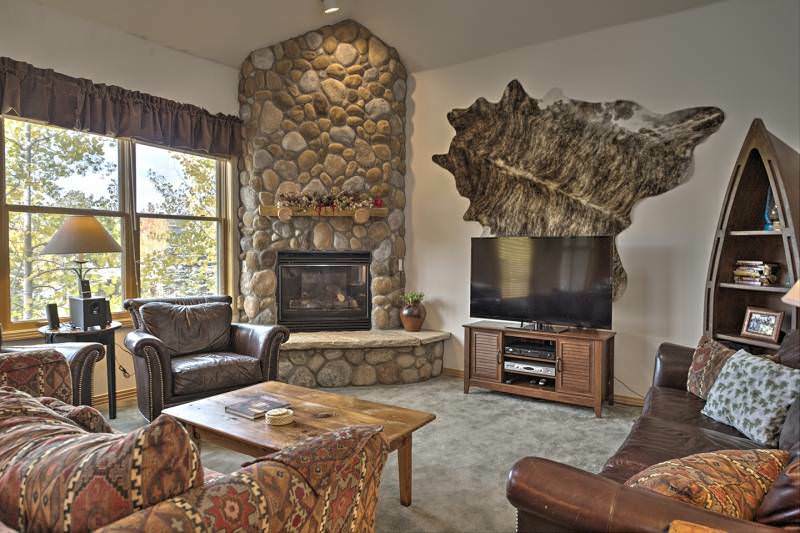 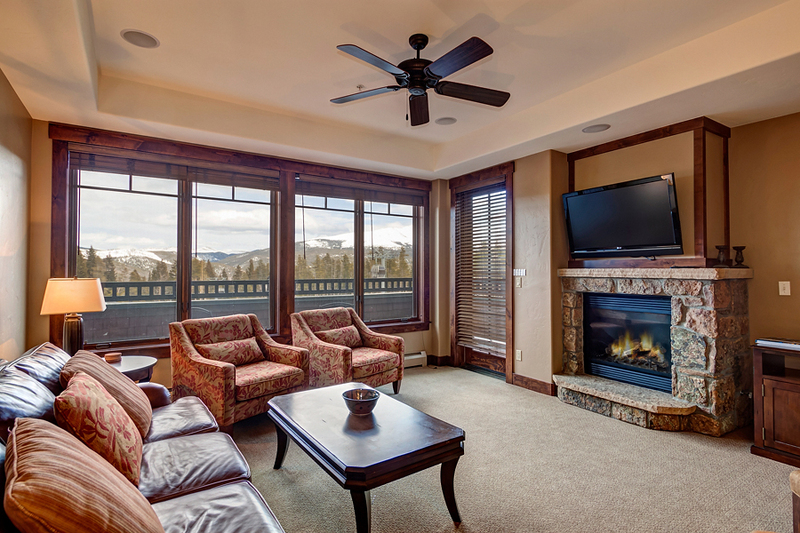 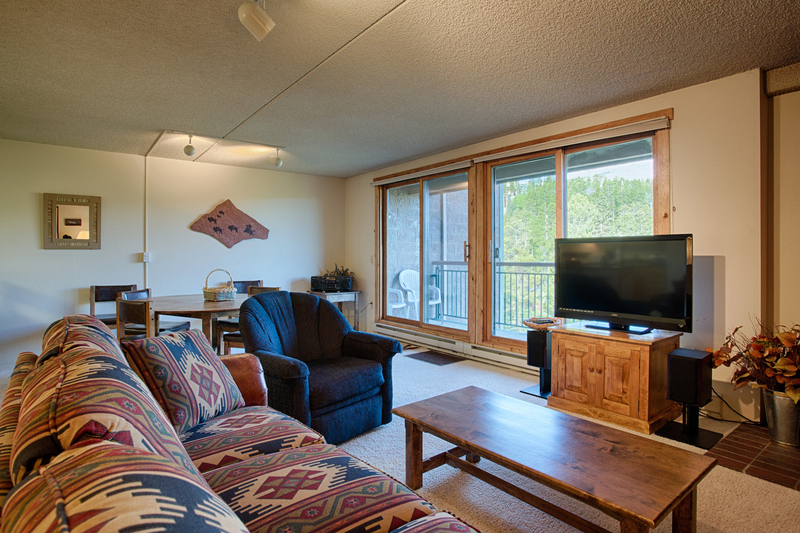 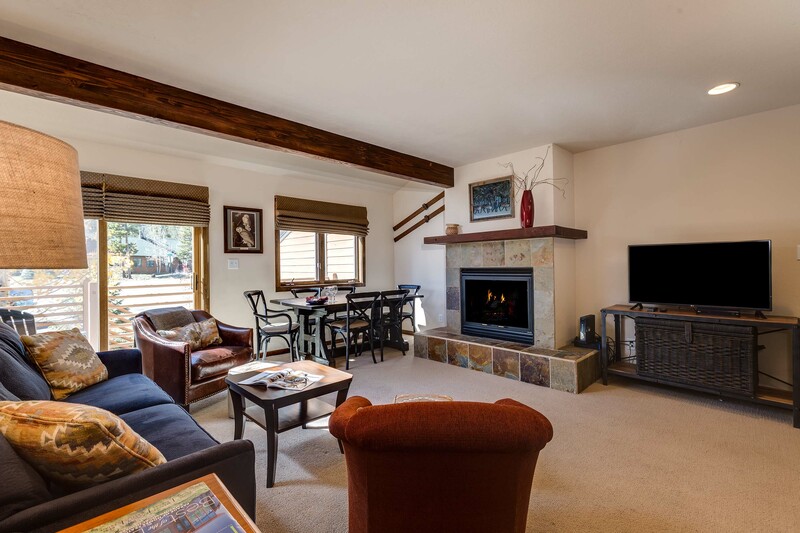 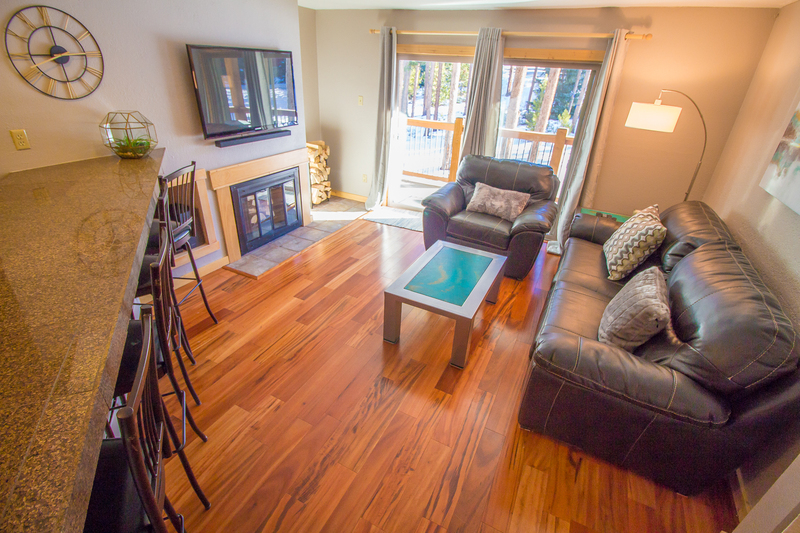 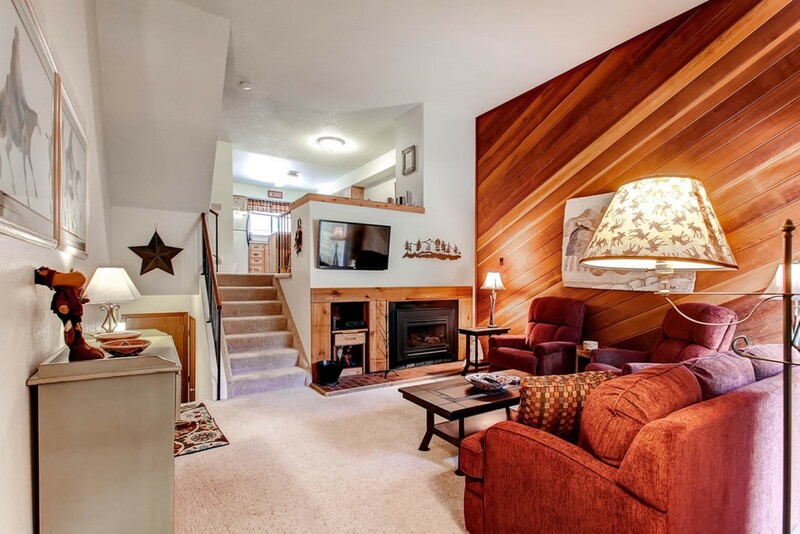 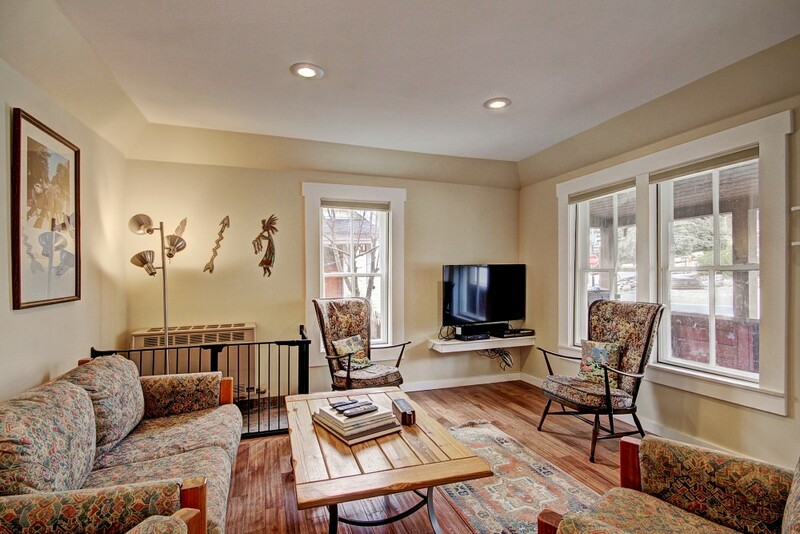 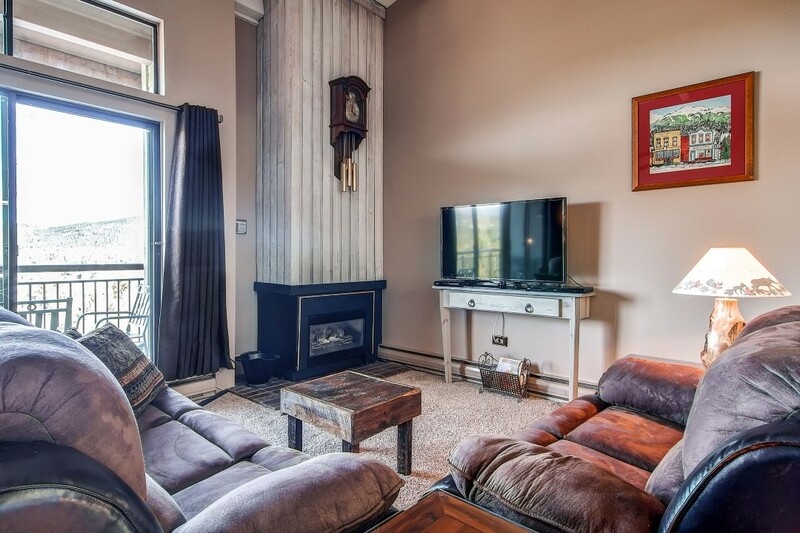 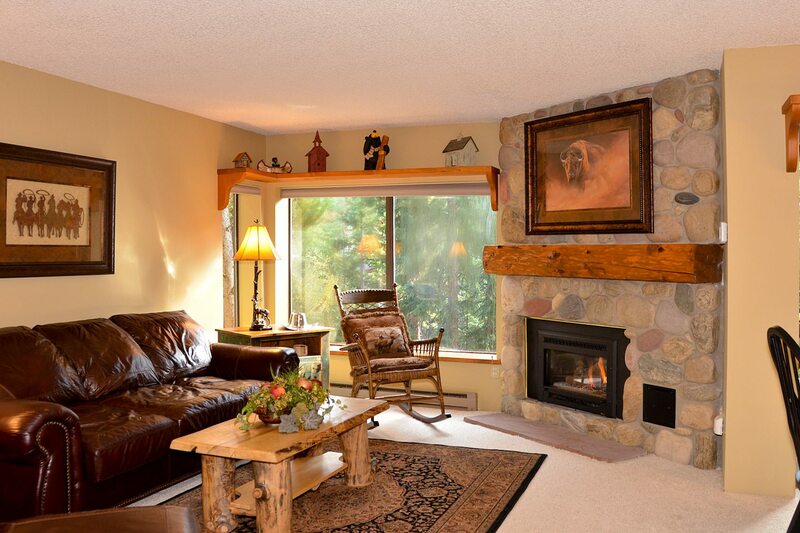 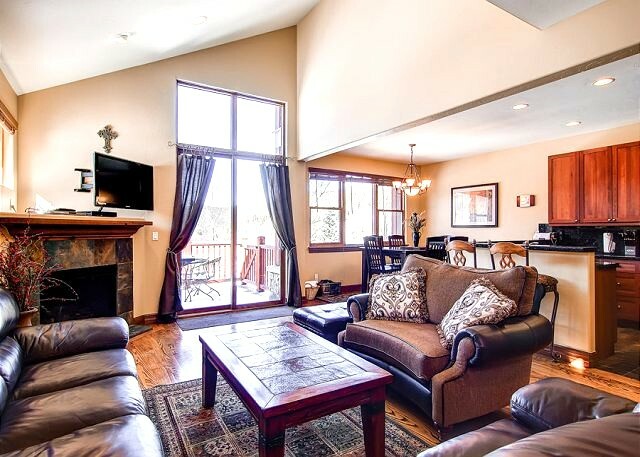 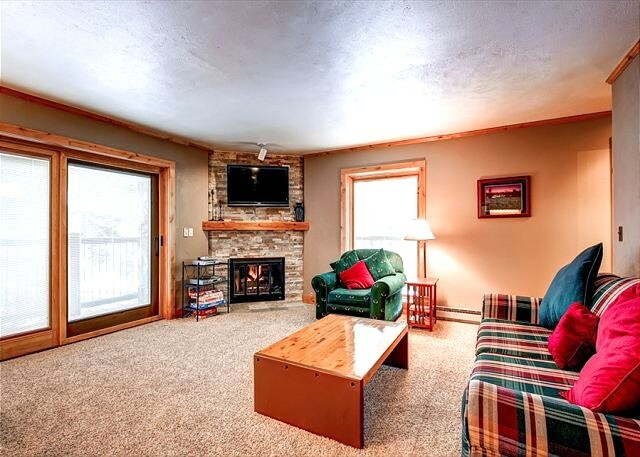 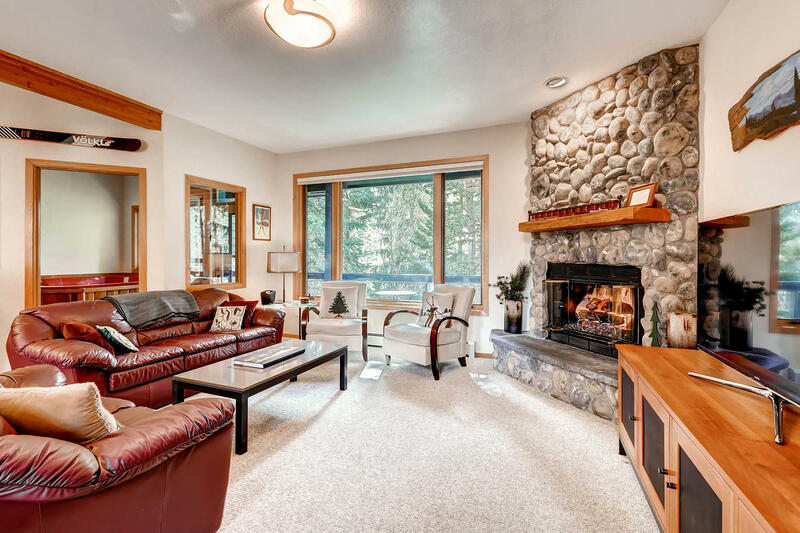 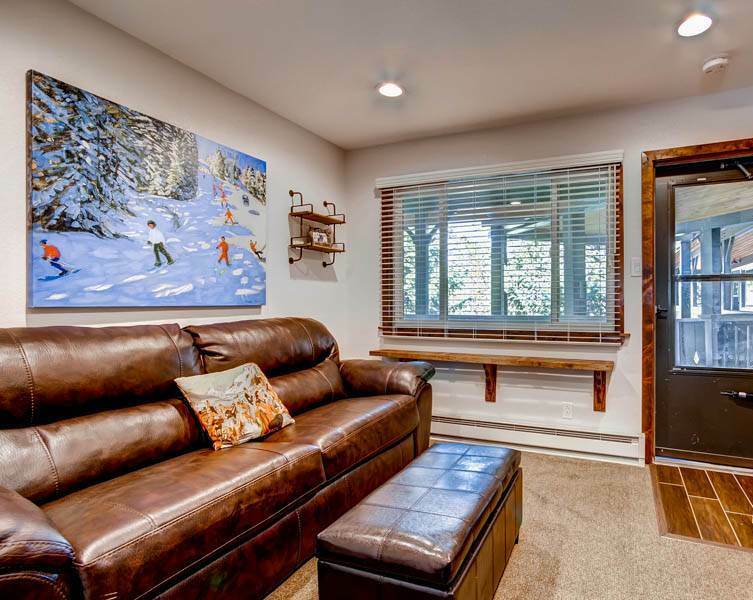 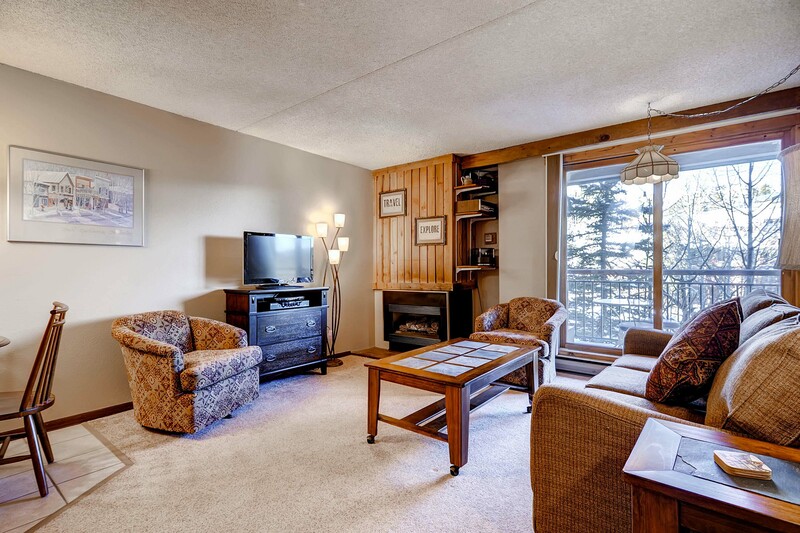 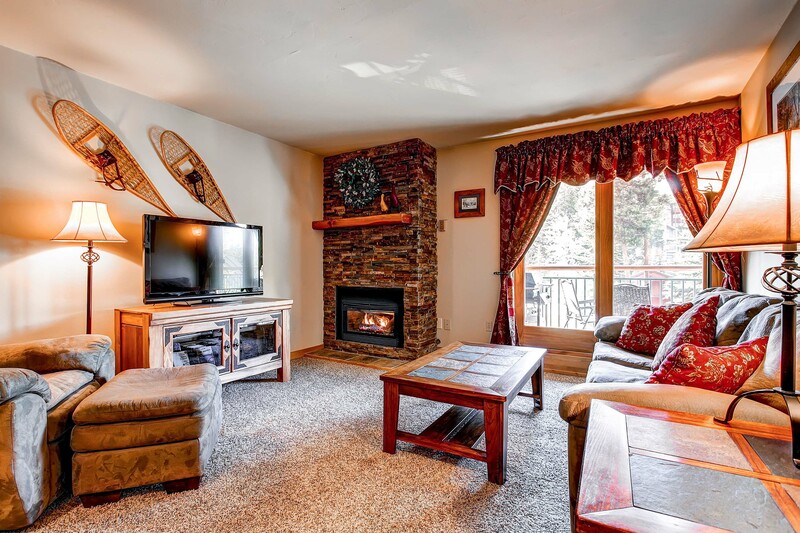 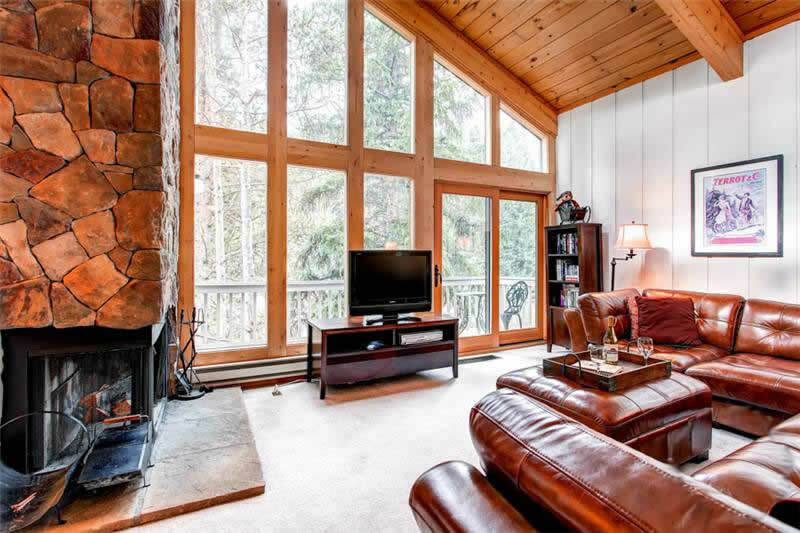 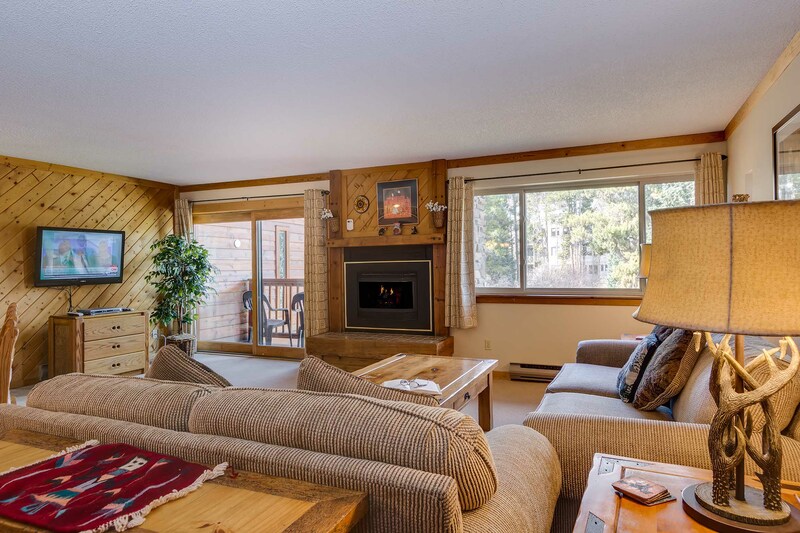 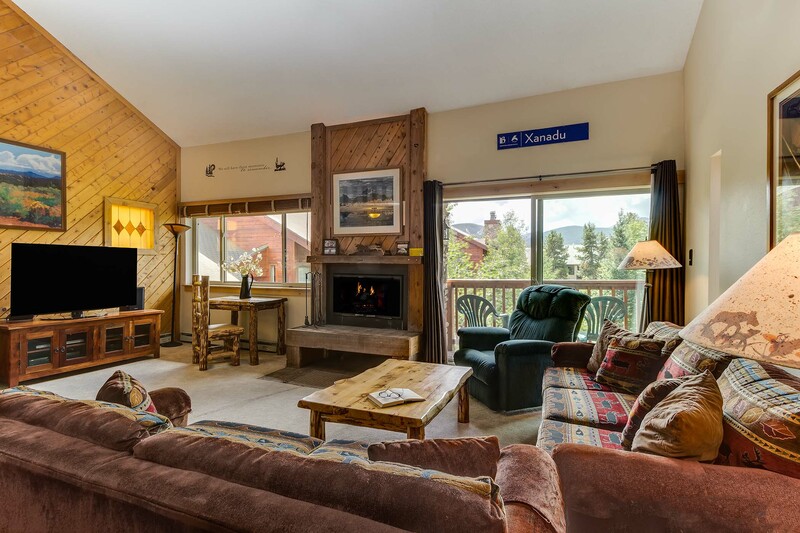 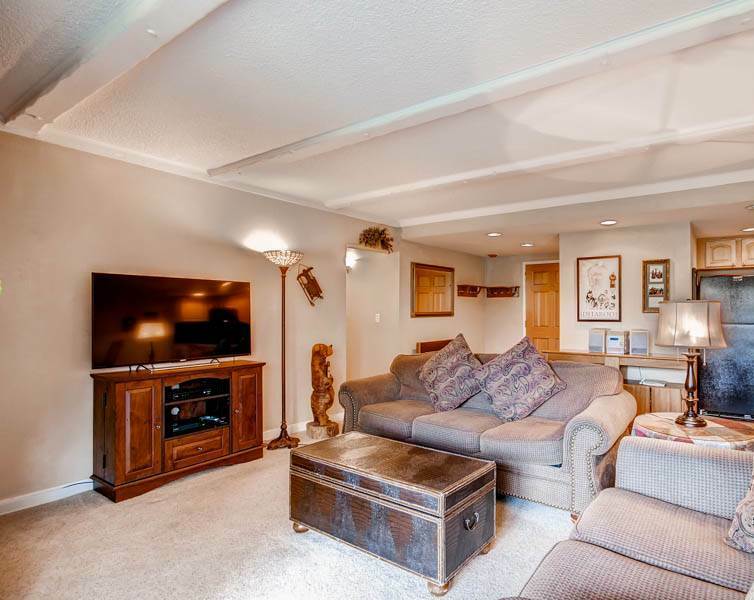 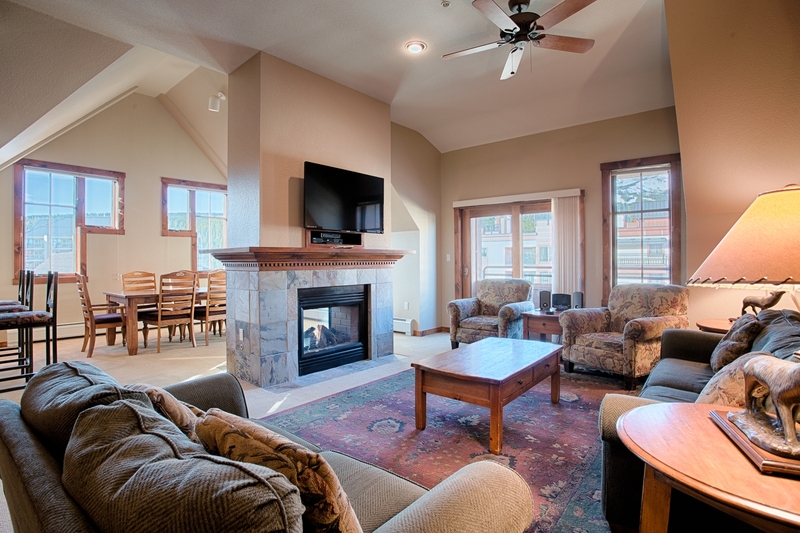 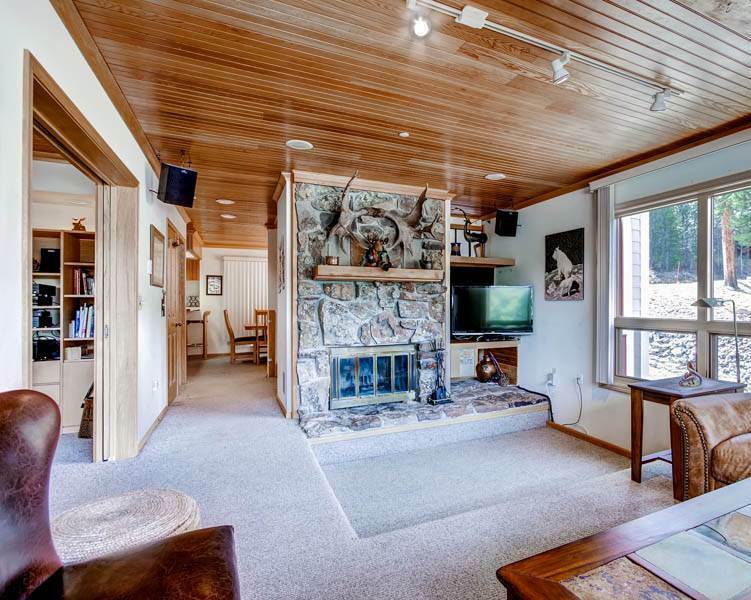 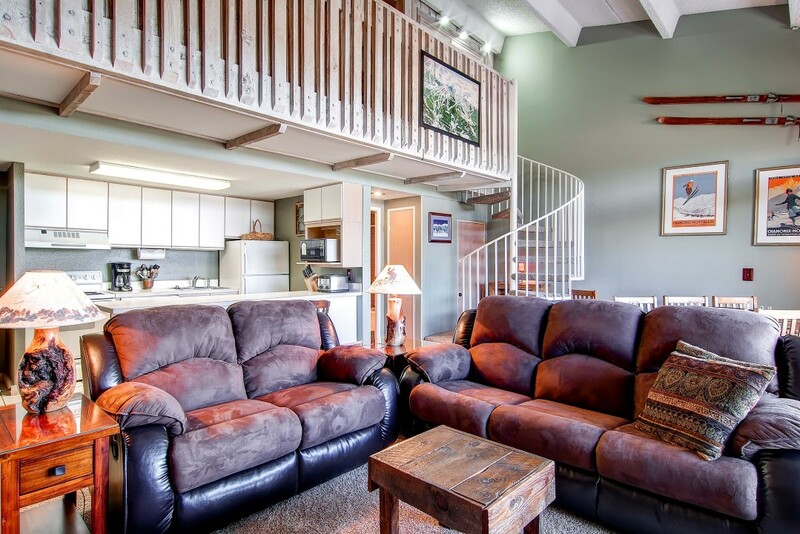 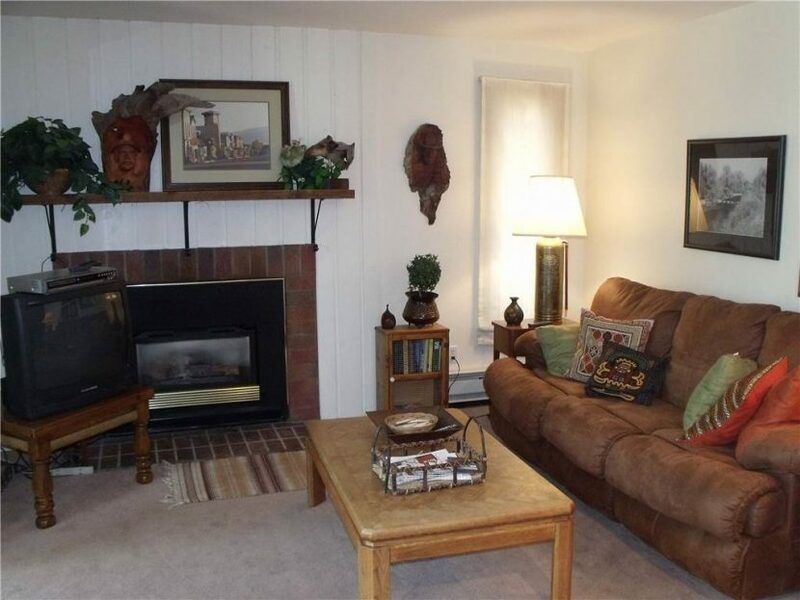 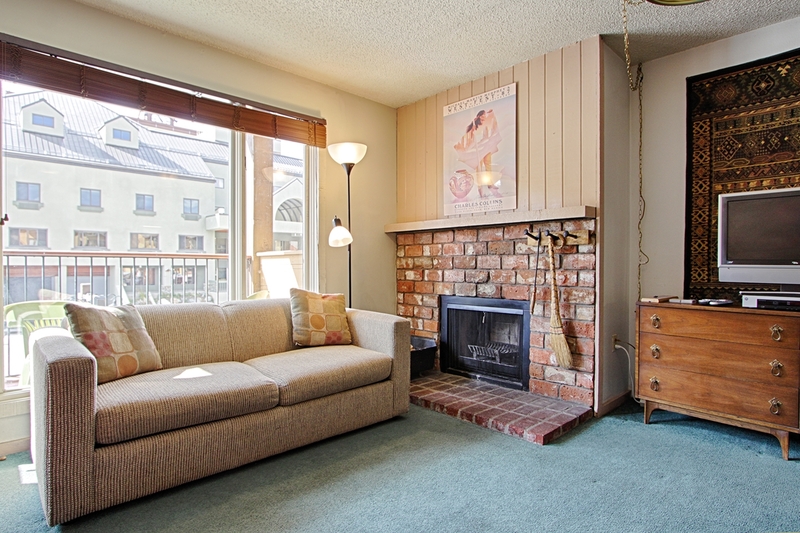 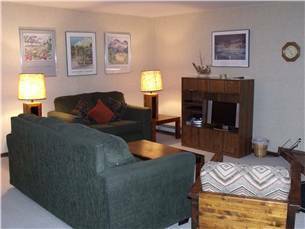 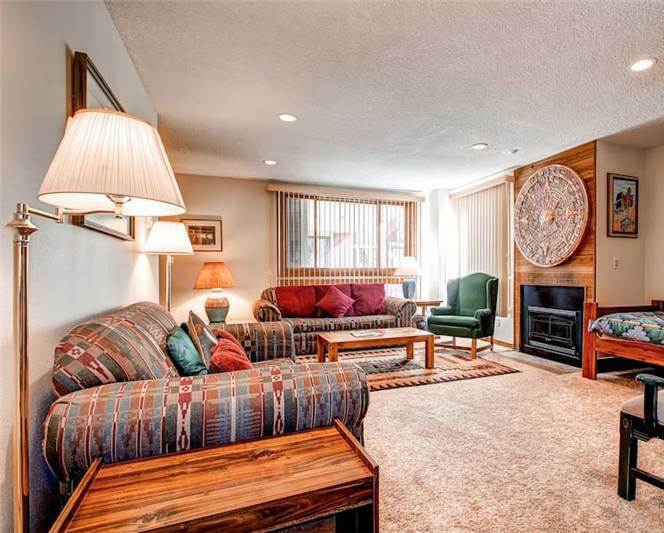 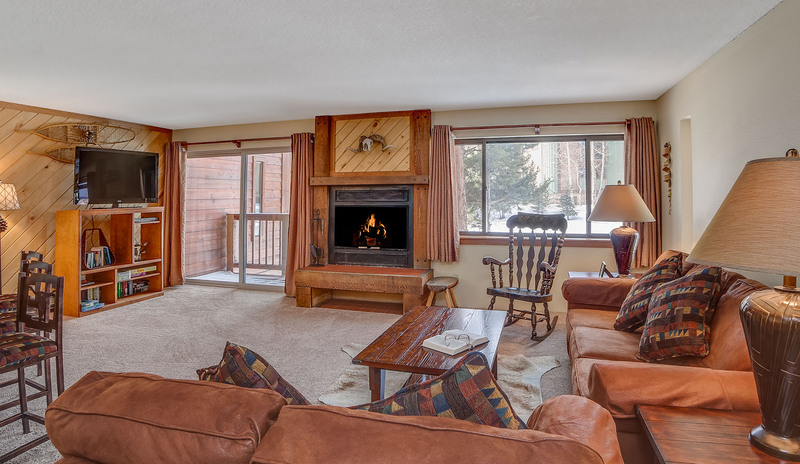 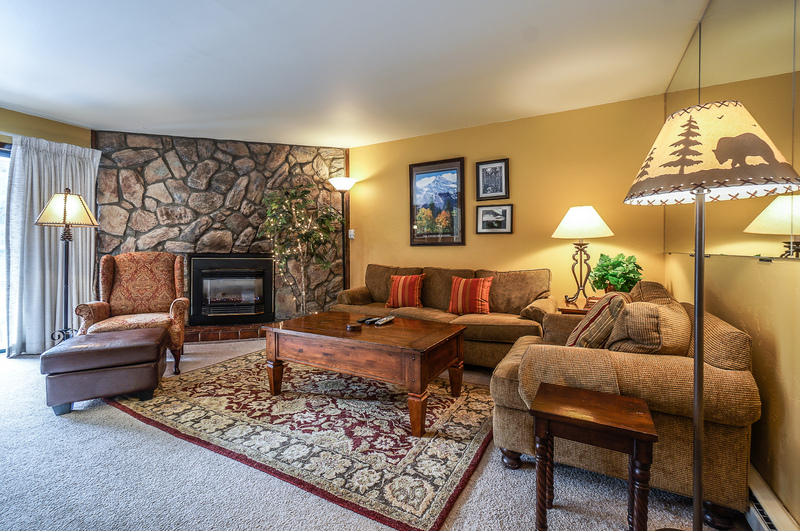 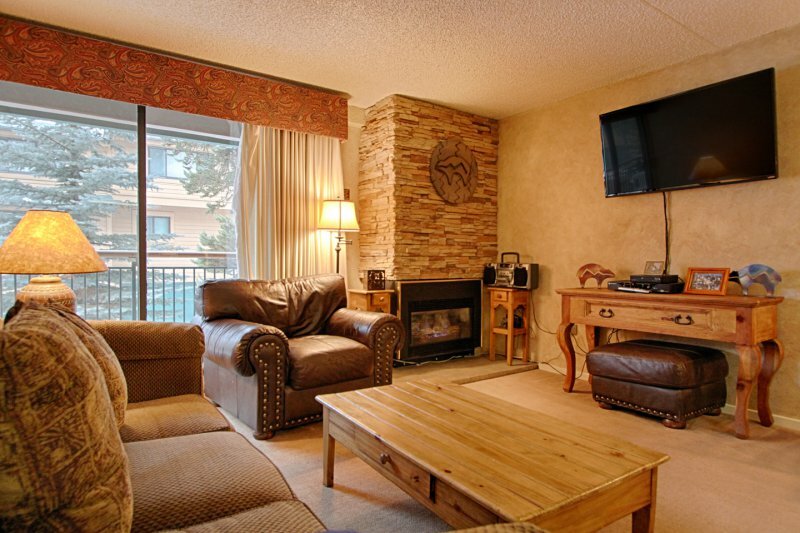 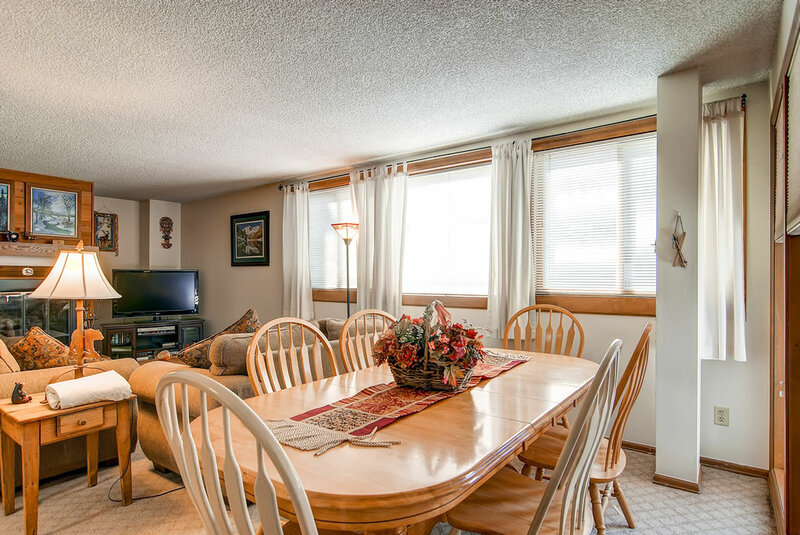 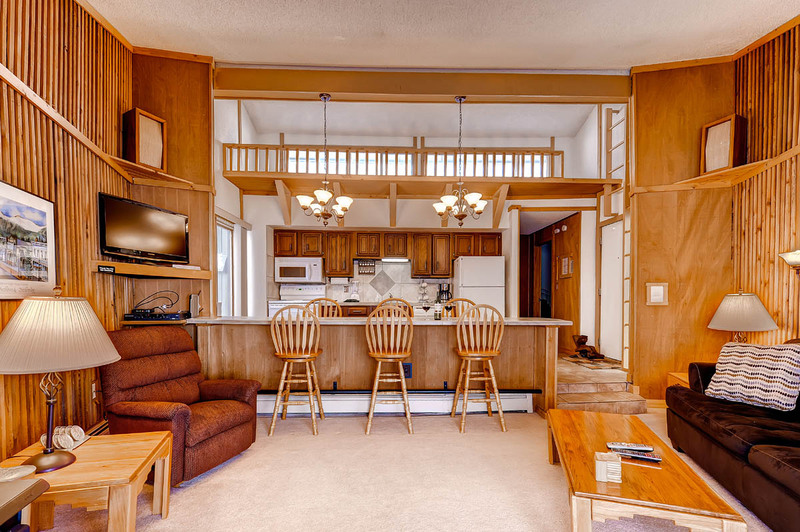 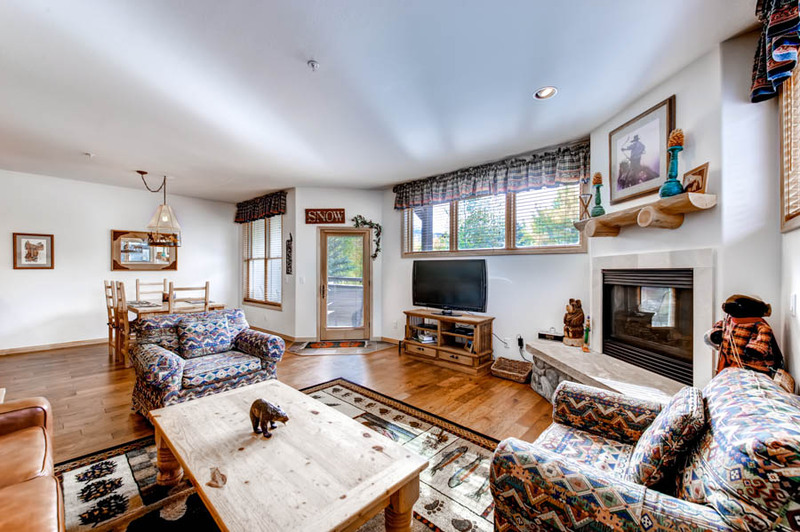 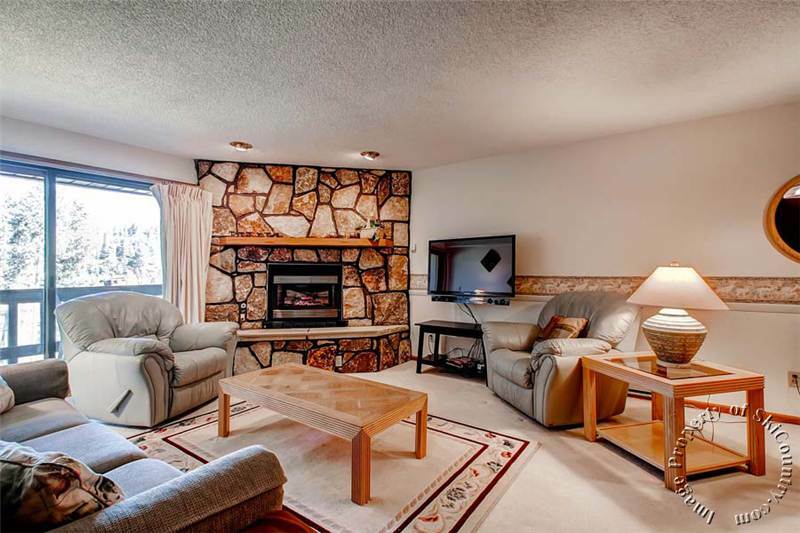 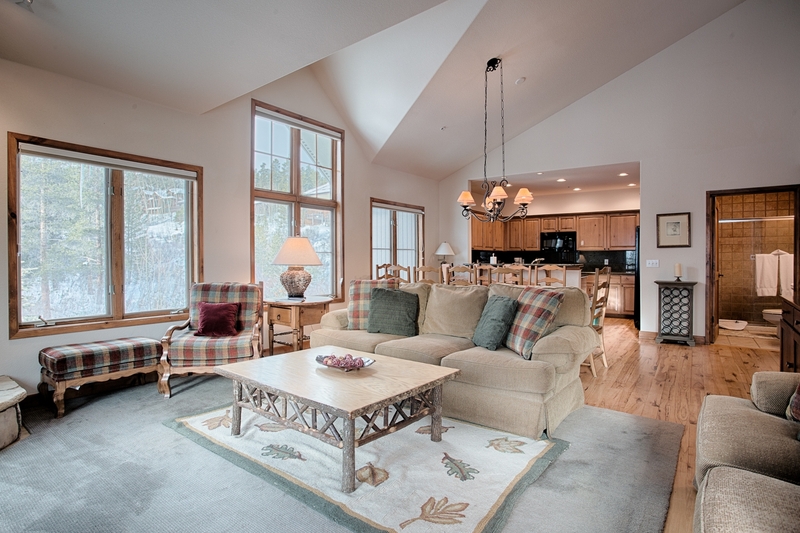 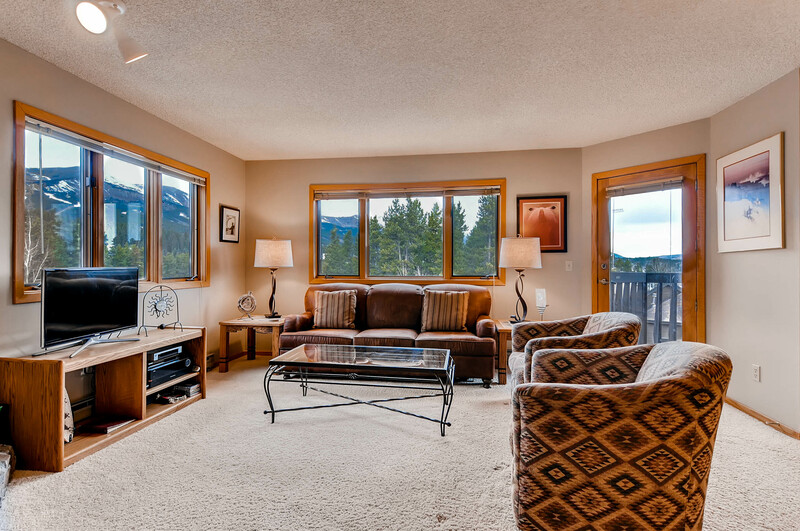 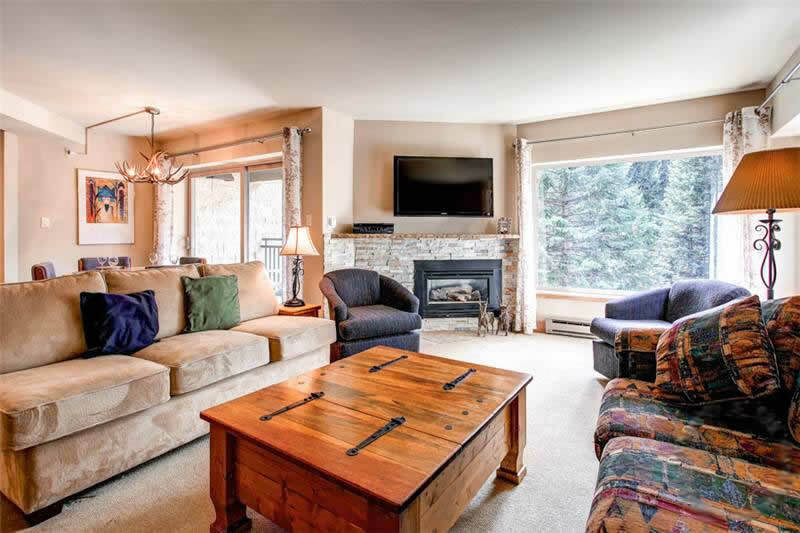 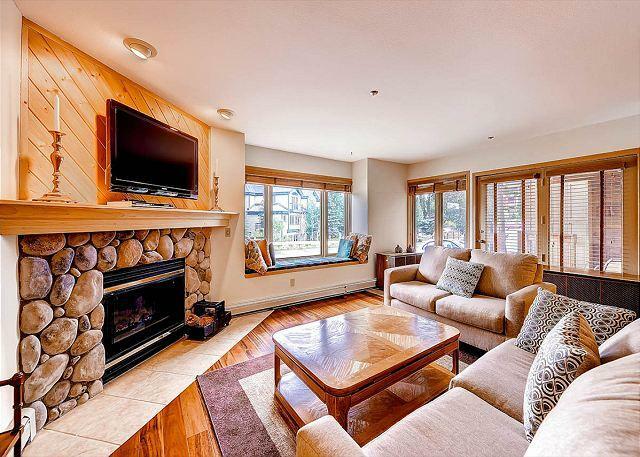 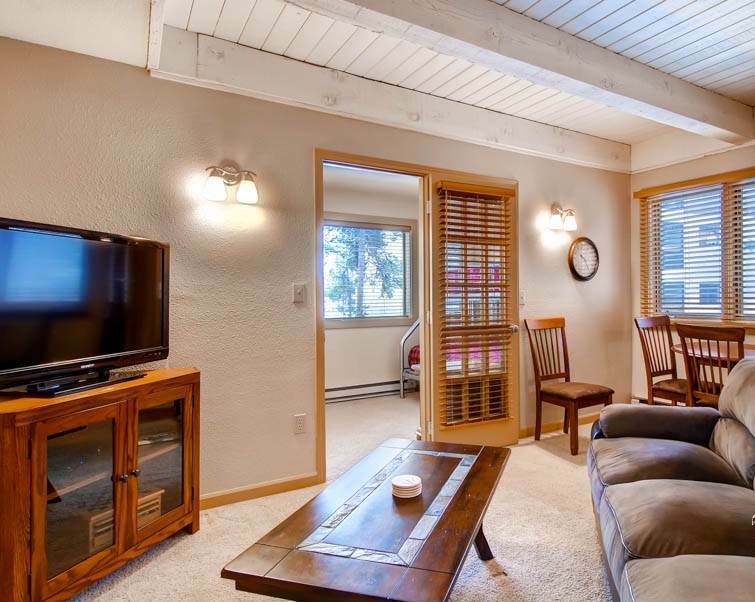 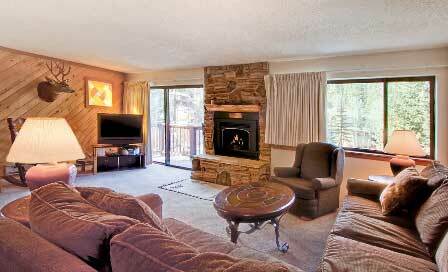 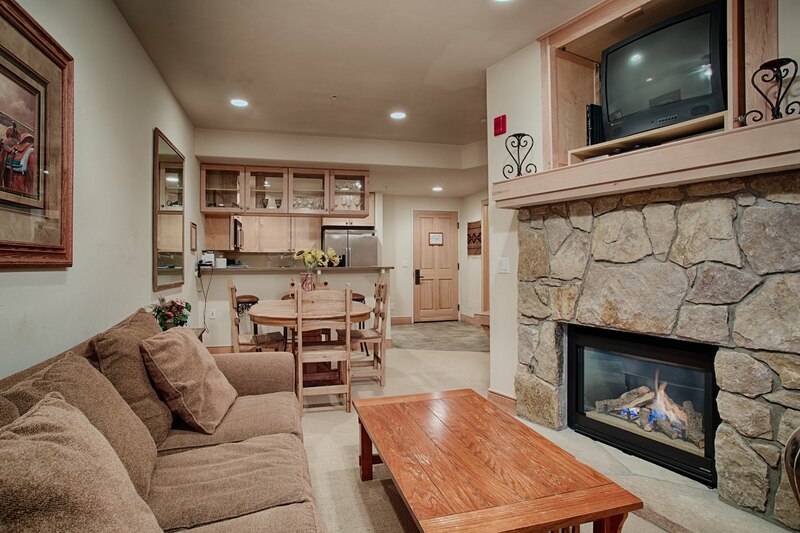 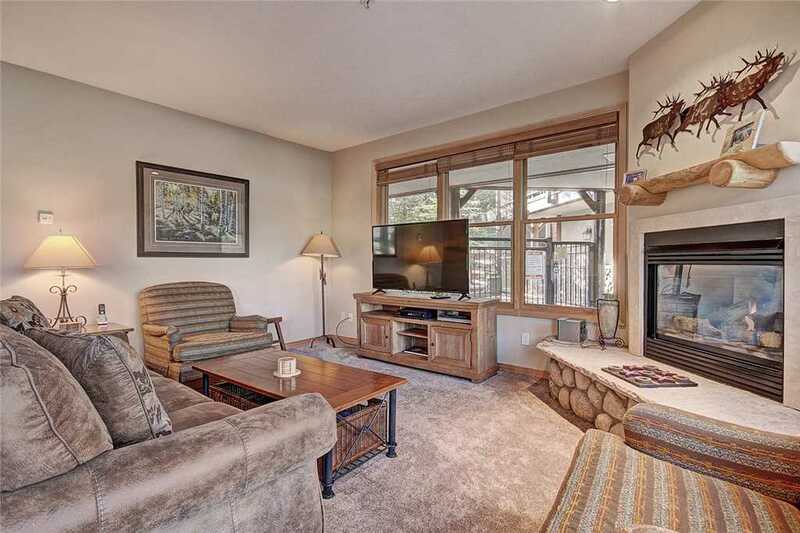 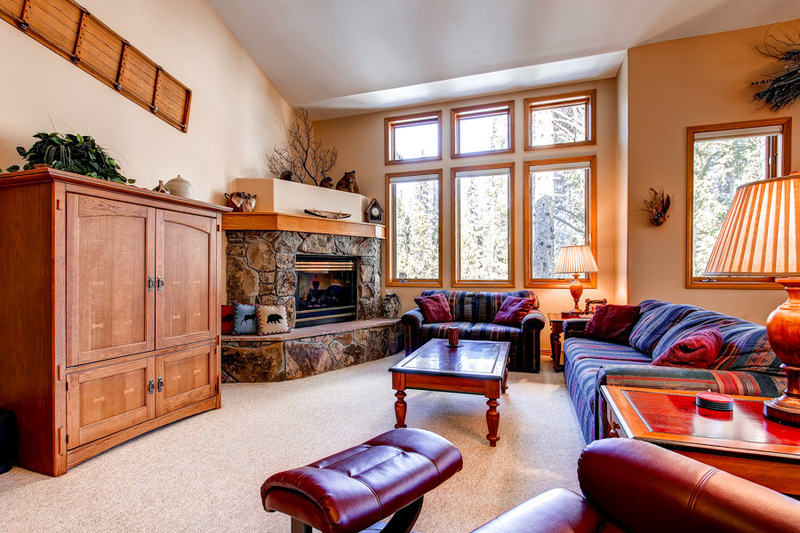 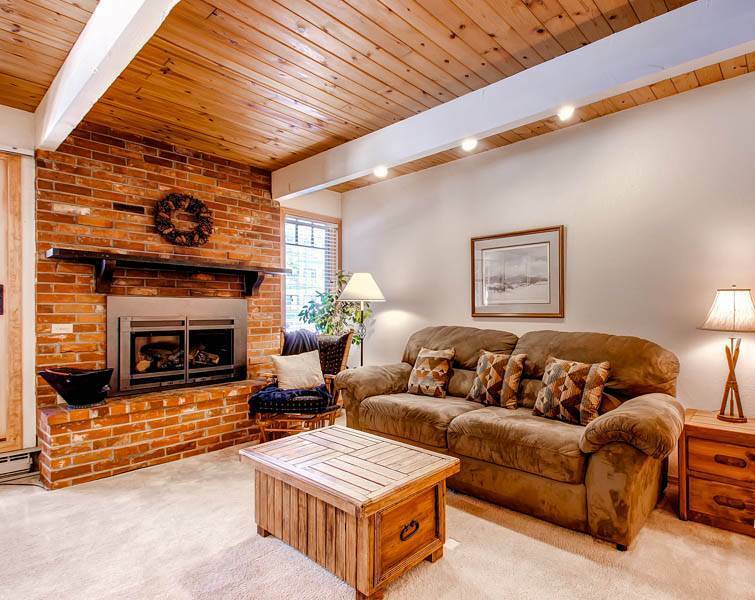 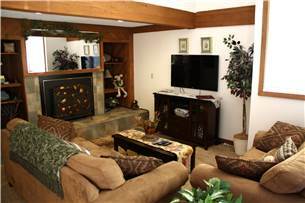 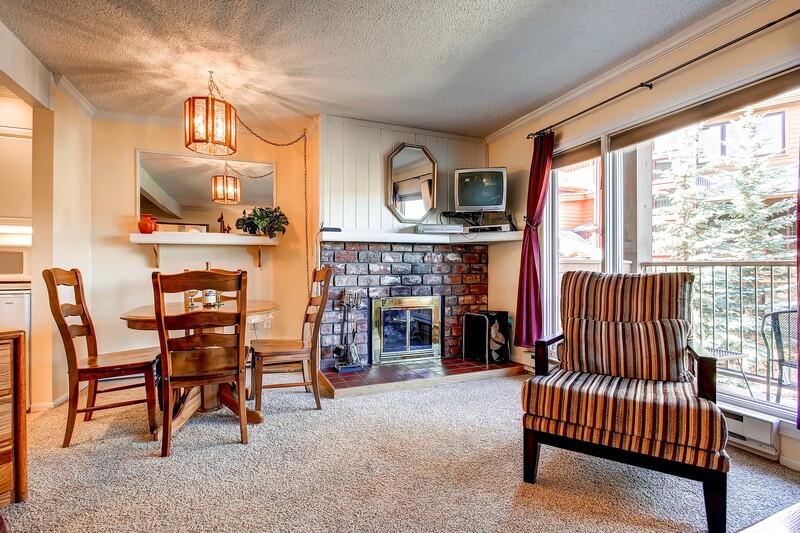 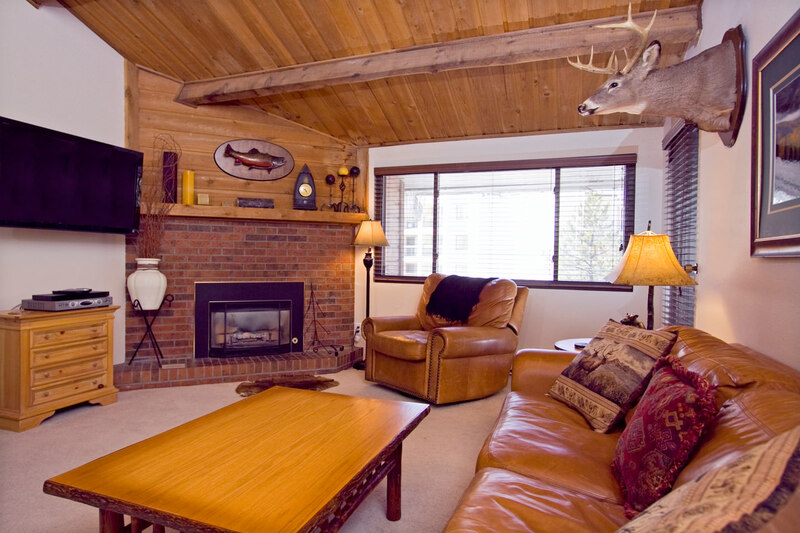 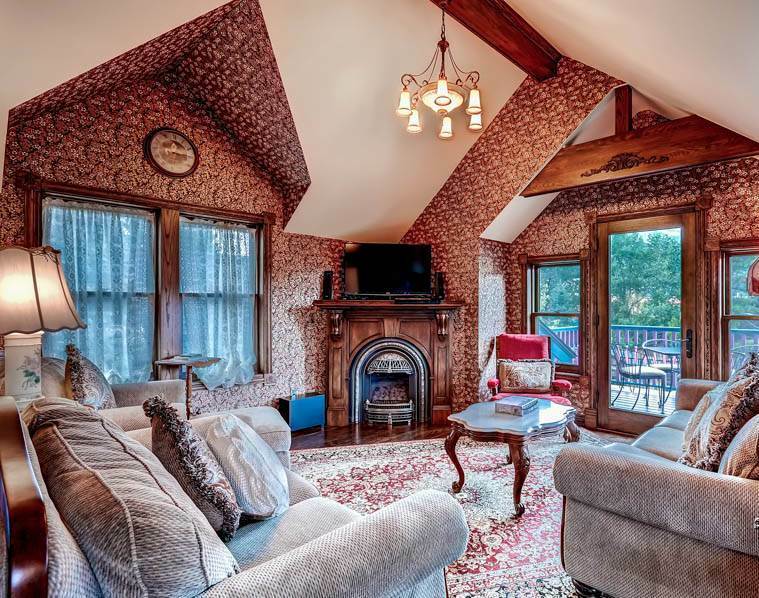 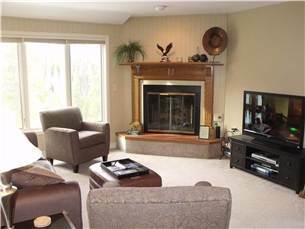 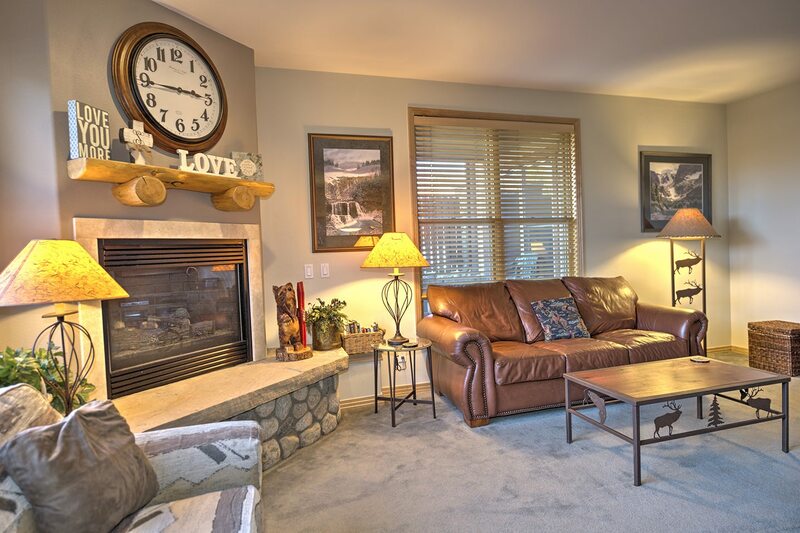 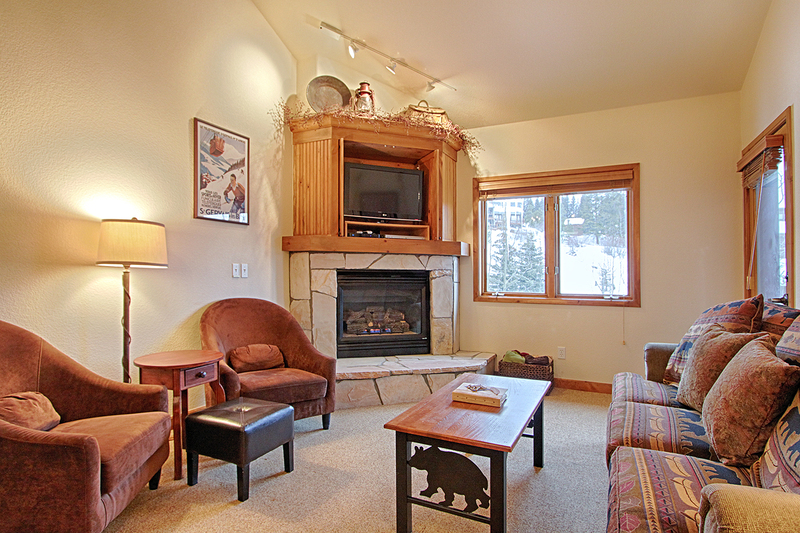 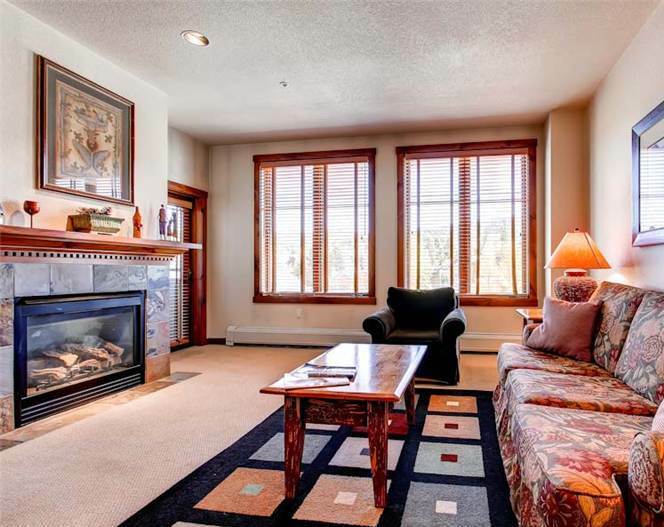 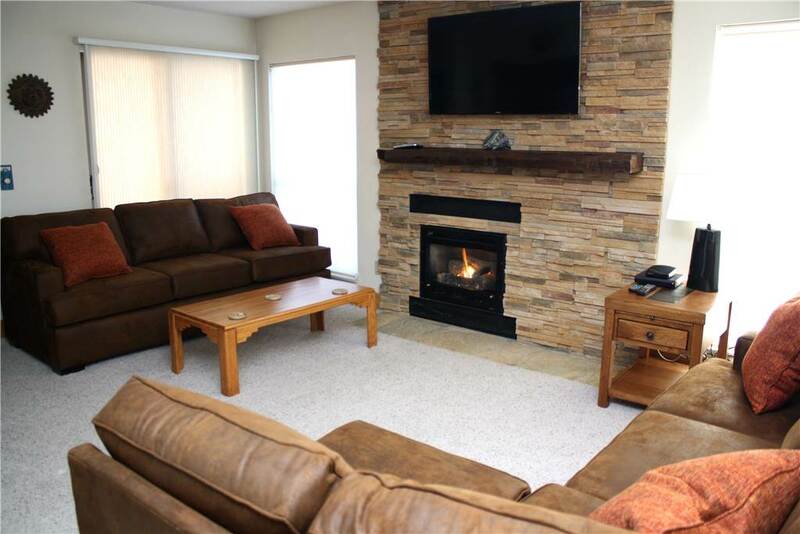 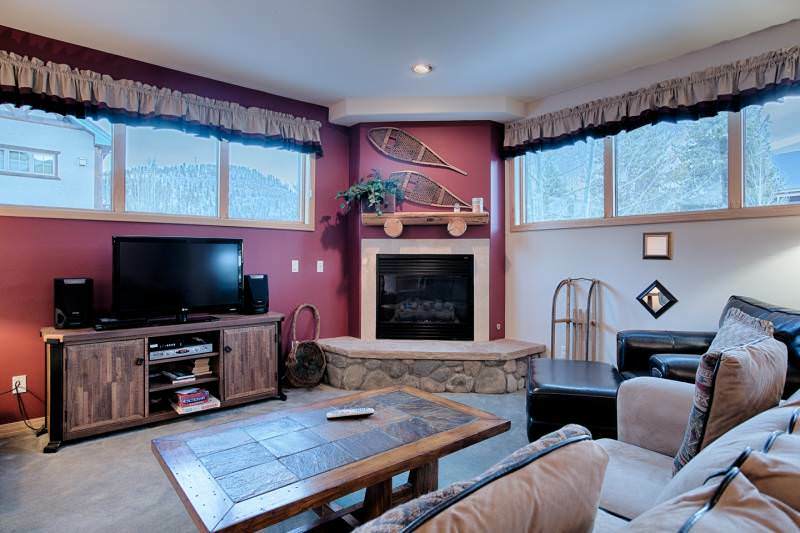 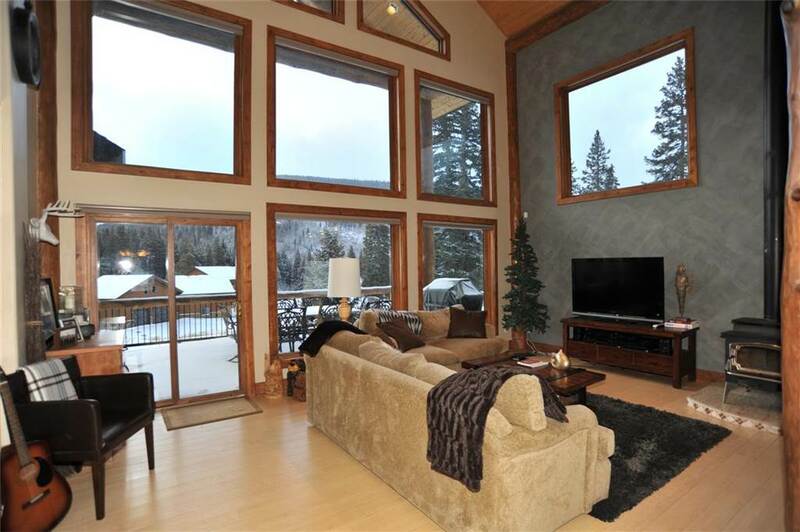 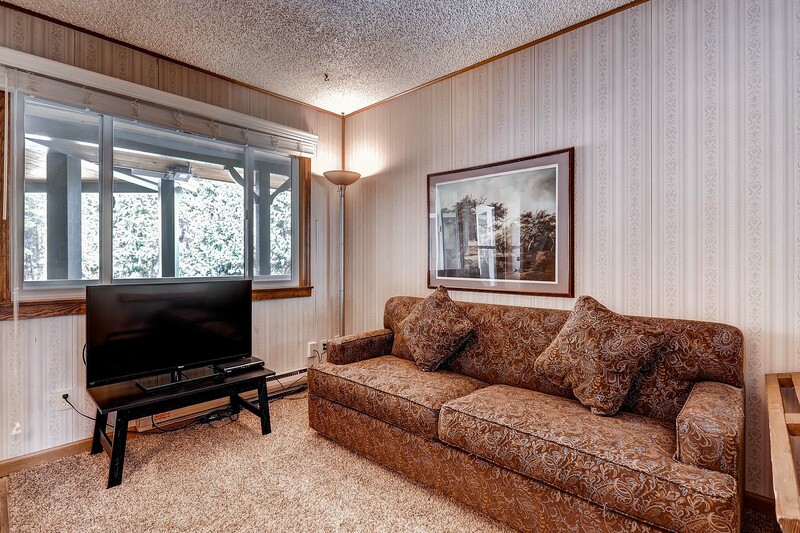 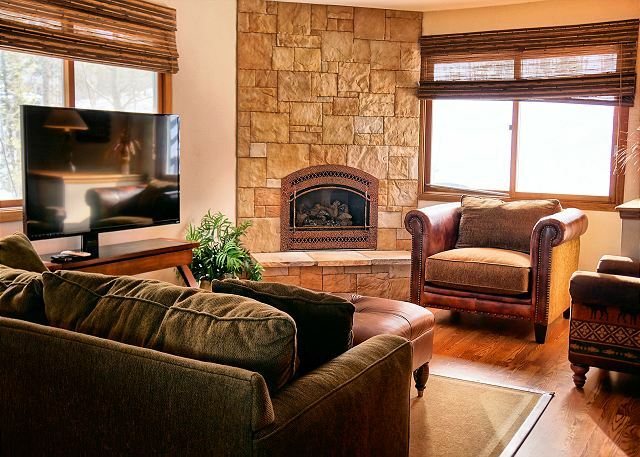 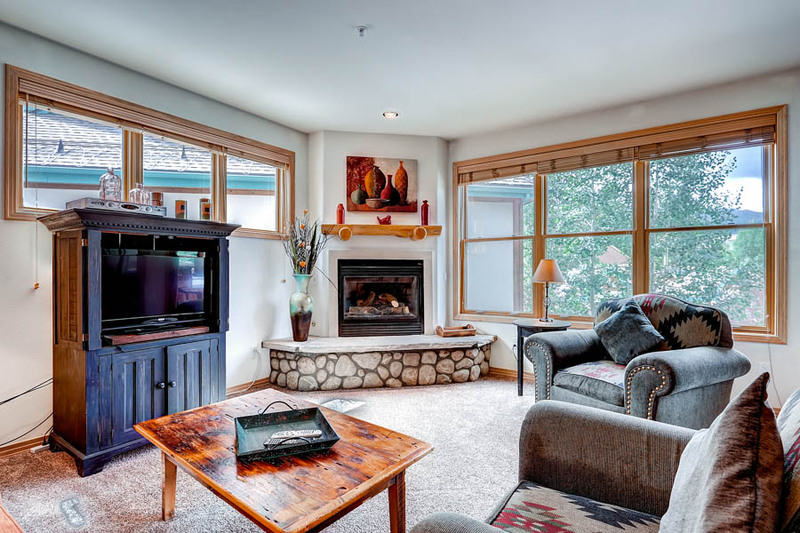 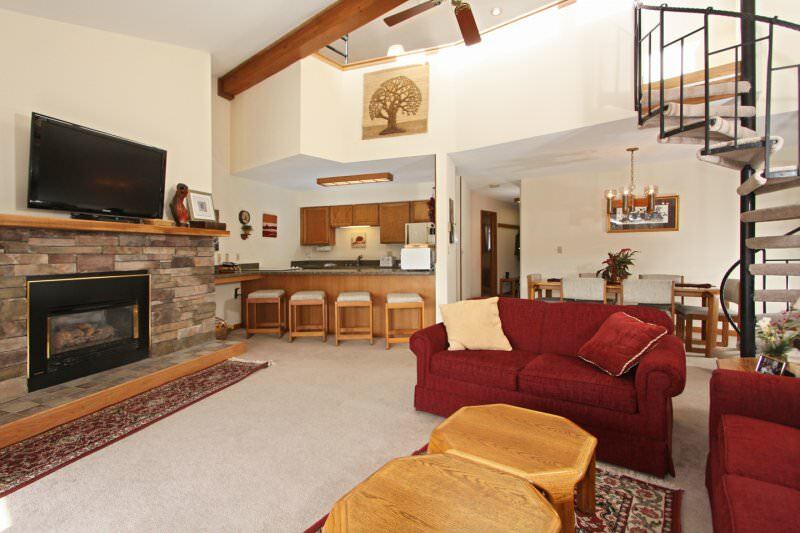 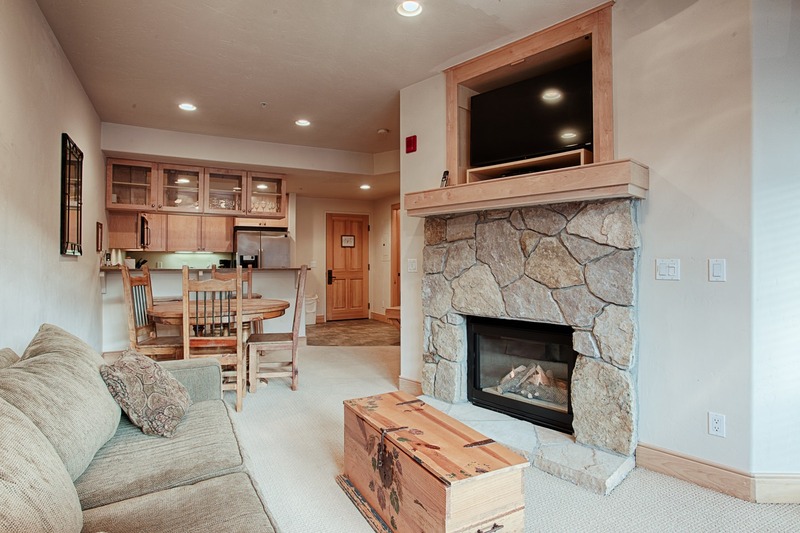 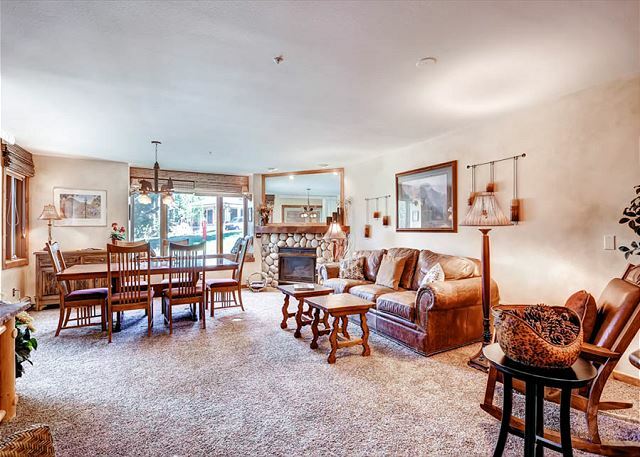 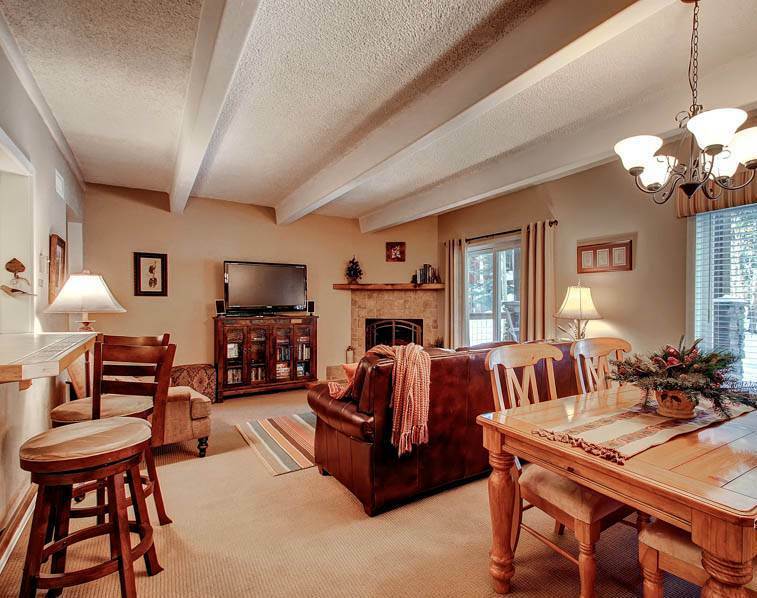 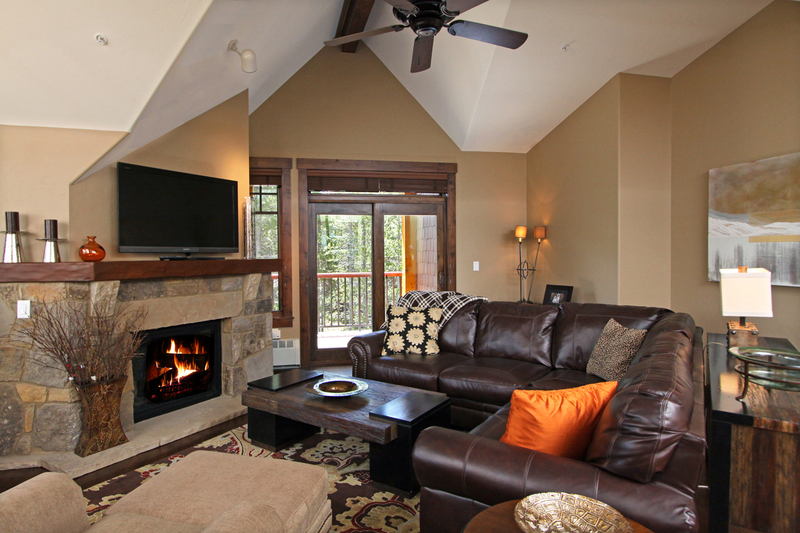 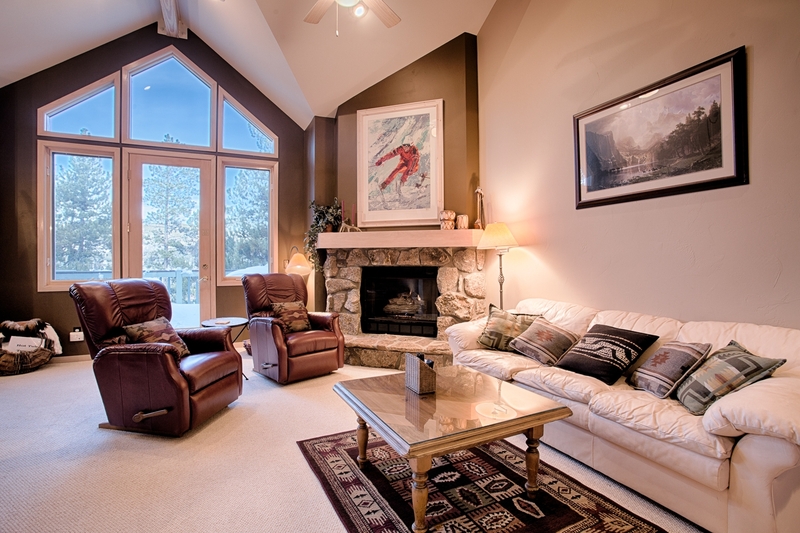 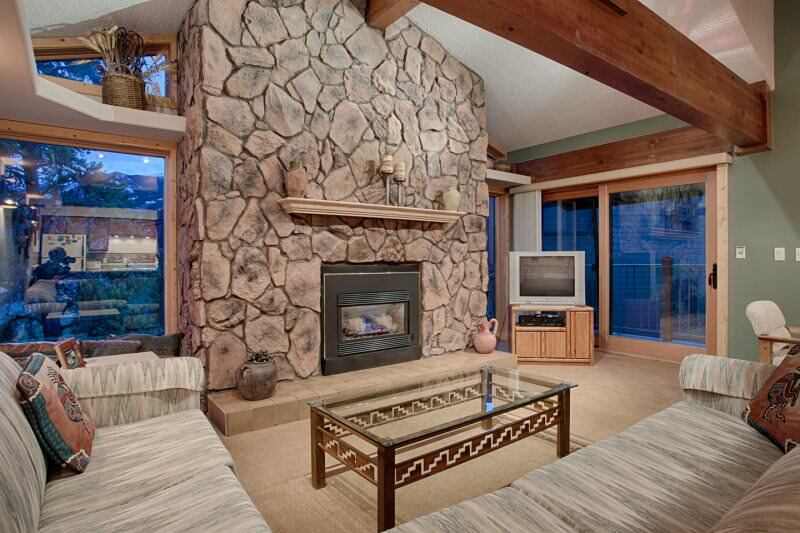 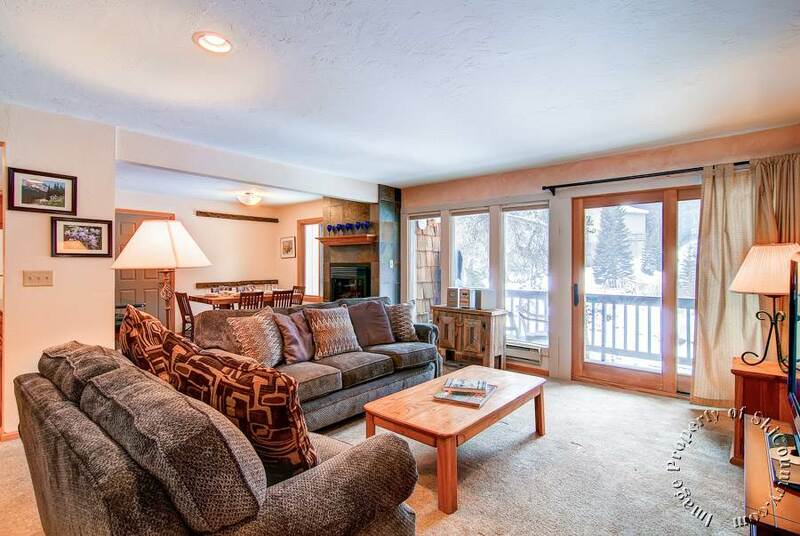 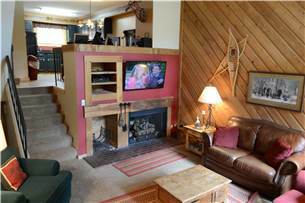 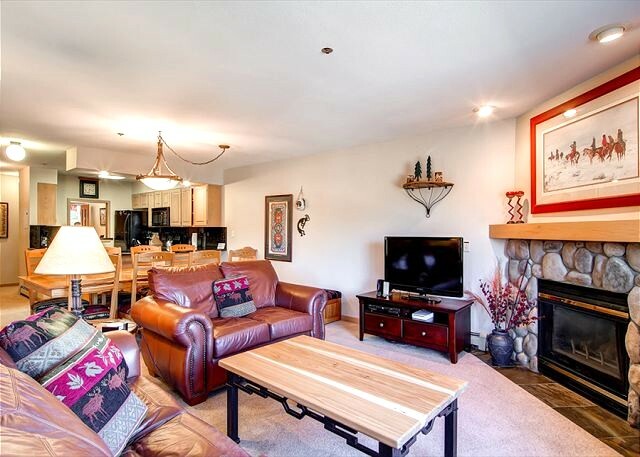 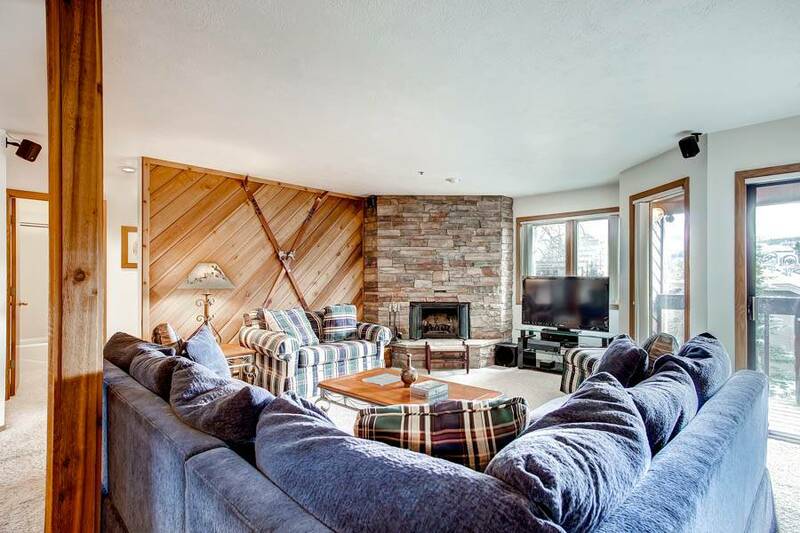 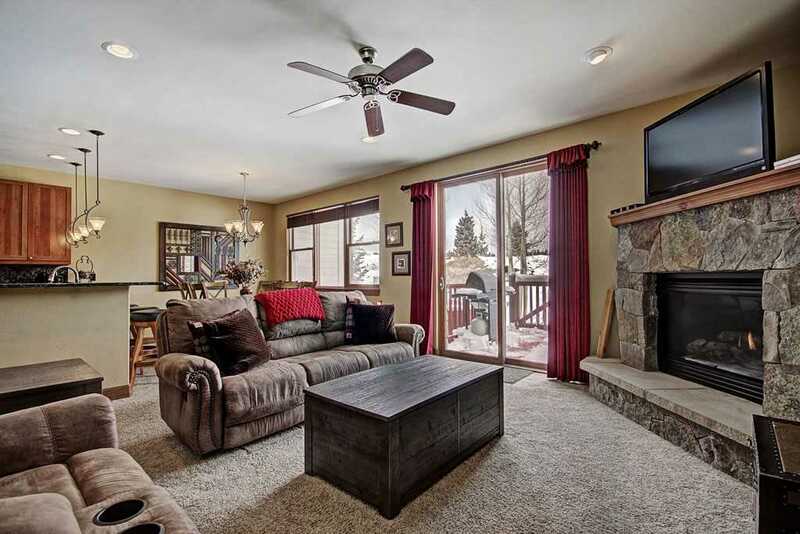 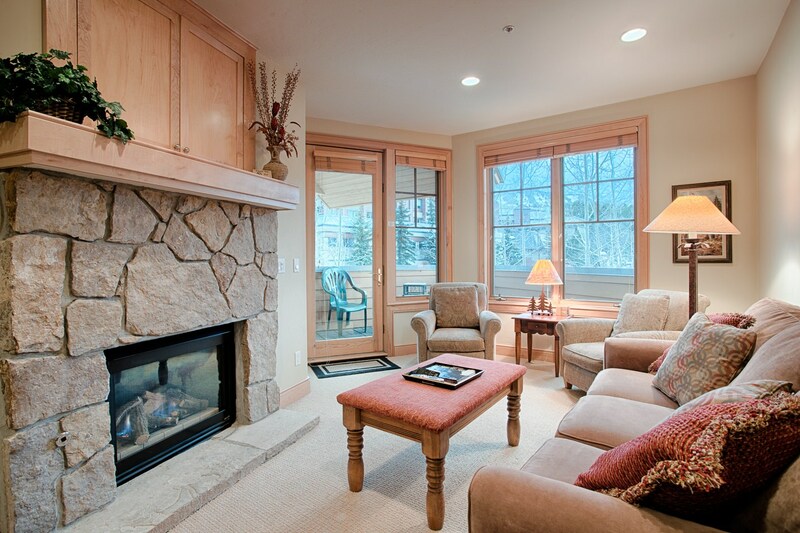 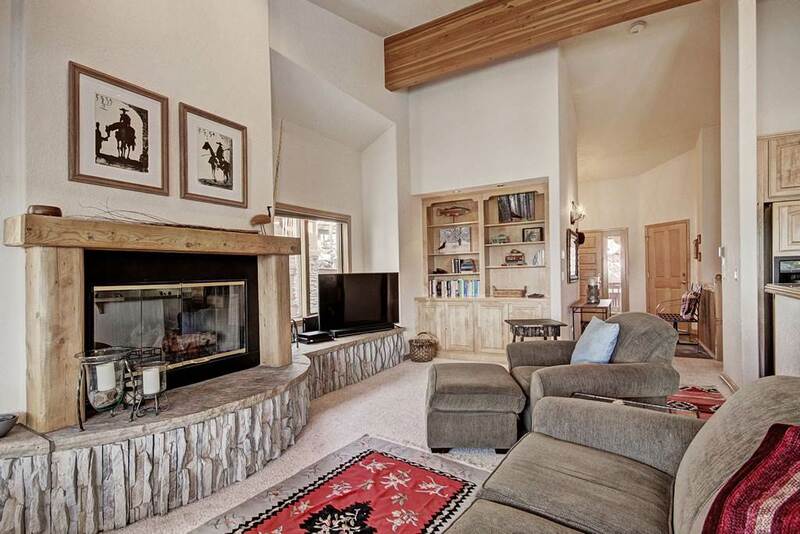 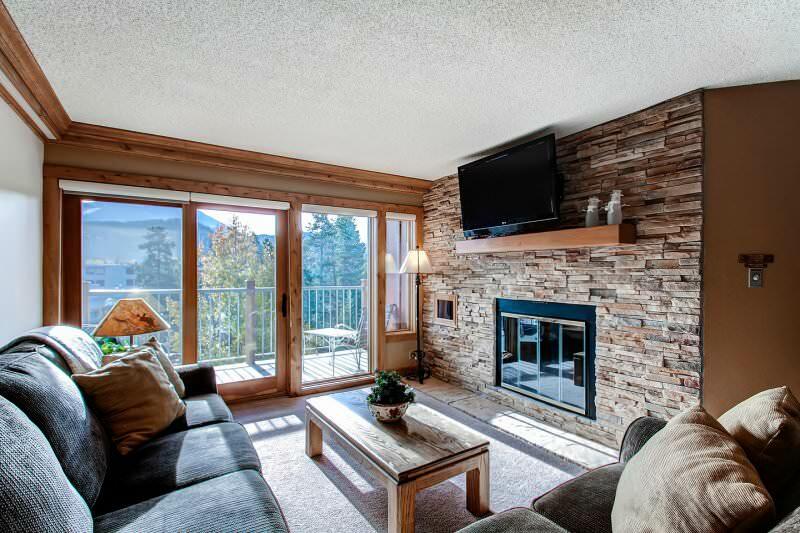 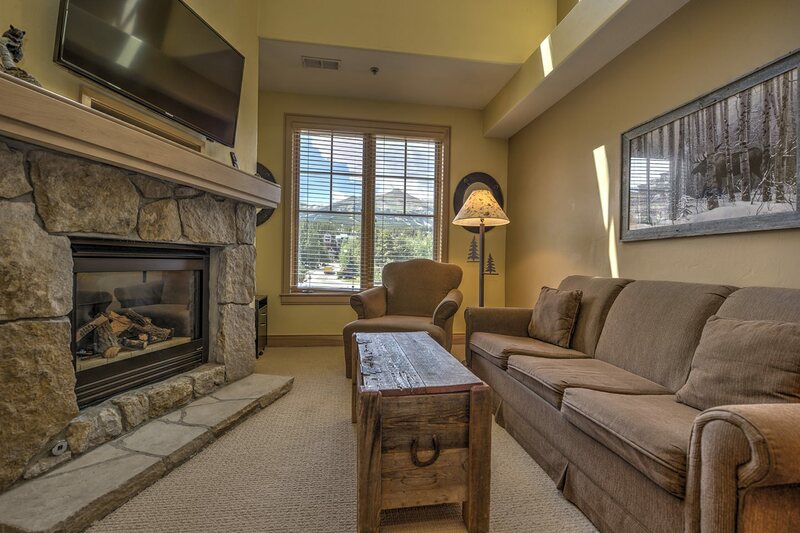 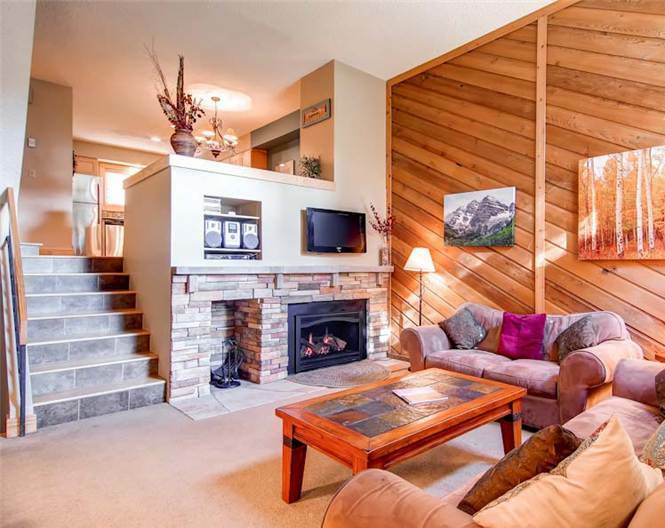 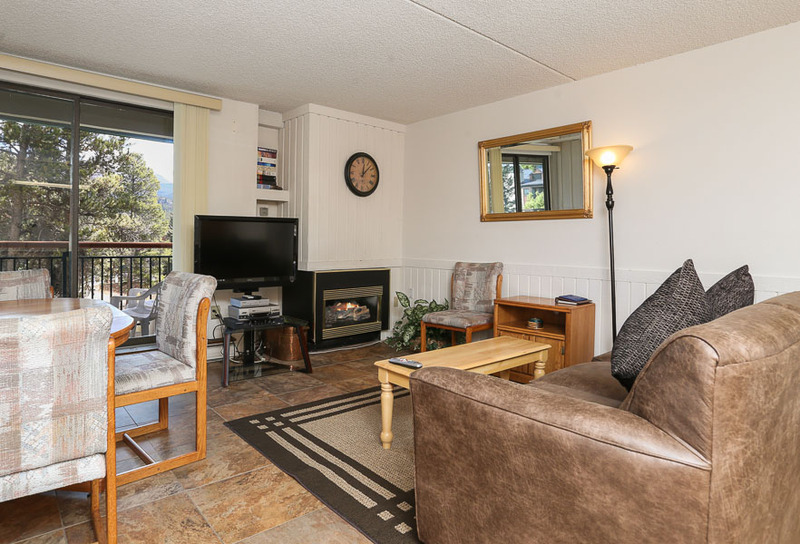 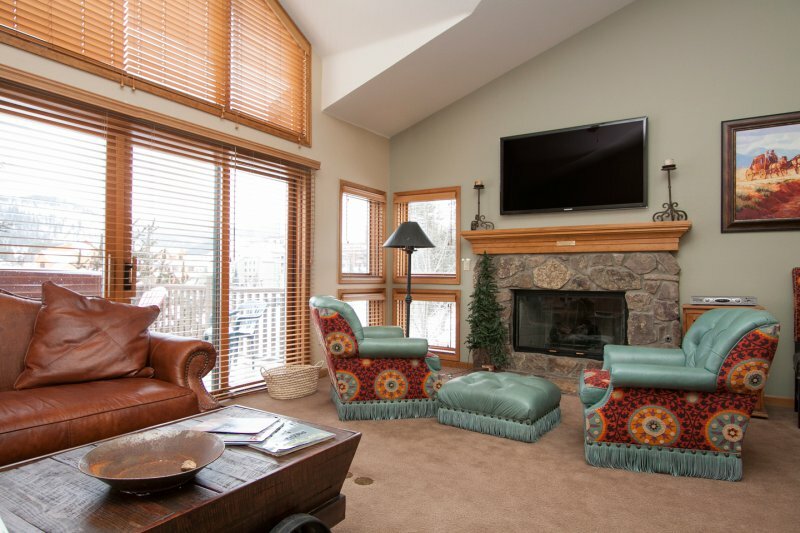 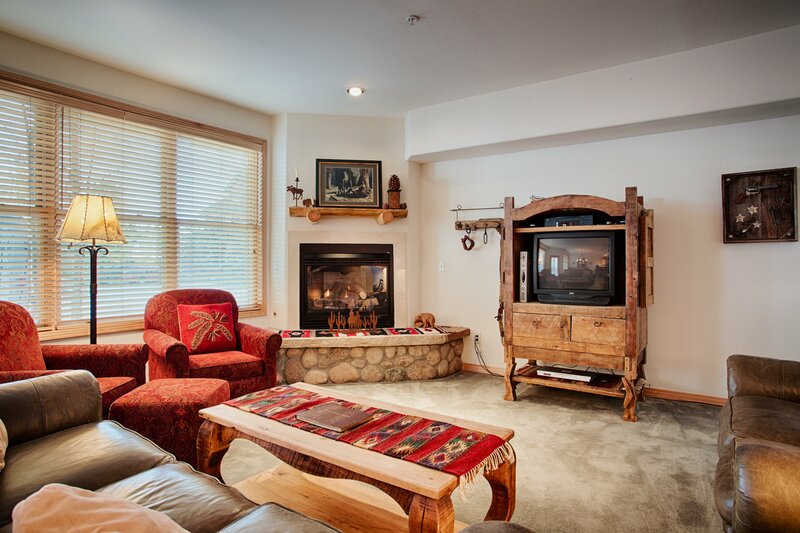 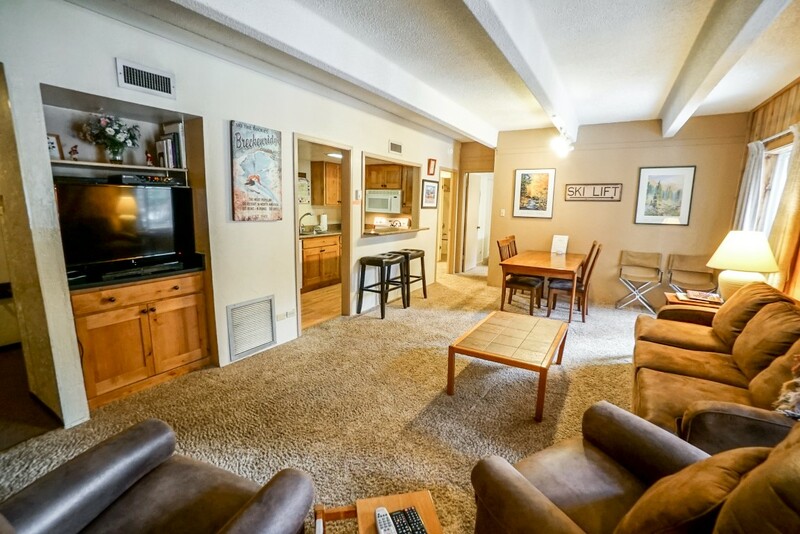 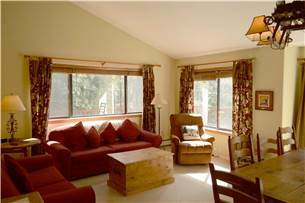 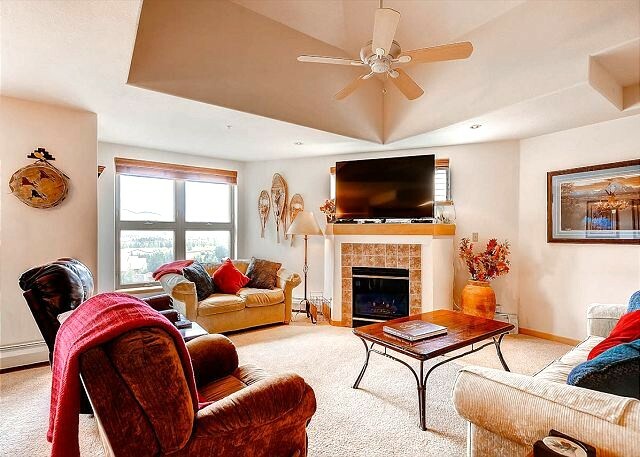 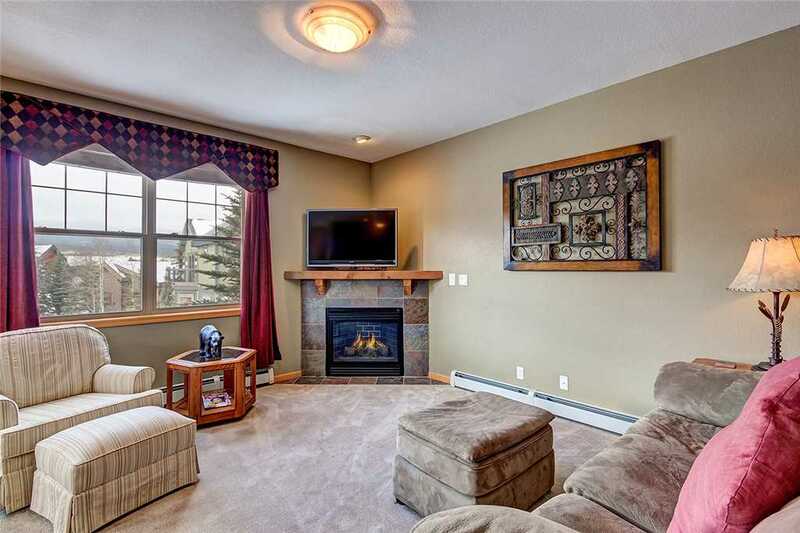 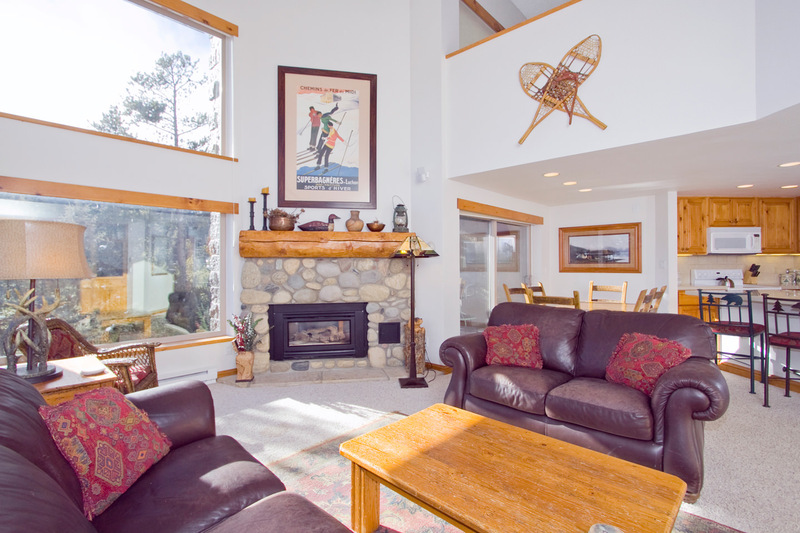 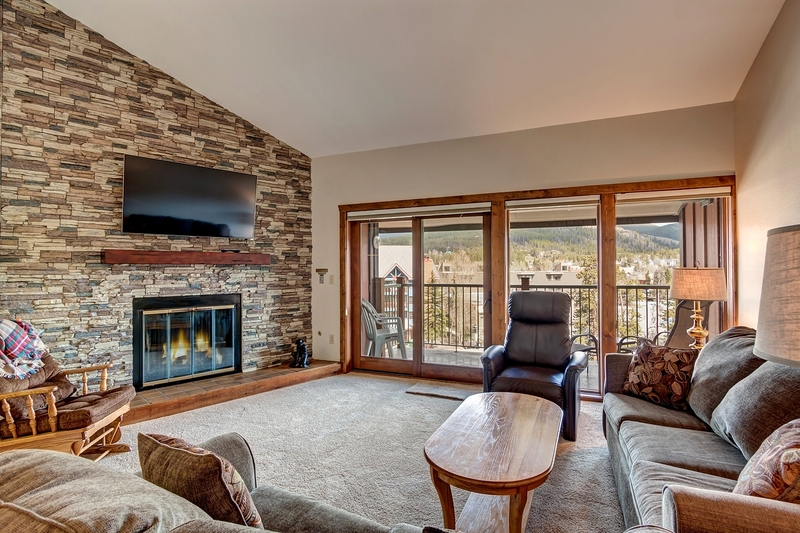 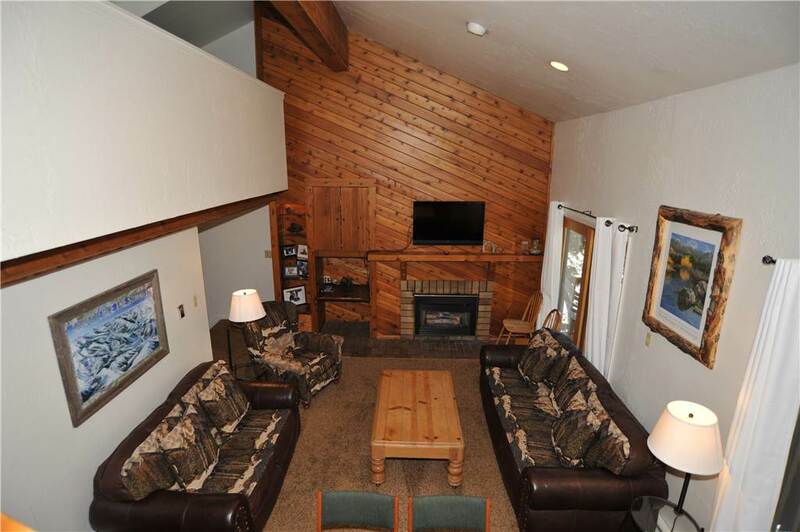 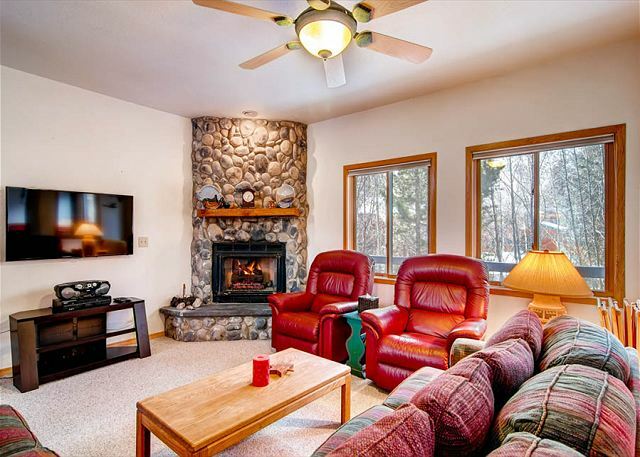 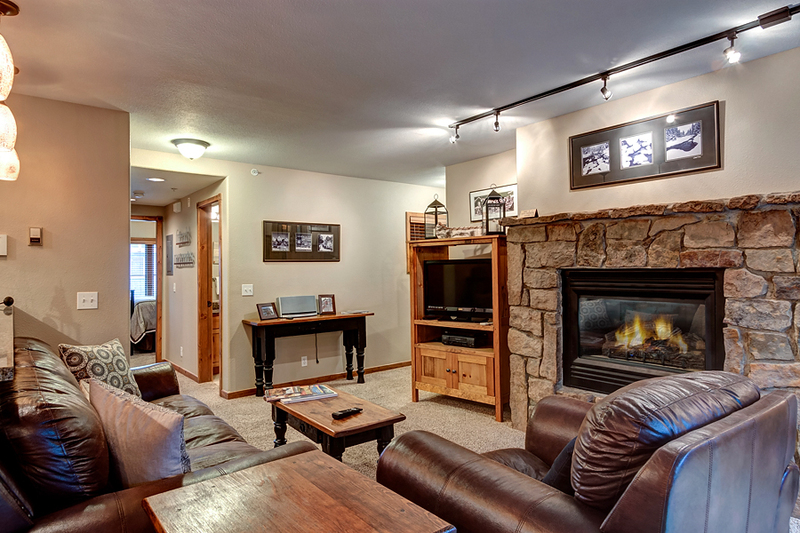 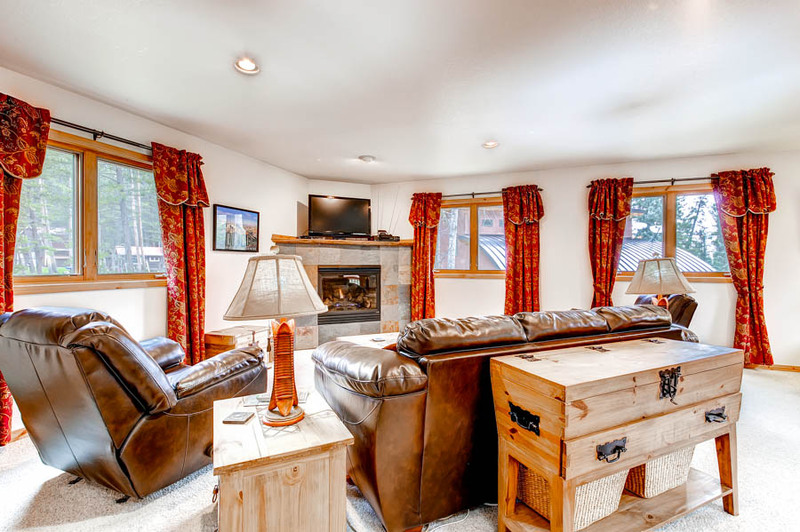 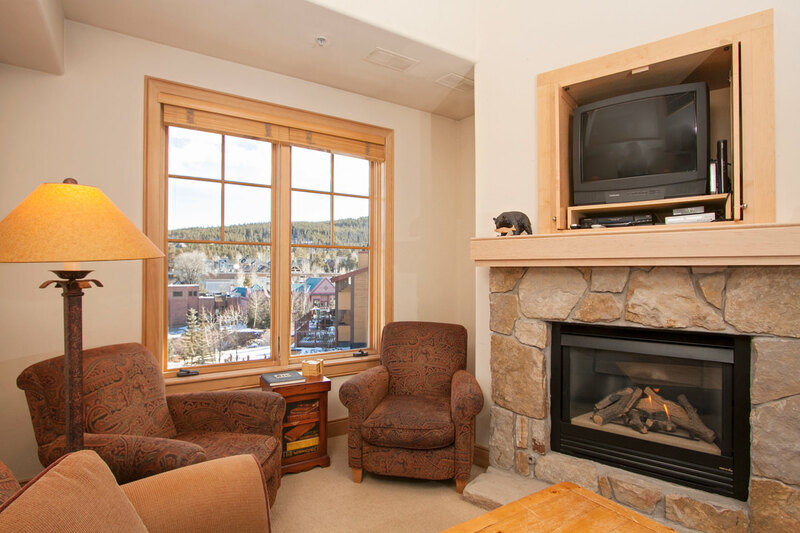 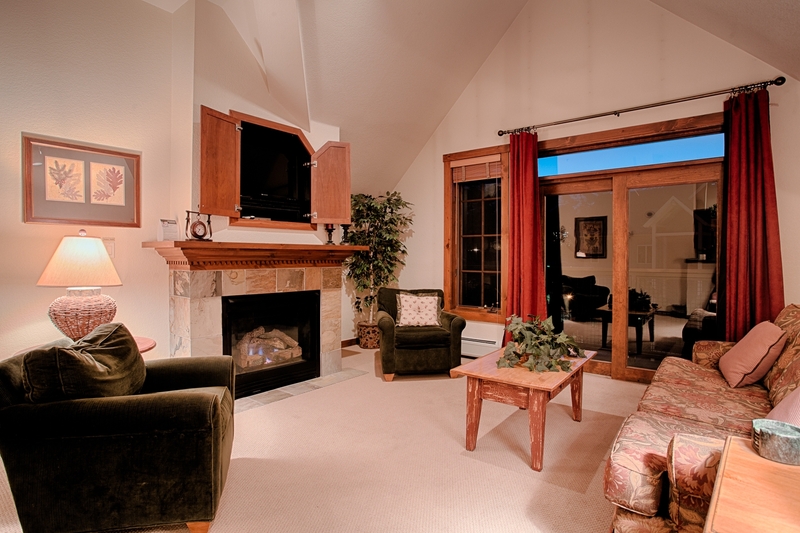 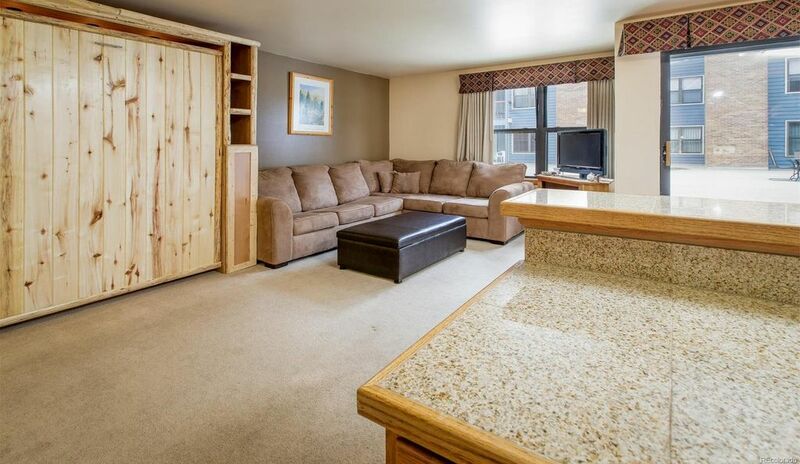 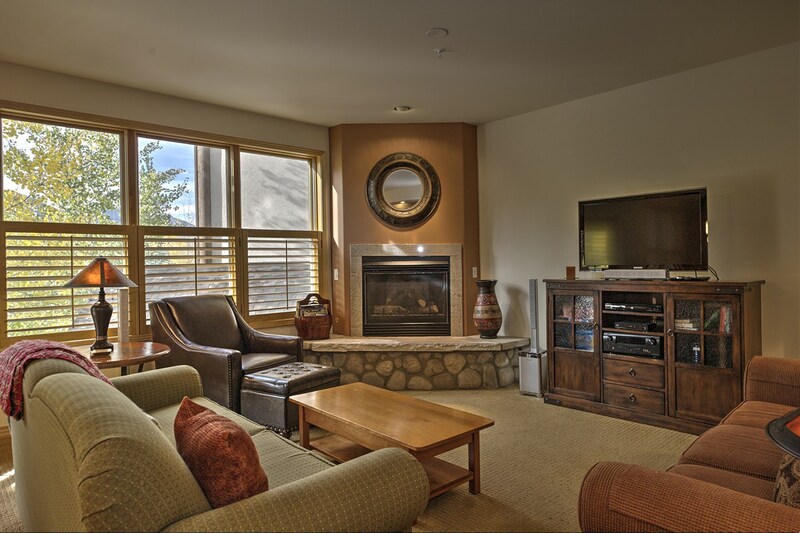 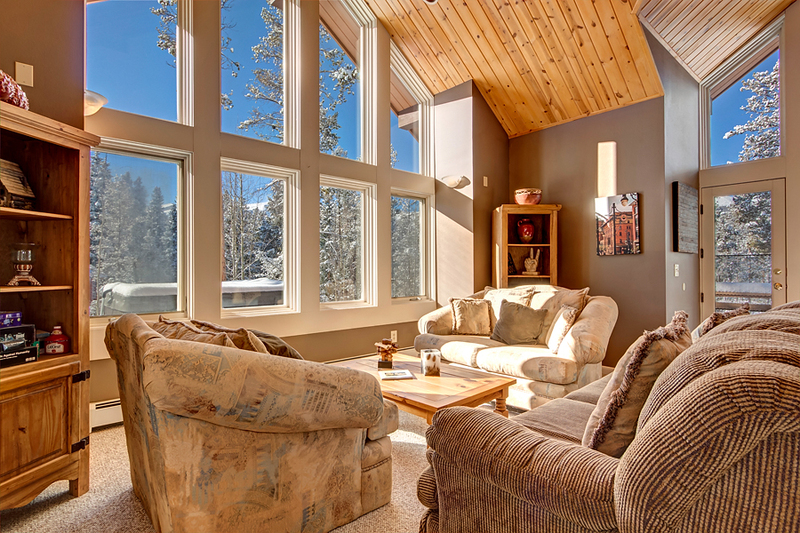 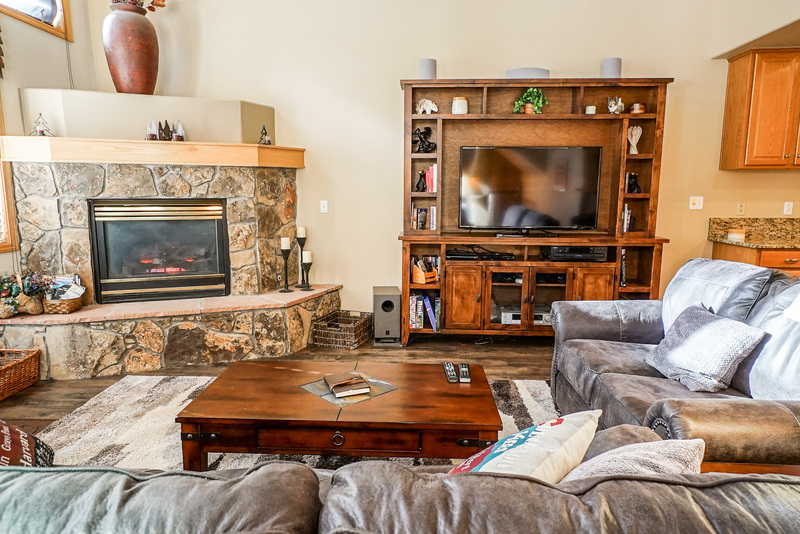 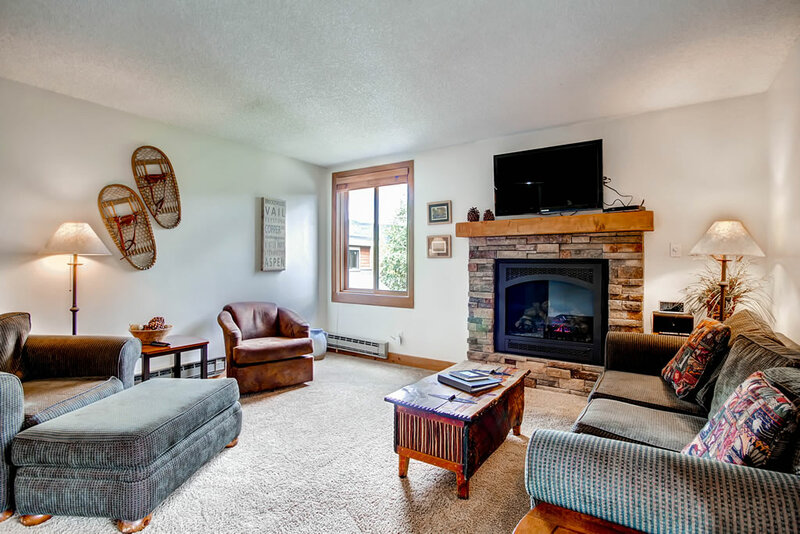 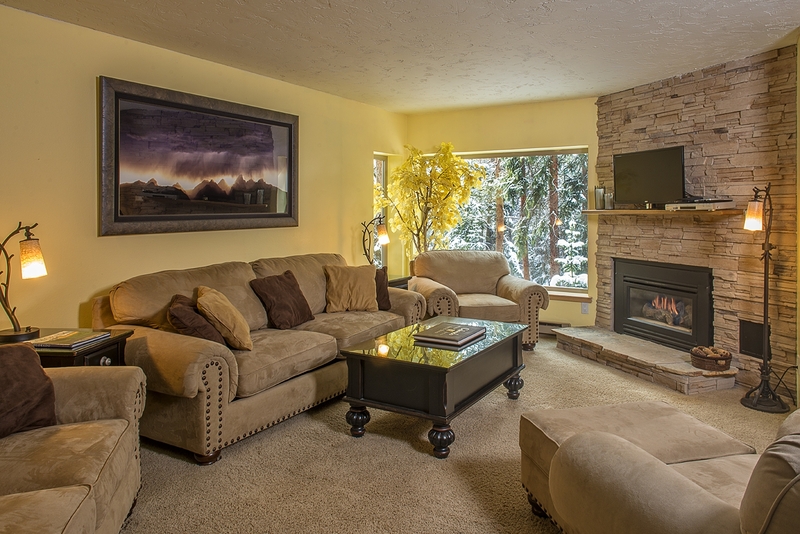 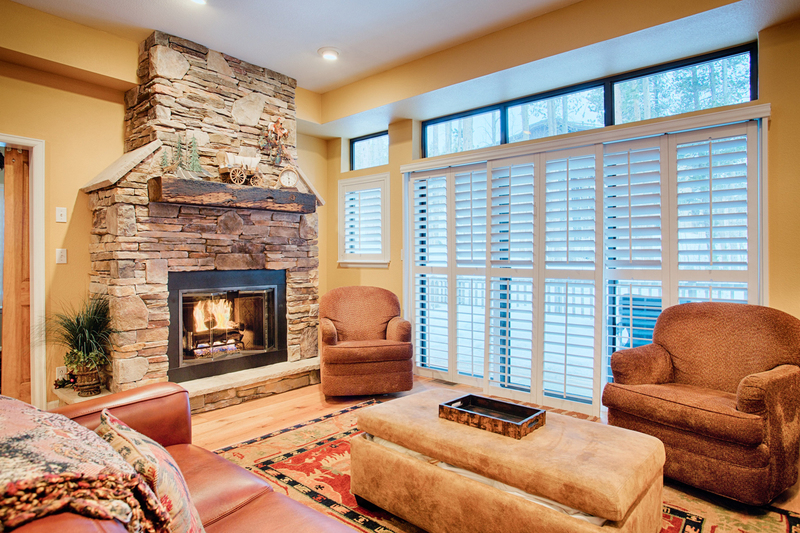 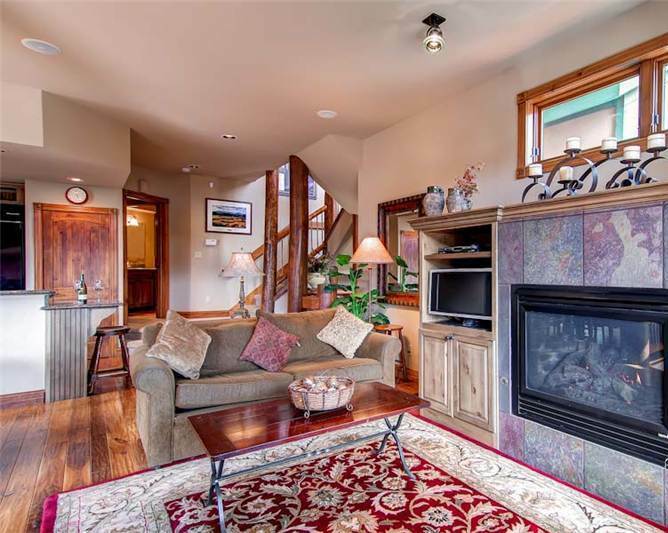 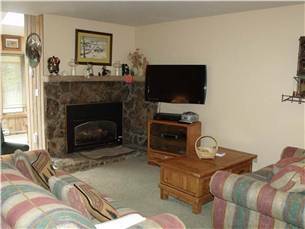 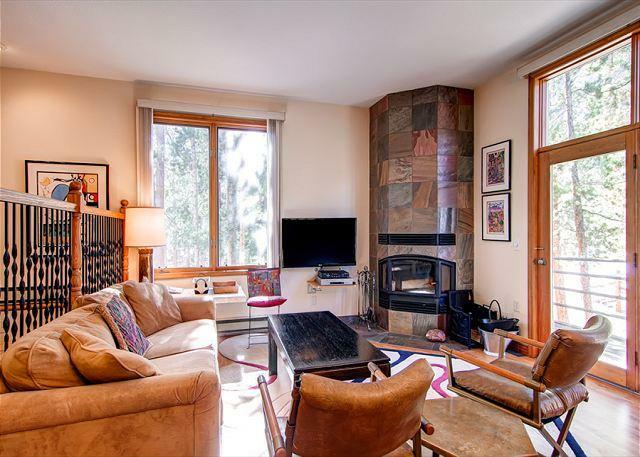 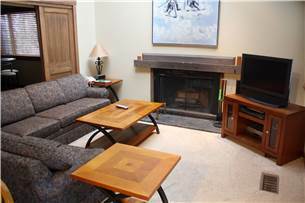 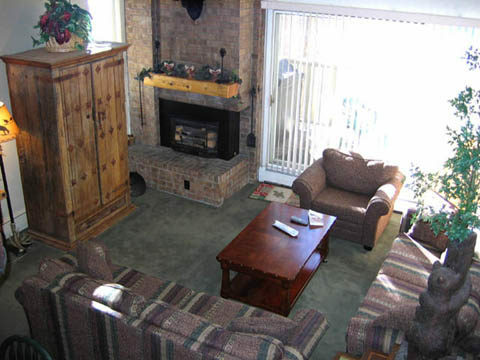 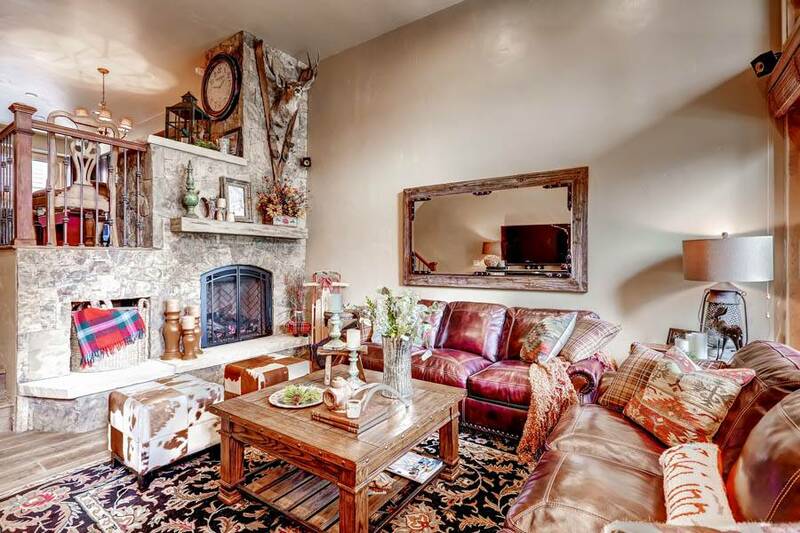 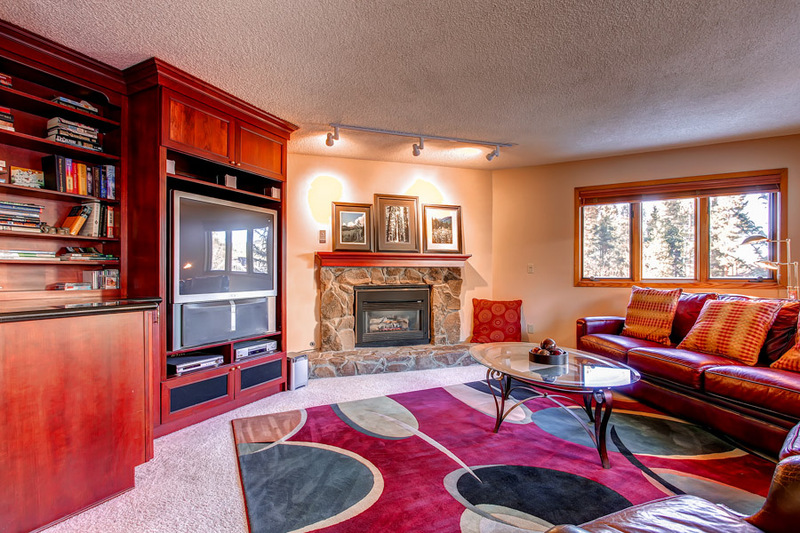 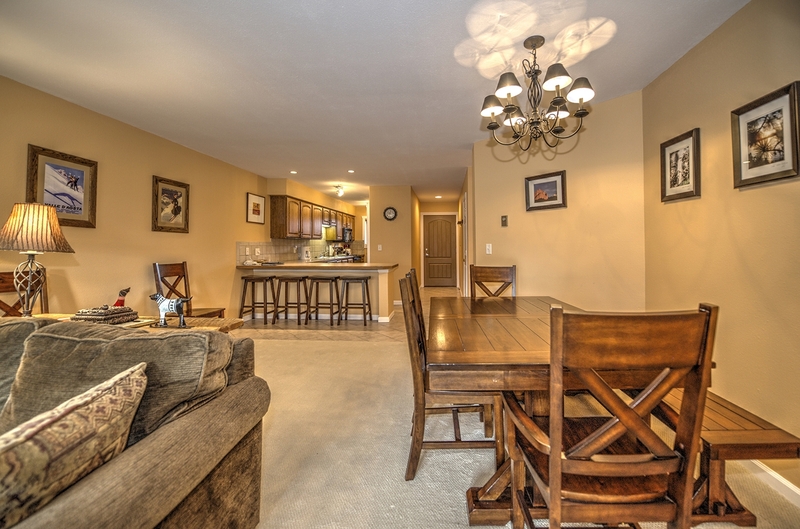 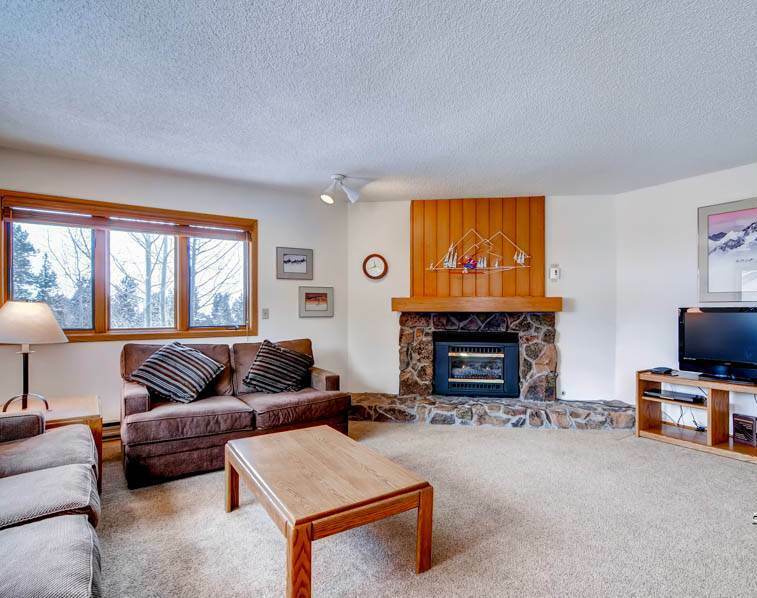 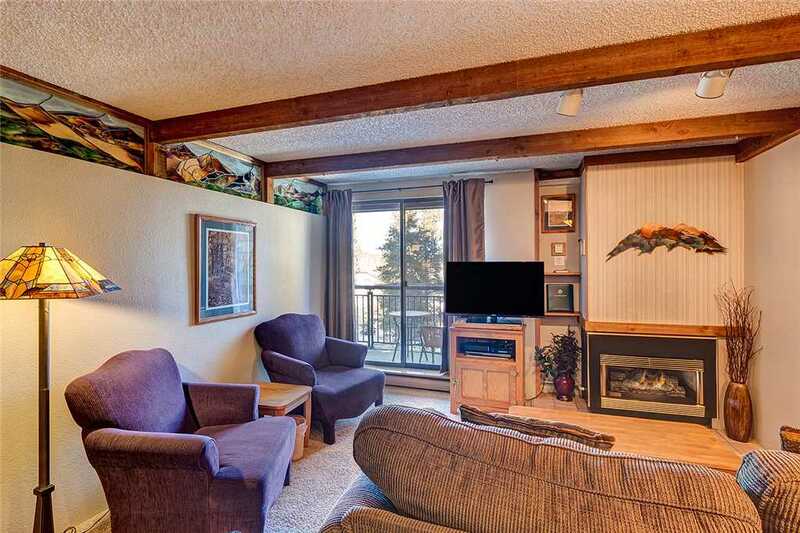 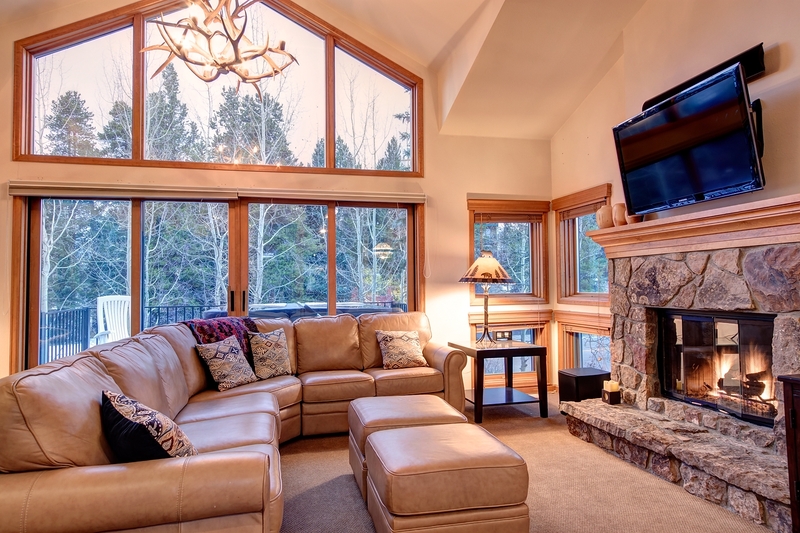 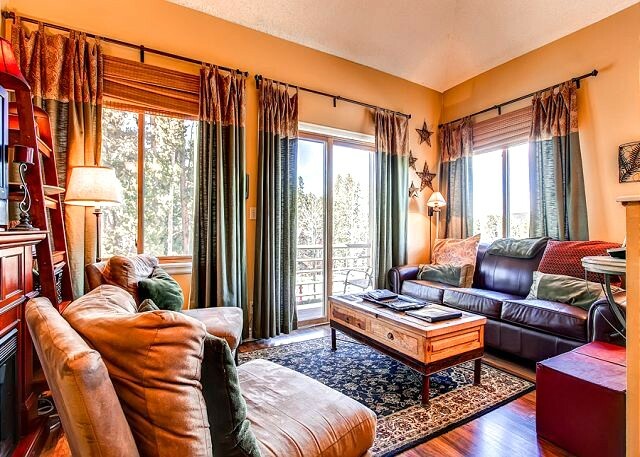 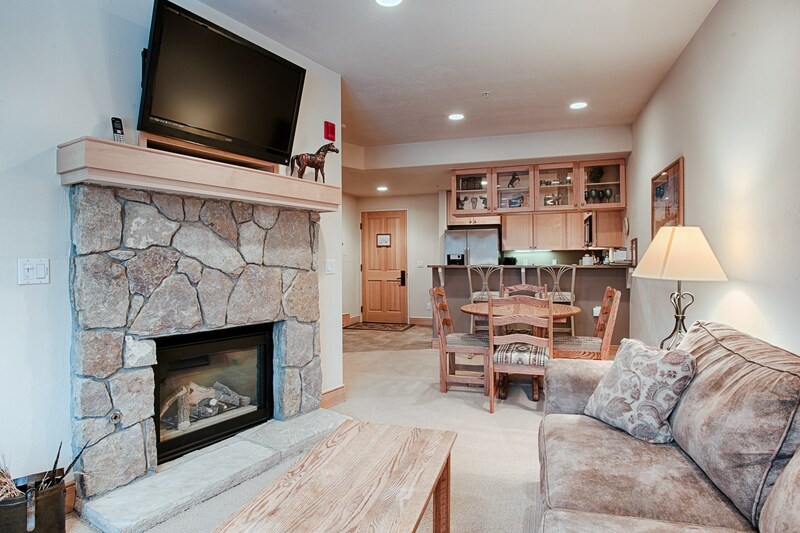 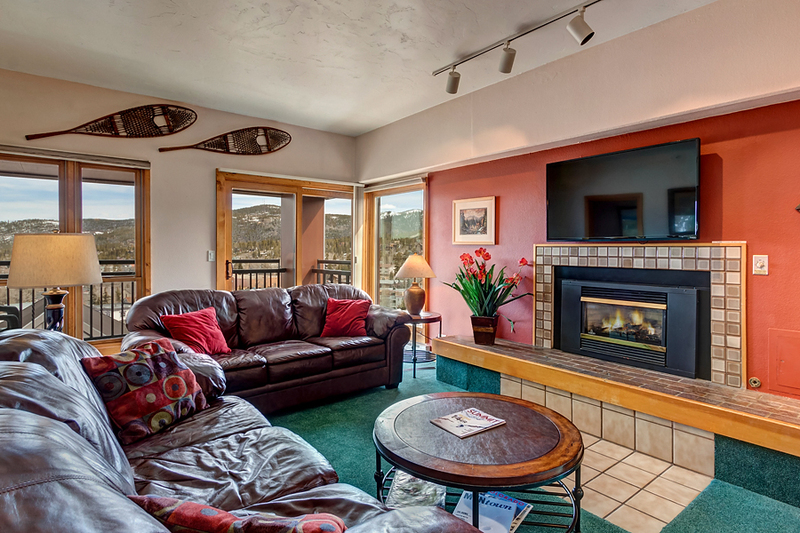 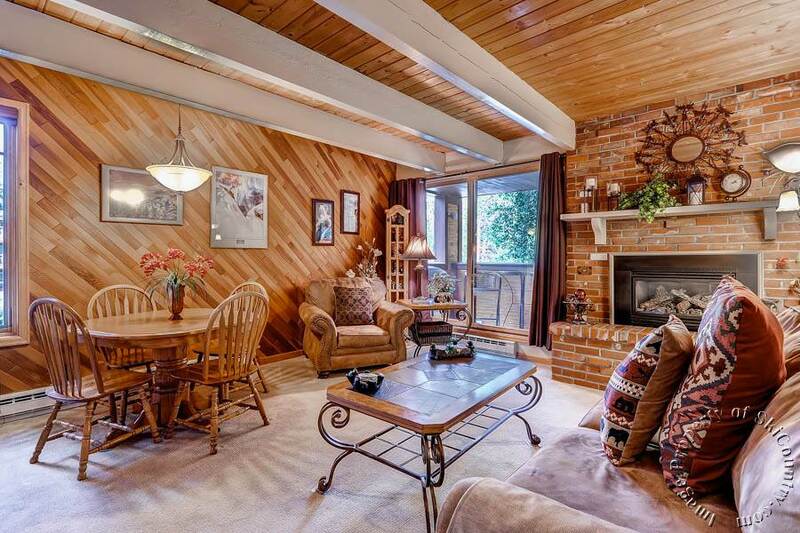 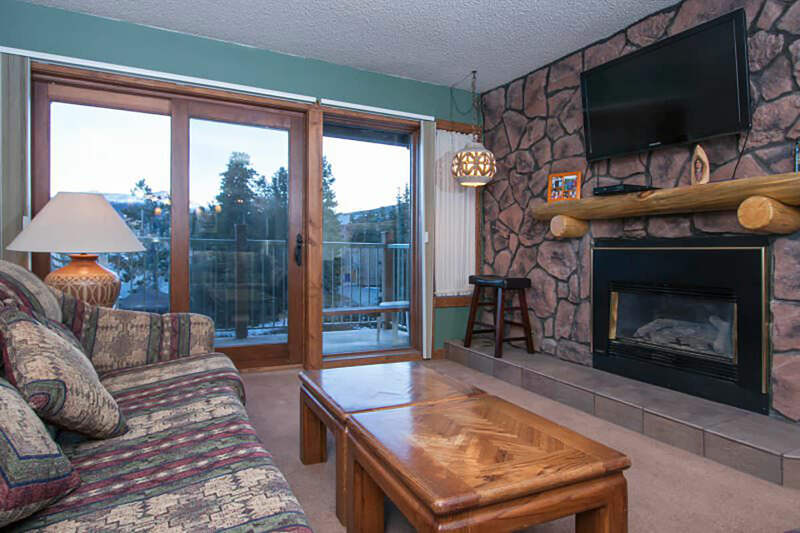 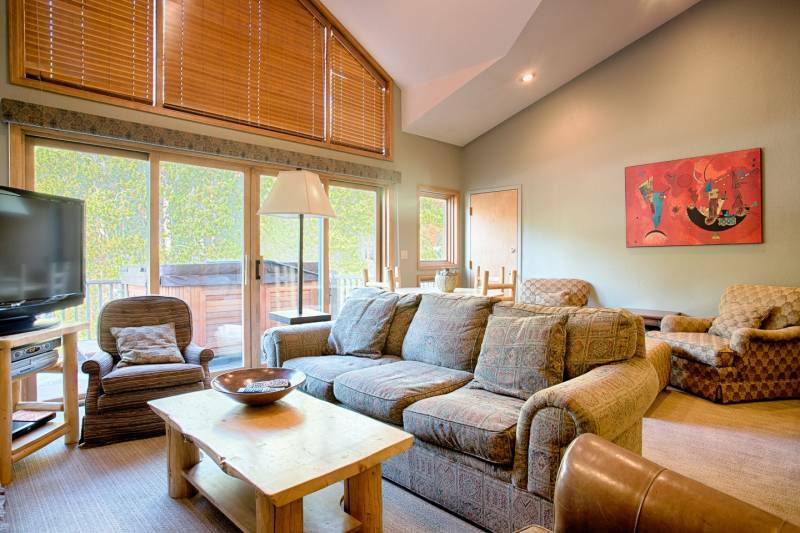 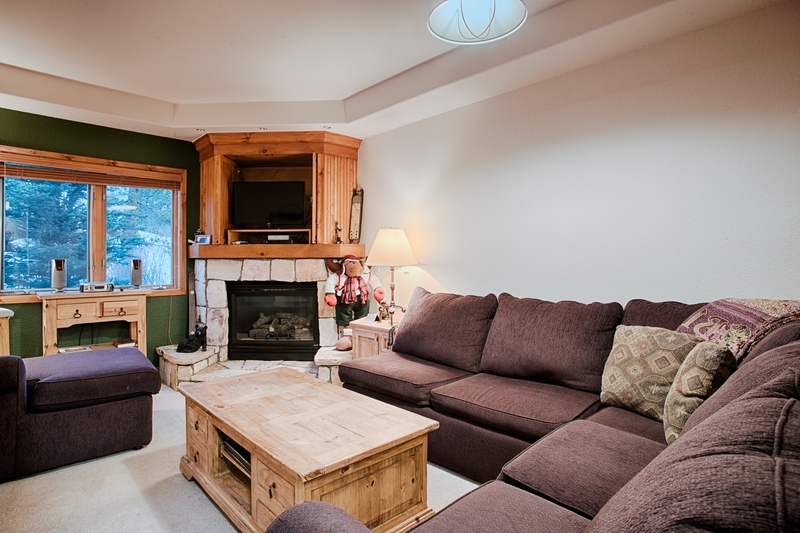 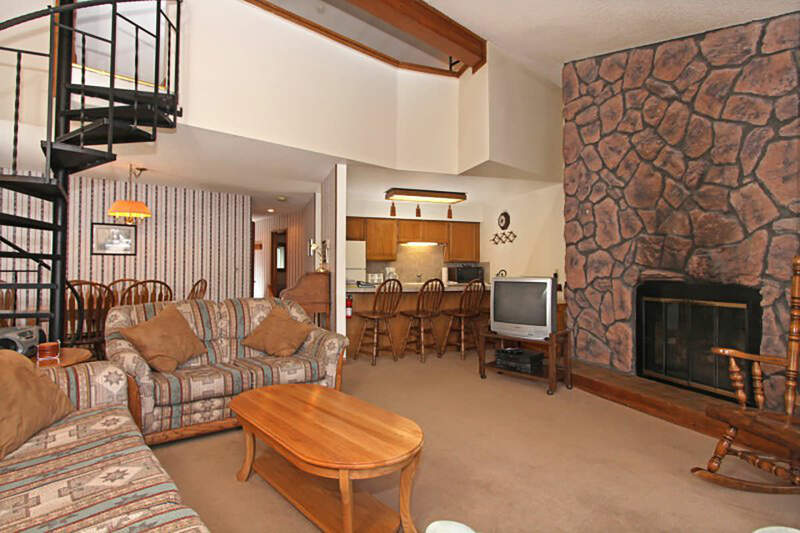 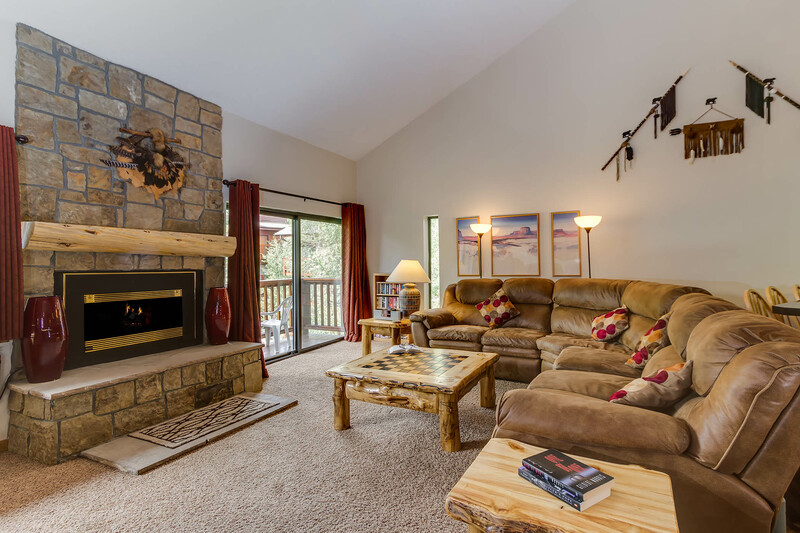 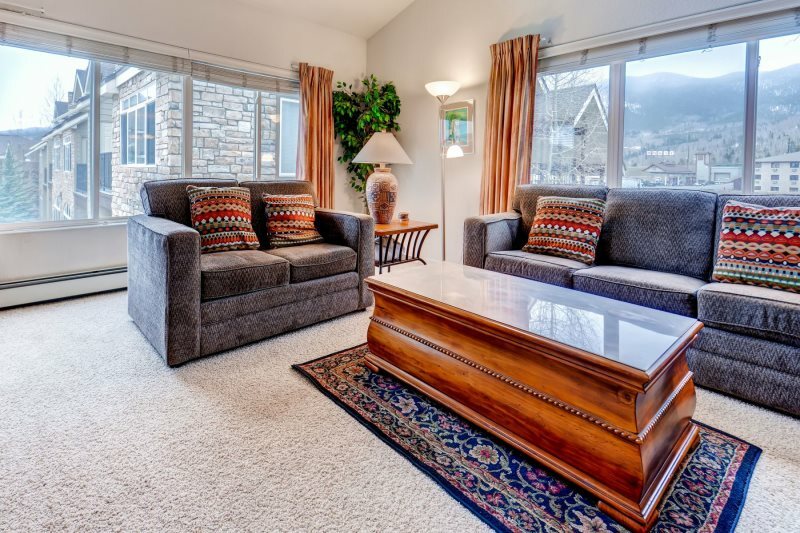 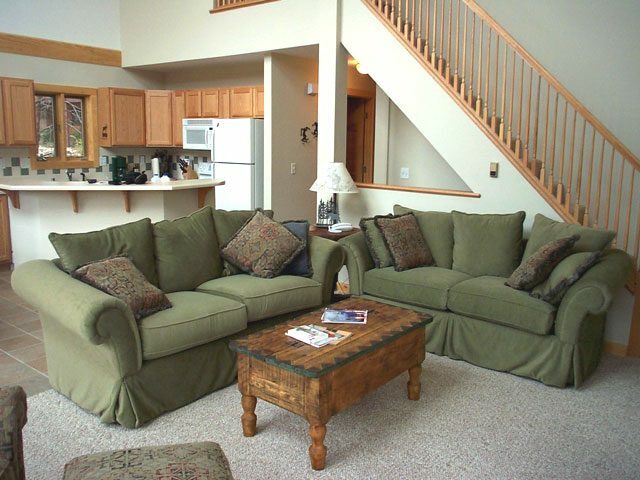 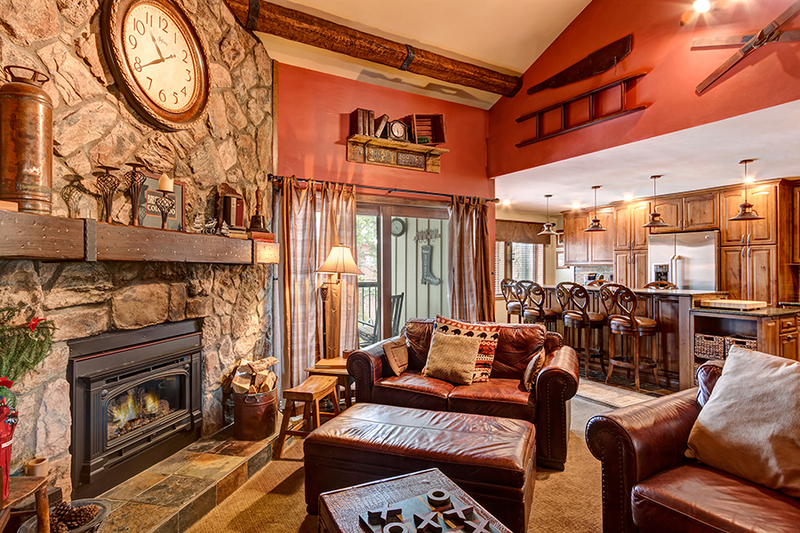 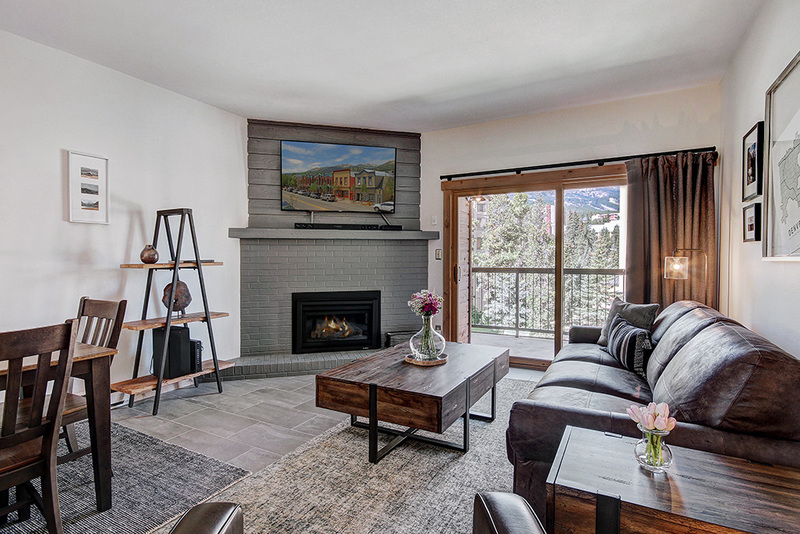 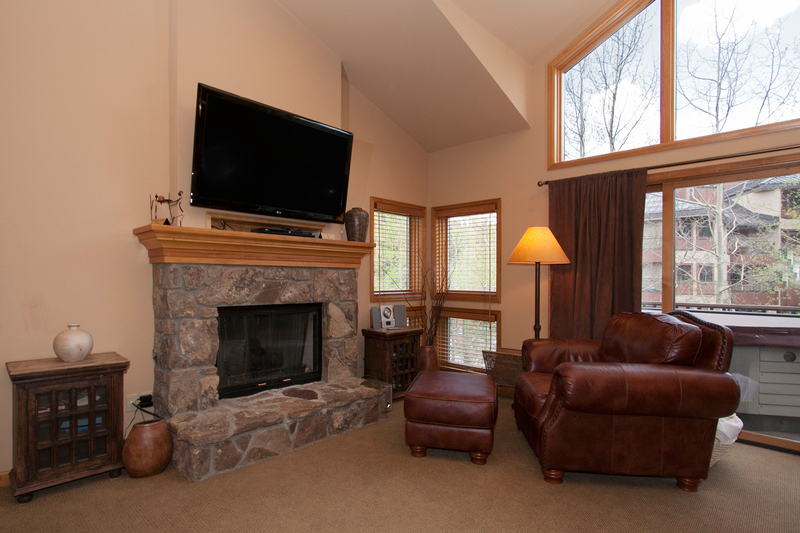 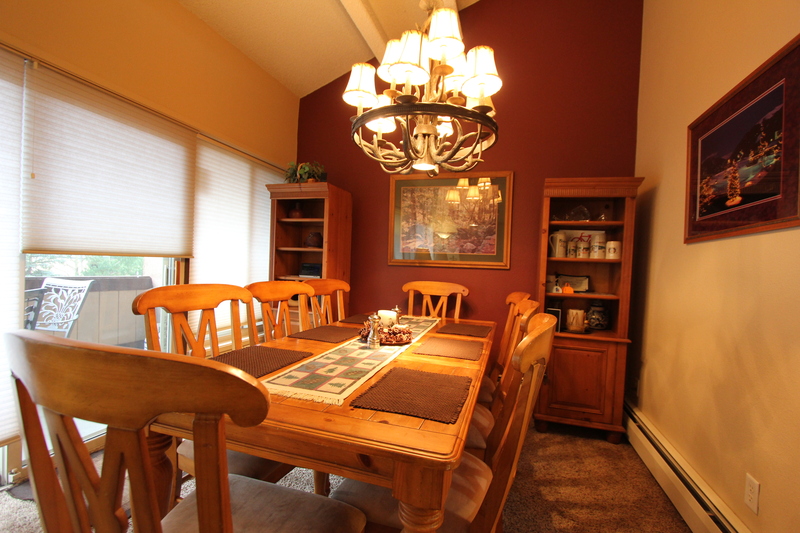 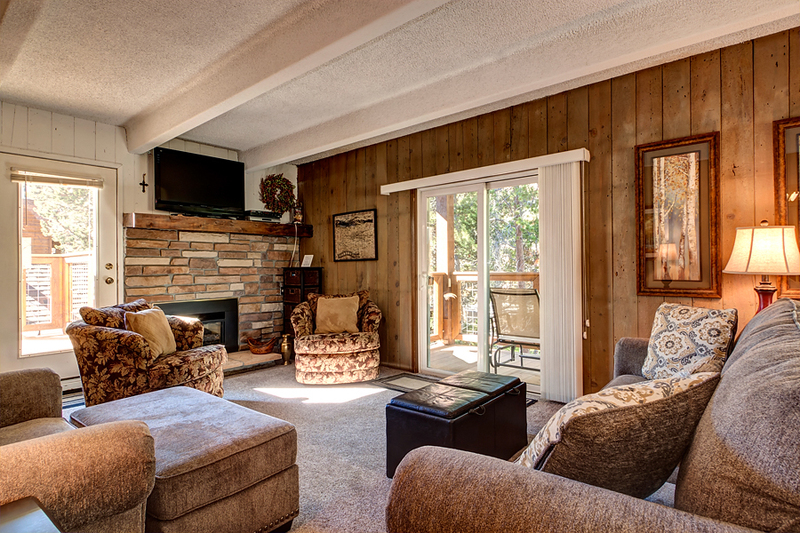 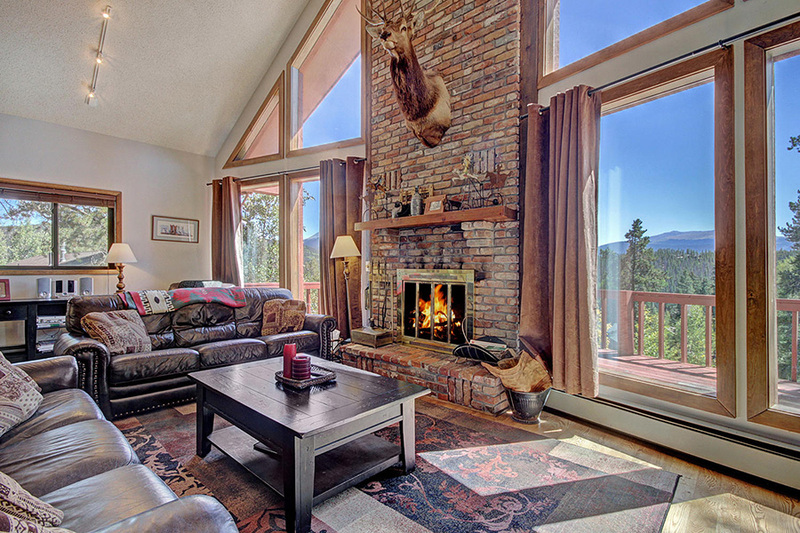 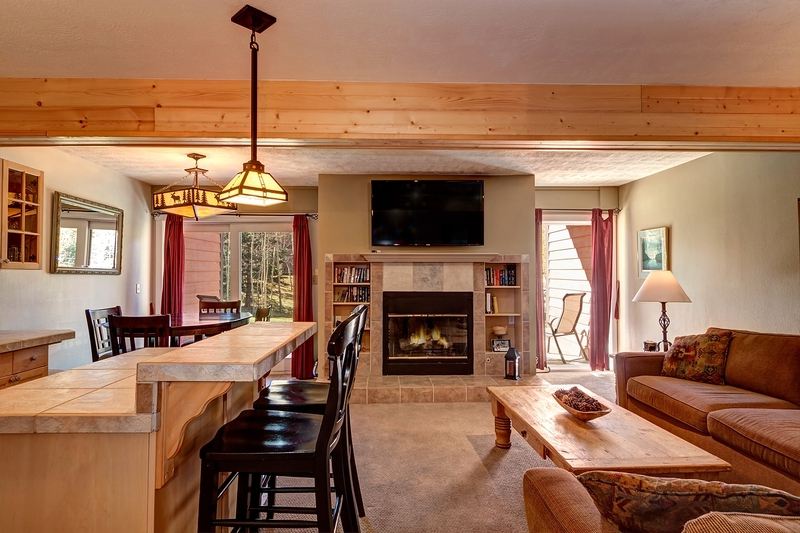 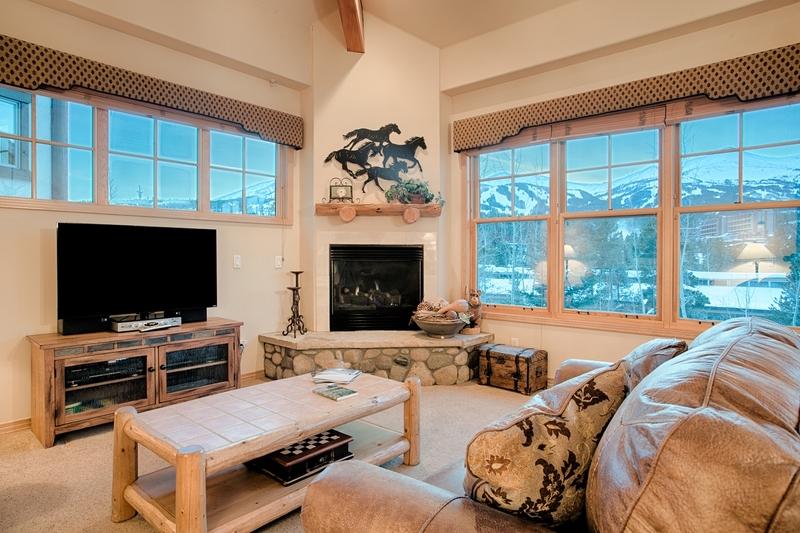 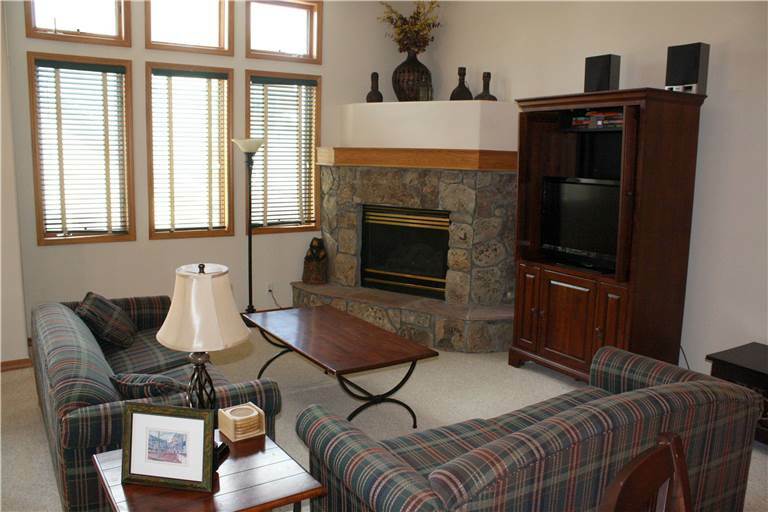 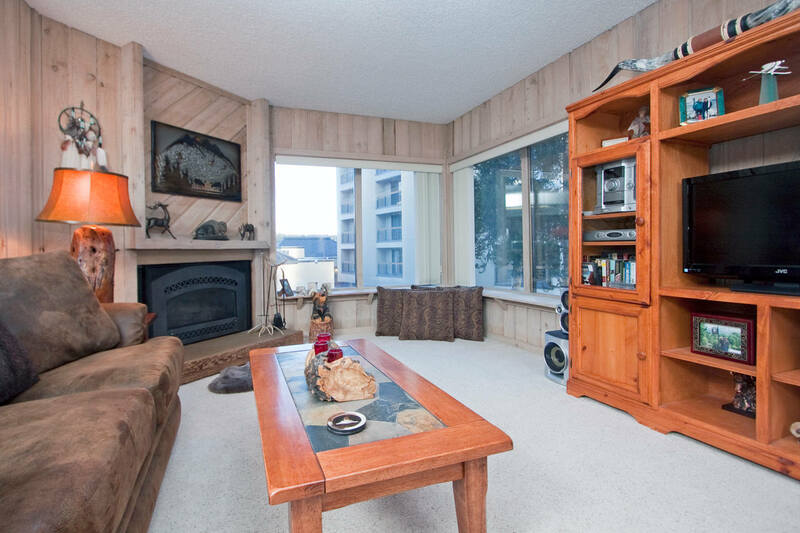 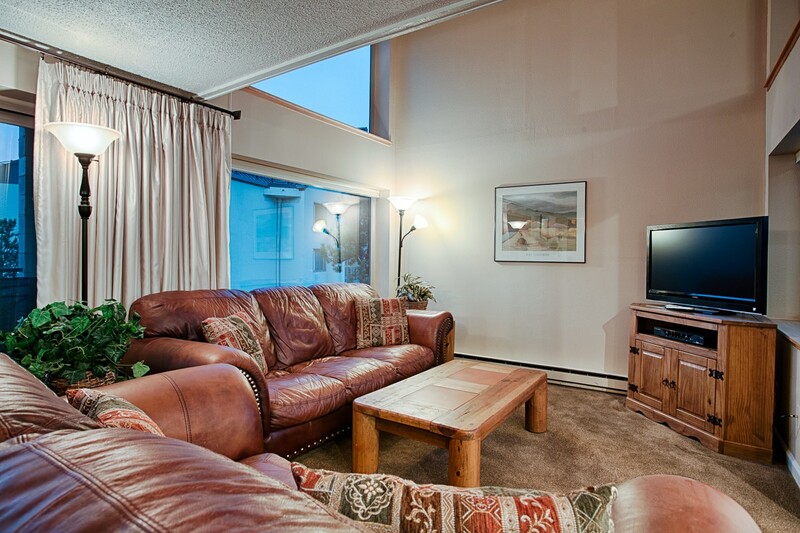 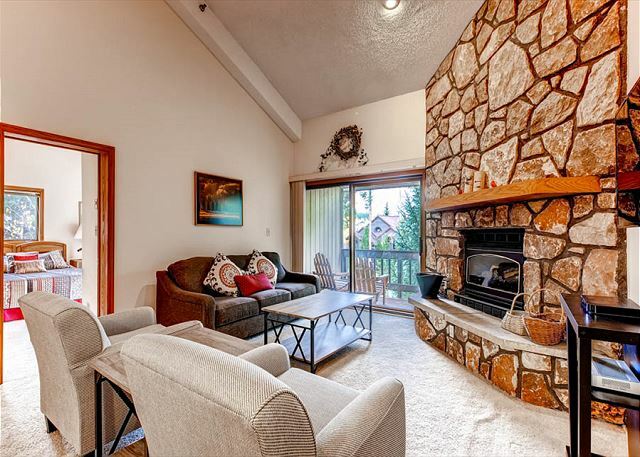 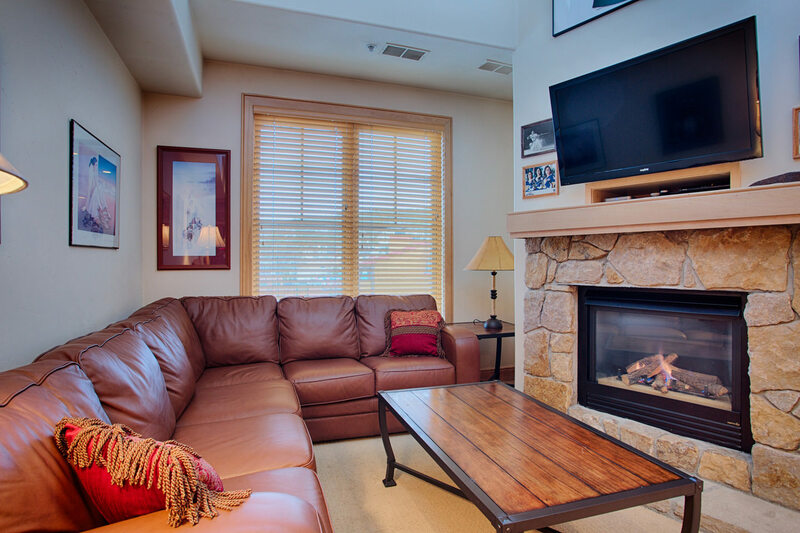 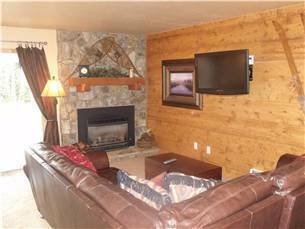 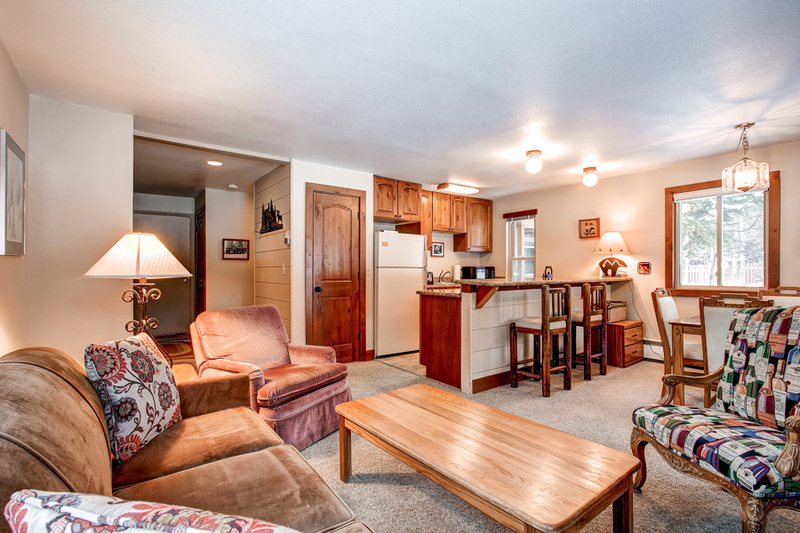 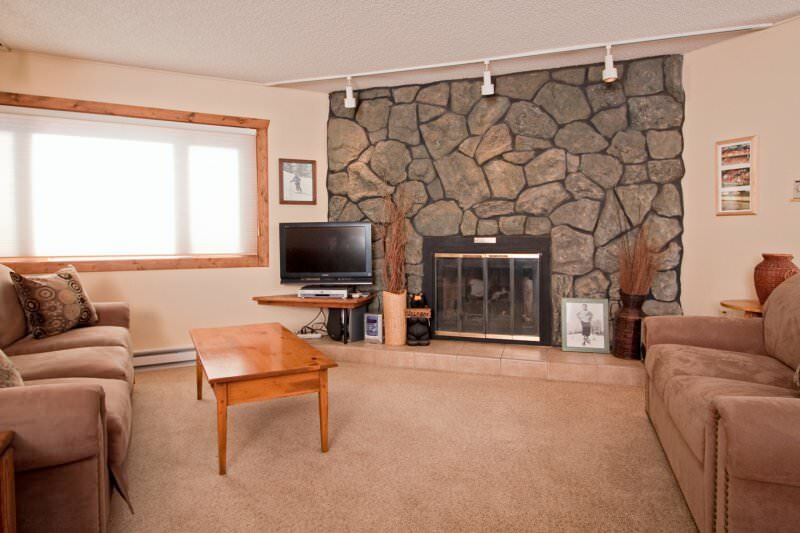 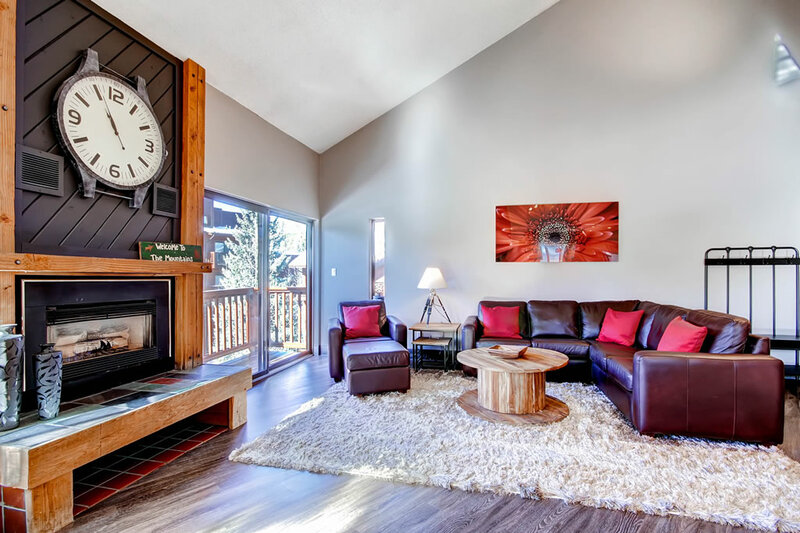 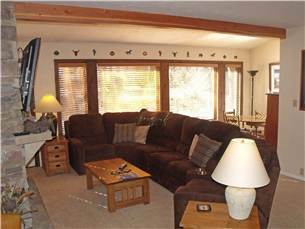 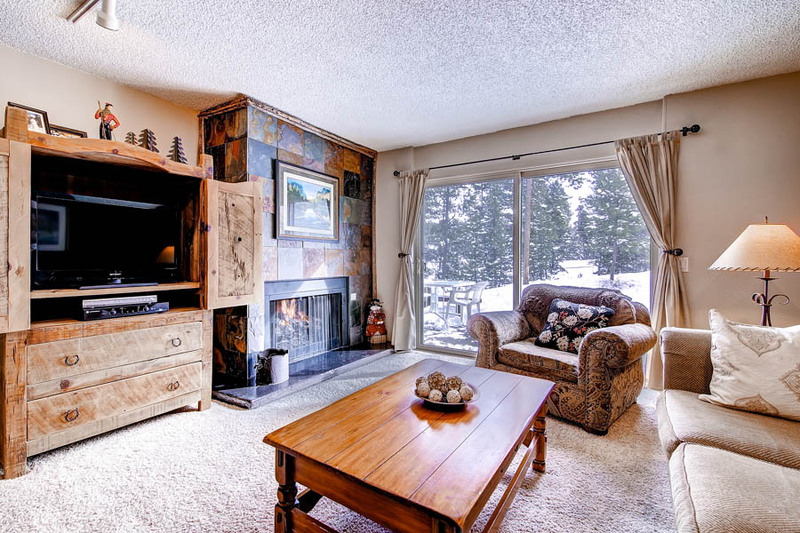 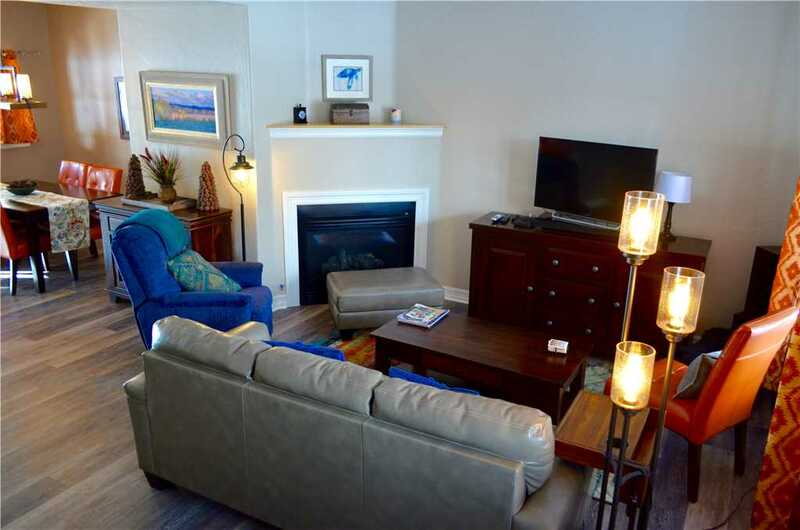 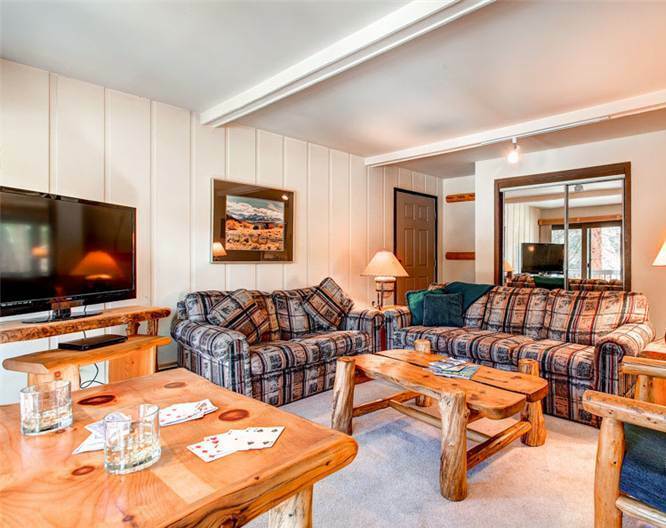 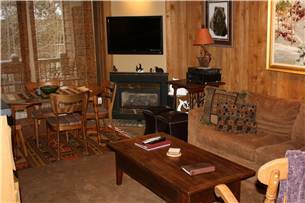 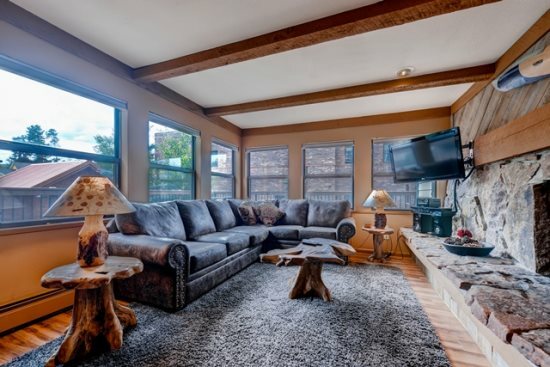 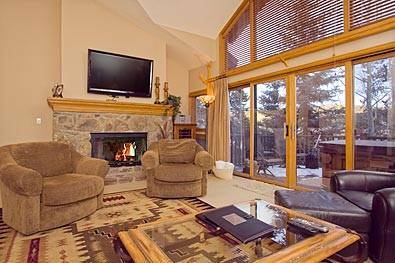 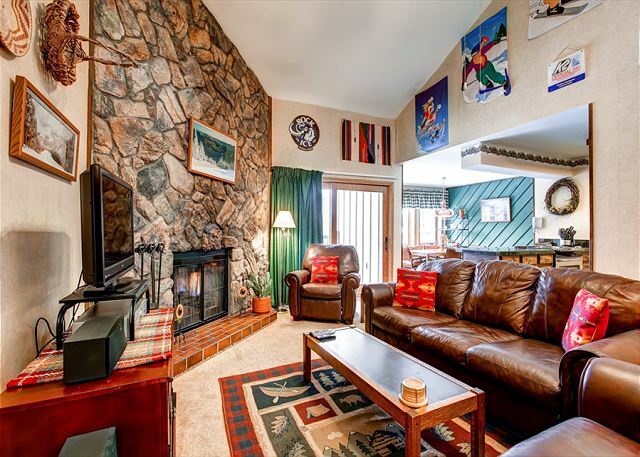 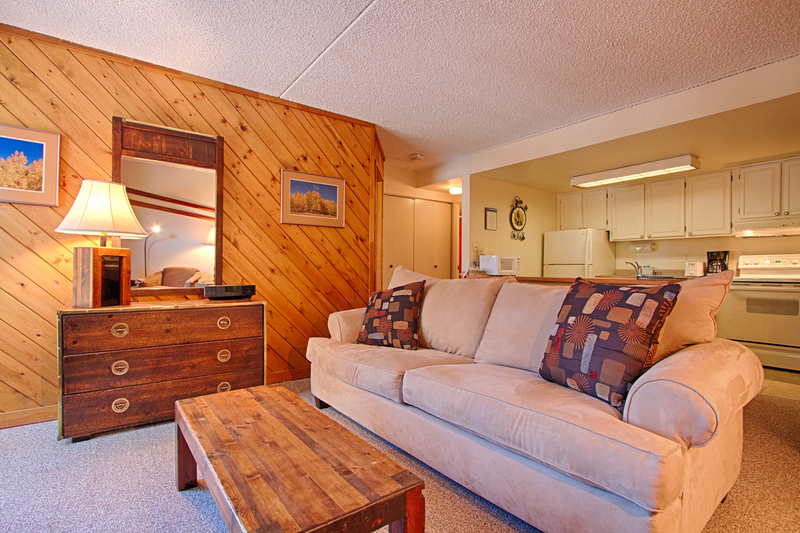 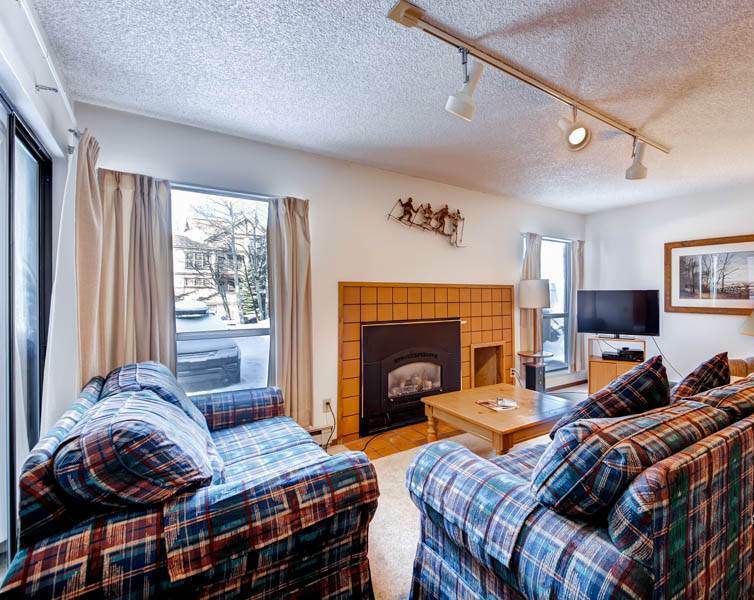 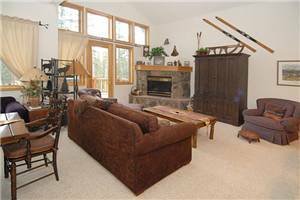 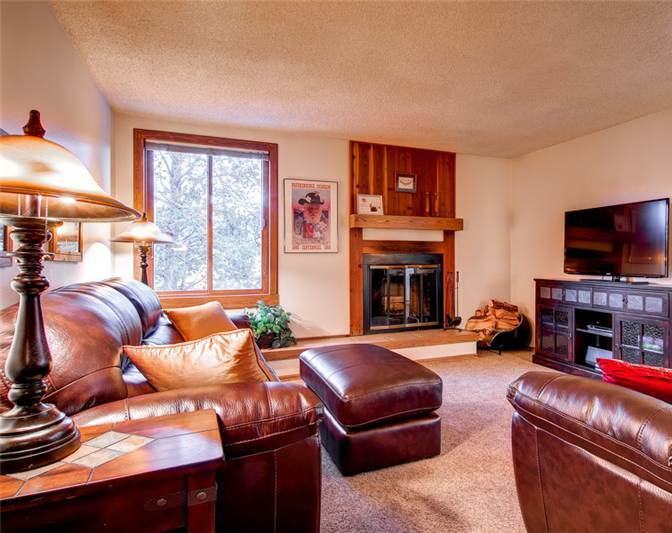 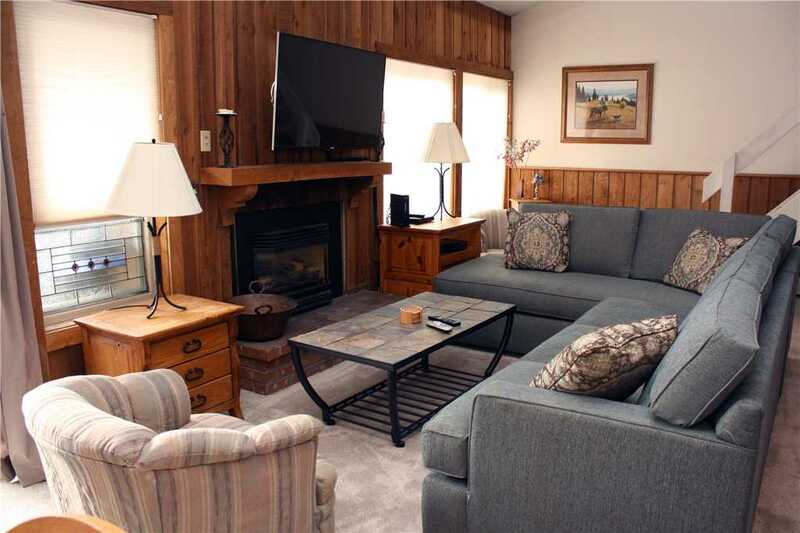 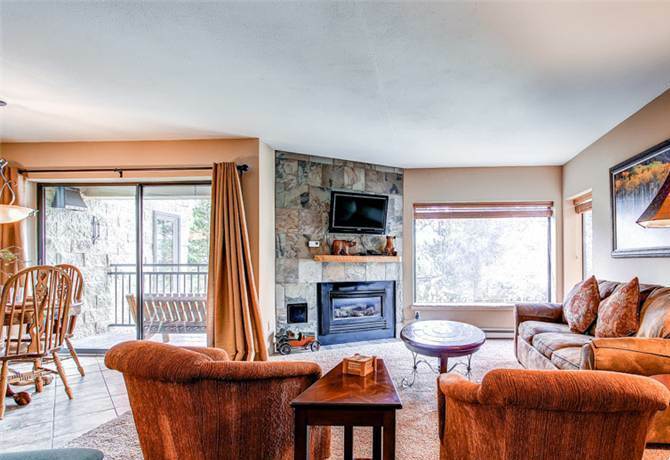 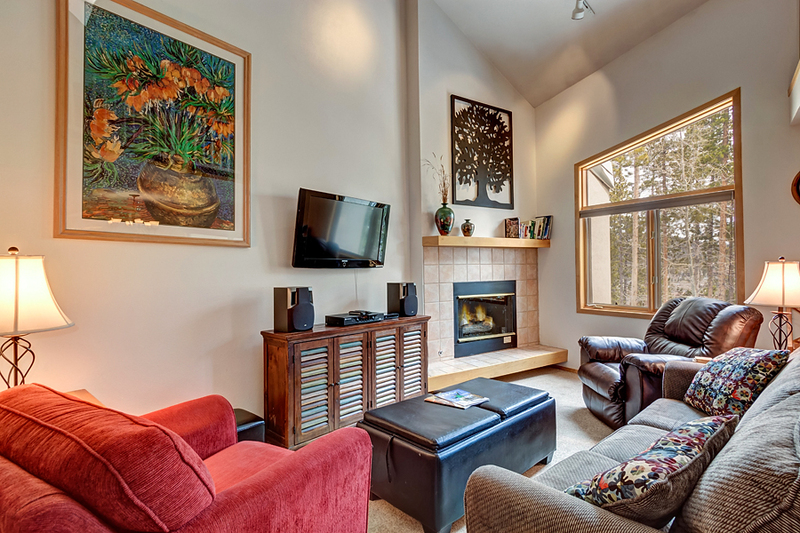 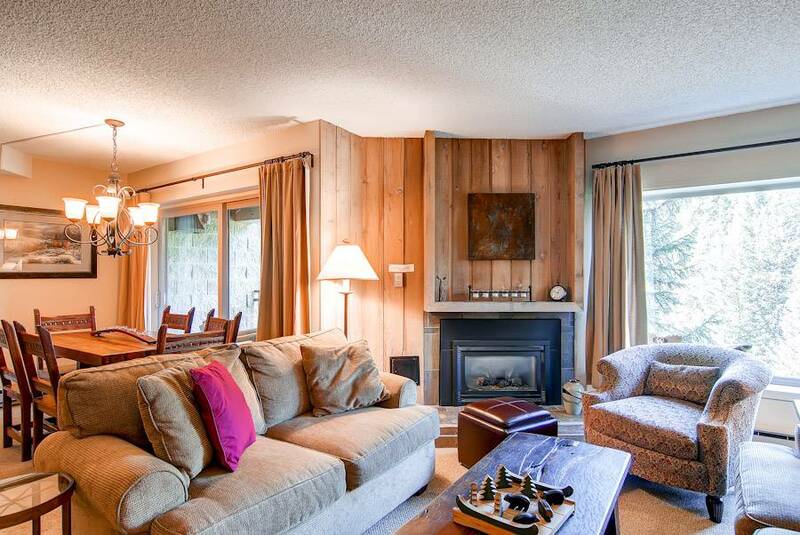 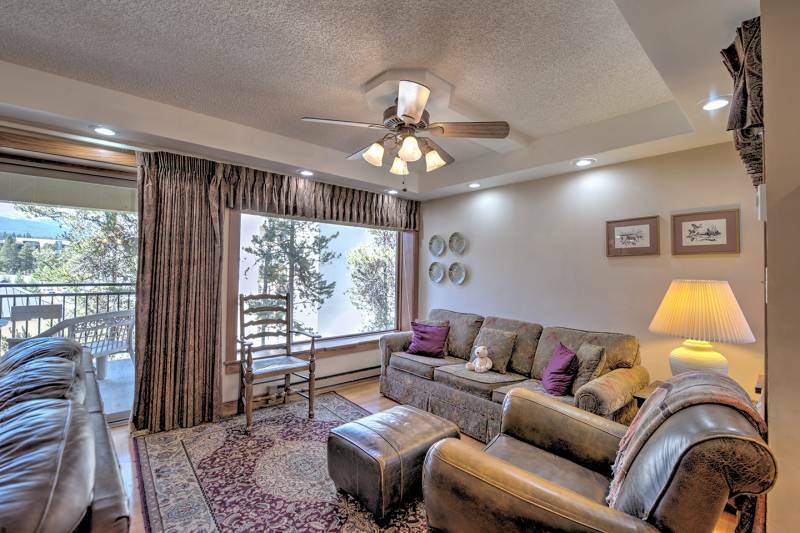 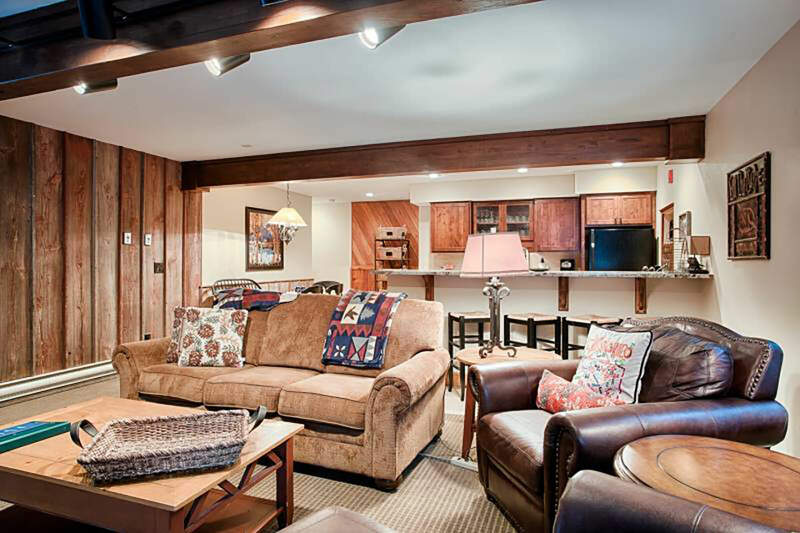 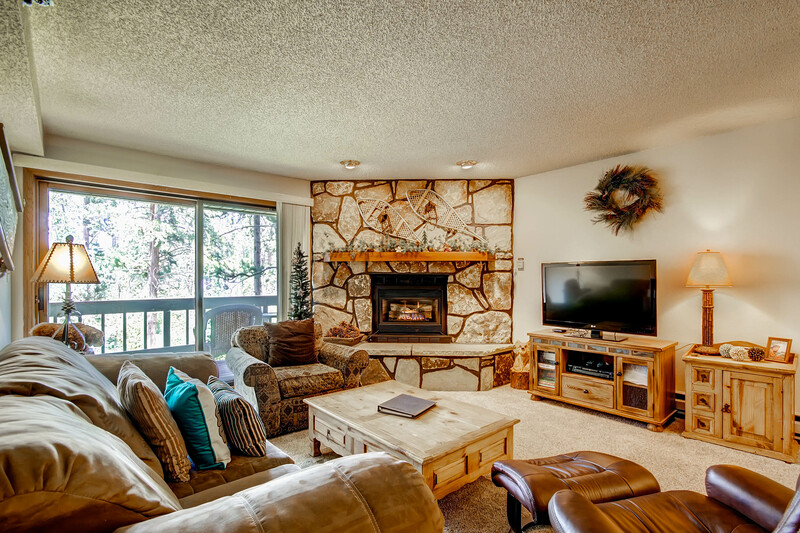 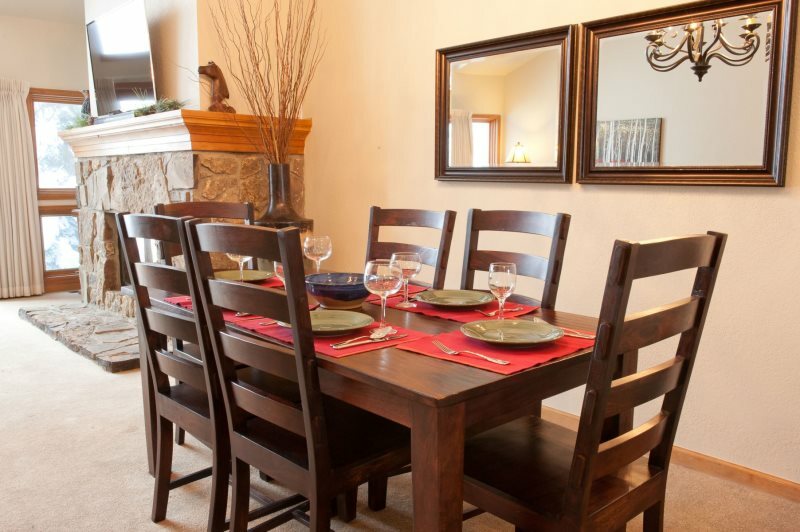 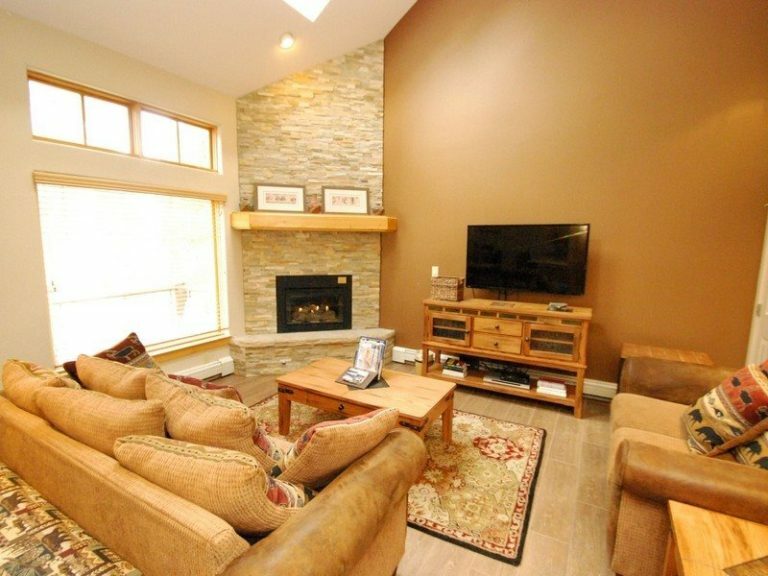 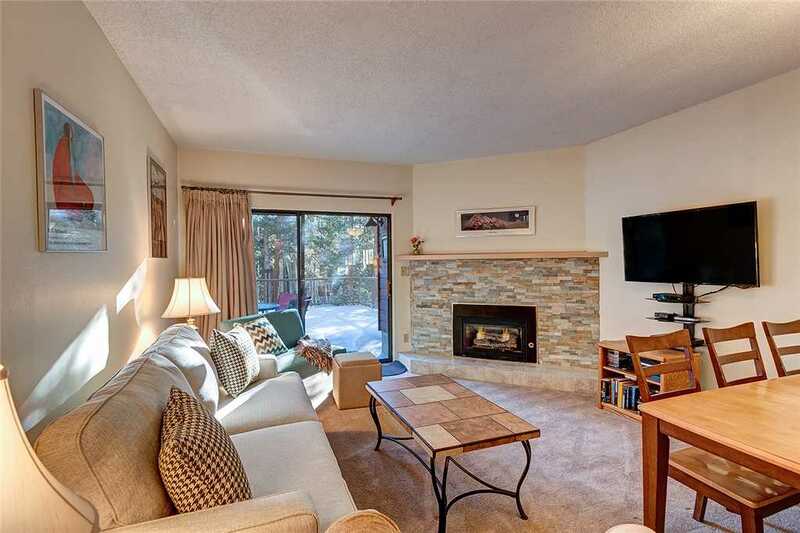 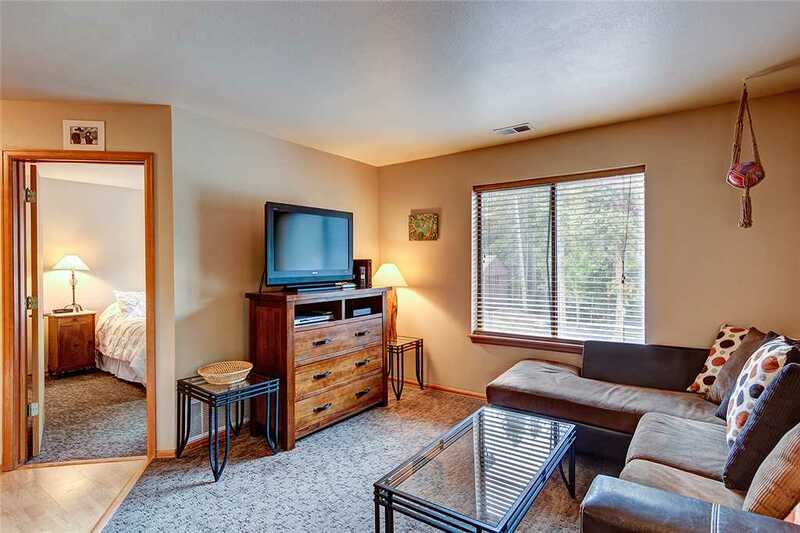 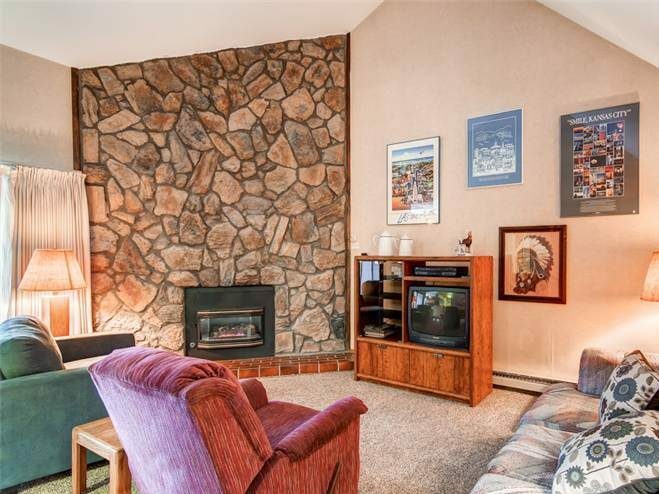 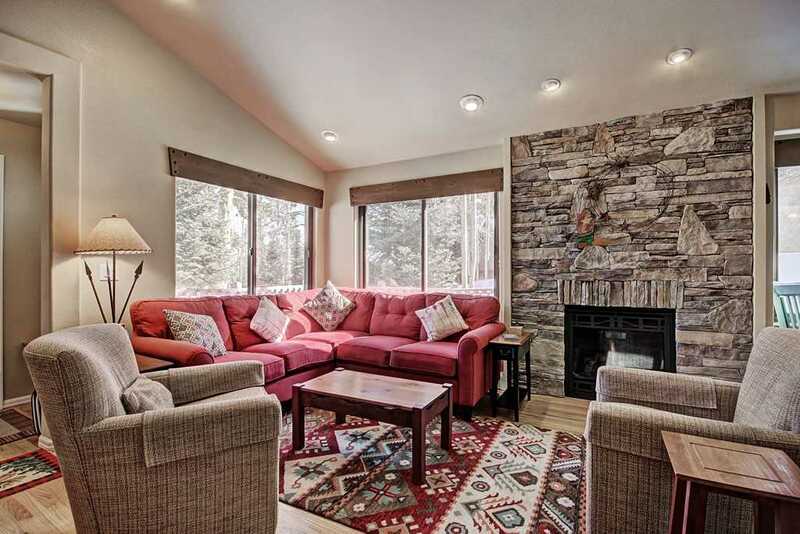 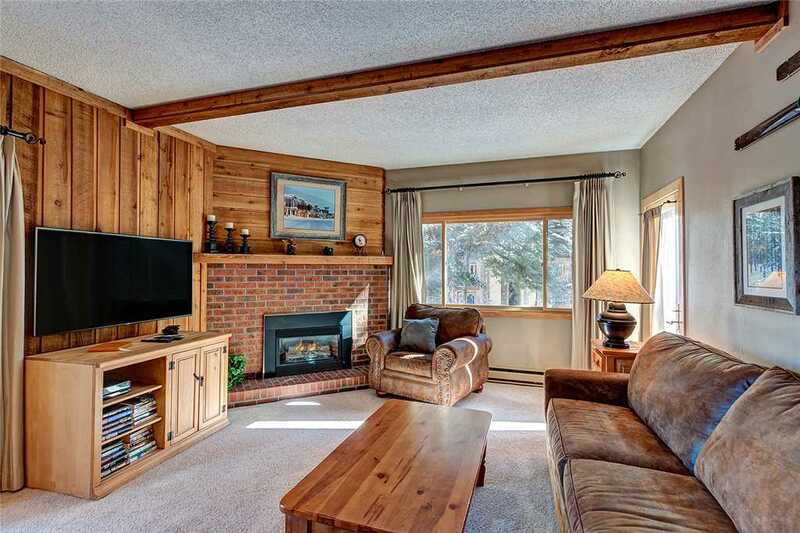 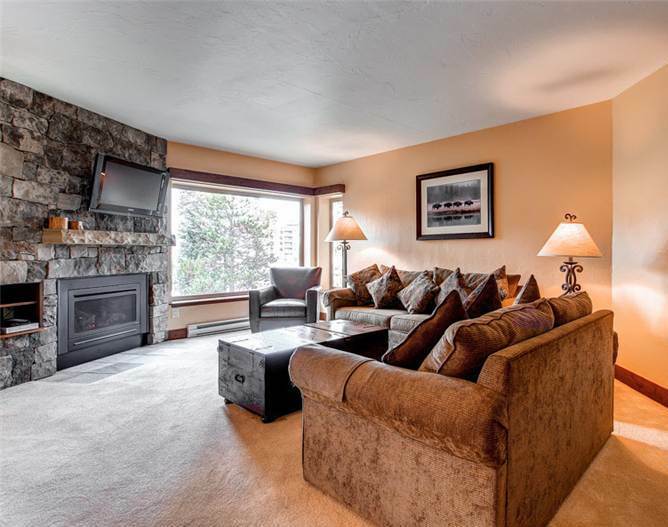 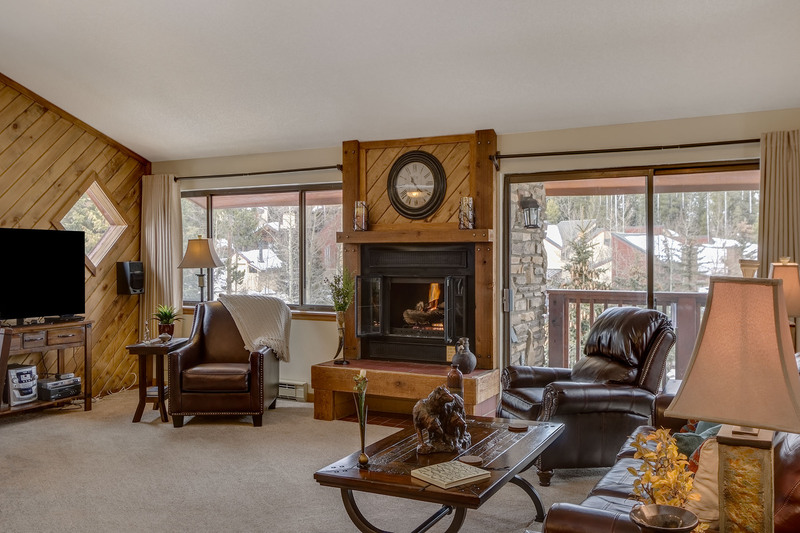 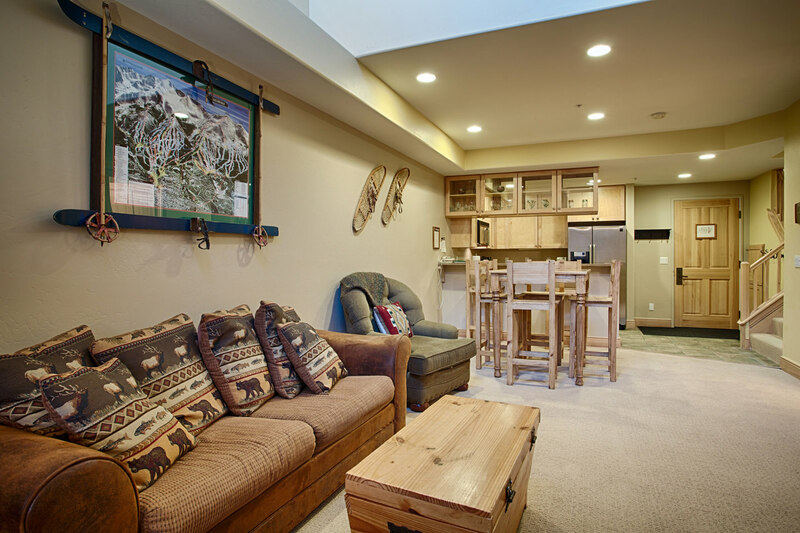 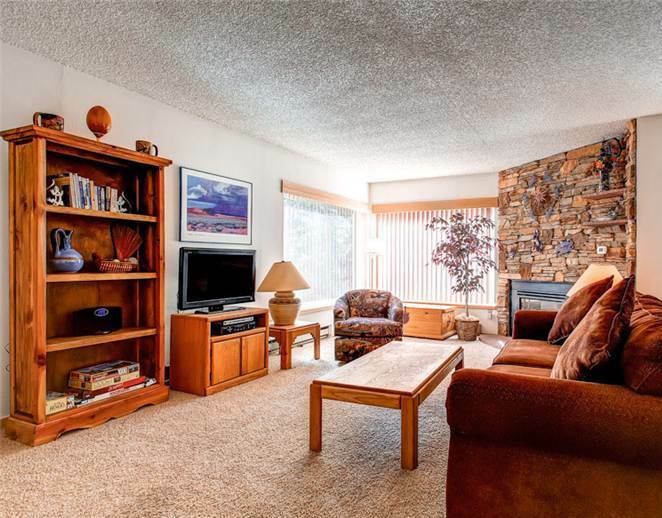 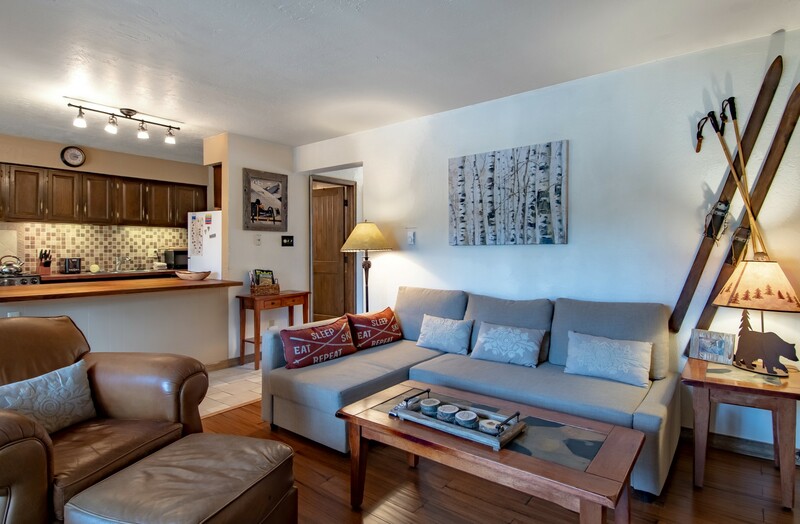 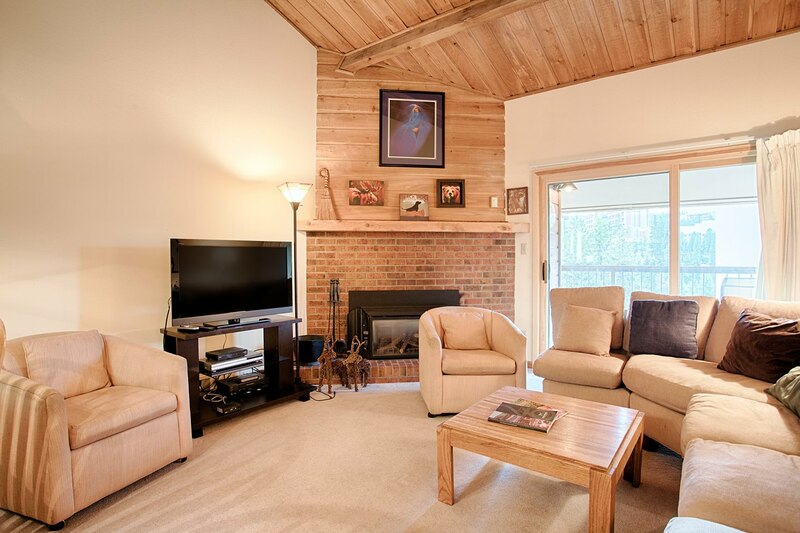 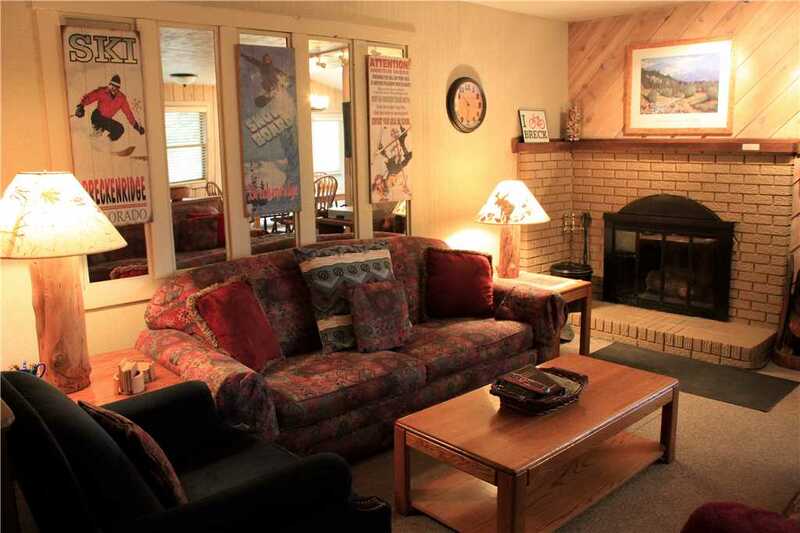 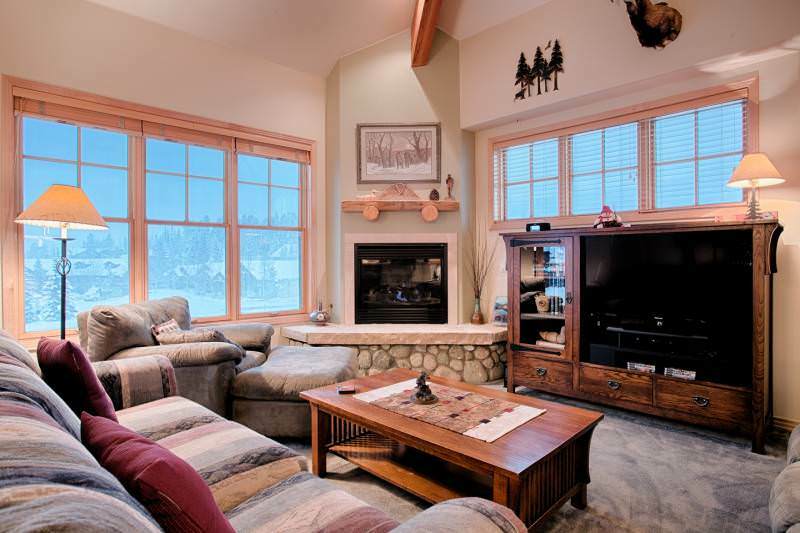 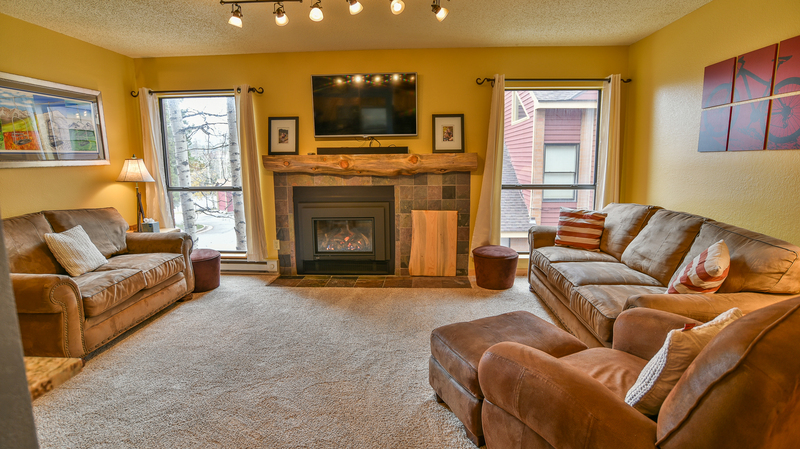 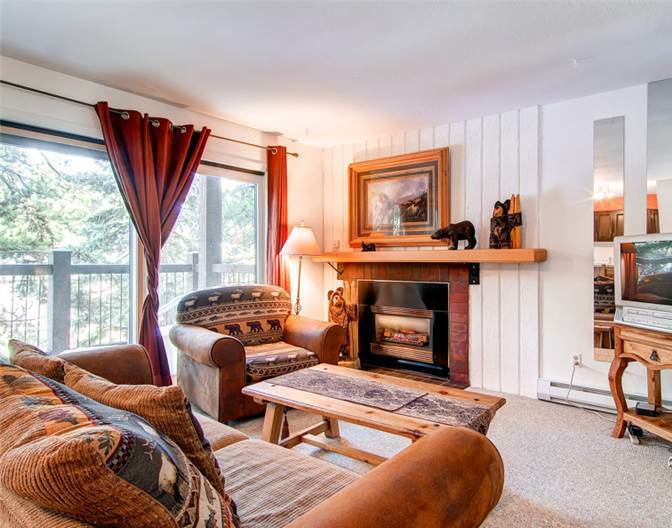 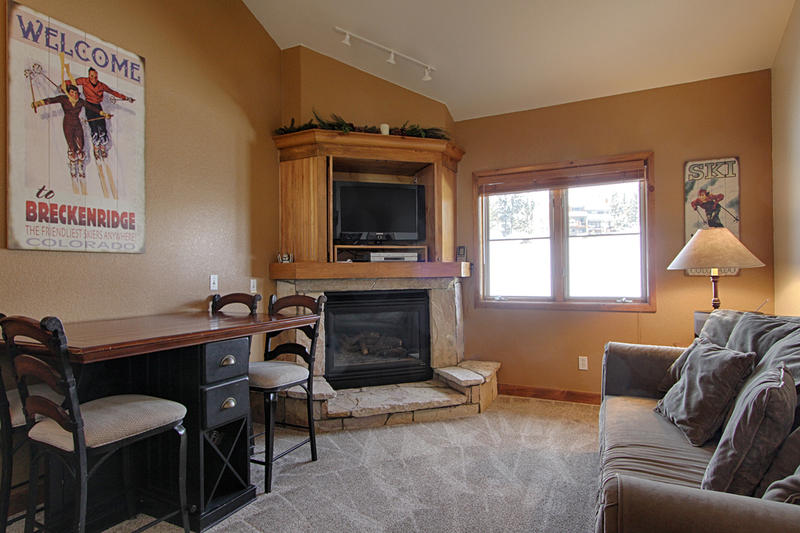 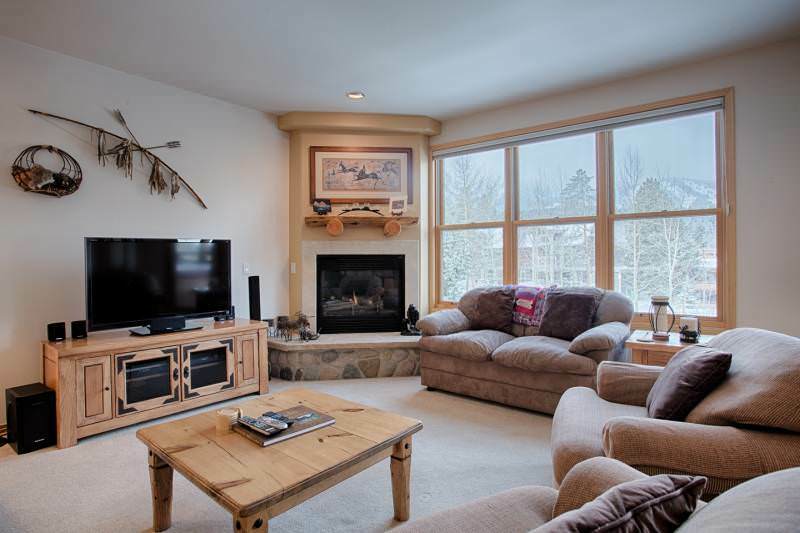 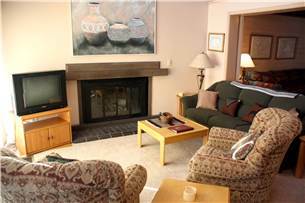 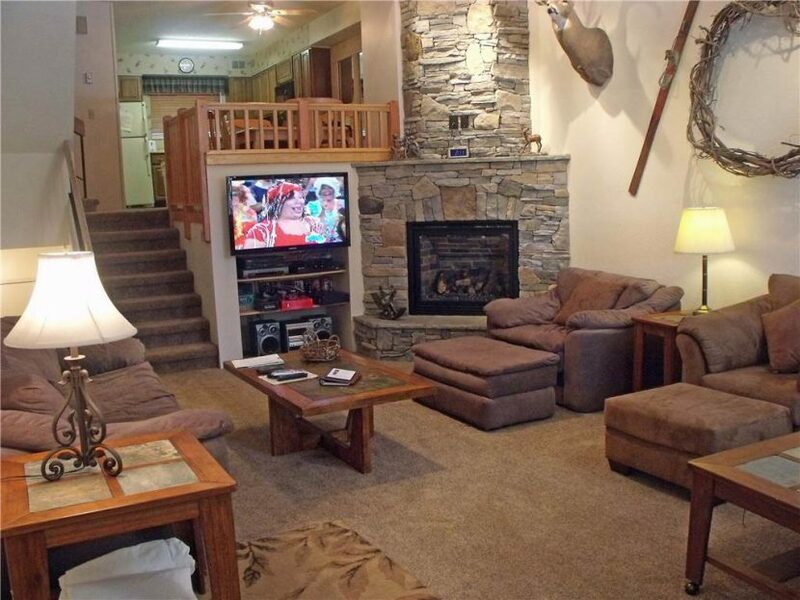 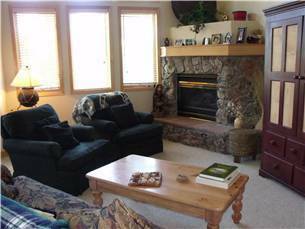 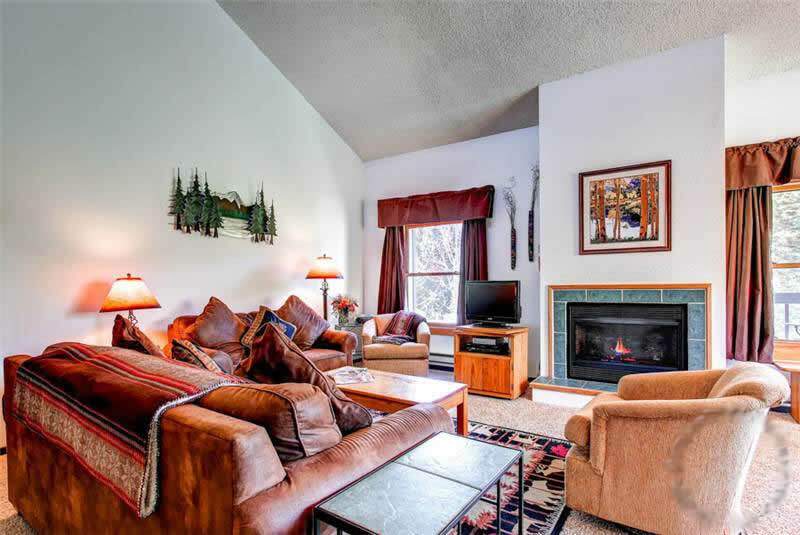 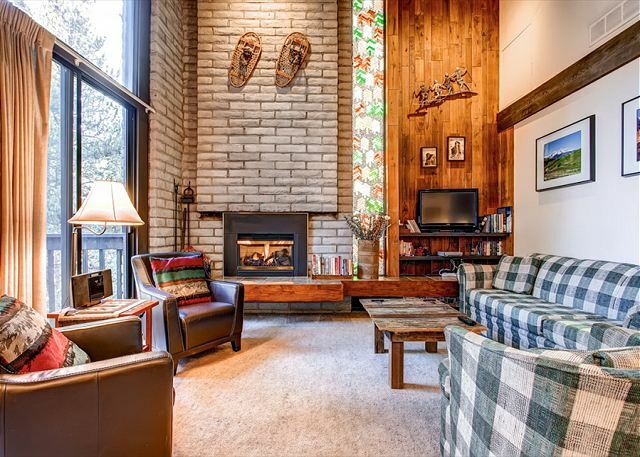 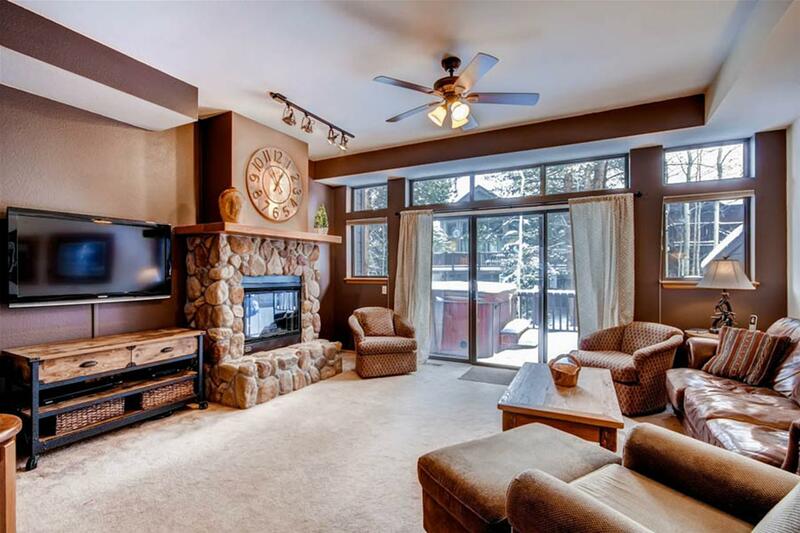 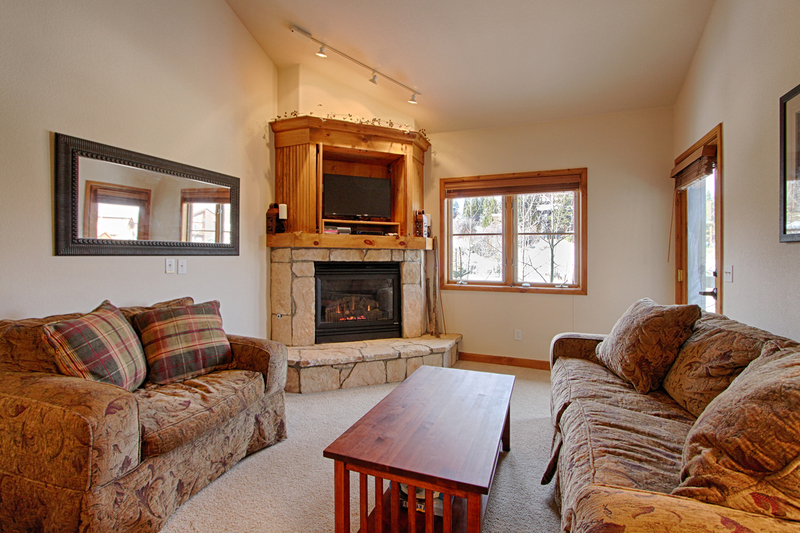 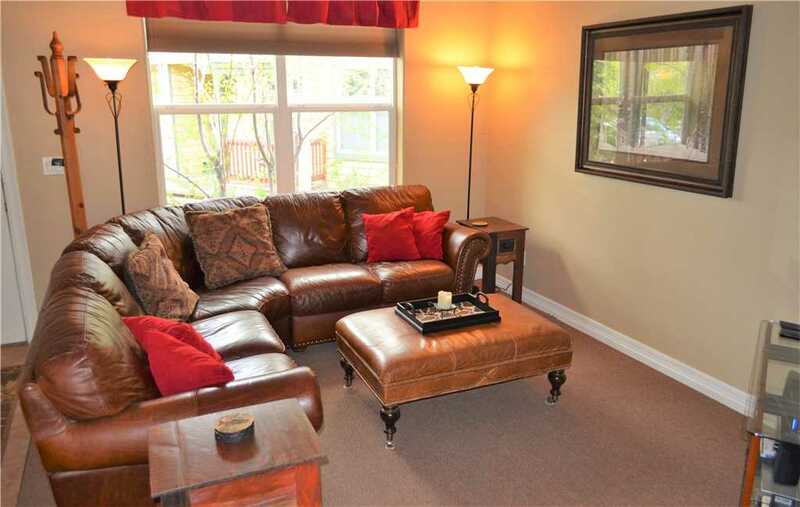 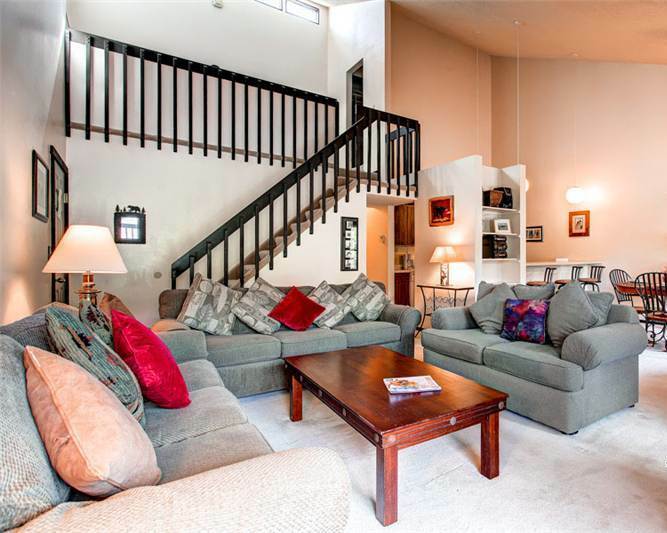 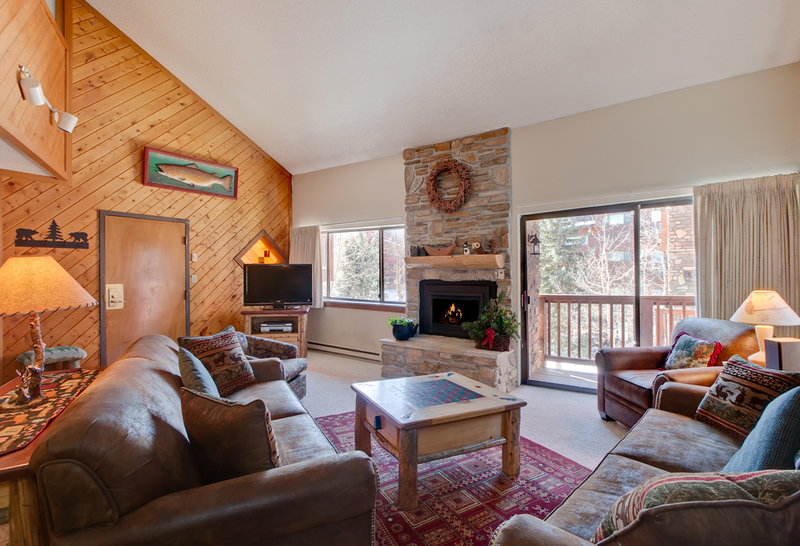 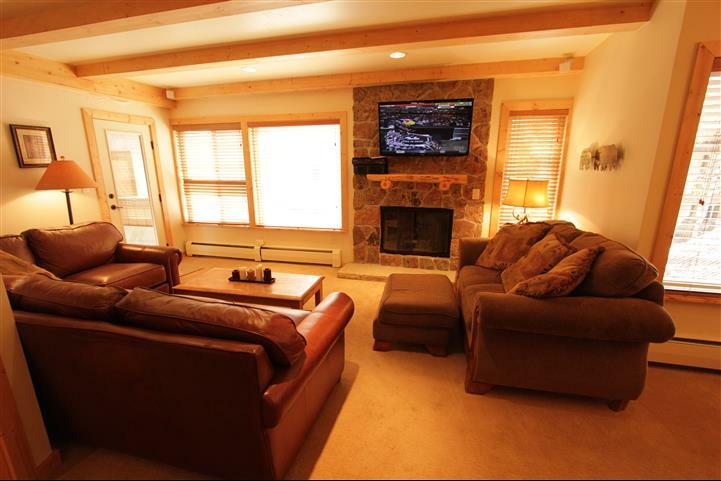 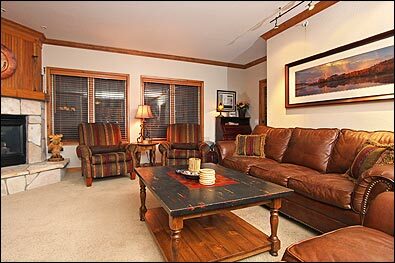 The living area features plenty of comfortable seating, a gas fireplace and an LCD TV. 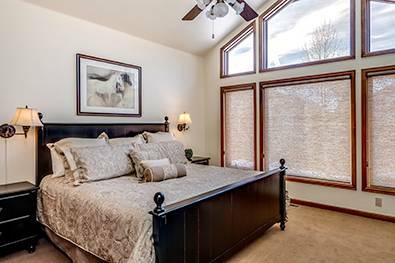 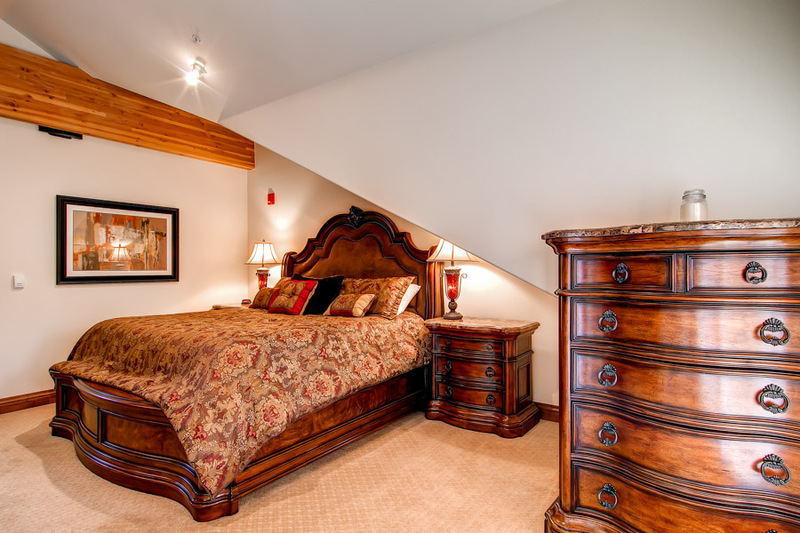 Upstairs, there’s a large master suite with a Jacuzzi tub, as well as two more bedrooms in a separate wing with a shared bathroom. 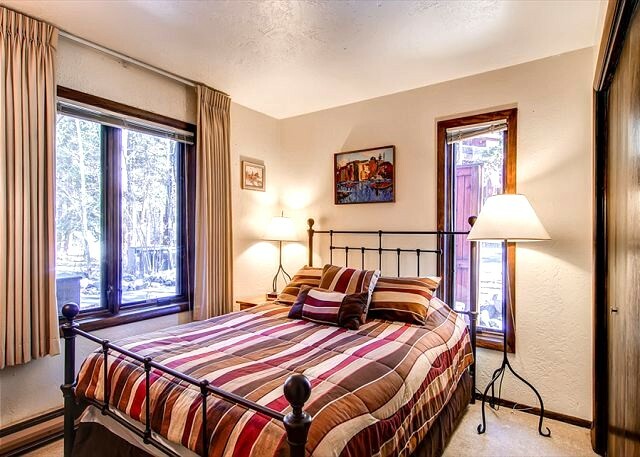 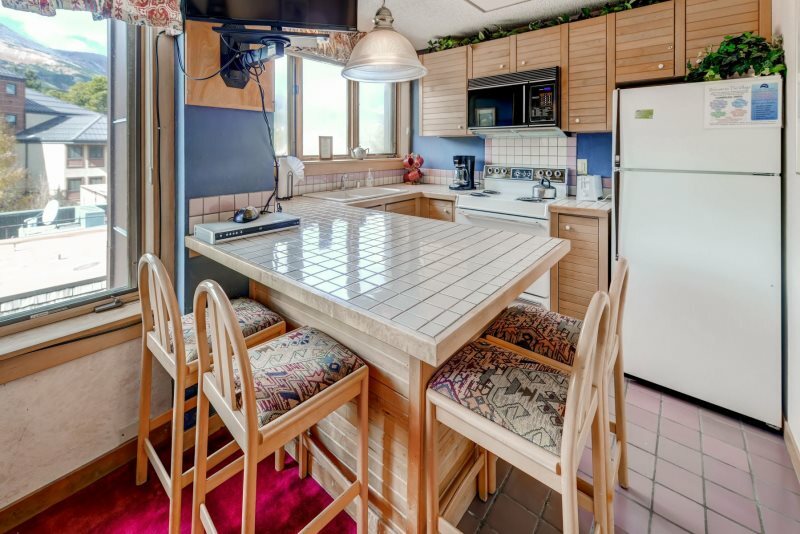 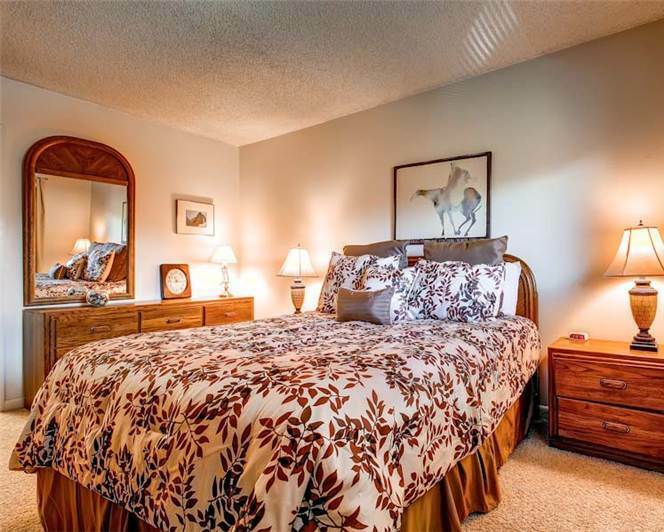 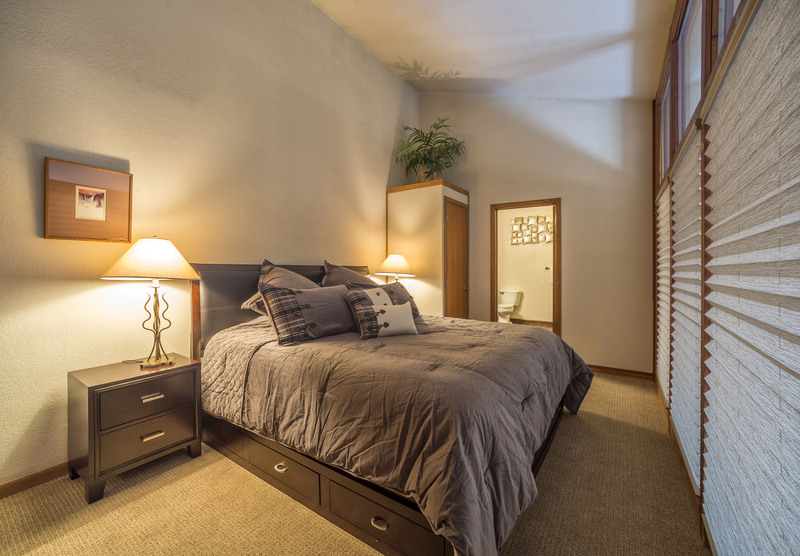 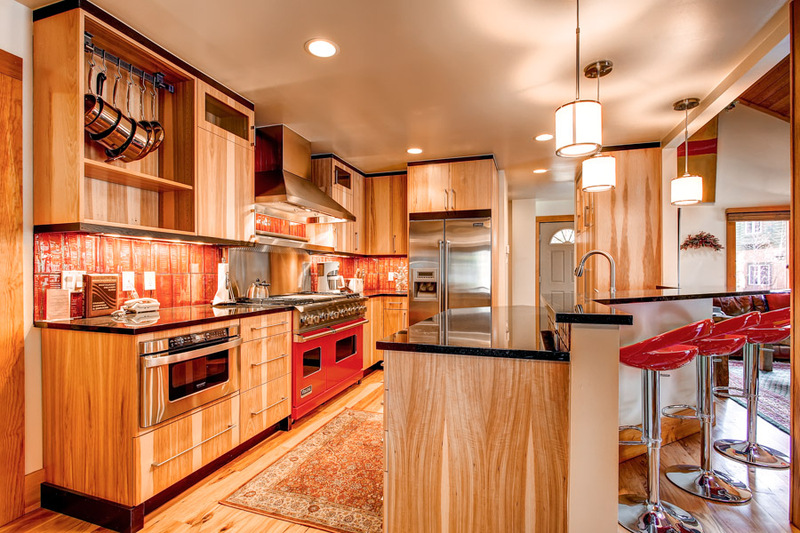 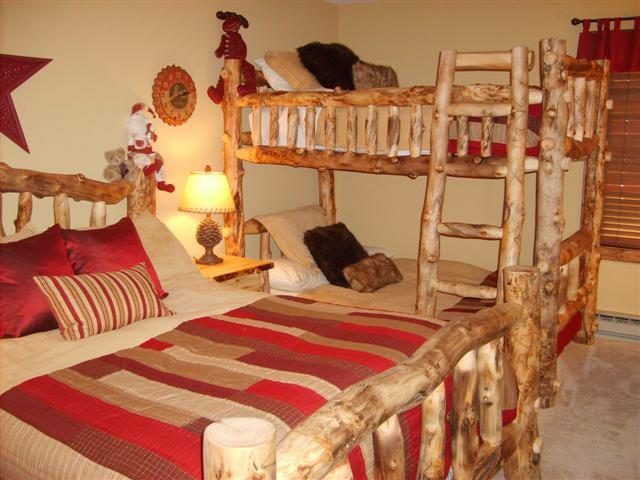 A comfy queen futon bed downstairs allows this home to sleep a total of ten people. 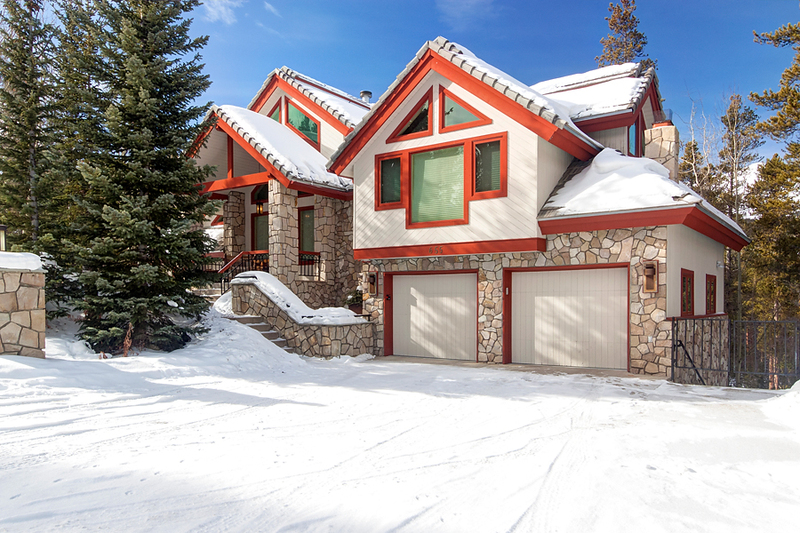 4×4 WHEEL REQUIRED IN THE WINTER.